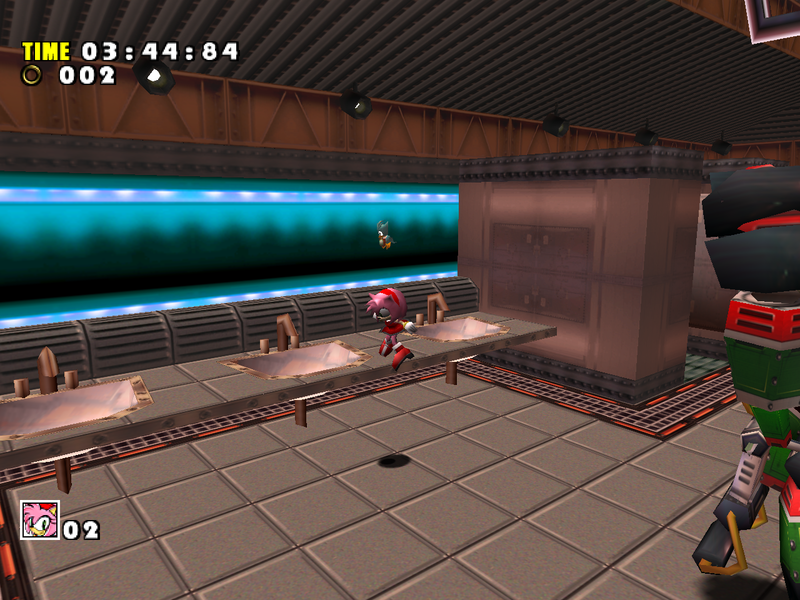 Hot Shelter received fewer downgrades in SADX than other levels, with some lighting issues and only several effects removed. 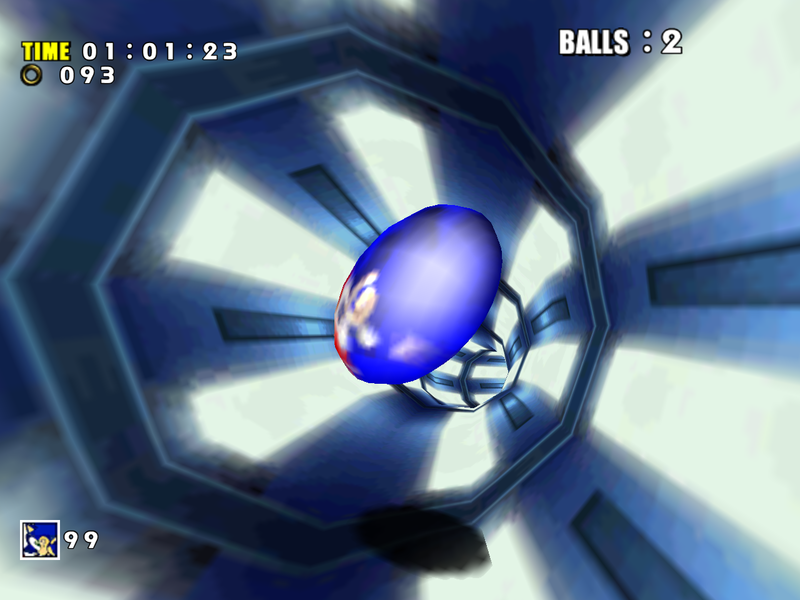 Compared to Final Egg, this level is not broken at least. 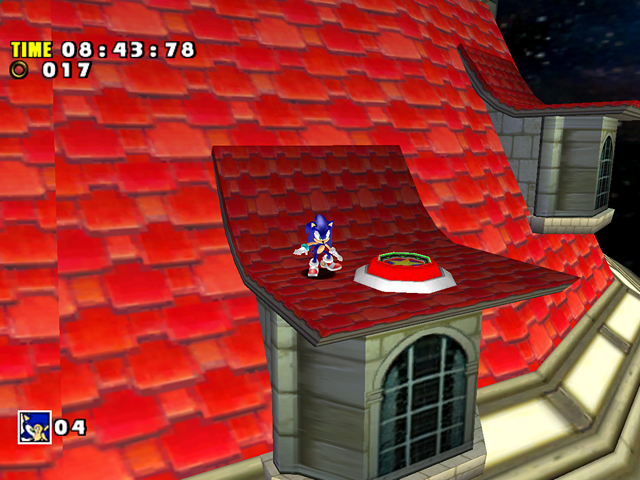 Let’s have a look at some problems with the SADX redesign of Hot Shelter. 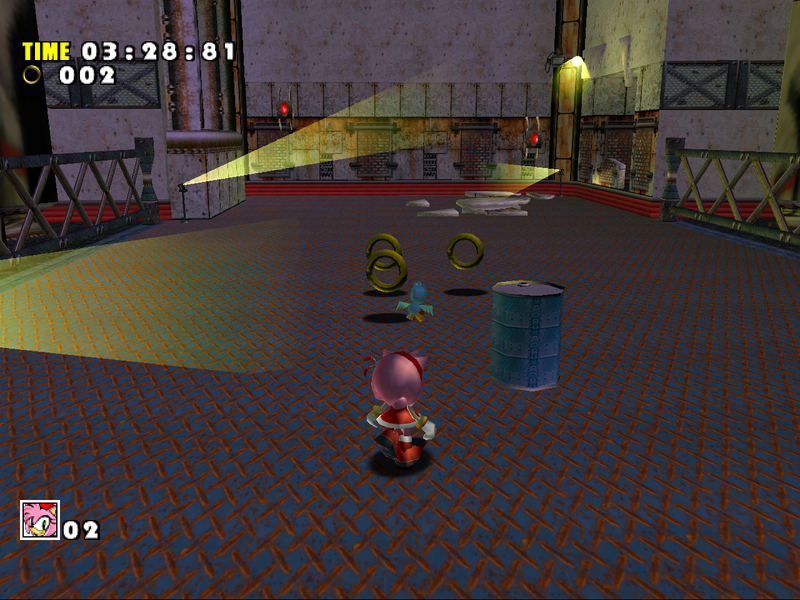 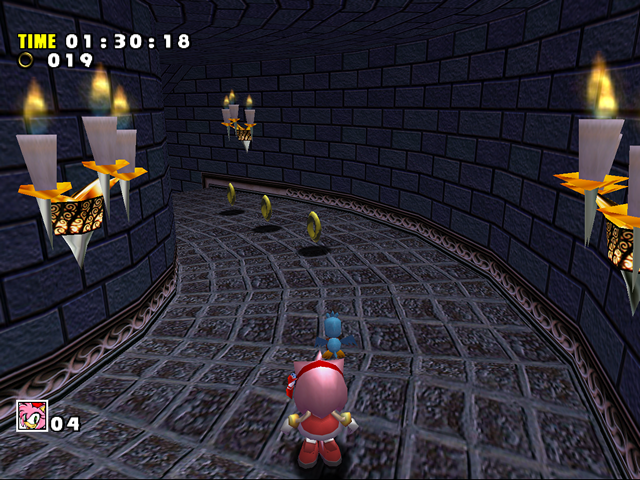 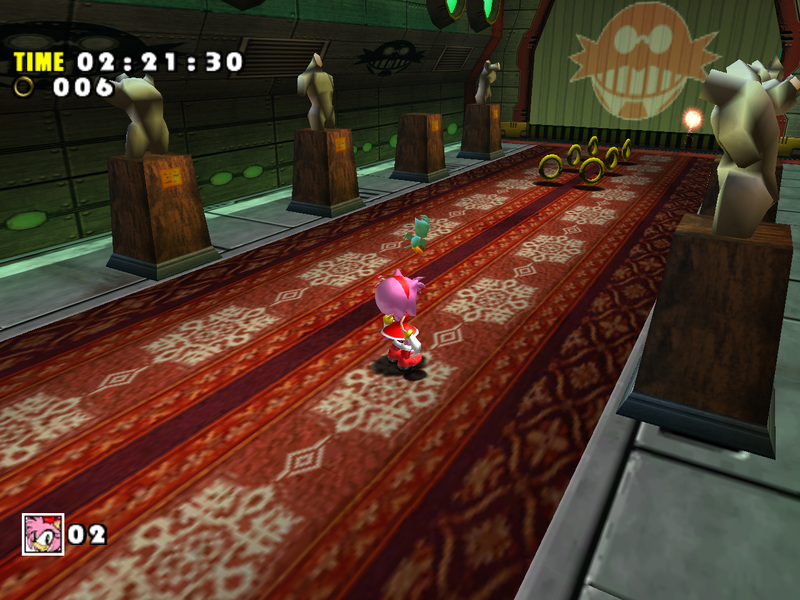 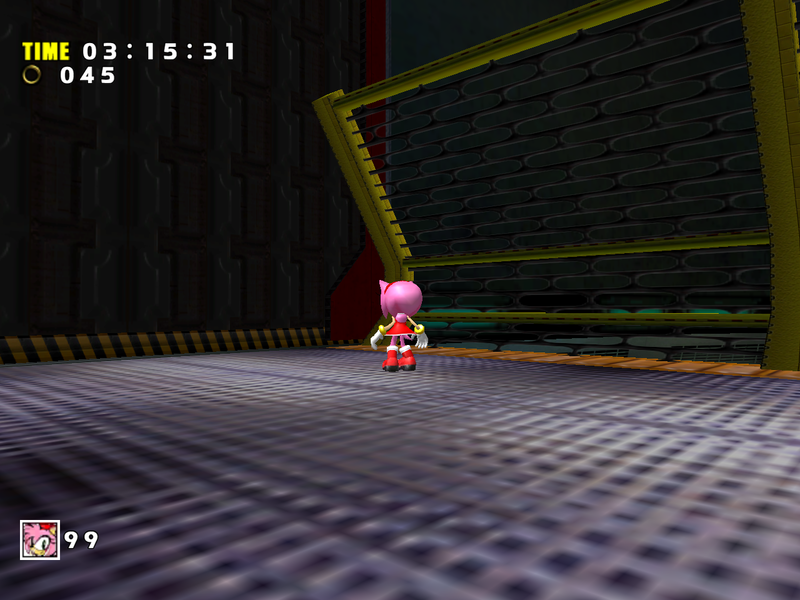 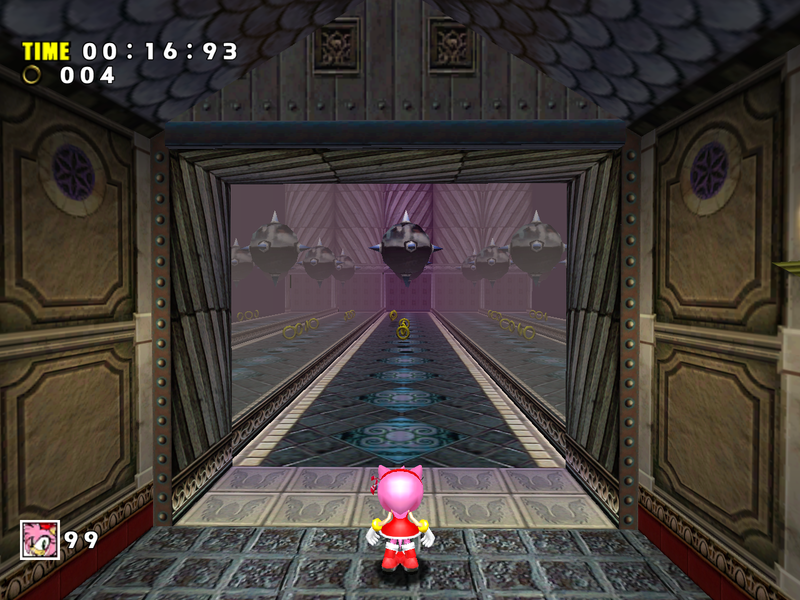 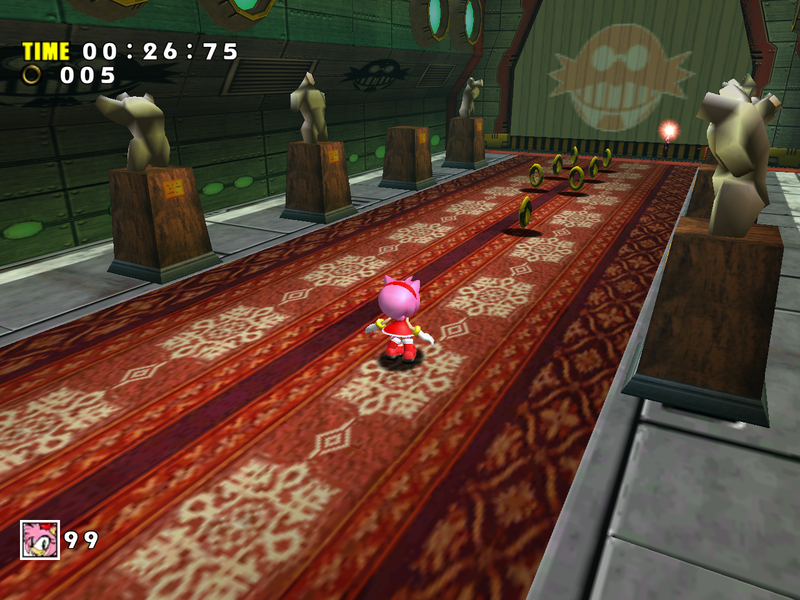 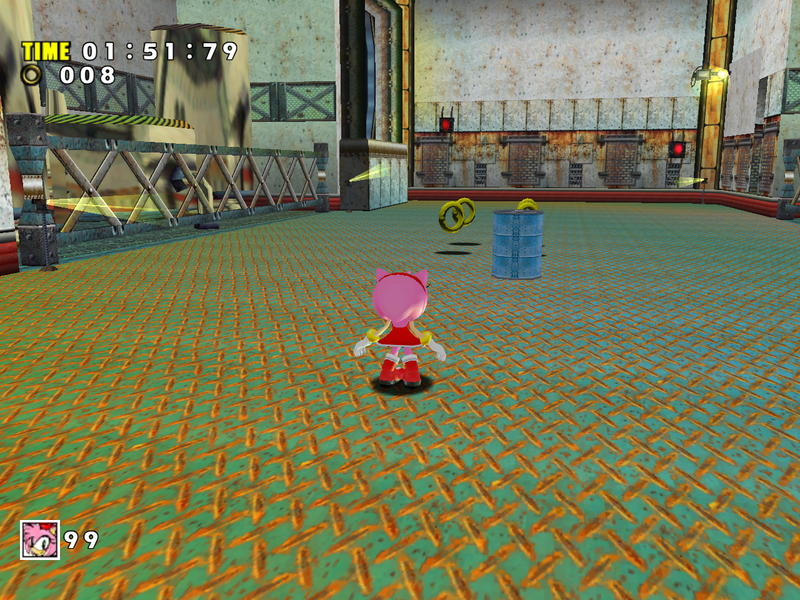 The first area in Amy’s stage has a different lighting setup and some texture changes. 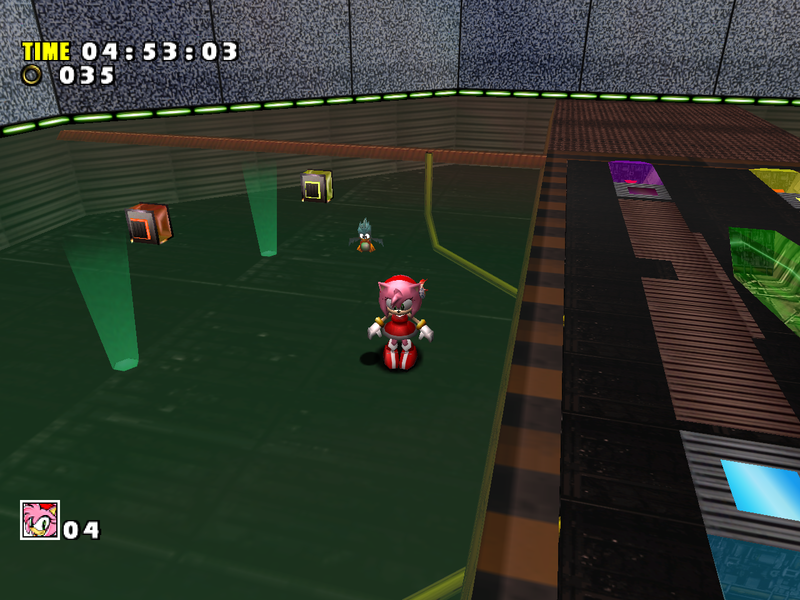 If you’ve read previous comparisons, you know SADX doesn’t seem to like glass surfaces with environment mapping, and this level is no exception. 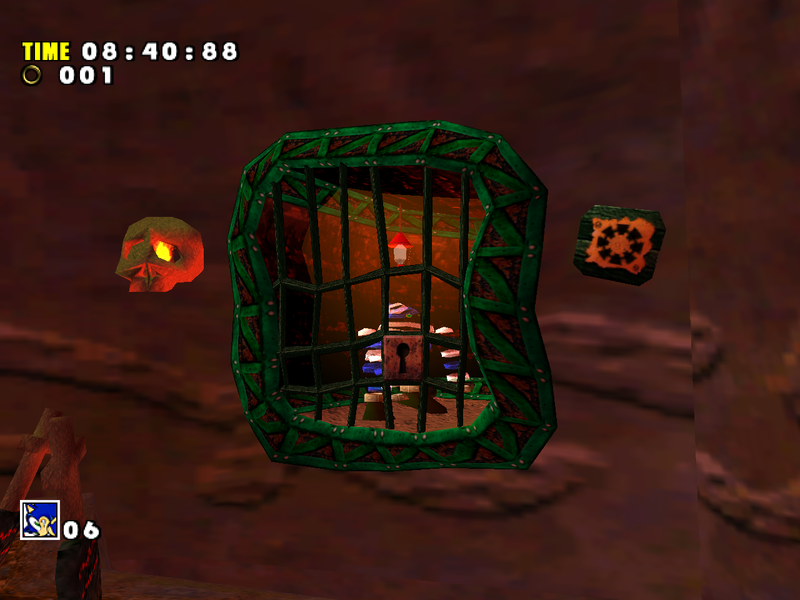 In this particular area the glass wasn’t removed or made a solid texture, but the UVs were edited to make it look more pixelated. From a quick look the lighting change doesn’t seem bad. 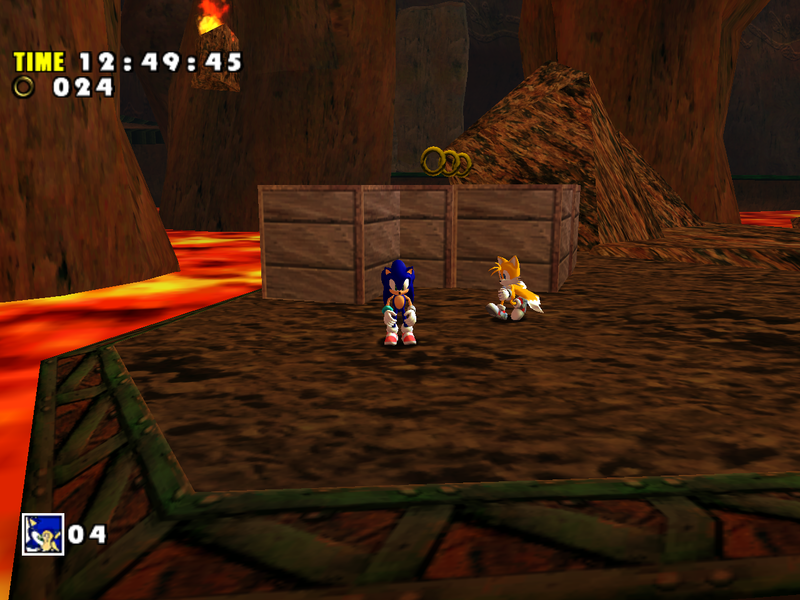 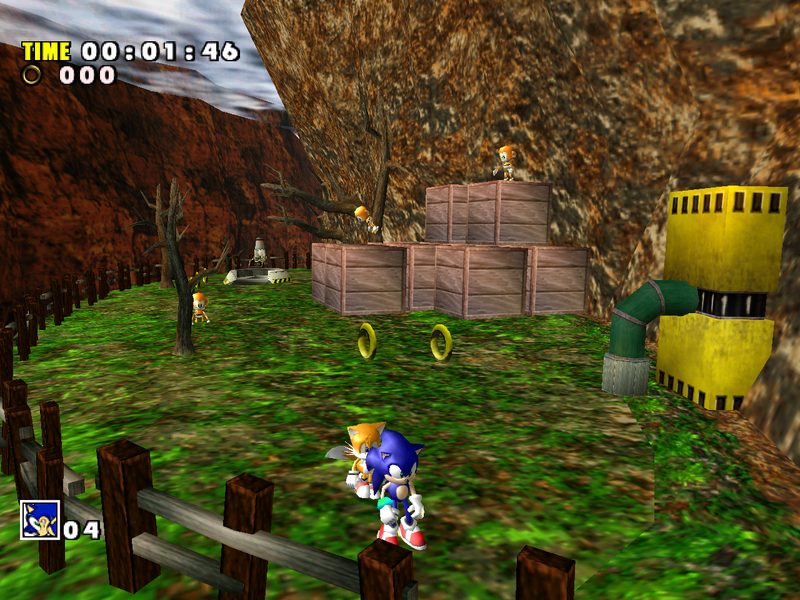 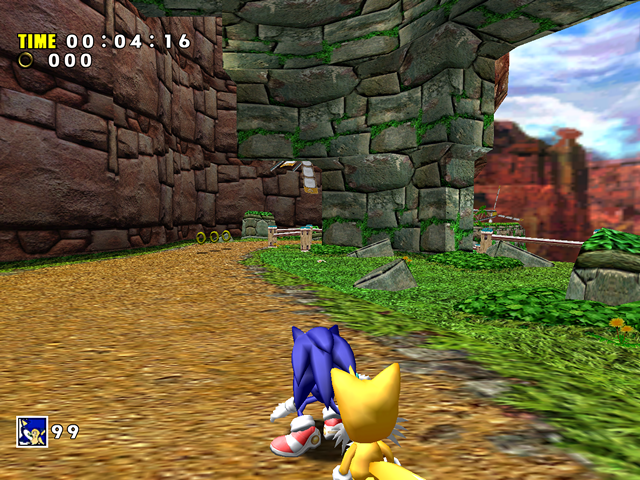 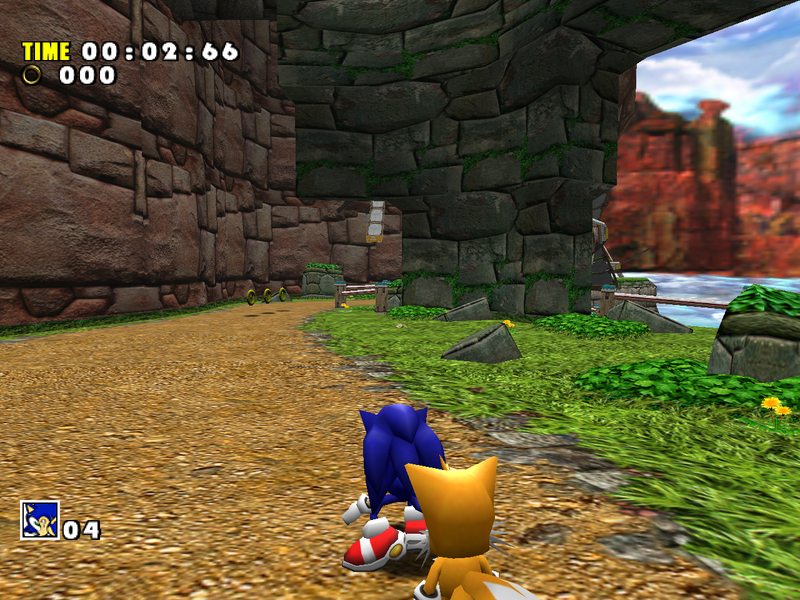 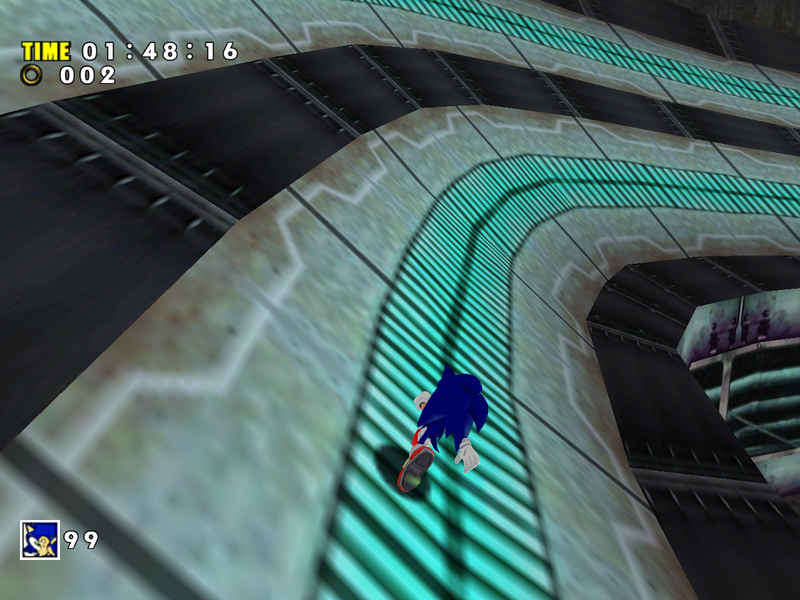 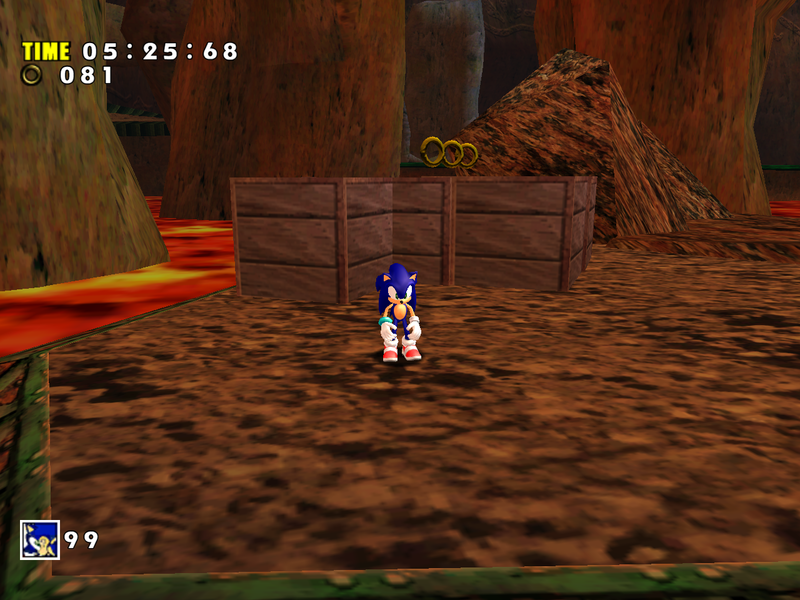 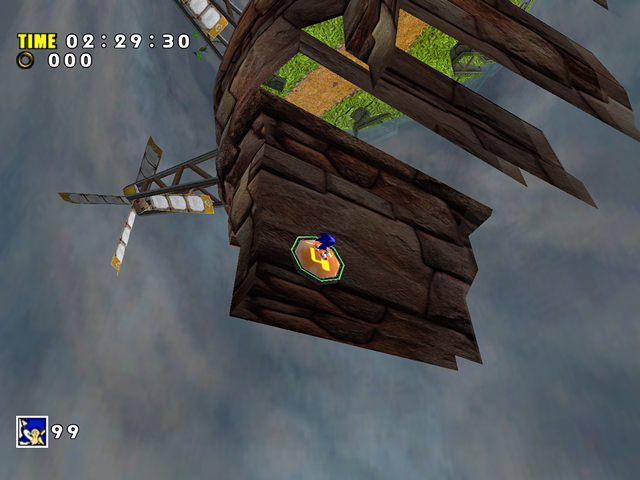 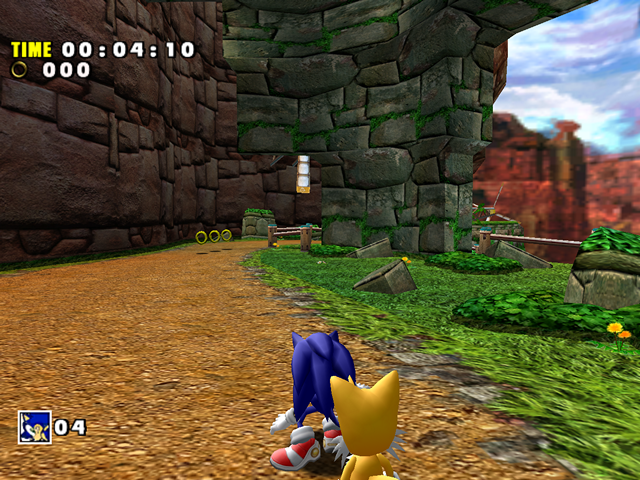 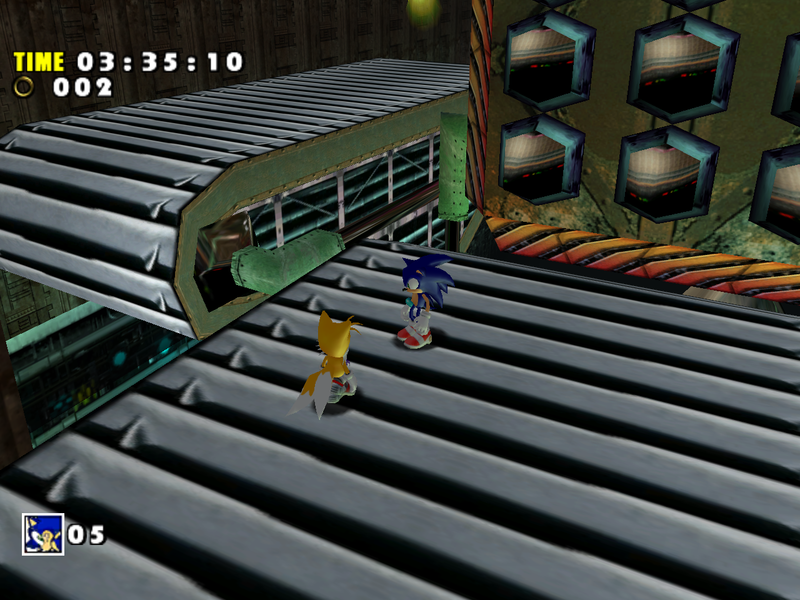 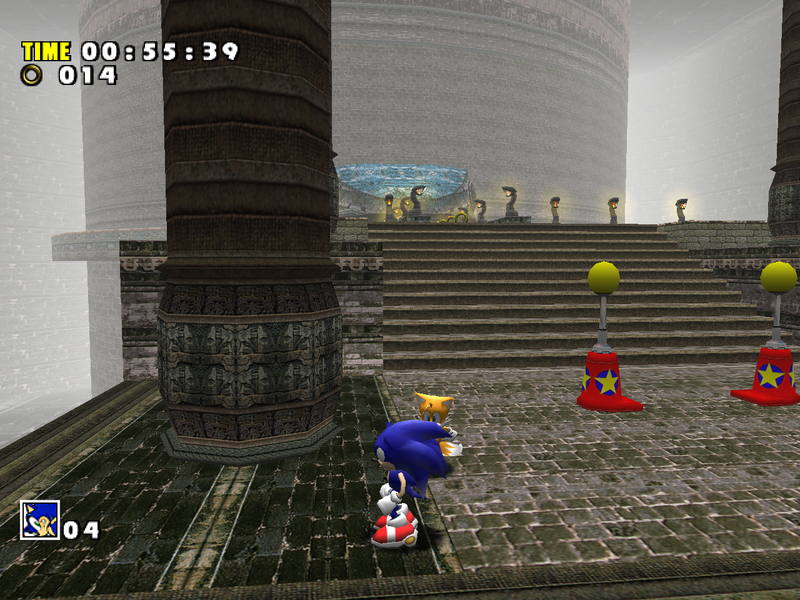 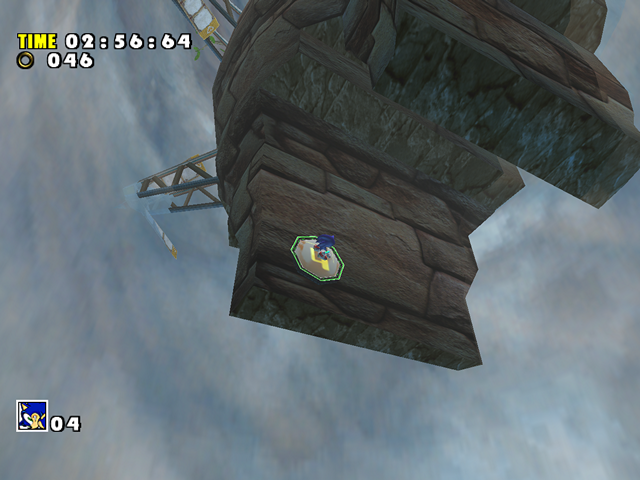 SADX gets rid of the green tinge of the Dreamcast level, although it readds it in some areas as vertex colors. 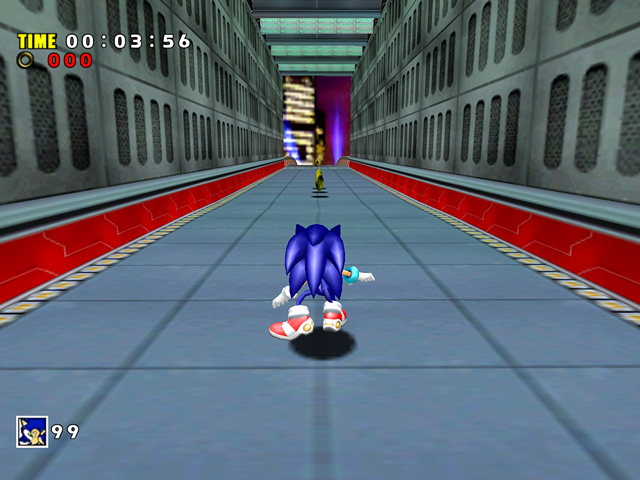 SADX already has dark green lighting in Speed Highway, Casinopolis and Final Egg, so it’s nice to have something a little different. 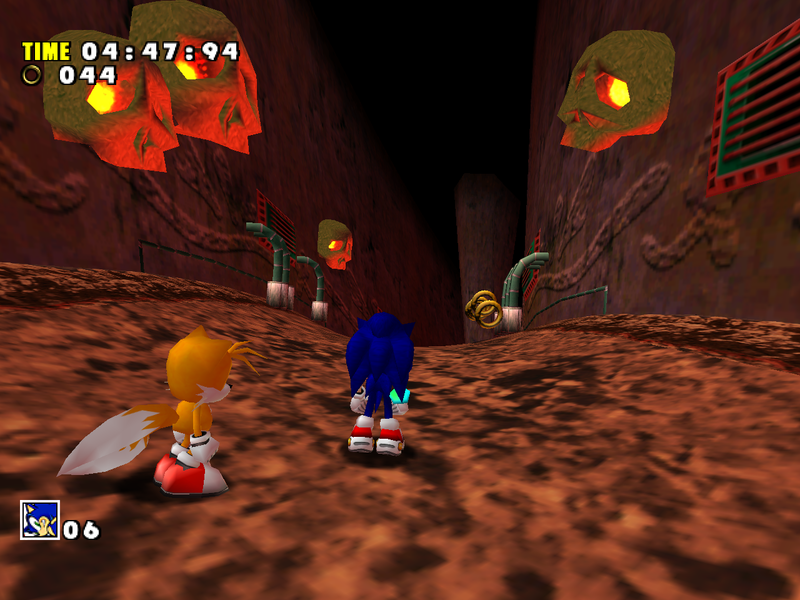 It’s hard to say whether this area is an improvement over the Dreamcast version – it’s just different. The lights aren’t as bright in SADX, and the water doesn’t render behind the glass walls, which leads to an awkward black space (the water is still there but it doesn’t show up due to transparency issues). 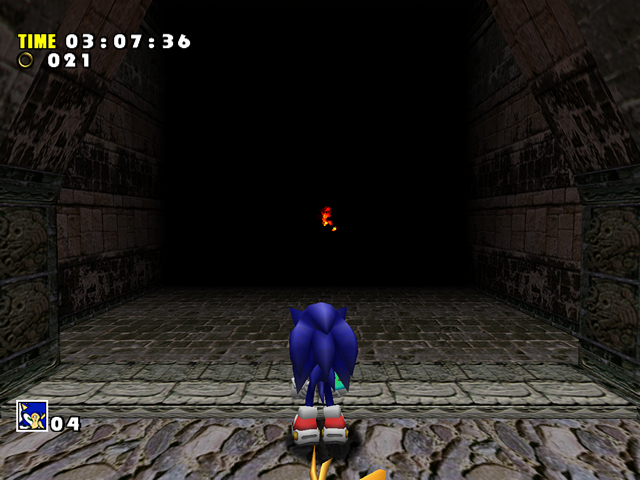 The green light you see in some rooms in Acts 2 and 3 has the actual light part missing in SADX. 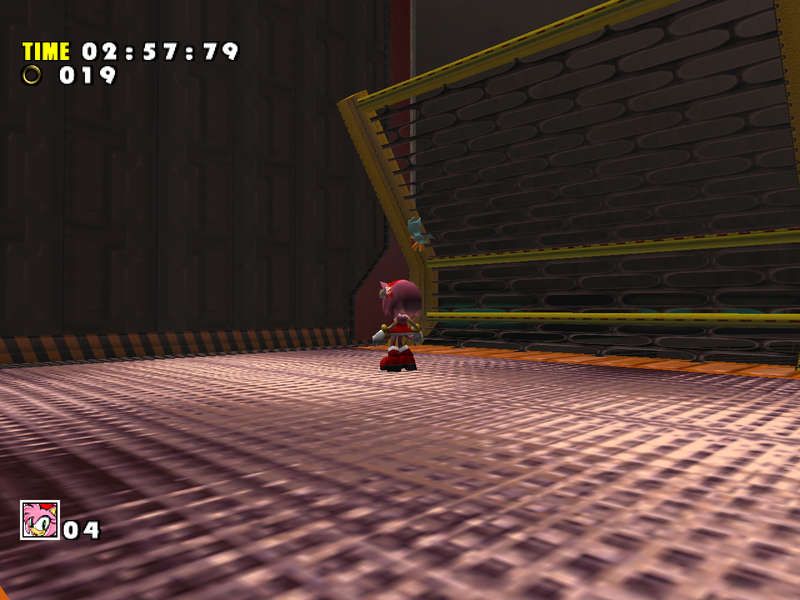 The PC version also broke some UVs in the area because of texture mirroring. 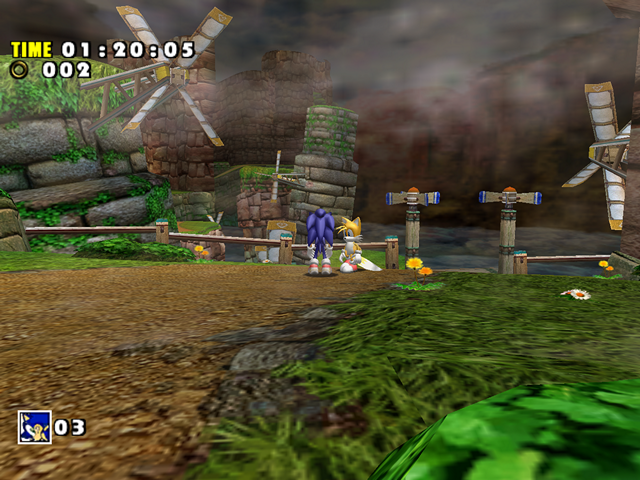 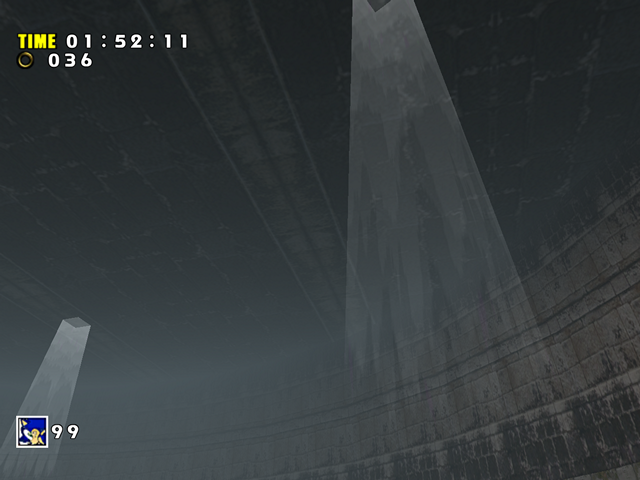 Fog in this area was reduced, and the background’s UVs were adjusted to make the distant mechanisms look smaller. 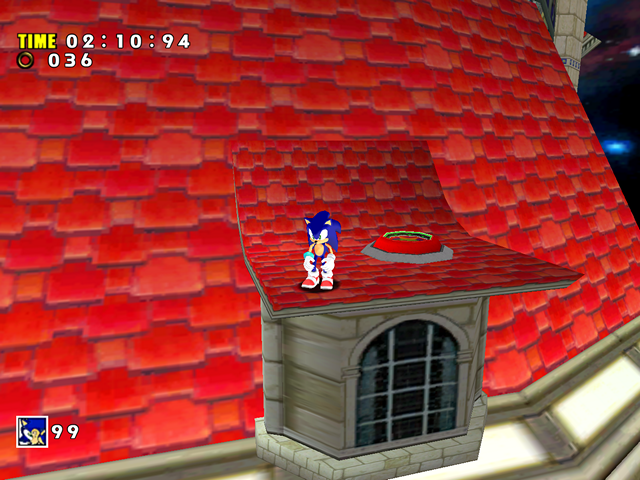 The replacement texture’s resolution is half the resolution of the Dreamcast texture, although both are included in the game data. 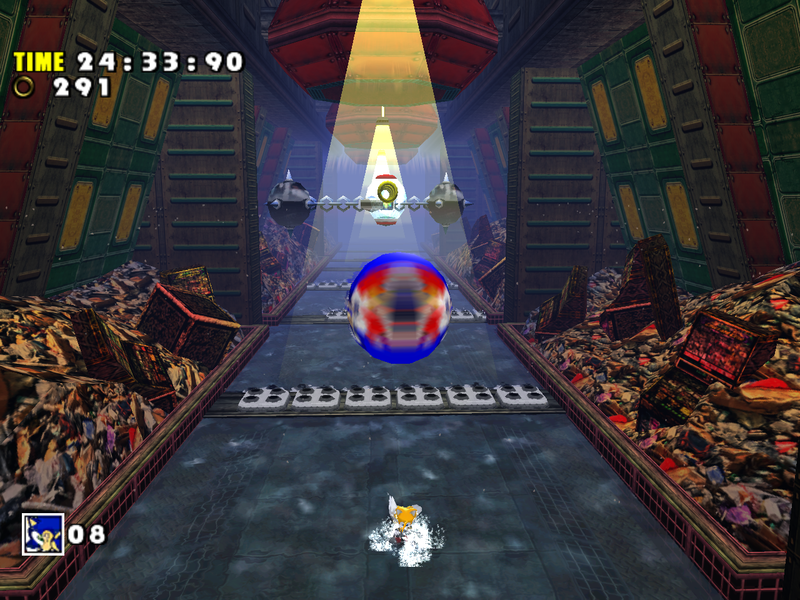 A similar downgrade happened with the background in Final Egg Act 2. 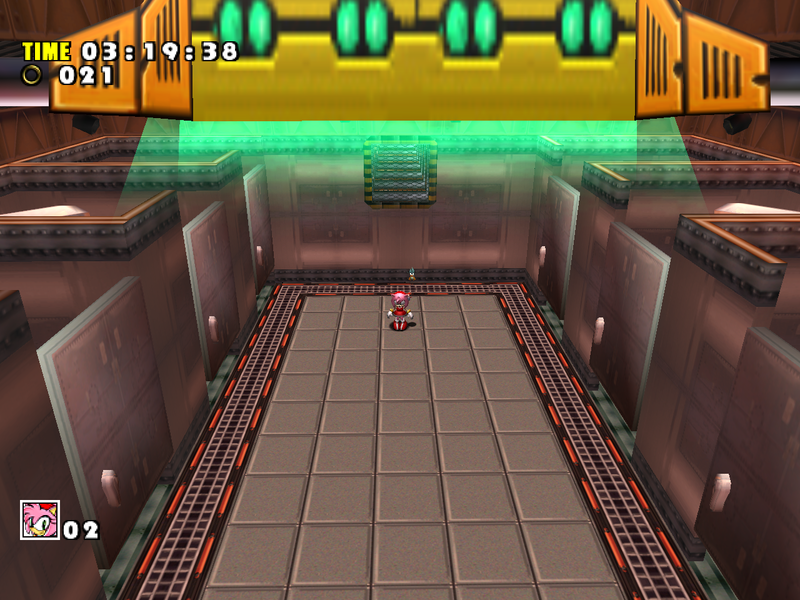 The lighting in this area is relatively good in SADX, although the bright yellow parts that are supposed to be lit up aren’t bright enough. If it was a simple texture recompression/mirroring problem, it would be easy to fix by replacing the texture. 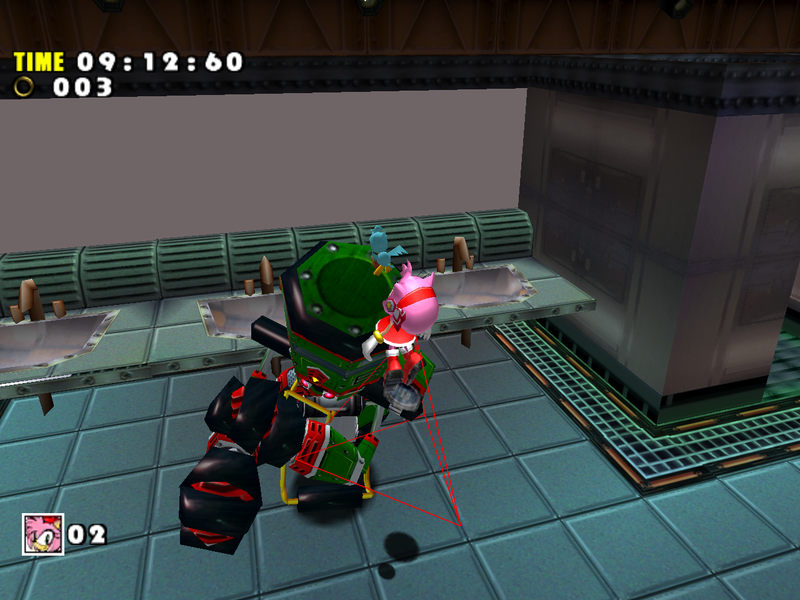 However, the UVs on the model were also adjusted to make the texture look more washed out. 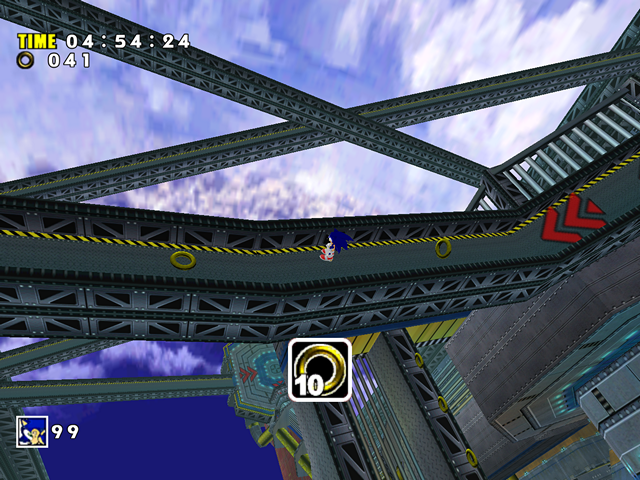 To restore the proper look of the bridge, I had to replace the entire model with its Dreamcast counterpart. 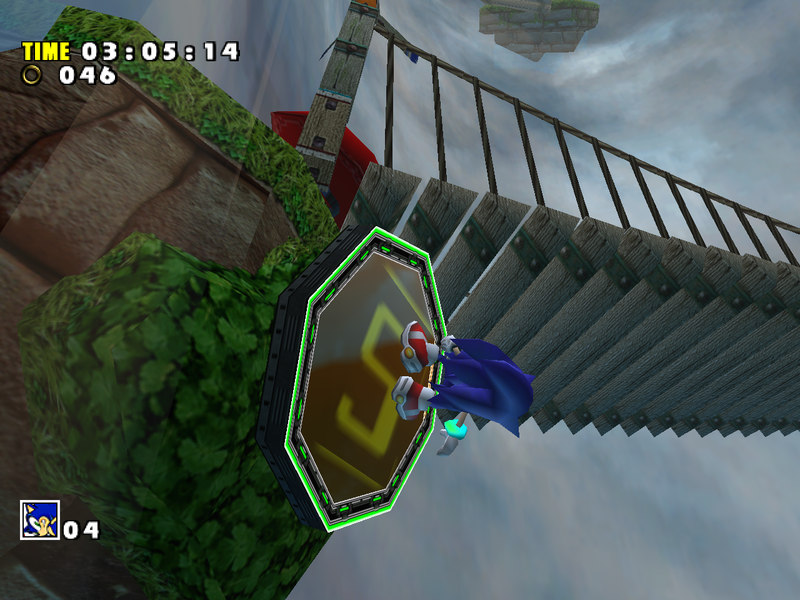 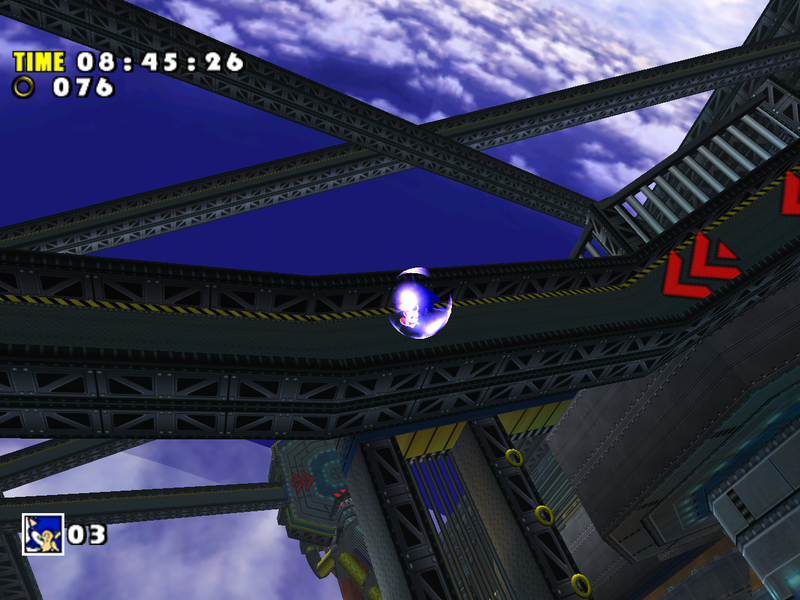 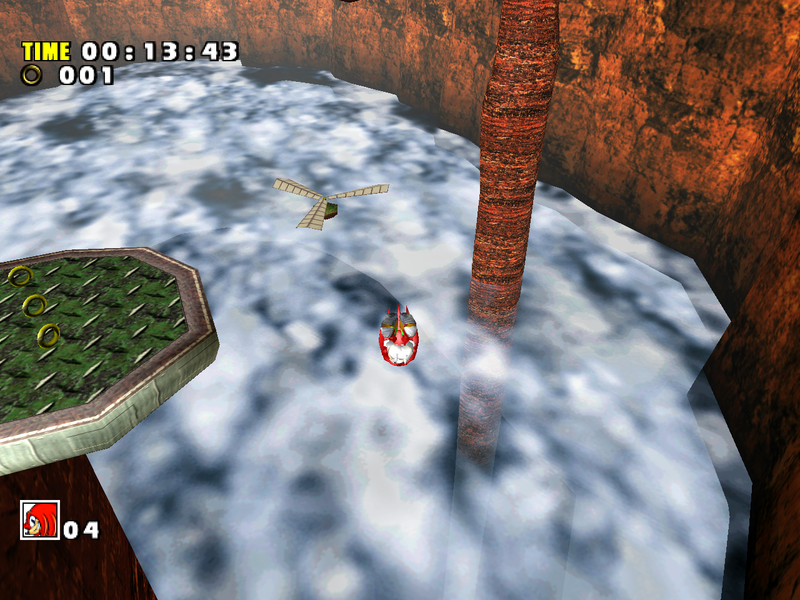 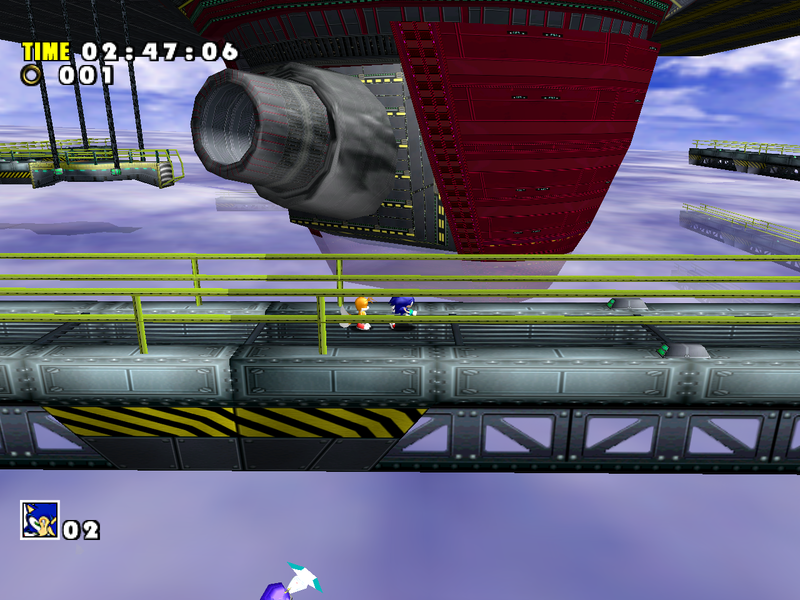 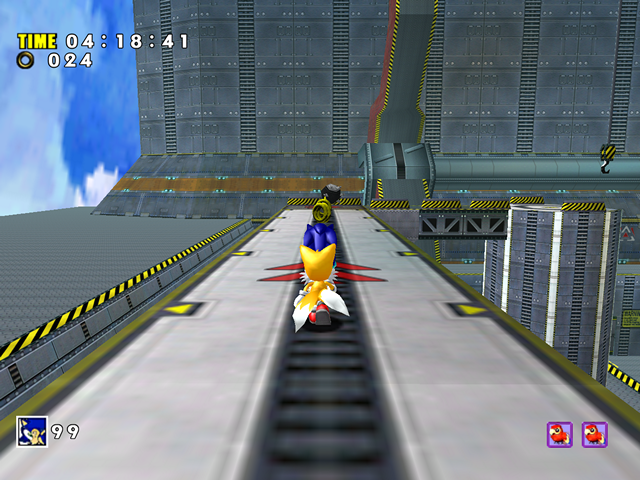 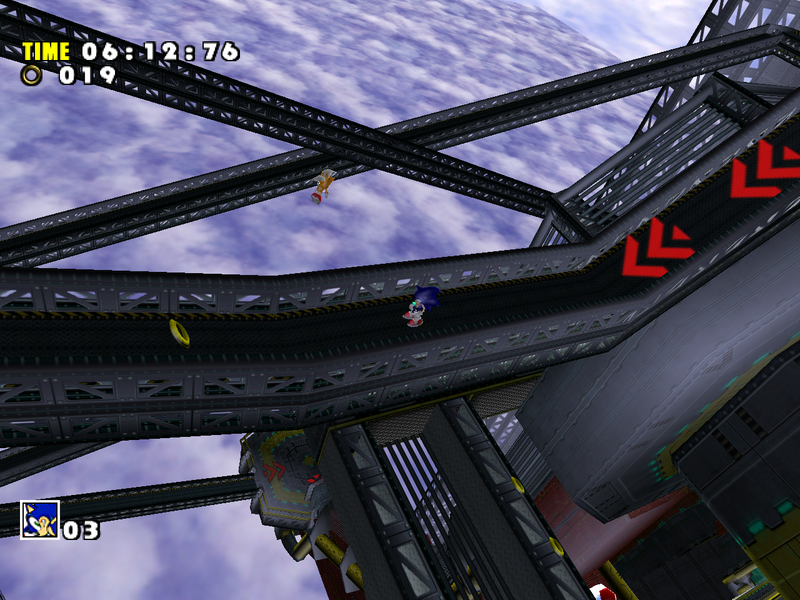 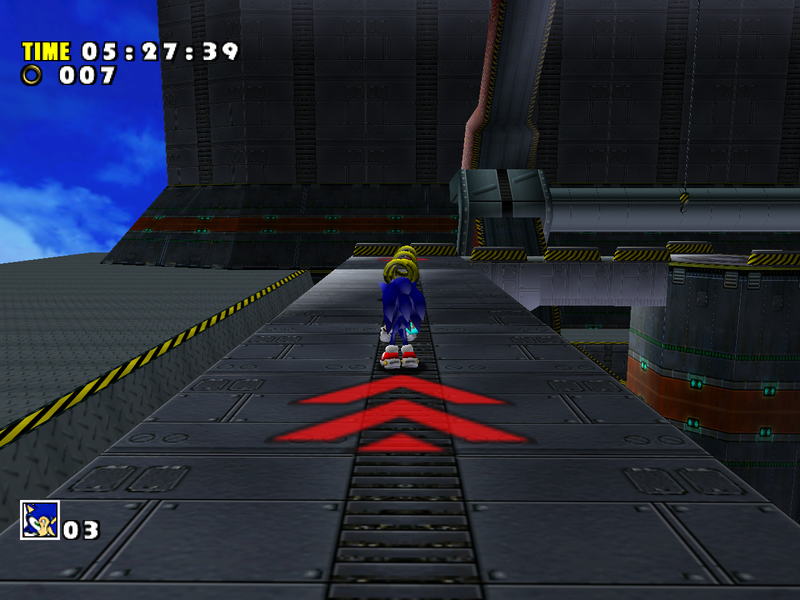 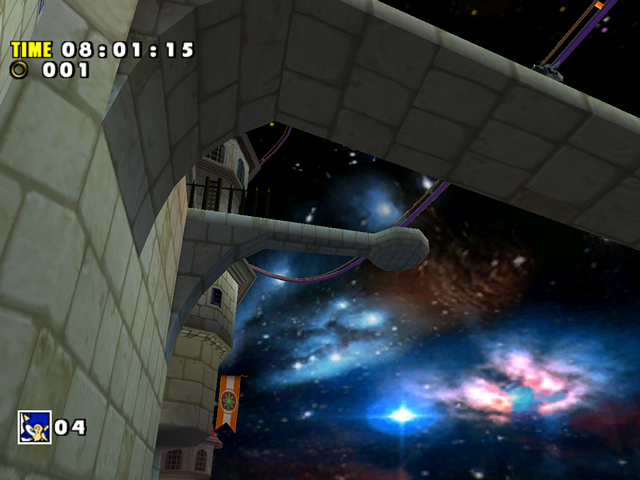 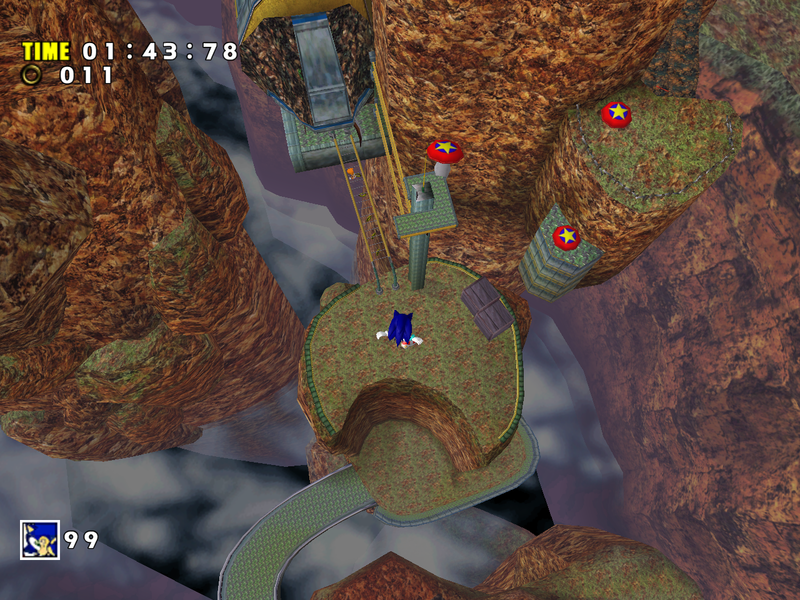 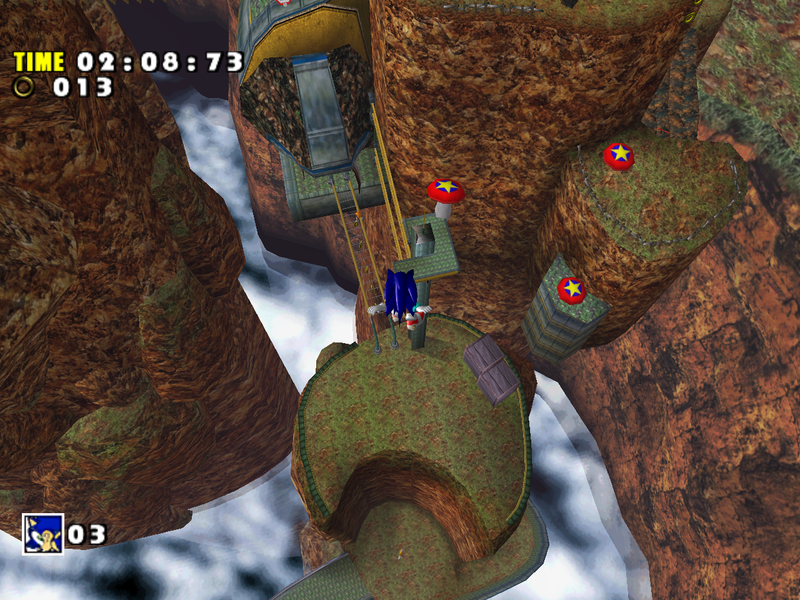 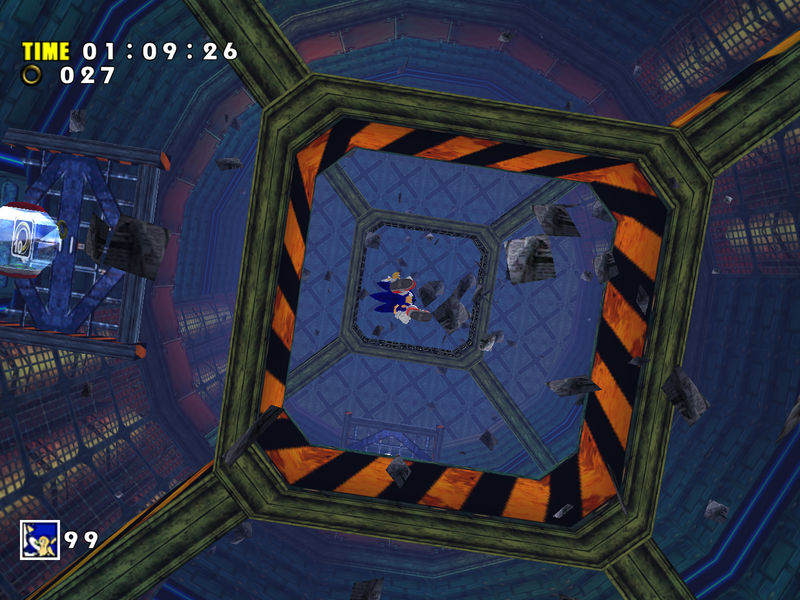 When the rocket takes you above this area on the Dreamcast, the level fades in as you fall down, while in SADX there’s no fog so you can see everything right away. It’s hard to say whether removing it was a good or a bad change because it was probably there originally for performance reasons, but one could also argue it’s an artistic element. 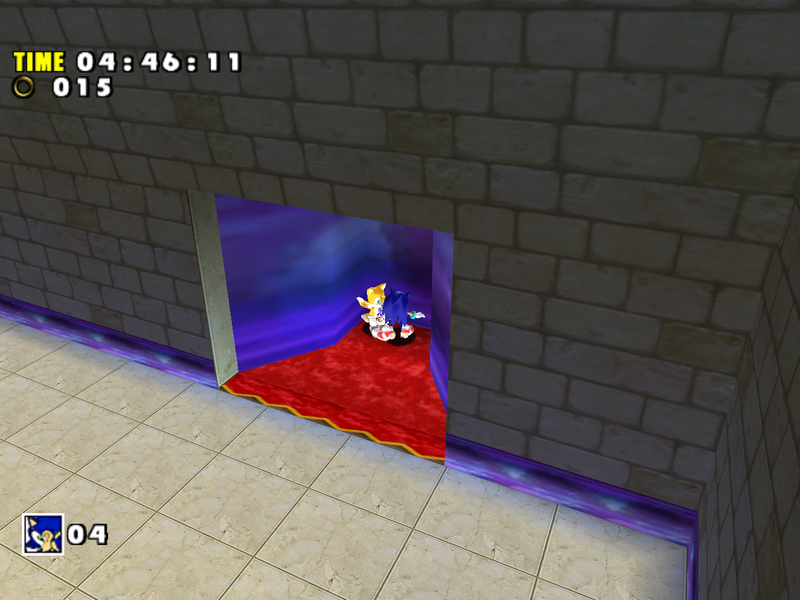 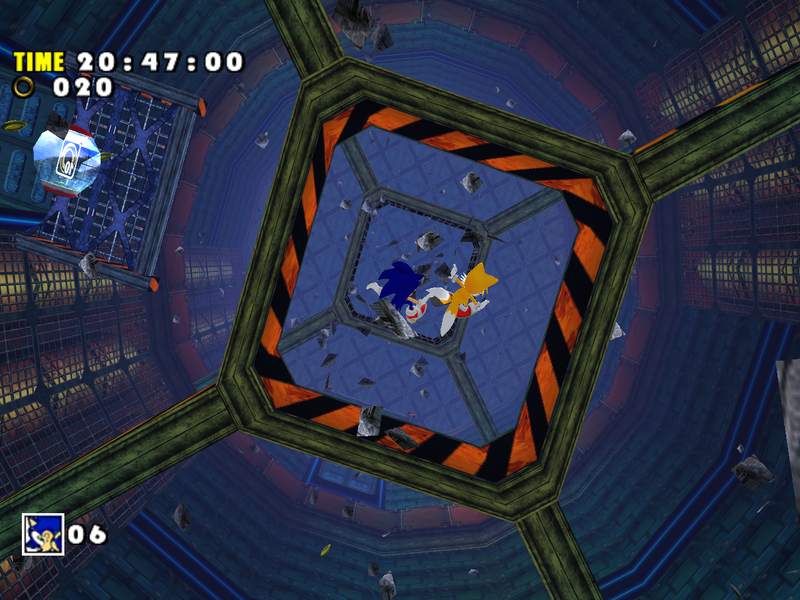 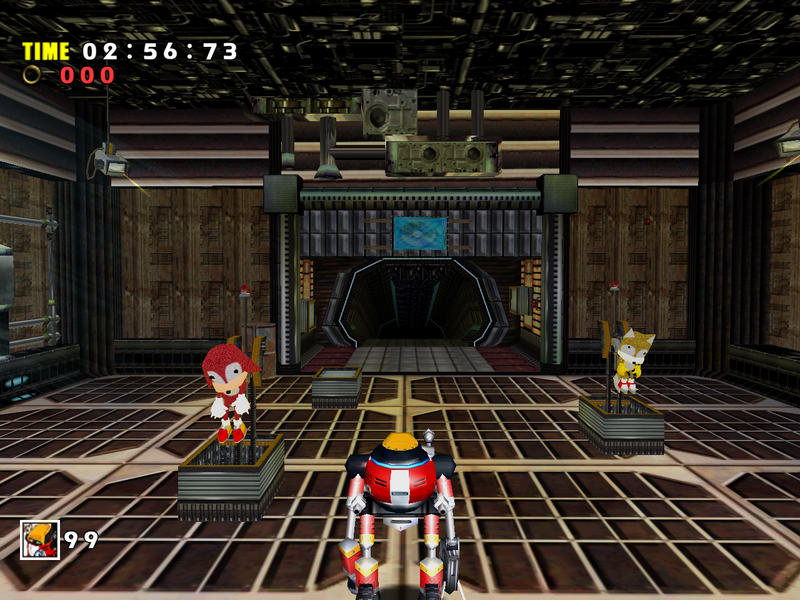 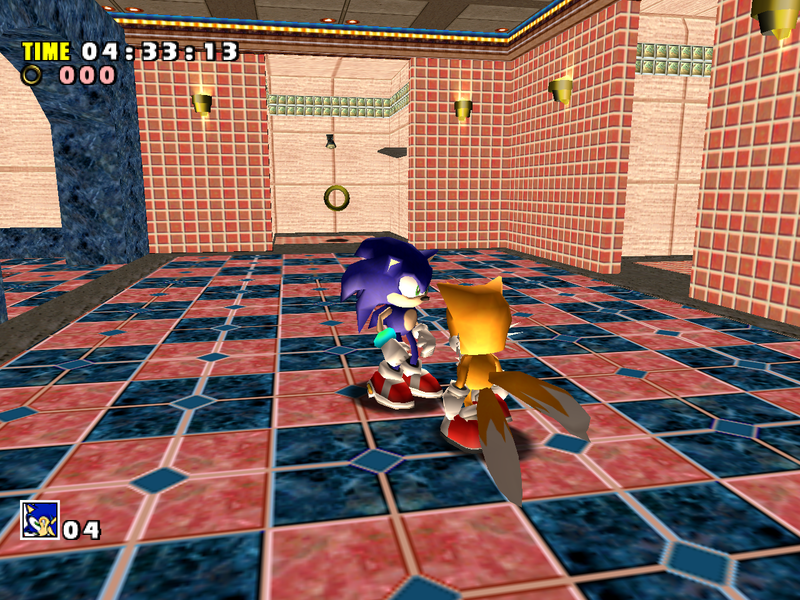 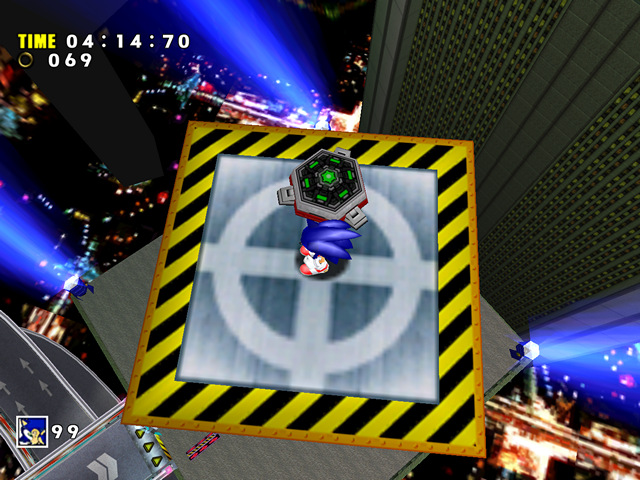 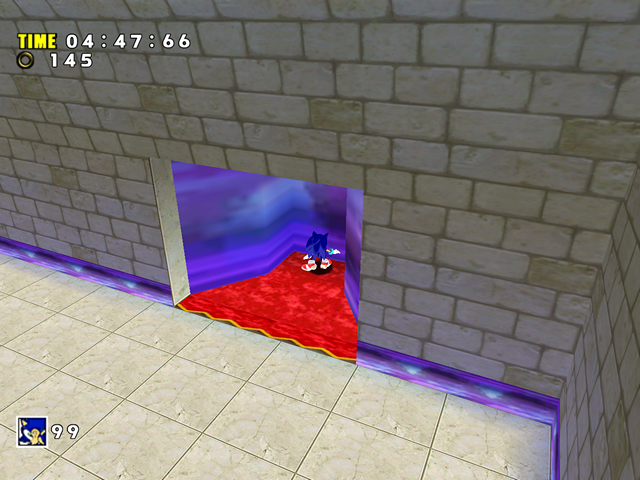 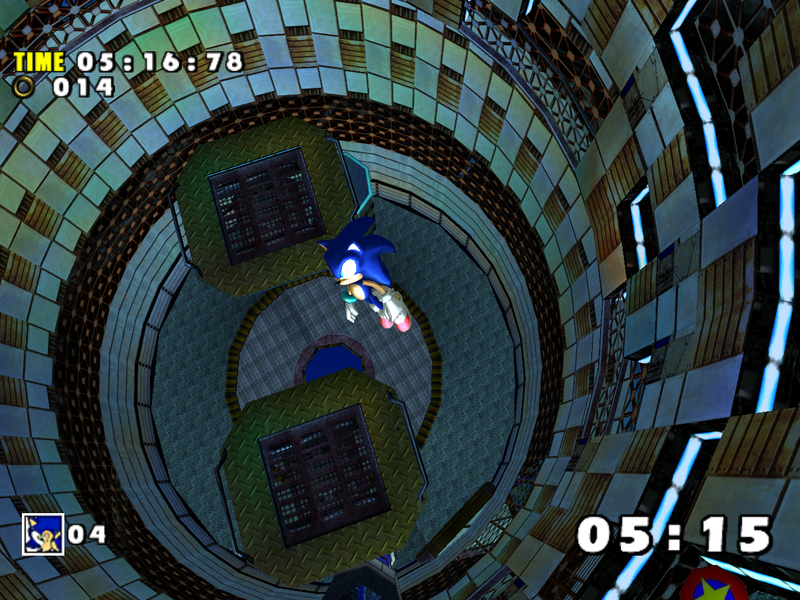 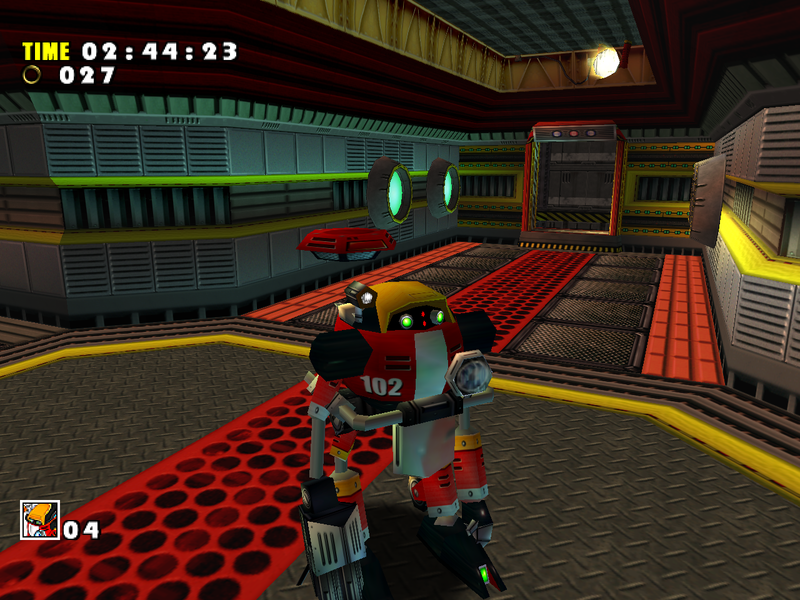 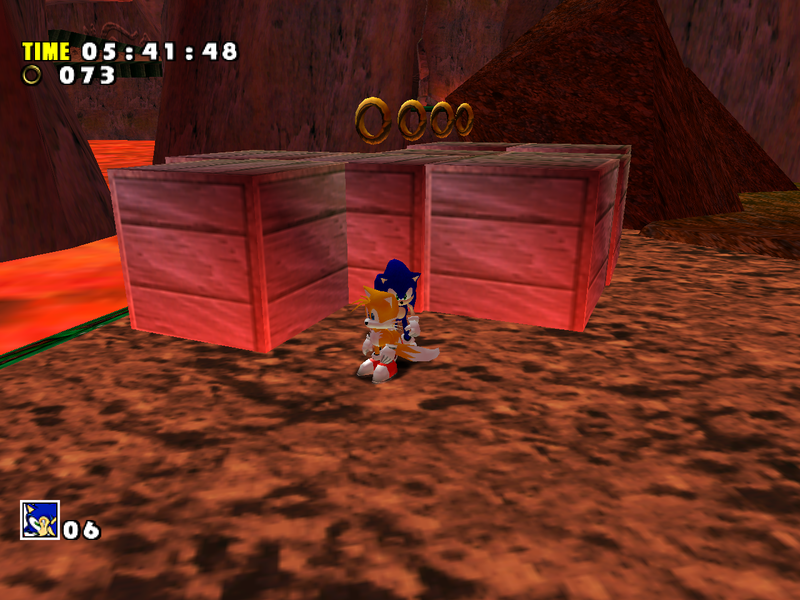 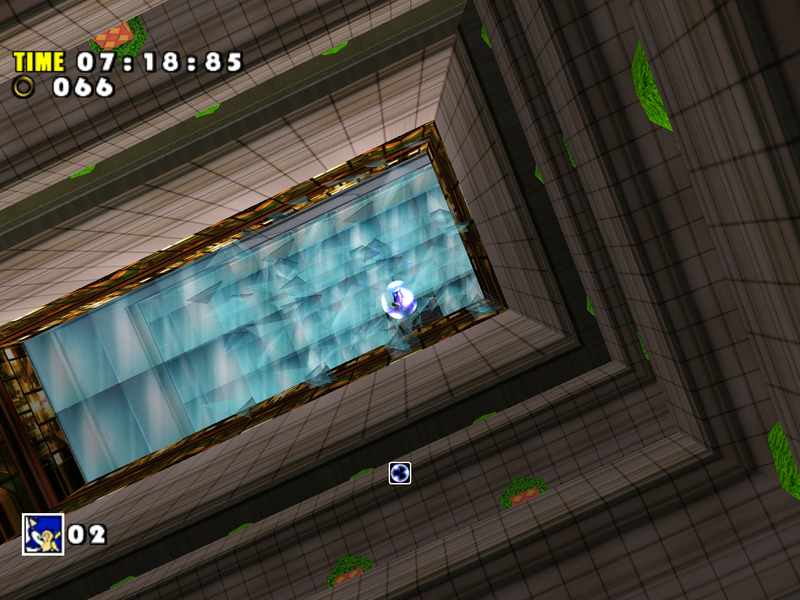 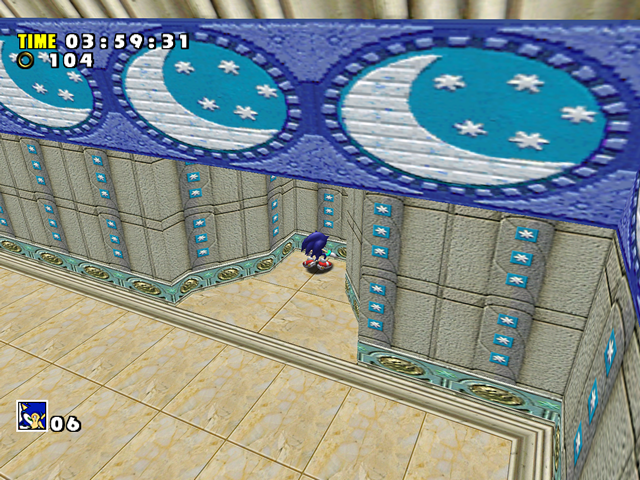 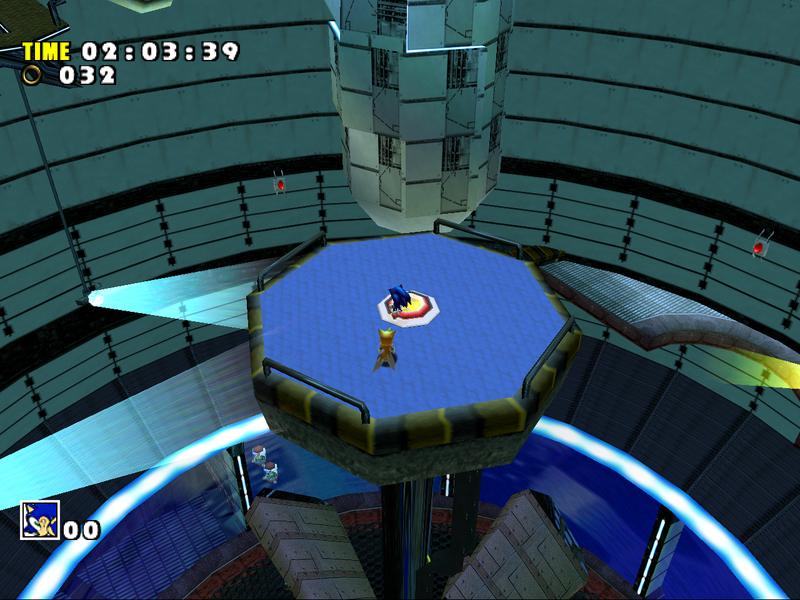 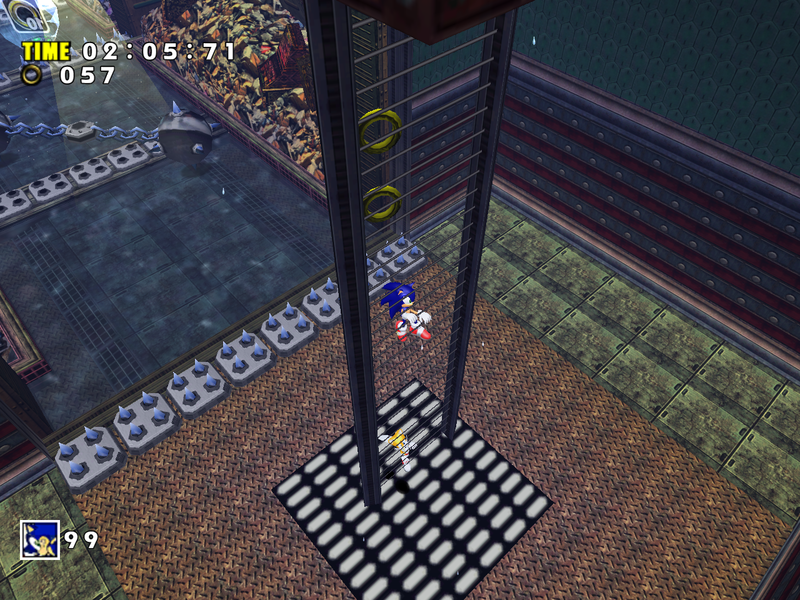 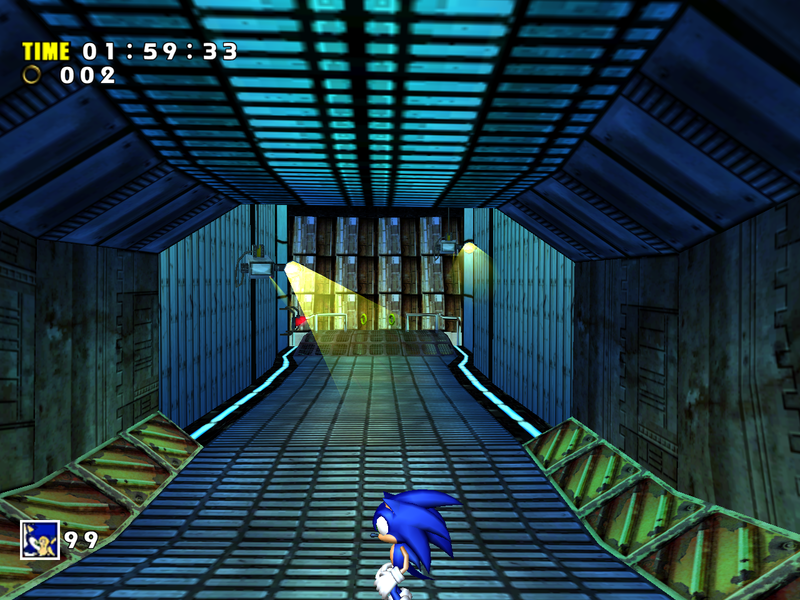 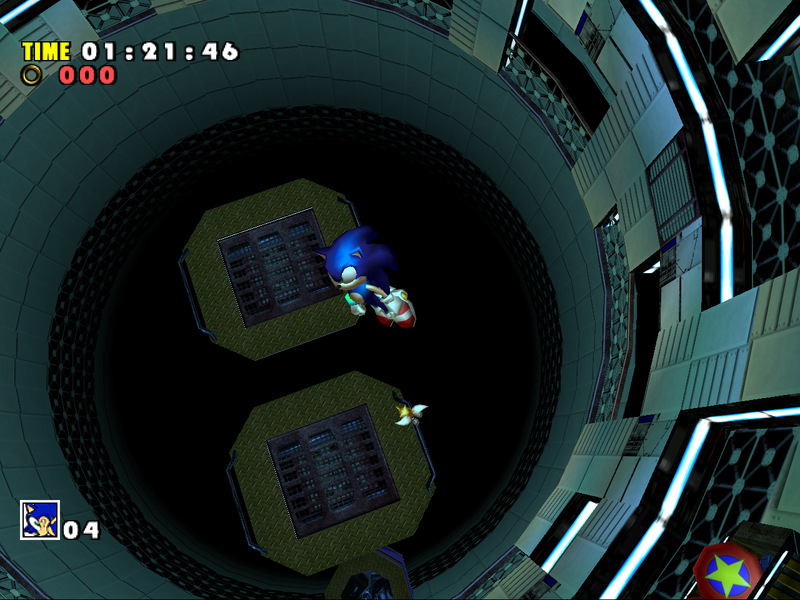 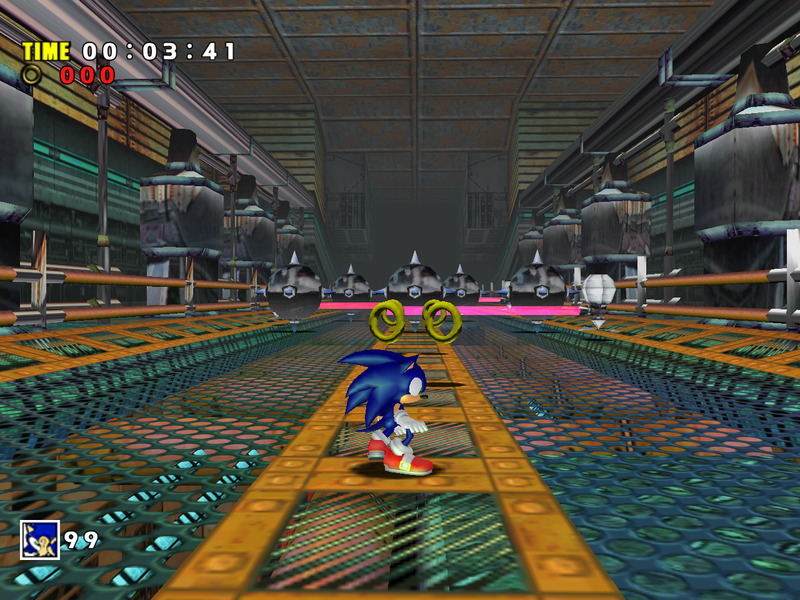 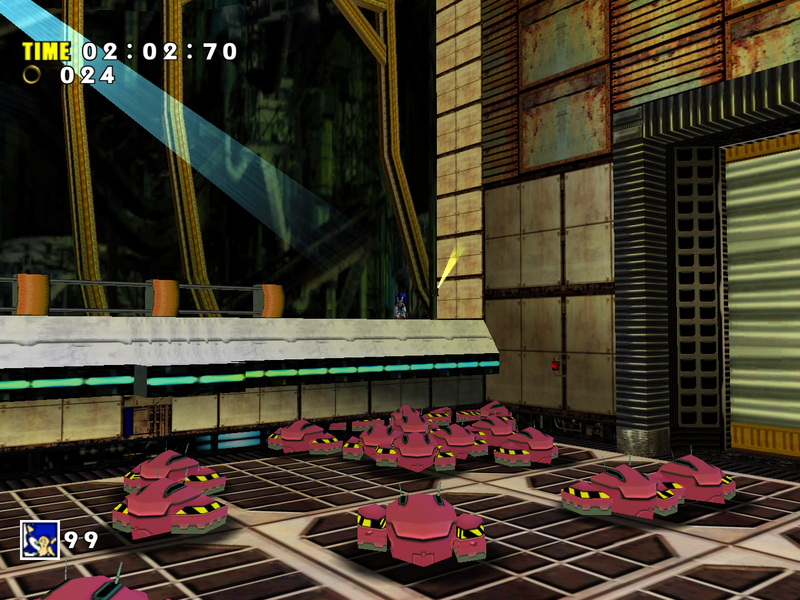 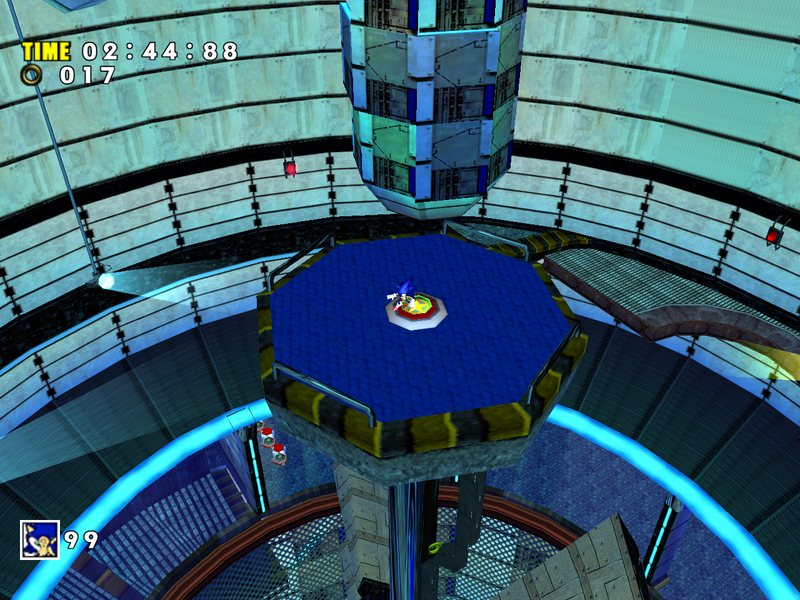 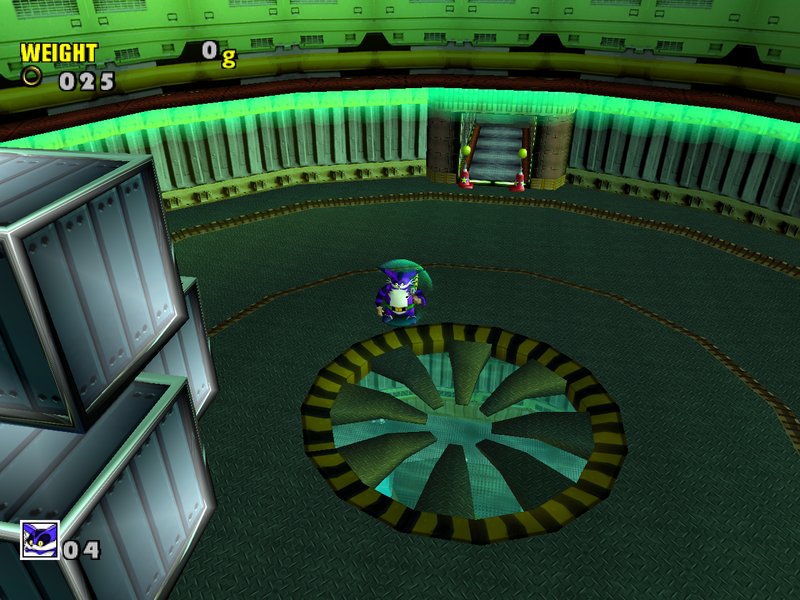 The floor in the room with colored cubes is brighter and more opaque in SADX. 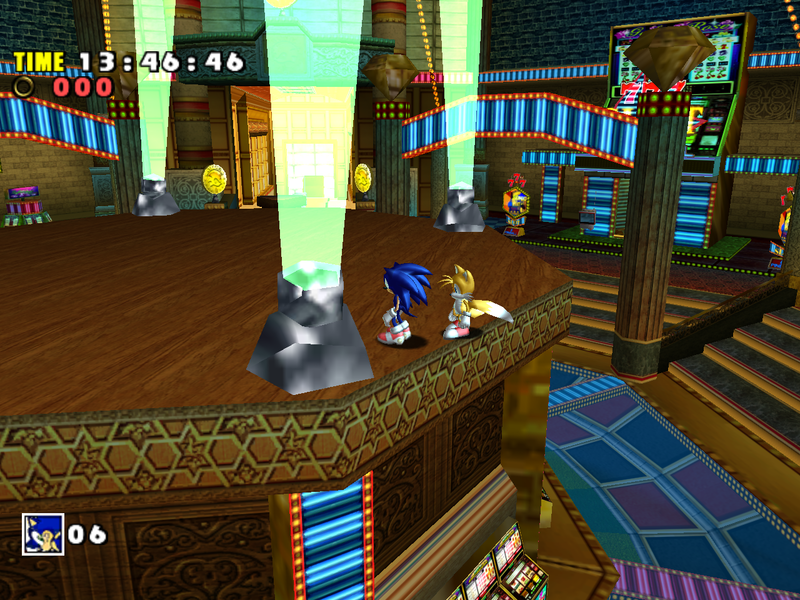 It replaces the reflective light effect on the floor with solid green and makes the bottom layer barely visible. The lights coming from below tend to pop in or disappear in SADX when you turn the camera or walk around. 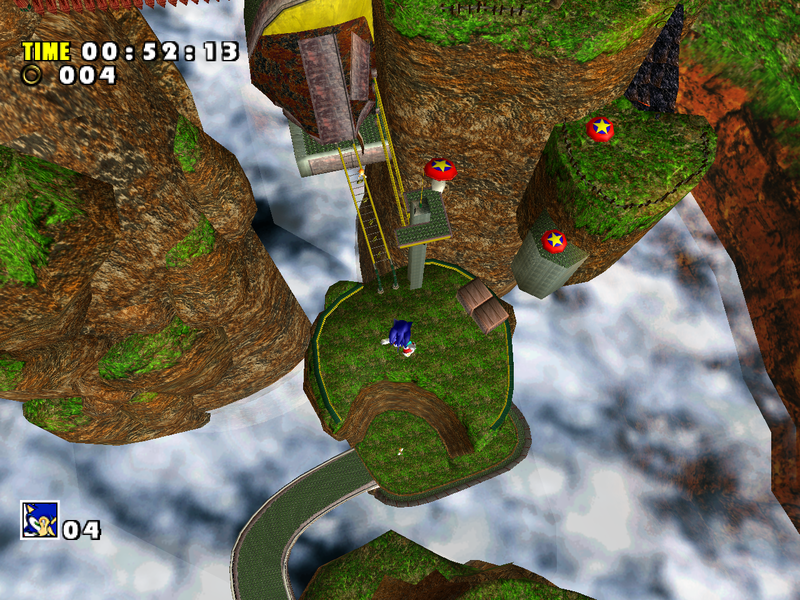 This area doesn’t look too bad with vertex colors if you don’t take into account the overuse of green elsewhere in the game. 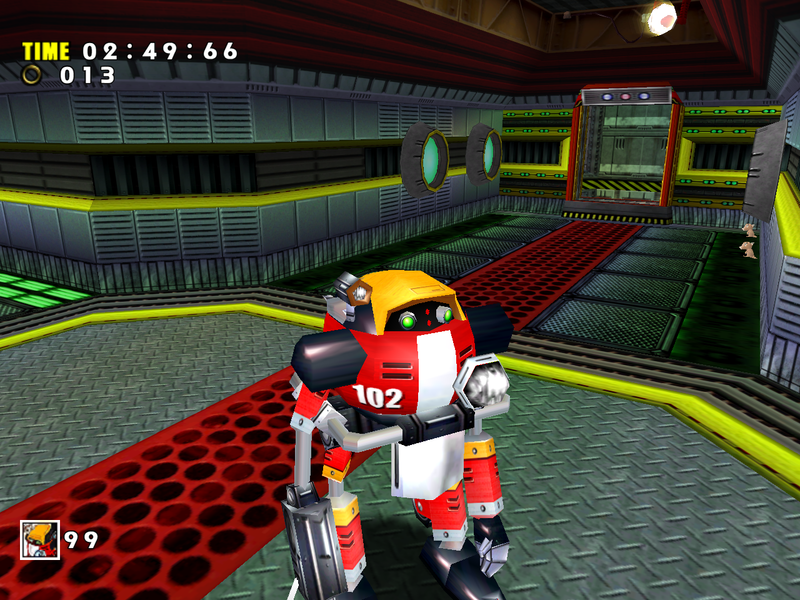 A minor annoyance is that Gamma’s eyes aren’t lit up at all times, but that problem is specific to his model – read more on this in the Characters section. 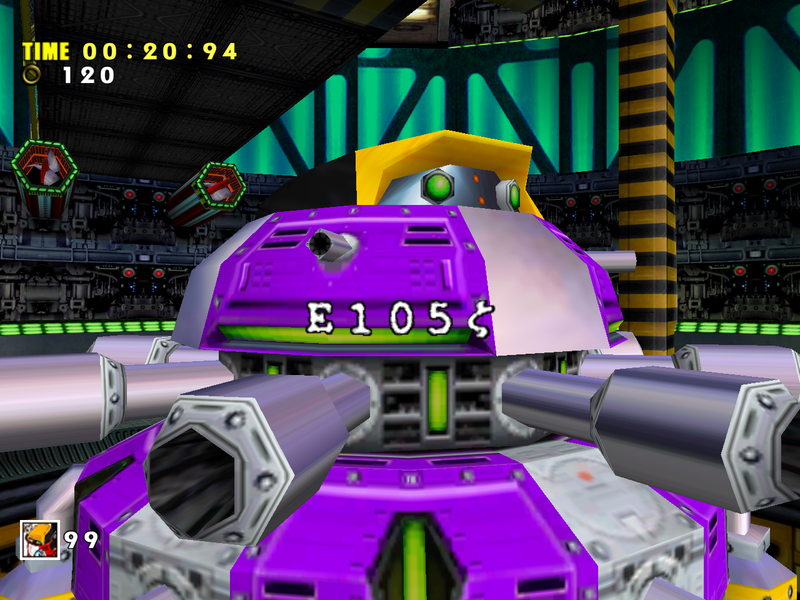 The room where you fight E-105 Zeta has lost neon blue decorations, and Zeta’s textures suffer from recompression. In addition, Zeta’s base animation (the tubes that move vertically) is missing in SADX. 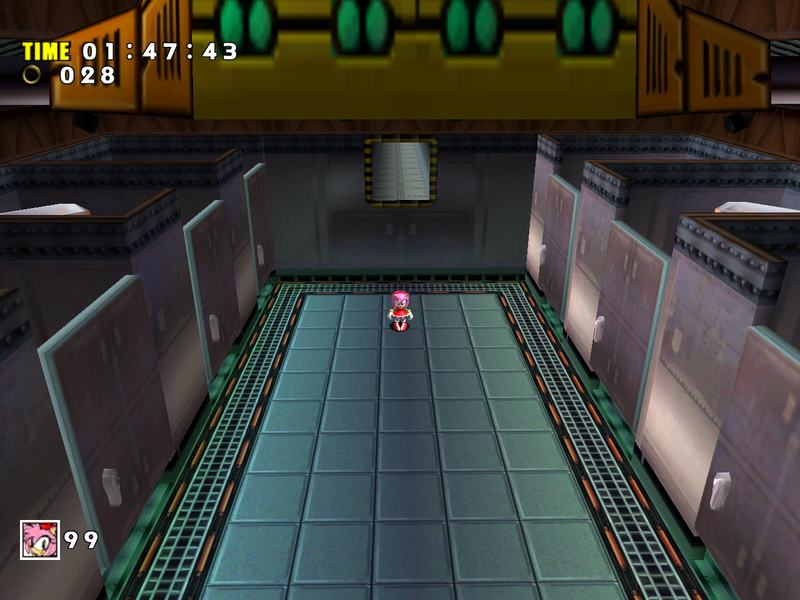 After the disaster that Final Egg was, Hot Shelter doesn’t seem too bad even with all the downgrades. 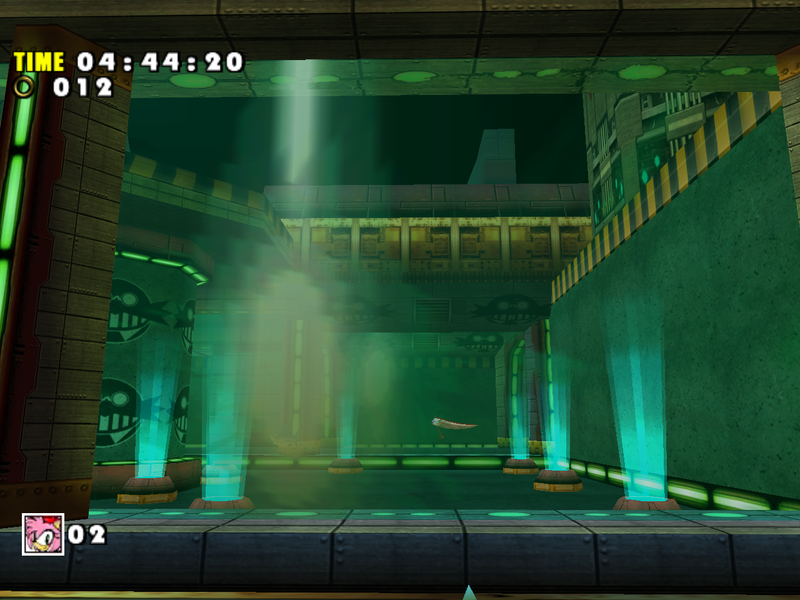 There are quite a few areas in this level where the lighting comes close to looking on par with the Dreamcast original. 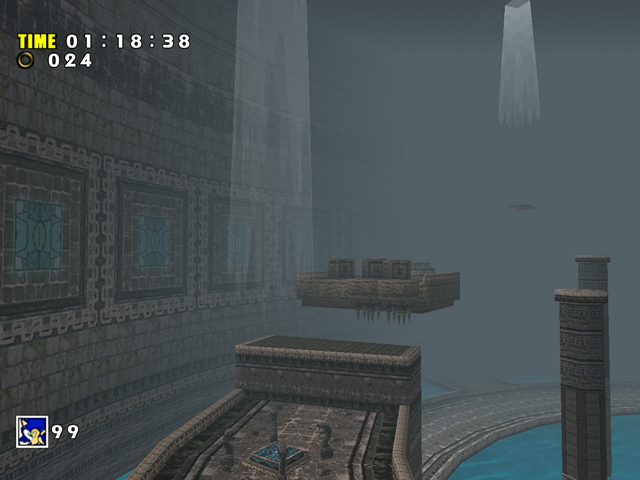 It would’ve been an acceptable redesign if it wasn’t for removed decorations, fog changes and low texture quality. 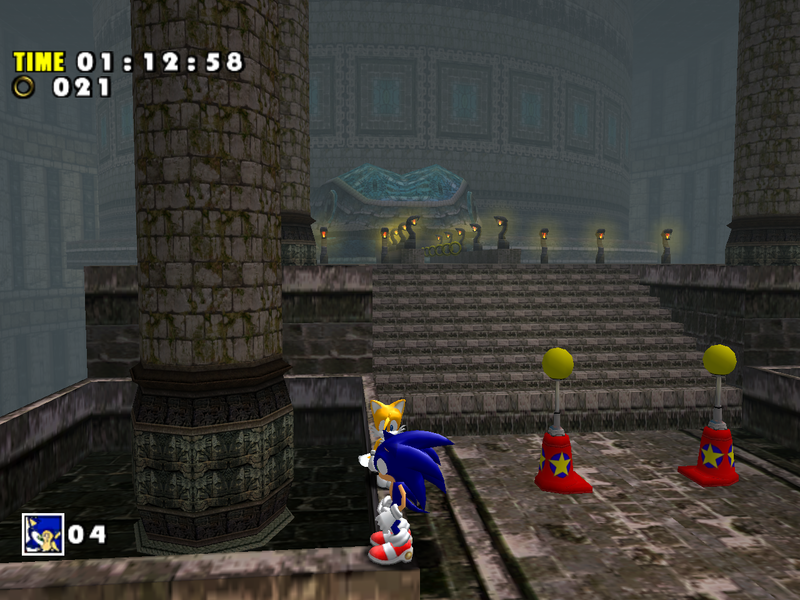 If you want to revert this level to the original version on PC, you can install the Dreamcast Conversion mod, and if you only want to restore the original lighting, you can use the Lantern Engine mod. 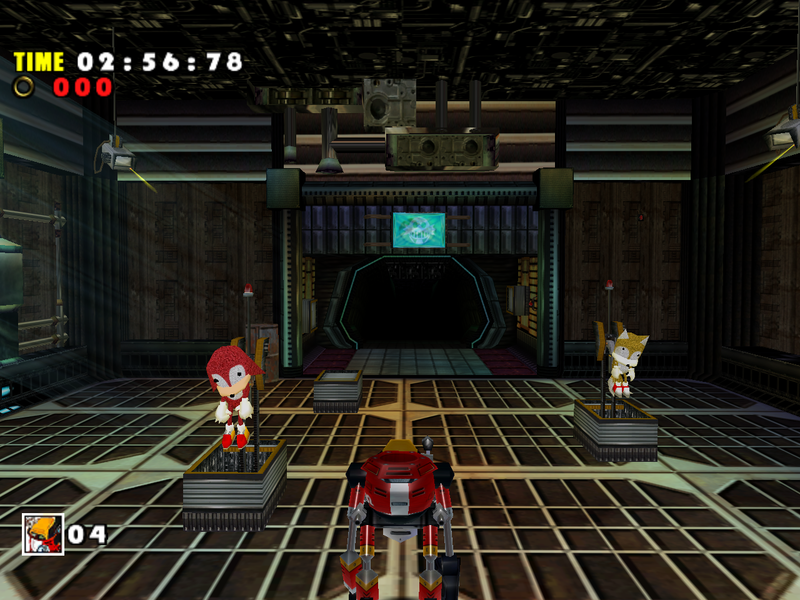 More in the “Fixing the PC version of SADX” section of this blog. 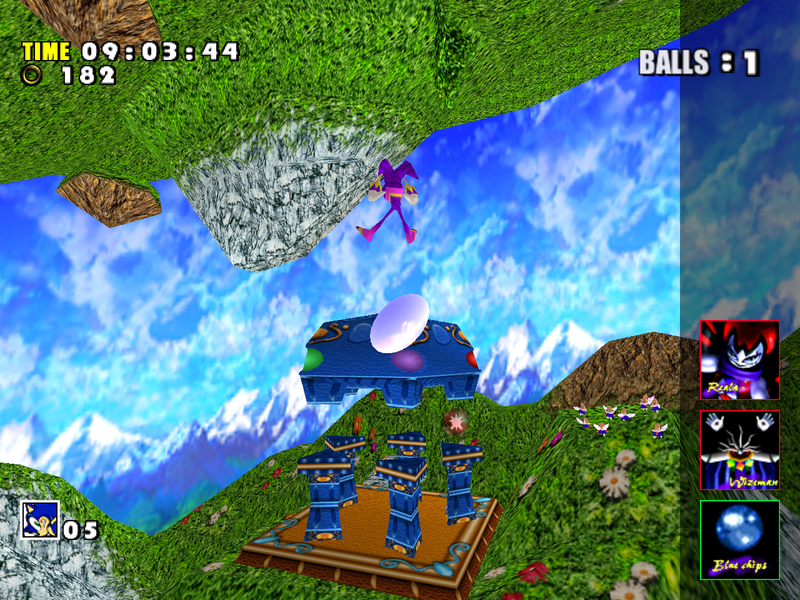 If there was a “top 10” list of SADX downgrades, Final Egg would probably be #1. 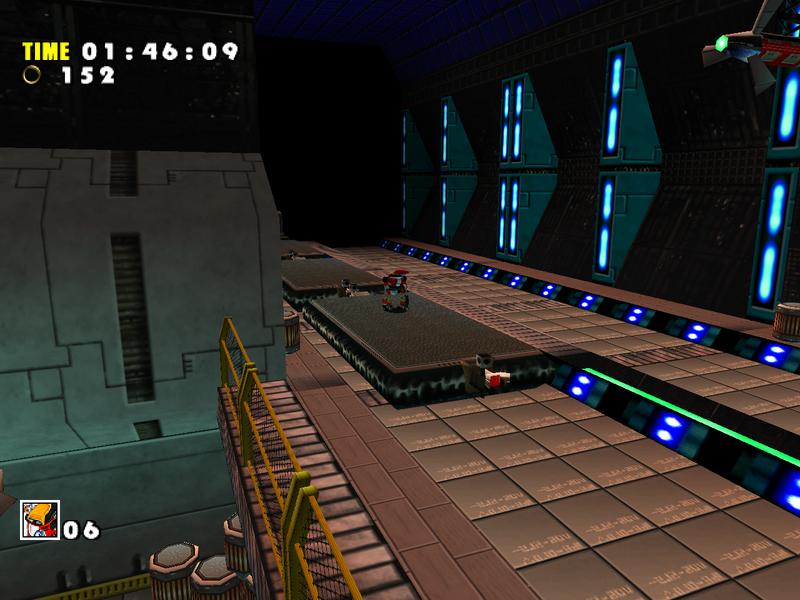 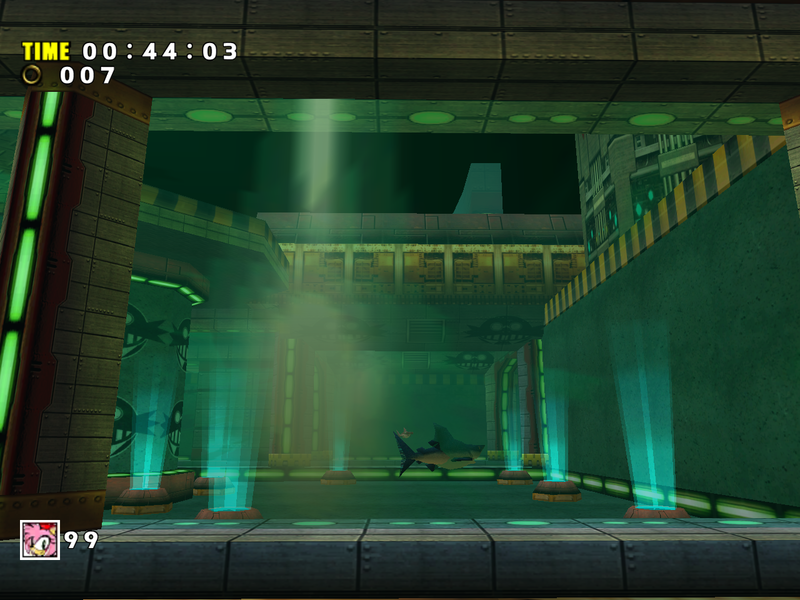 This level suffers from removed lighting, bad fog settings, missing effects, missing object animations, new bugs introduced only in SADX, loss of transparency in some level pieces, broken models that wash out backgrounds and poor texture quality. 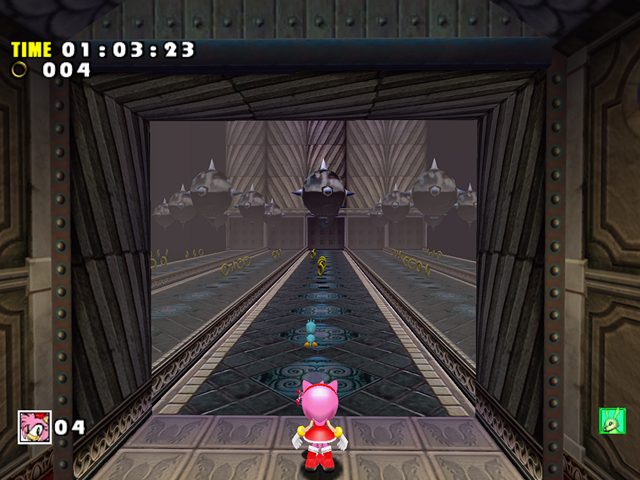 Let’s compare the levels side by side to find out what’s been lost in the transition. 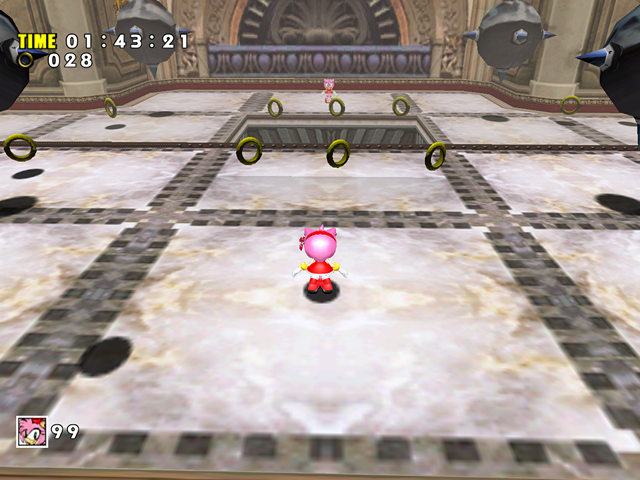 The starting location reveals a different lighting setup. 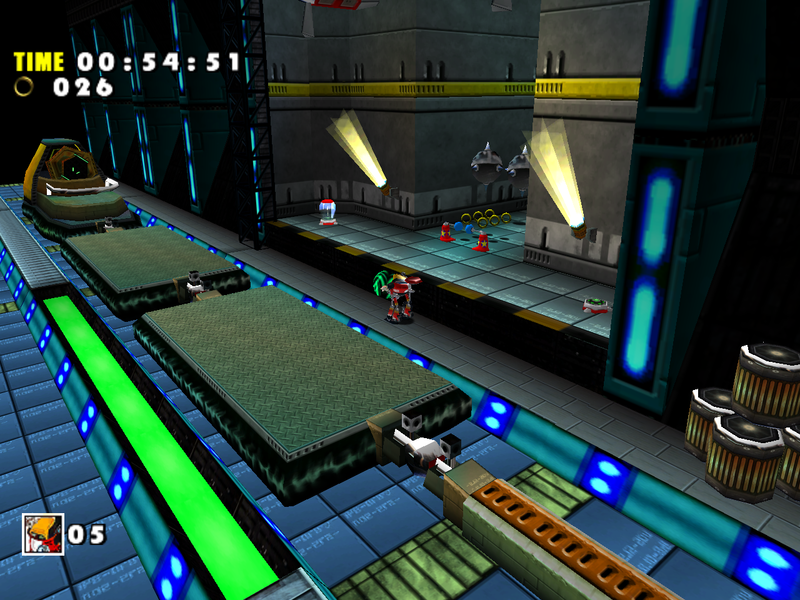 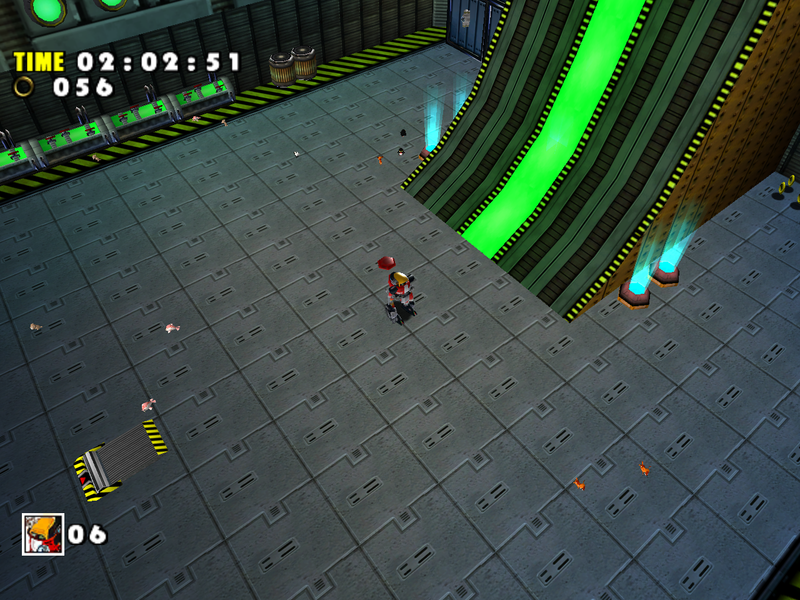 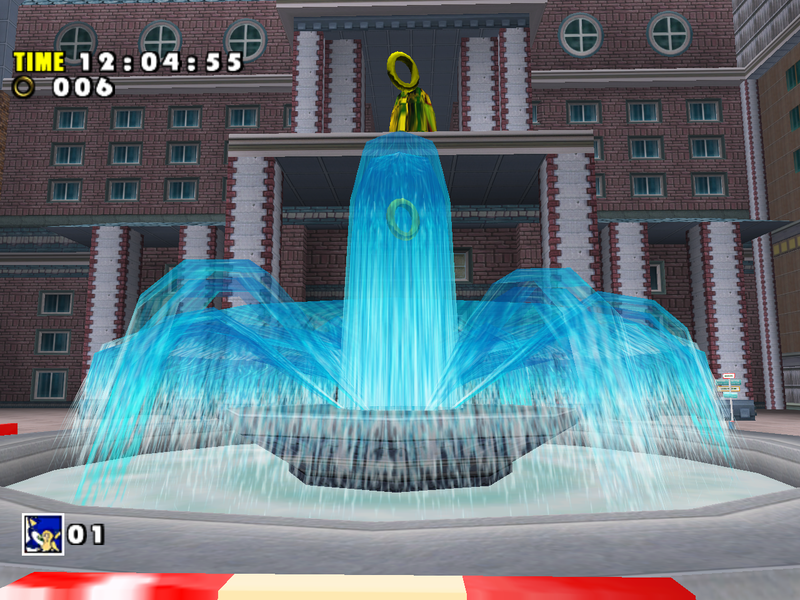 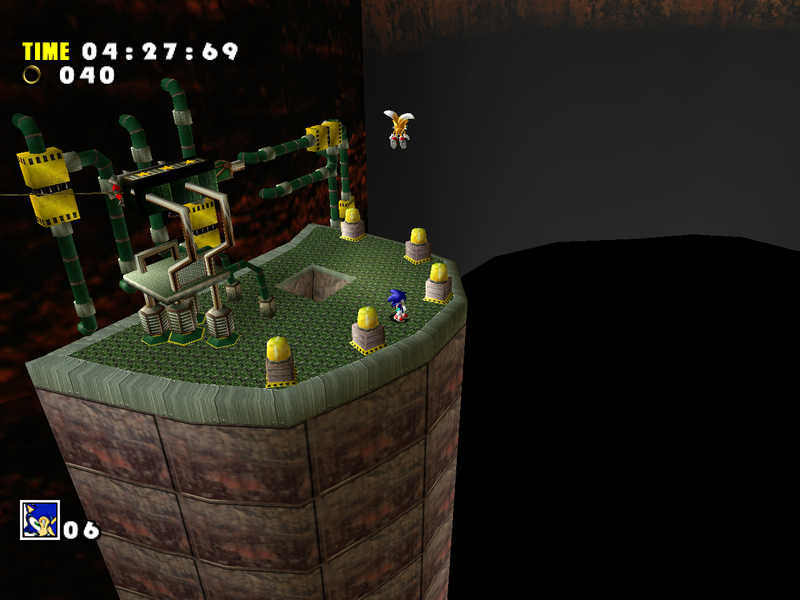 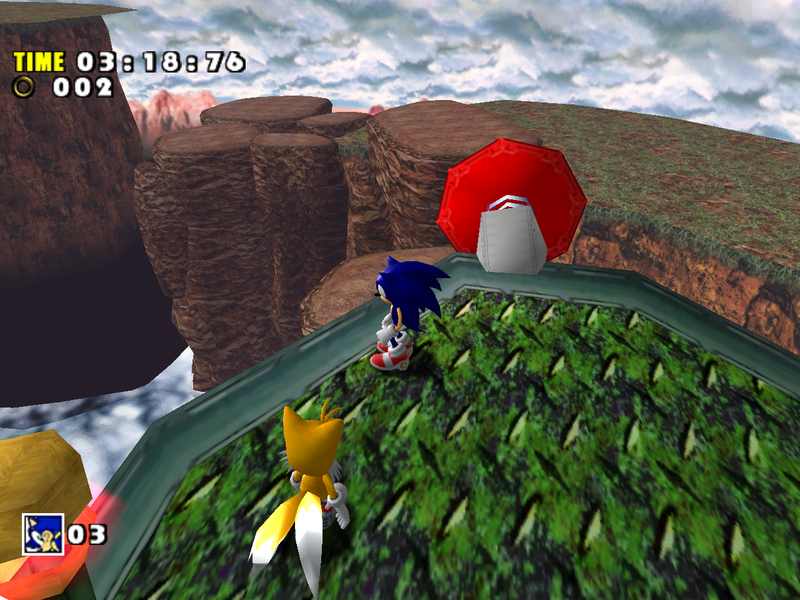 Although the textures have similar design, the SADX version of the level loses the original’s colors and makes it dark green. 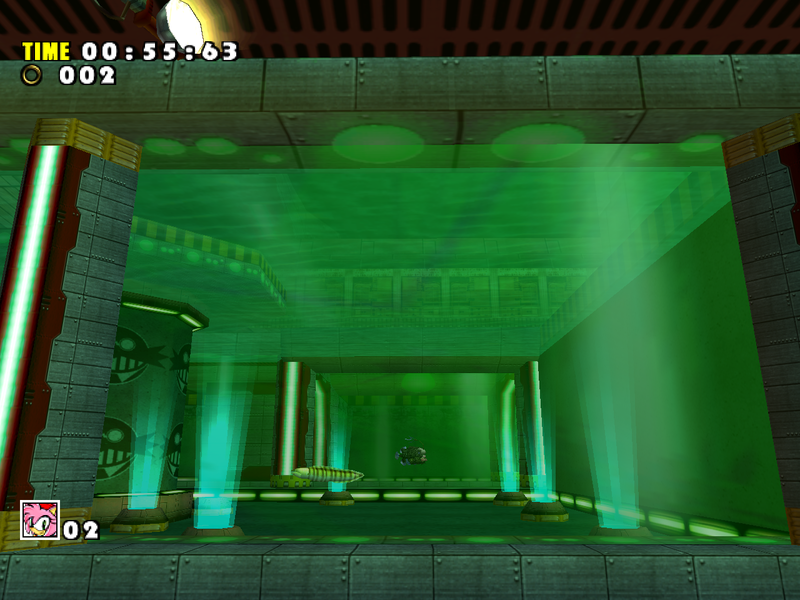 Dark green would’ve been fine in this level perhaps, but the original’s color variety was removed in favor of colors that are already abundant across the game. 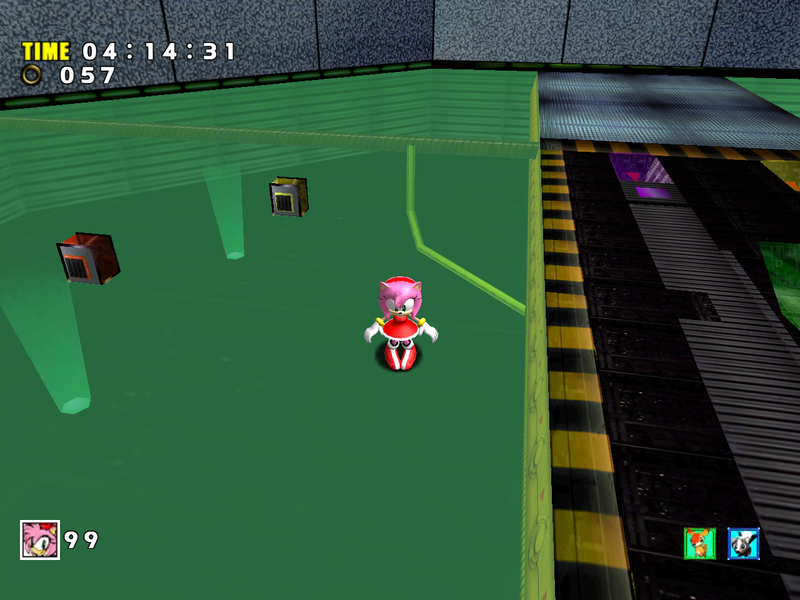 If you’ve seen other level comparisons you know that Speed Highway and Casinopolis also have green vertex colors. 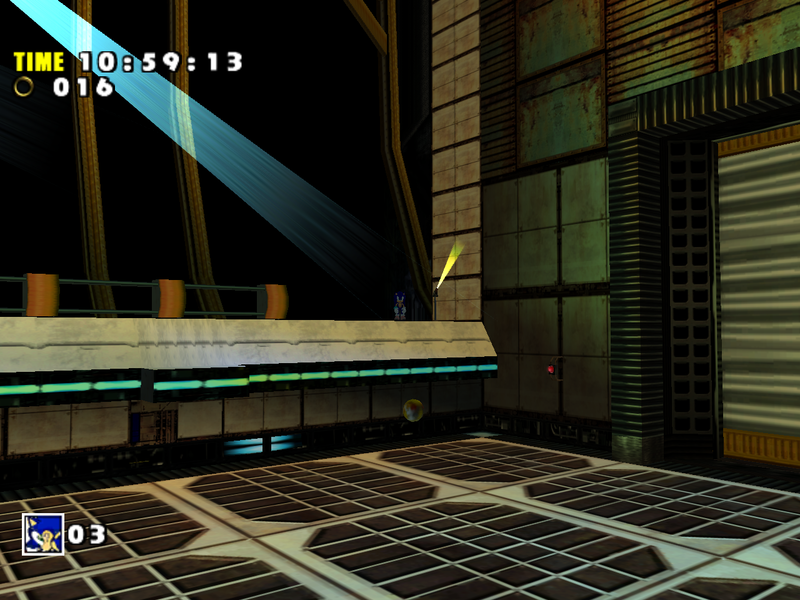 The lighting on Sonic is also dark green in this level, which is a nice change because SADX character lighting seldom matches the environment. The Egg Keeper is missing (although it was readded in the Steam version), and the PC version adds grey fog that doesn’t fit the level too well – black would’ve worked better. 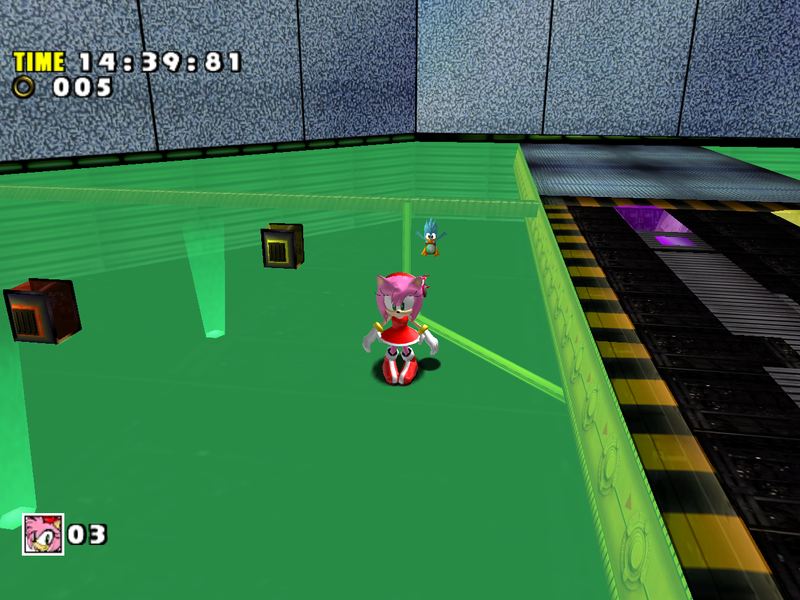 The lasers look different in SADX. 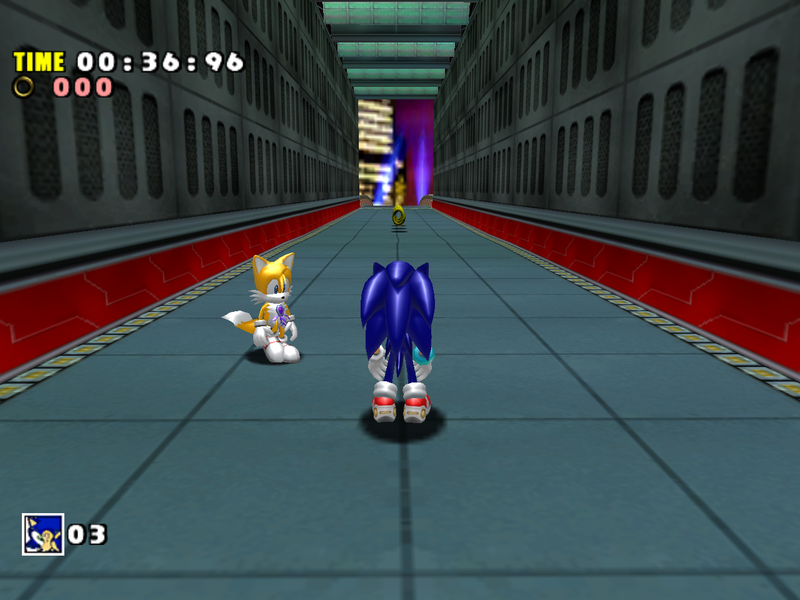 In reality their models are the same in all versions but SADX is unable to render their brighter inner layer properly, making them look like a dark purple line. 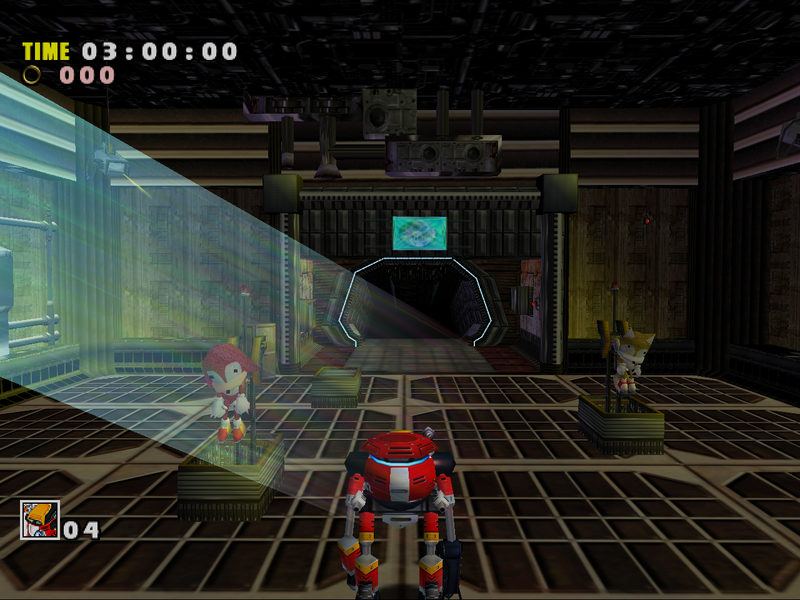 Rearranging the model hierarchy was enough to restore the original look of the lasers. The little standing lights are broken in all ports. On the Dreamcast, they consist of one light (vertical or horizontal) that rotates as you walk around it – a subtle effect that enhances the atmosphere of the level. In SADX, the lights have both the horizontal and vertical meshes enabled, making it look strange with two layers, they don’t vary in size and are completely static – they don’t react to camera or player movement. 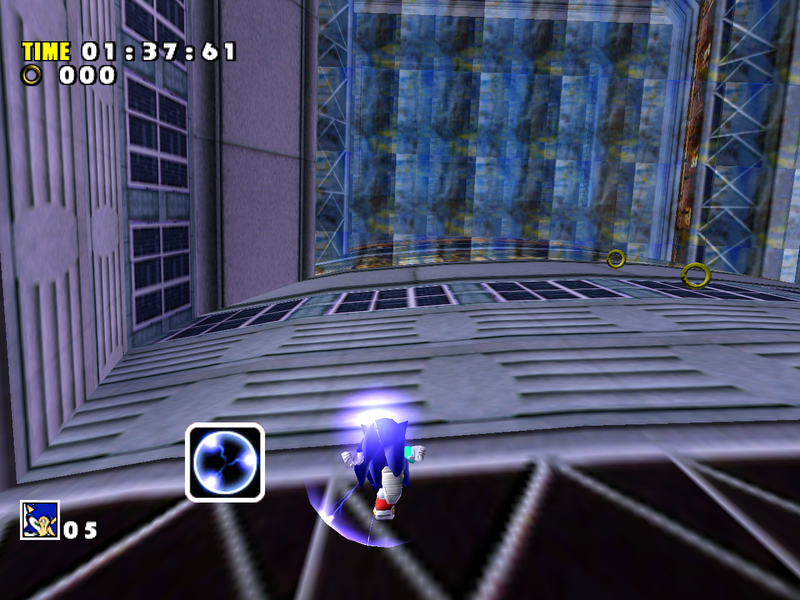 However, SADX added a bug that allows you to spindash backwards and fall through the level, which you can’t do on the Dreamcast. 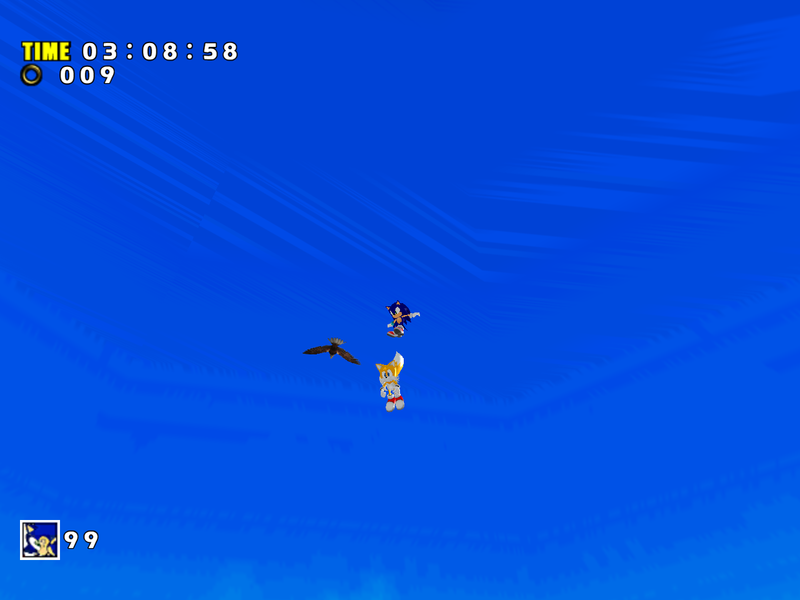 This bug was never fixed in later ports. 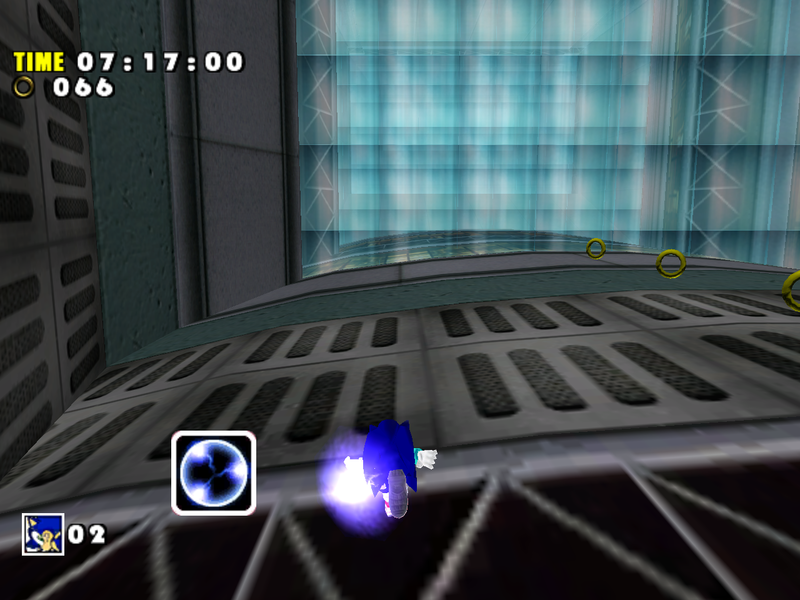 The blue glass pieces were redesigned to be less transparent, so you barely see anything through them in SADX. 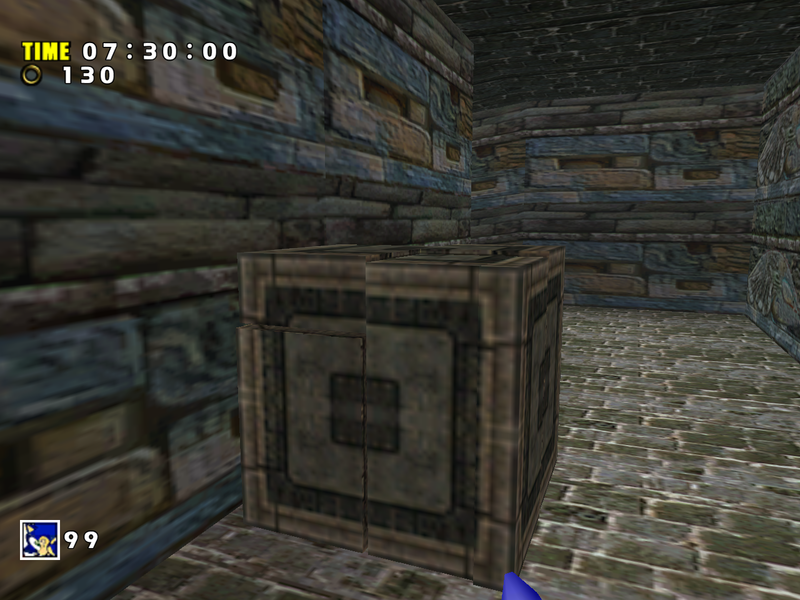 The UVs on those blue glass pieces were adjusted to make the environment mapping effect less prominent. 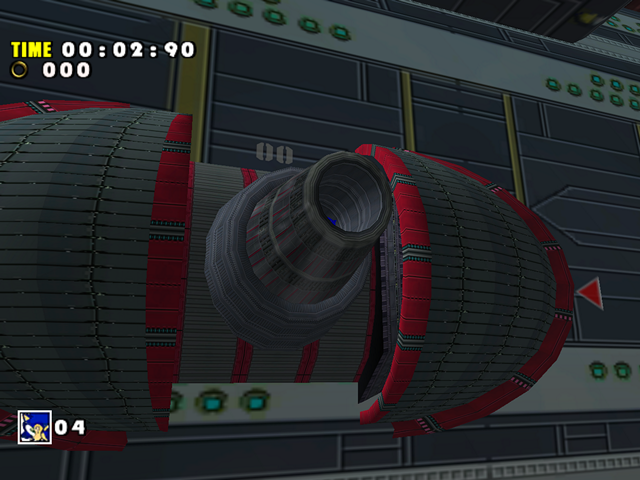 The tubes are less shiny/colorful as a result. 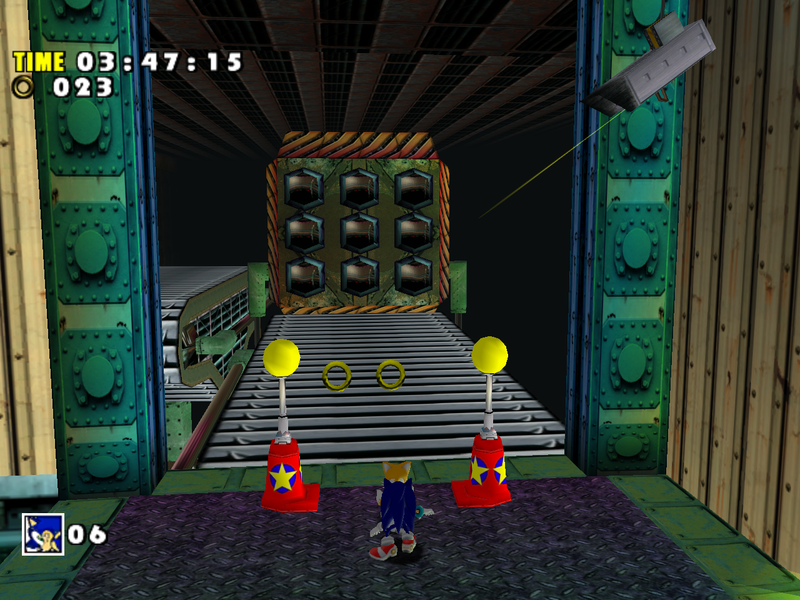 The multi-colored tubes have been removed in the areas where they overlapped the glass, and they are also not as bright in the areas where they still remain. 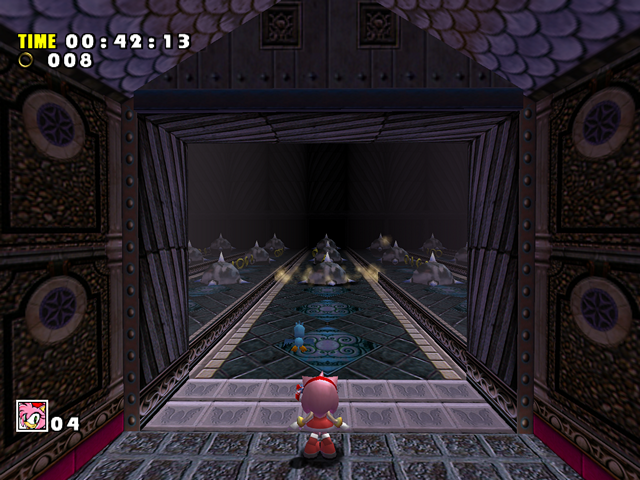 The whole scene looks darker and less colorful as a result. 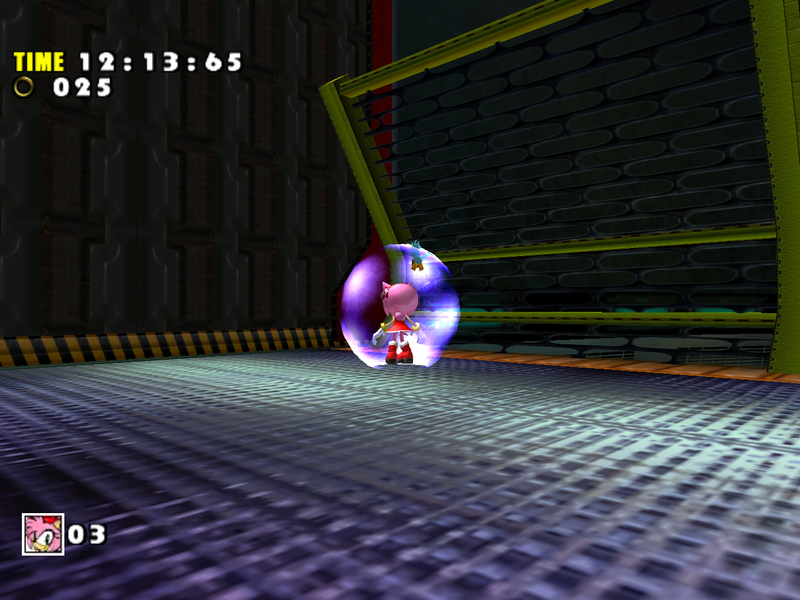 The large background object behind the glass was adjusted (deliberately) to be darker and more washed out, so you can barely even see it. 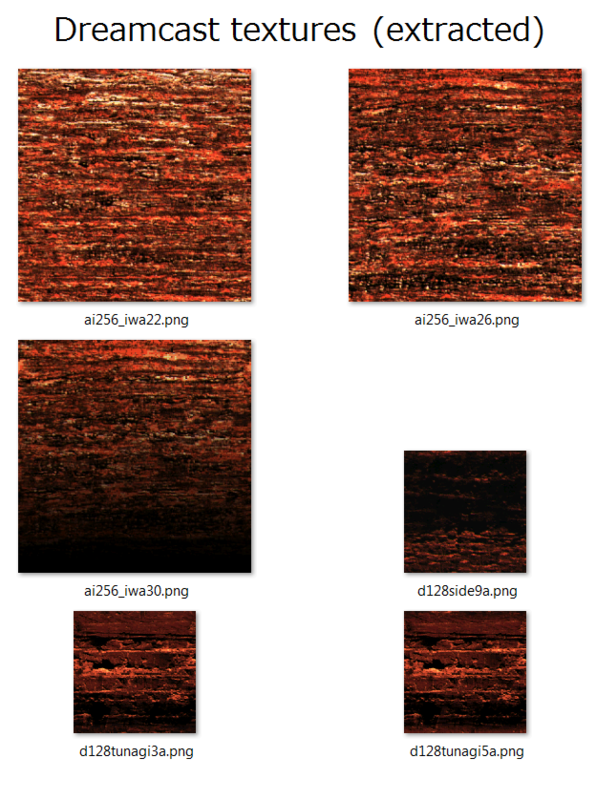 The texture itself is also darker, lower resolution and has less detail. 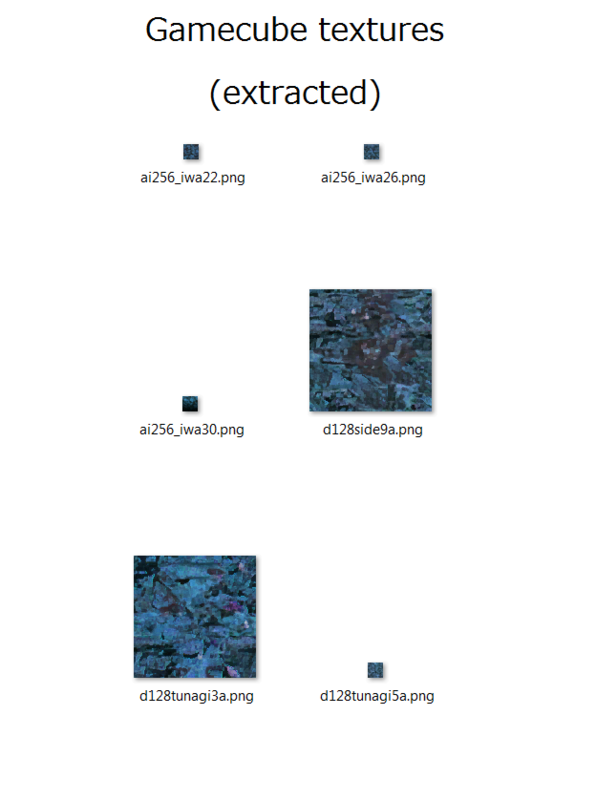 Note – these are not resized, they’re shown as they are stored in the game data. 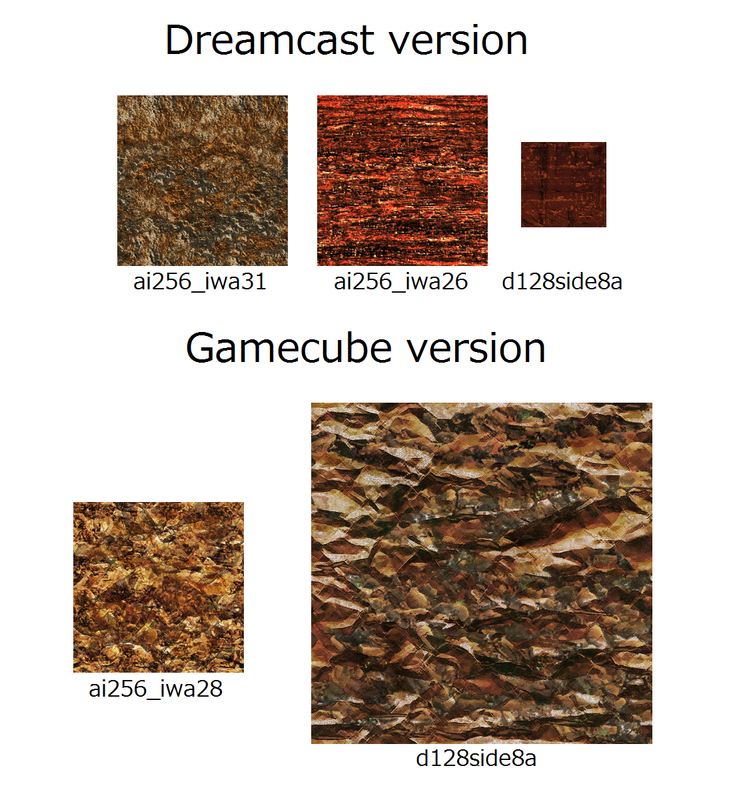 Not only are the Gamecube textures 4 times smaller (half the resolution) than the originals, but they also have the middle part blackened out. If you look closer you’ll notice that the Gamecube textures use the same artwork as the original Dreamcast textures, but with altered colors and rearranged pieces. 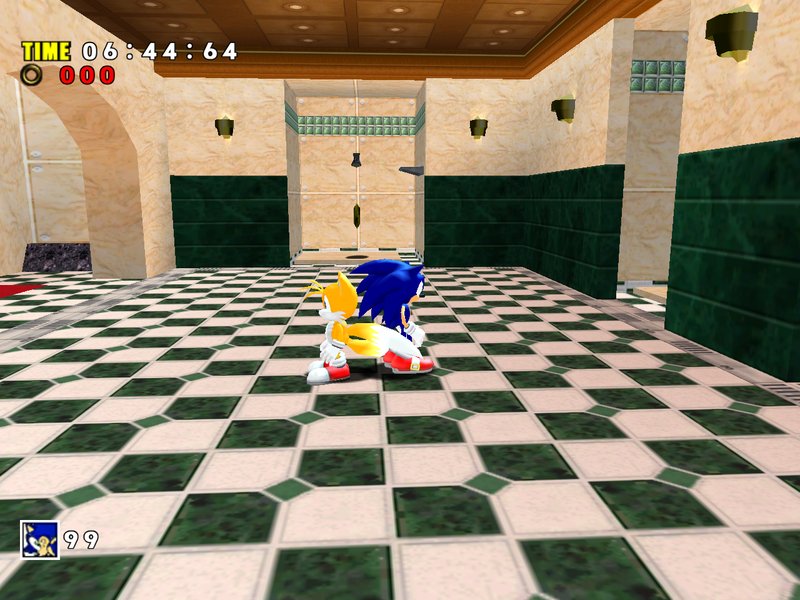 Interestingly the original Dreamcast textures are still in the files. 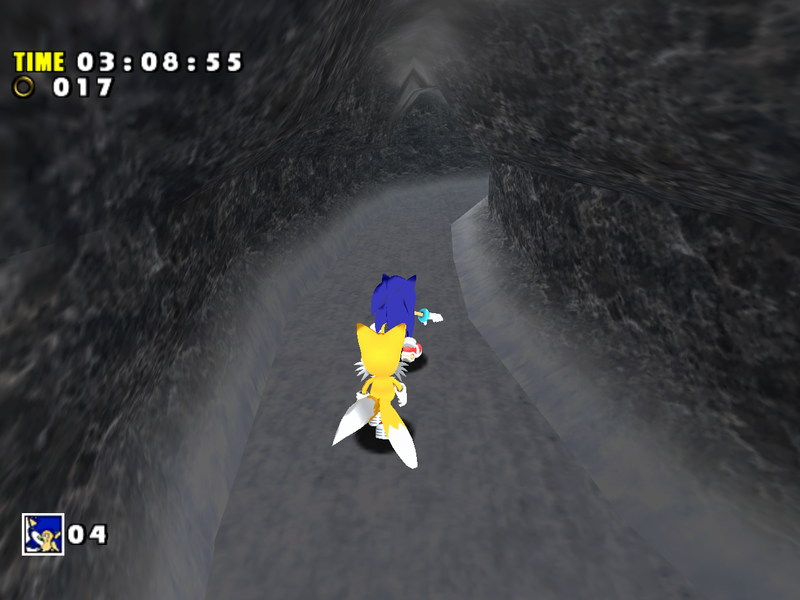 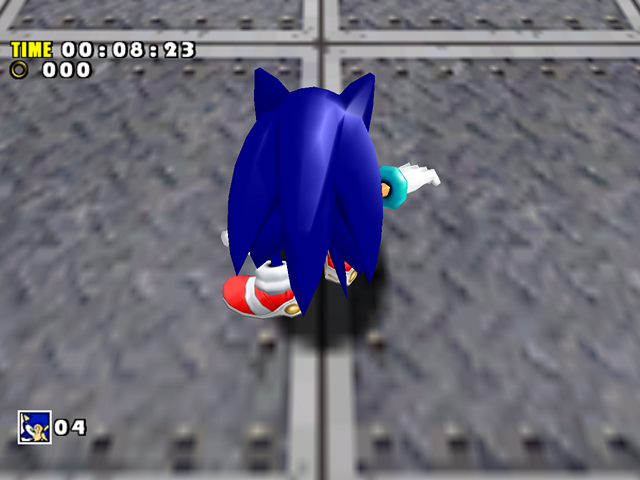 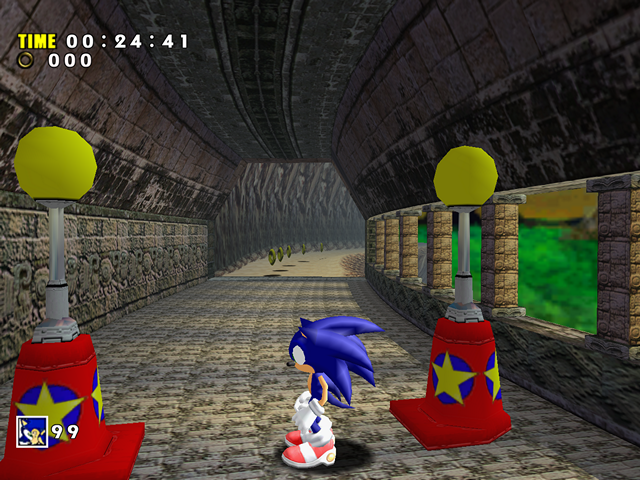 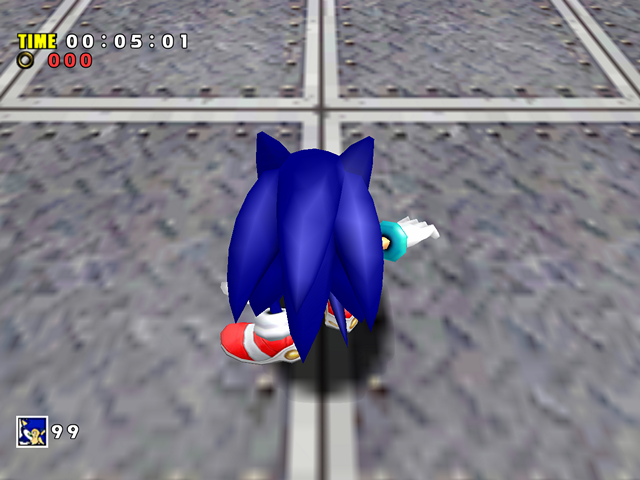 During early development of Dreamcast mods I tried to make the SADX version of Final Egg use Dreamcast textures, but this particular piece looked darker and washed out even with Dreamcast textures, most likely because of added dark vertex colors. 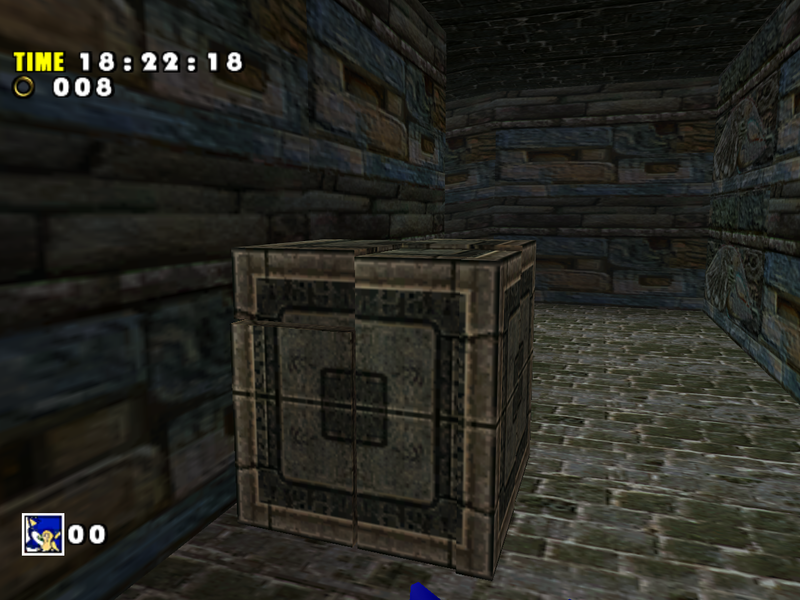 The UVs also don’t seem to work well with the Dreamcast texture. 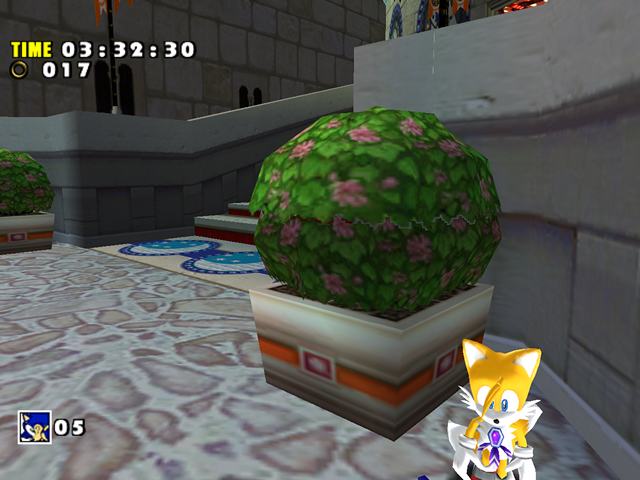 While the resolution downgrade could have been done for performance reasons (but let’s remember that this is supposed to be an “enhanced” port), there is no way the added dark vertex colors and all the editing were accidental. 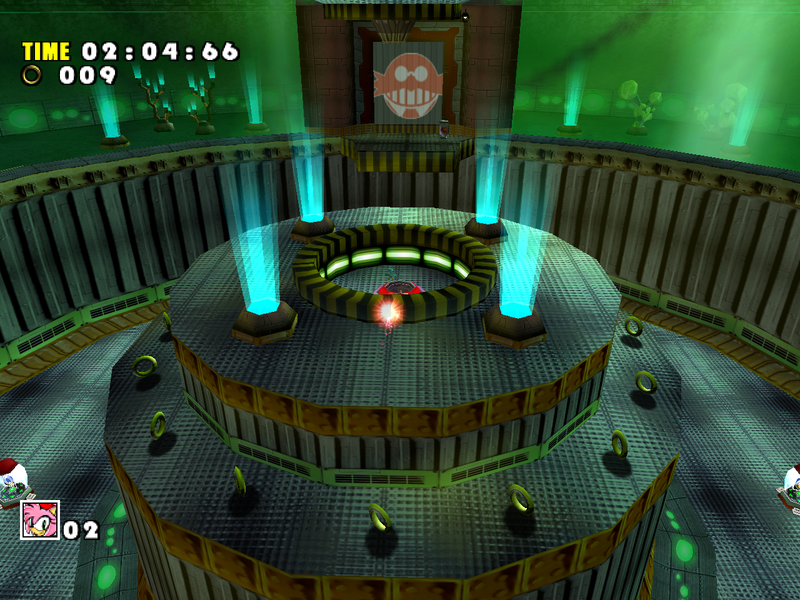 The developers deliberately reworked this level to make it look uglier. 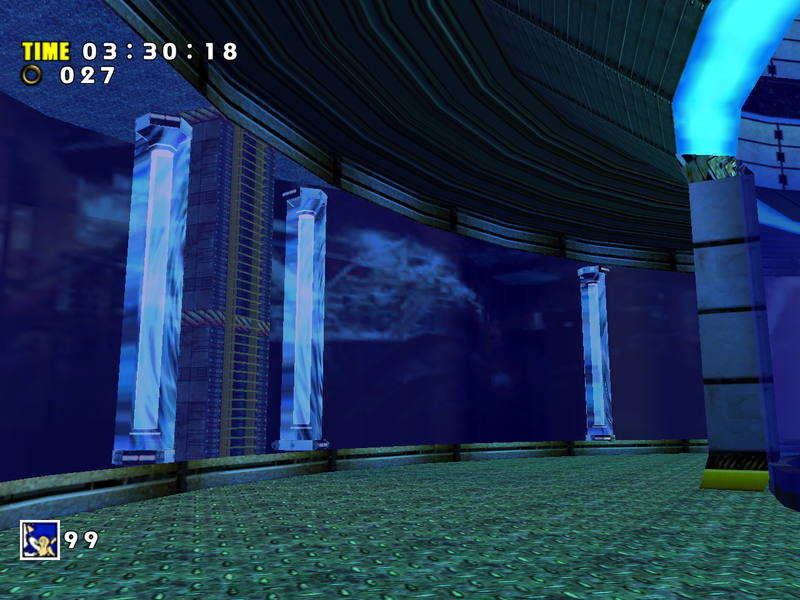 This area was also downgraded with washed out background and simplified UVs on the blue glass. 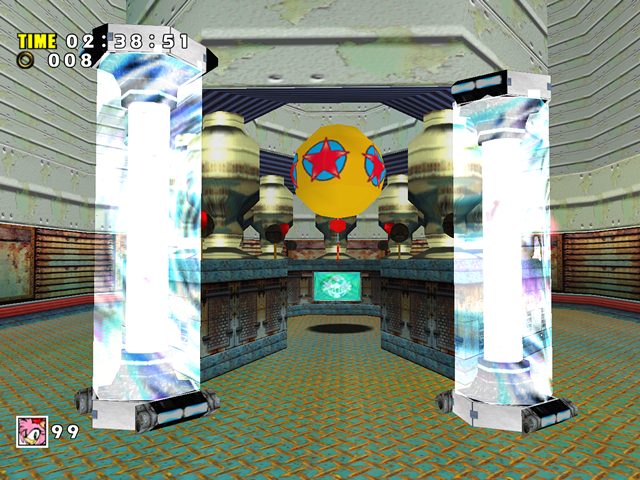 The plasma effect on the spinning electric cylinders was replaced with a choppy animation, which we will discuss later. 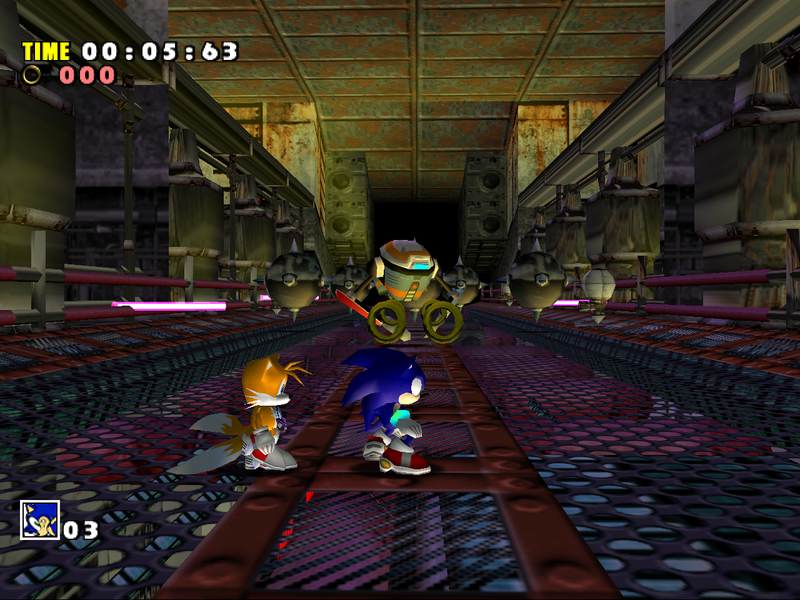 In the original game, the light has a low resolution texture that gets scaled to the length of the light, and the noise from upscaling a low resolution texture creates a cool looking rainbow effect that you can see in the Dreamcast screenshot. 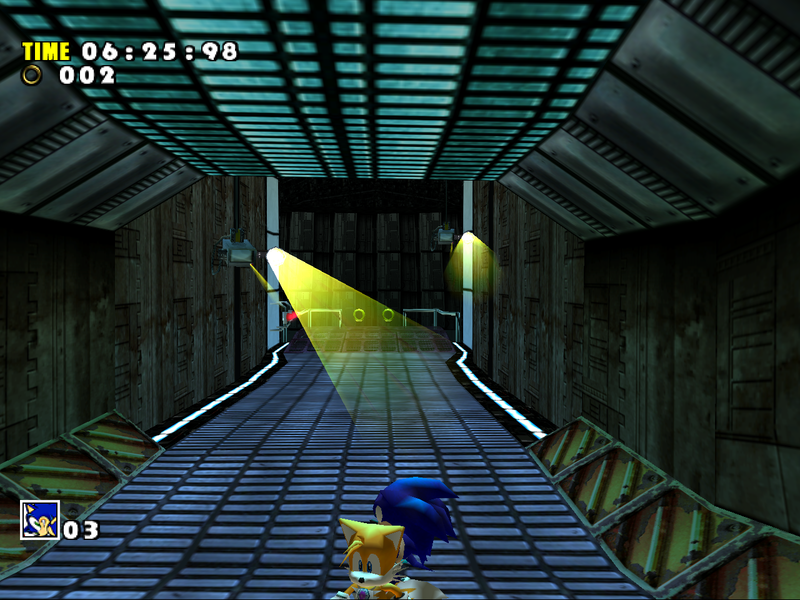 However, the light’s texture also has an alpha channel. 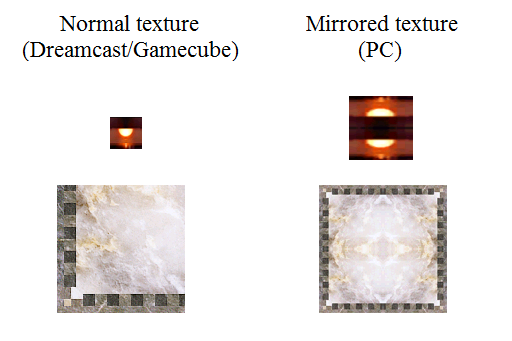 To mask rendering issues with transparent things, the Gamecube/PC ports don’t show transparent pixels if their transparency is beyond a certain threshold, which is what happens here. 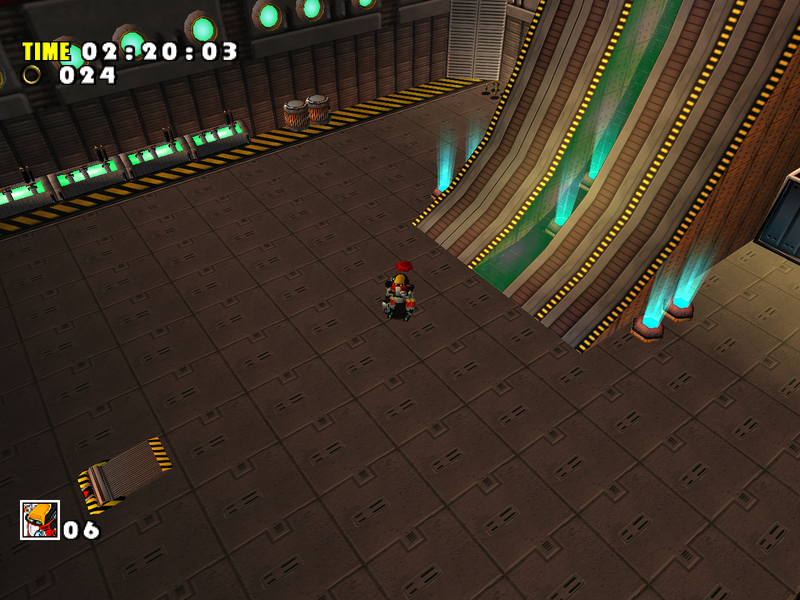 Simply editing the texture’s alpha channel to make it pass the alpha rejection test makes the lights much more vibrant. However, in addition to alpha rejection issues, the SADX light model was adjusted to make the light shorter, so even with an edited texture or disabled alpha rejection it wouldn’t look as good as the Dreamcast original. 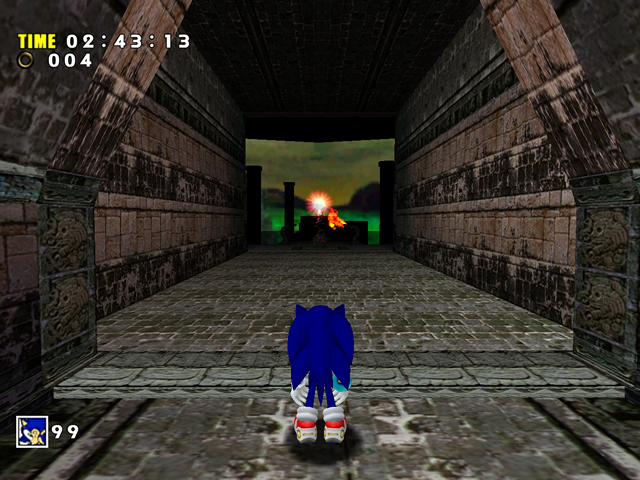 To restore the proper look of these lights I had to edit the texture and revert to the original Dreamcast model for the light. 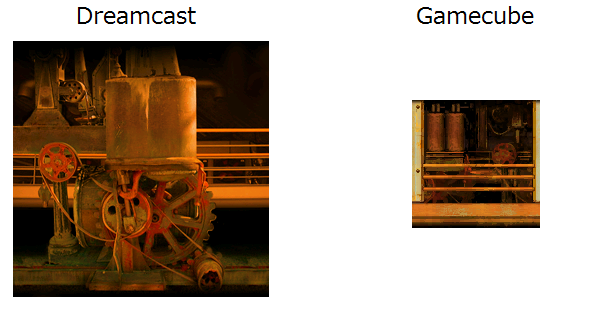 *Not a video but you can tell it’s the same kind of “effect”. 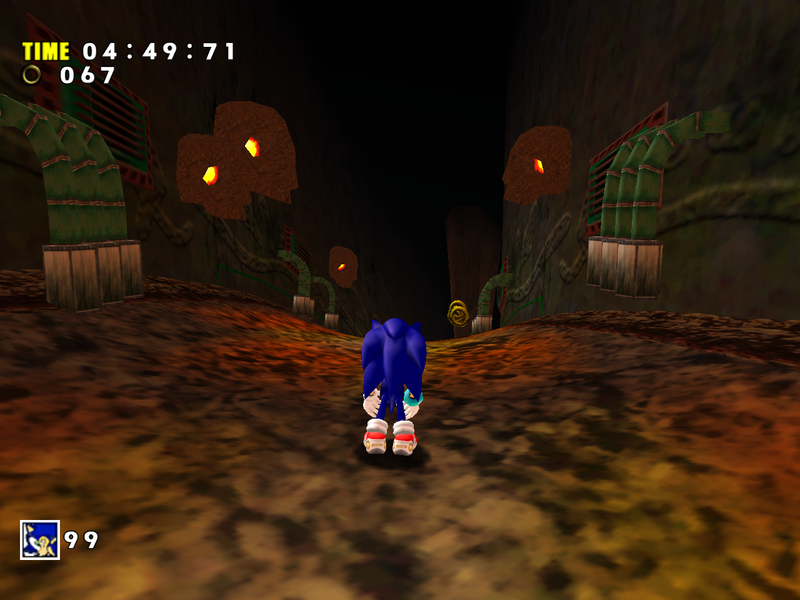 The SADX redesign of Final Egg doesn’t convey the original level’s atmosphere, nor does it hold up well on its own. Degraded lighting and fog settings, removed special effects and lower quality textures make it one of the worst downgraded levels in SADX. 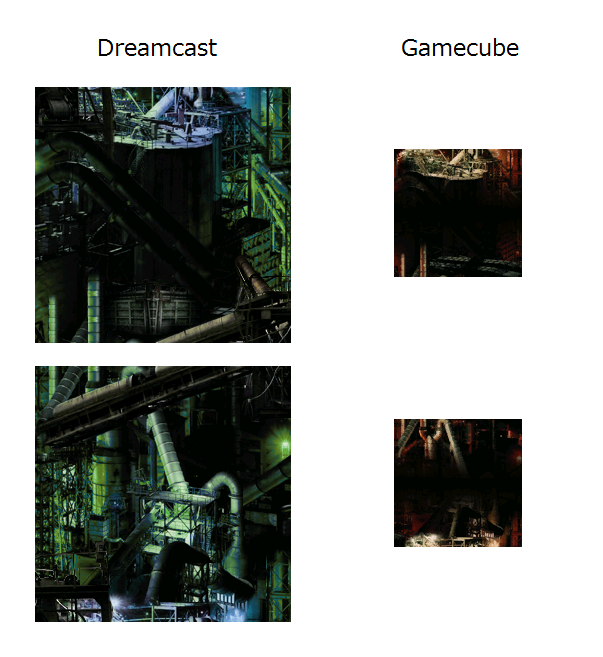 None of the downgrades discussed above are justifiable in a port, especially in a port that is advertised as the better version of the game. 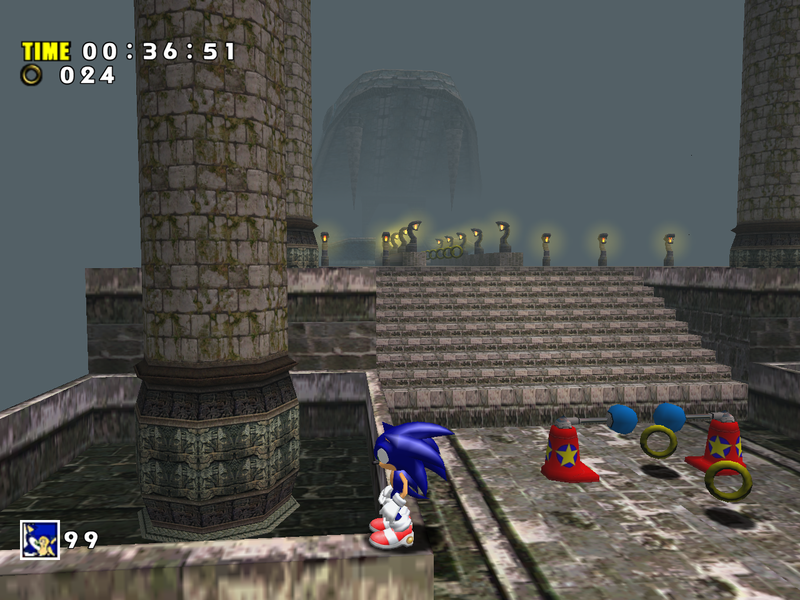 Thankfully on PC this level can be reverted to the original state with the Dreamcast Conversion mod, and its lighting can be brought back with Lantern Engine mod. 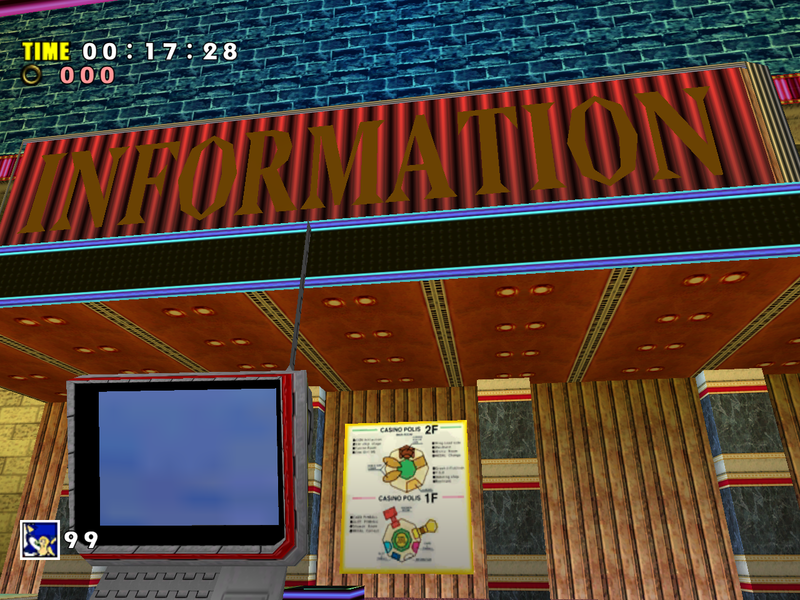 Find out more in the section dedicated to fixing the PC port. 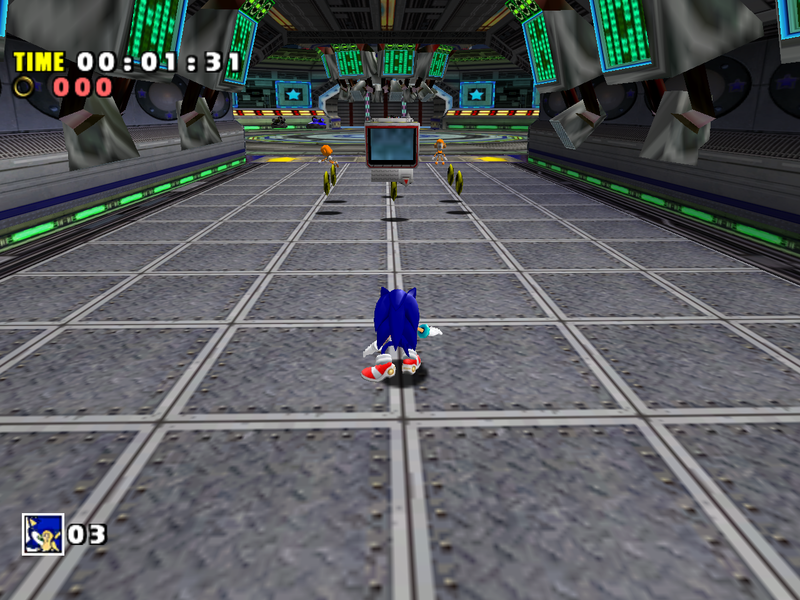 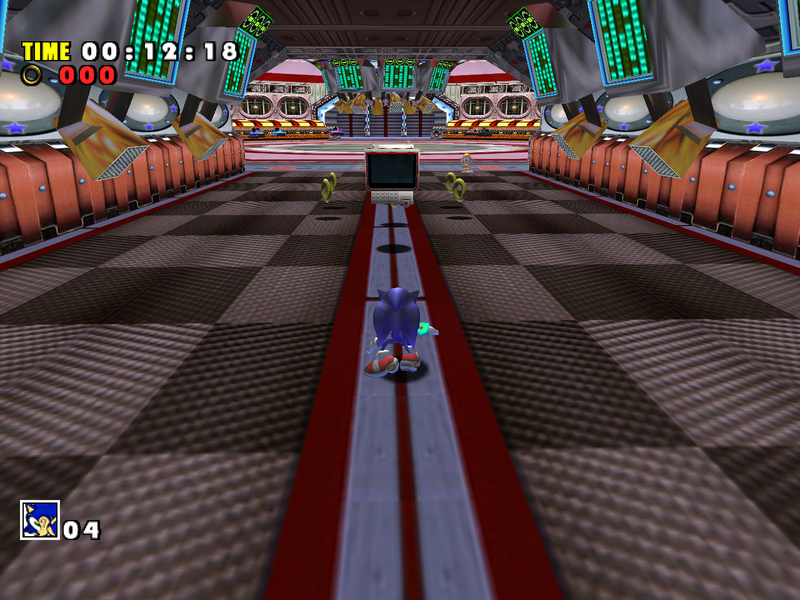 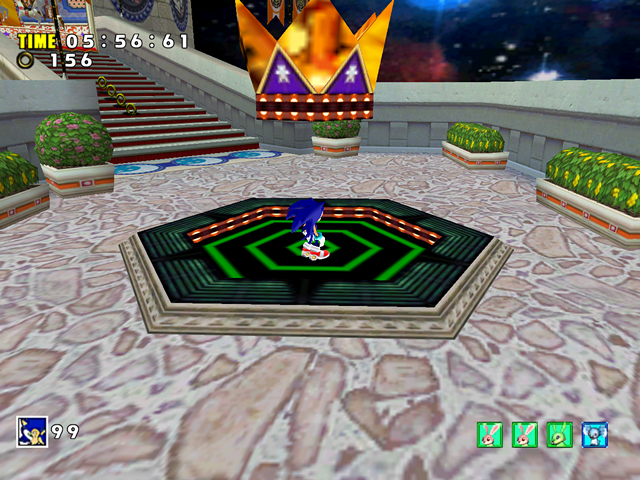 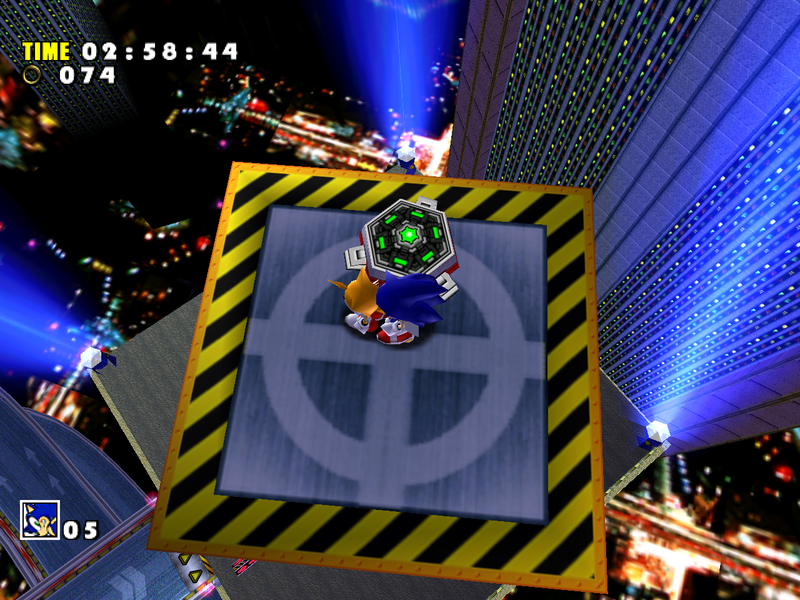 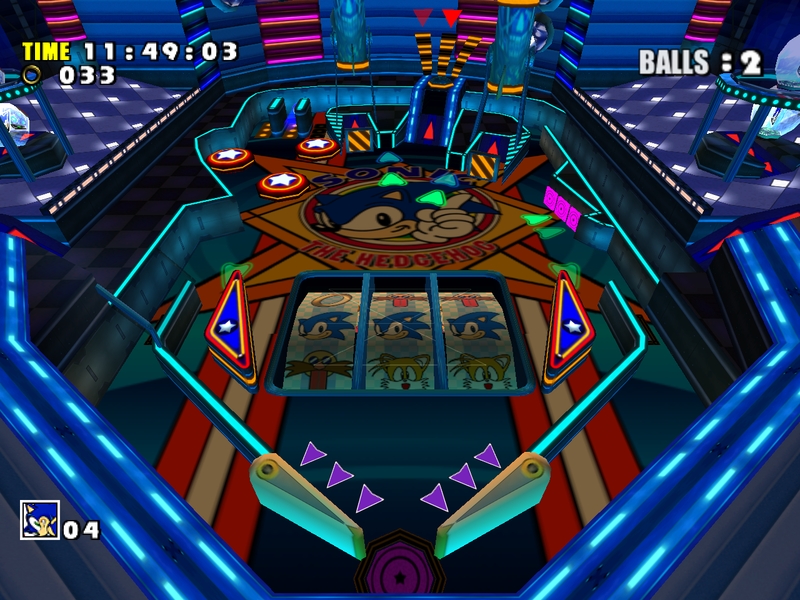 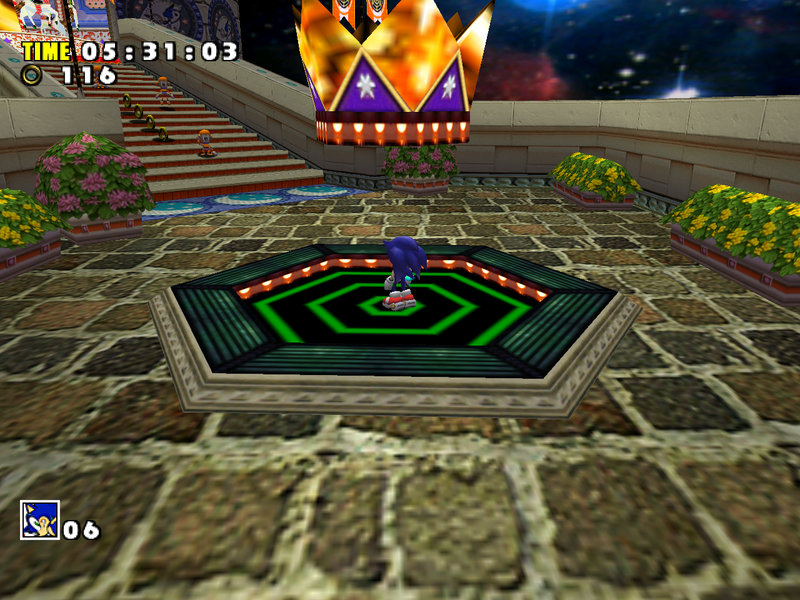 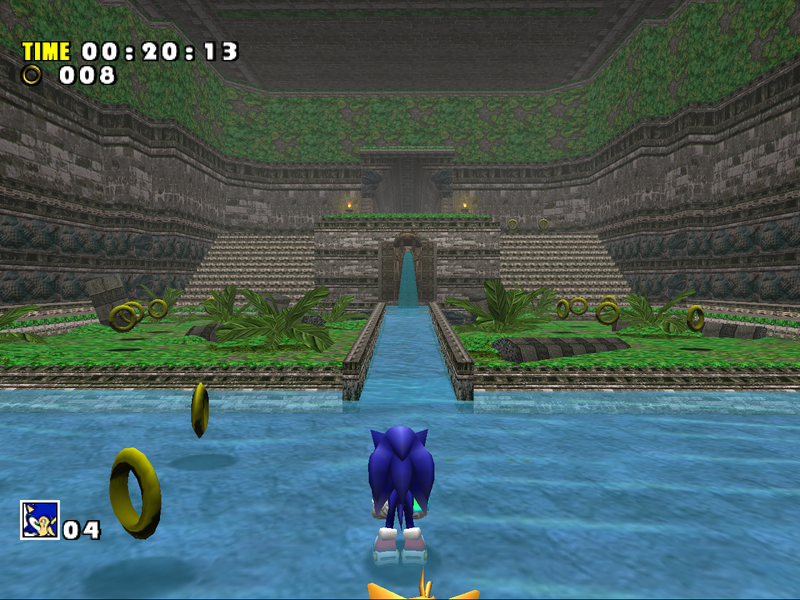 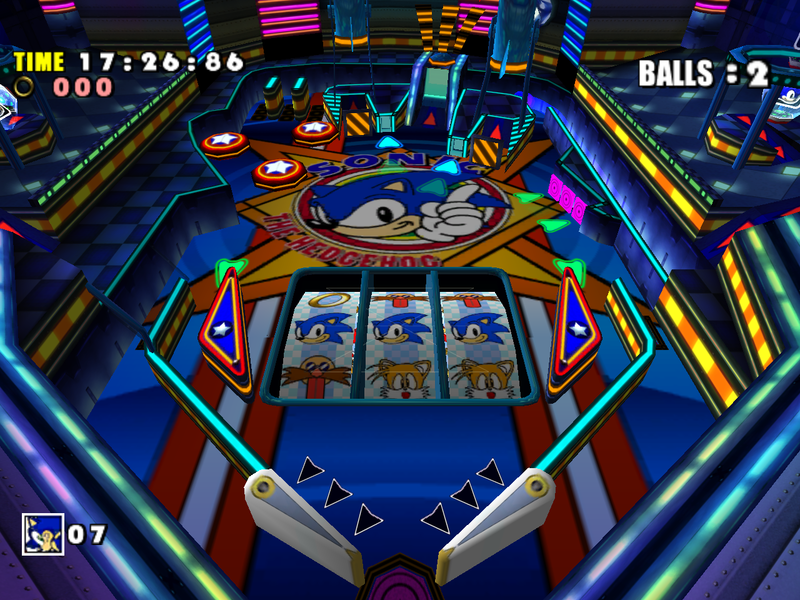 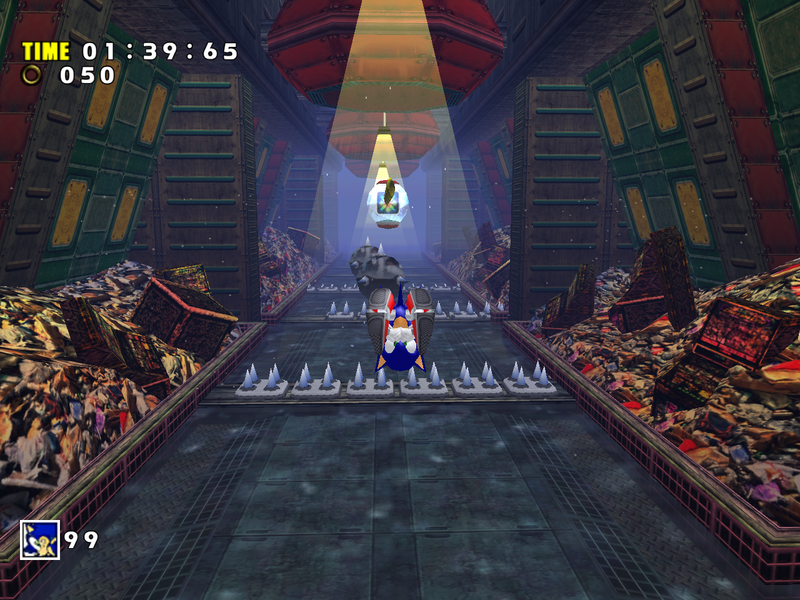 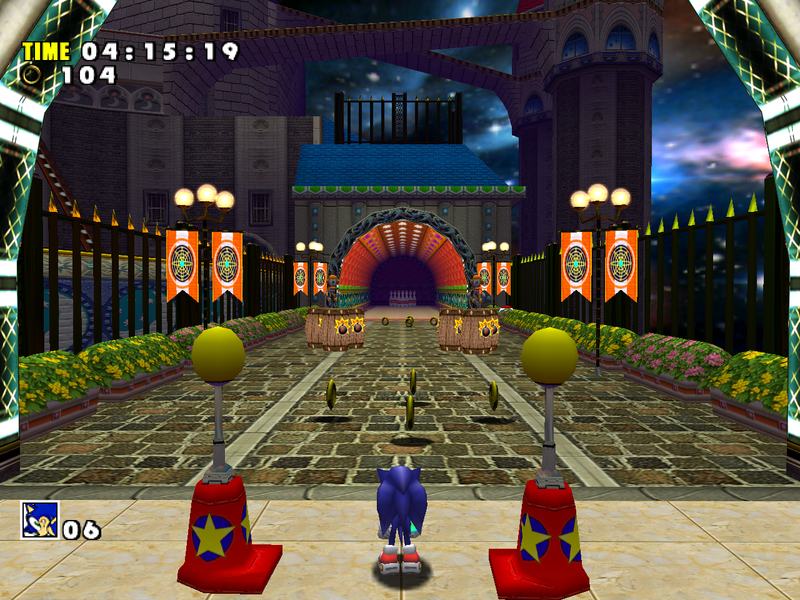 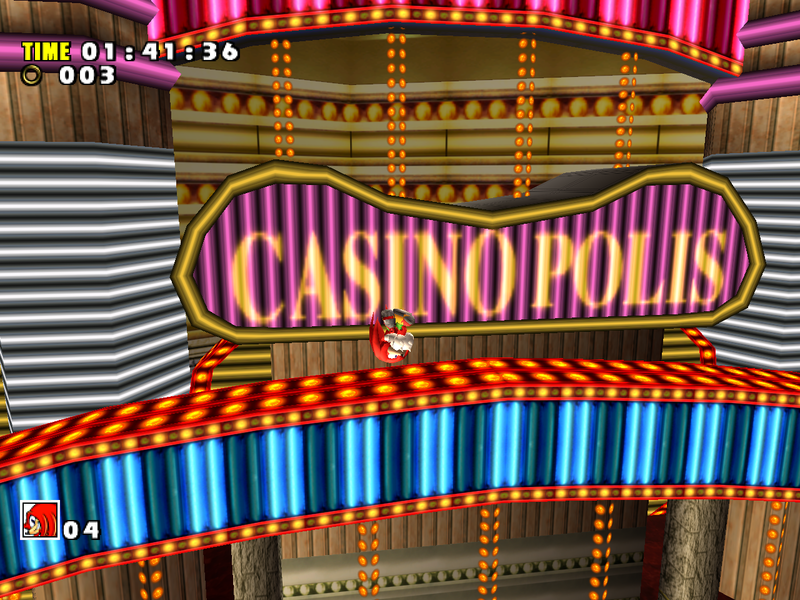 On a surface level, Casinopolis doesn’t seem to have downgrades in SADX. There is some lighting detail added around the level, and some areas have new textures. 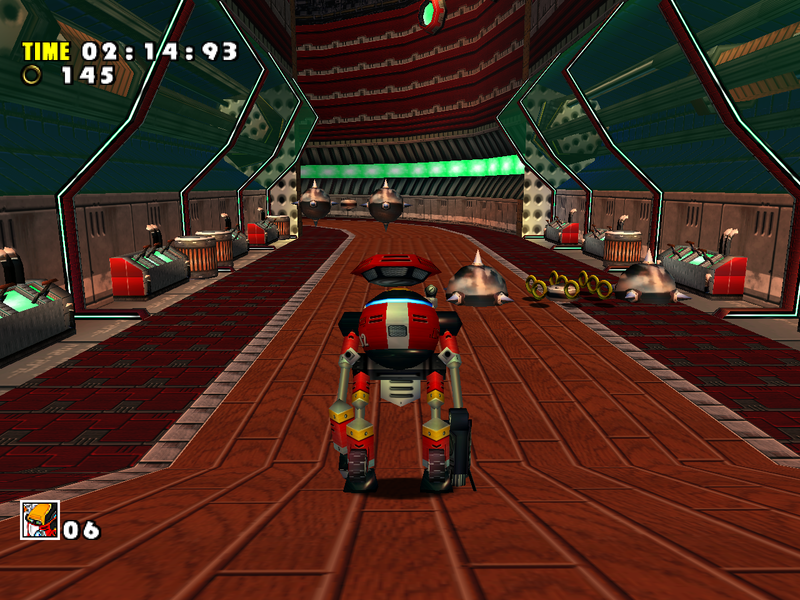 It might be tempting to call this level an improvement over the Dreamcast original. 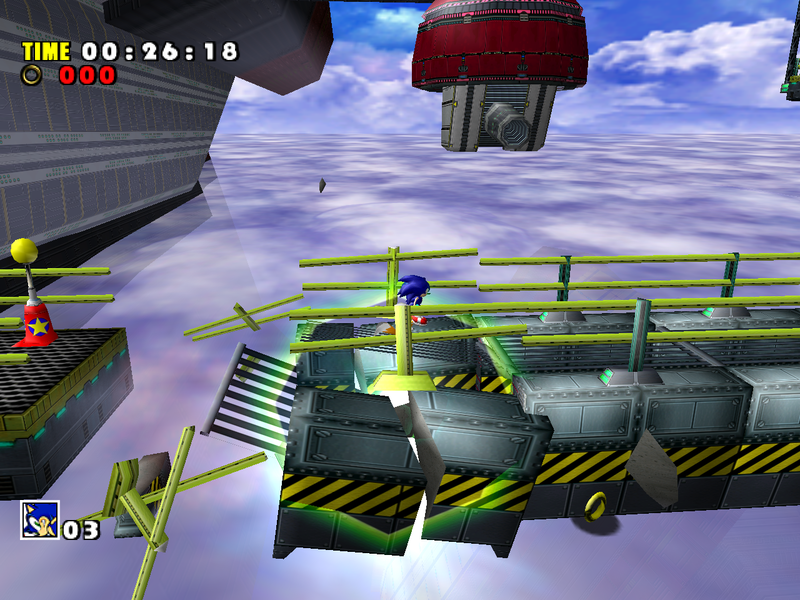 However, like with other levels in SADX, the improvements in this level are somewhat superficial, and many aspects of the level are broken in the ports, intentionally or otherwise. 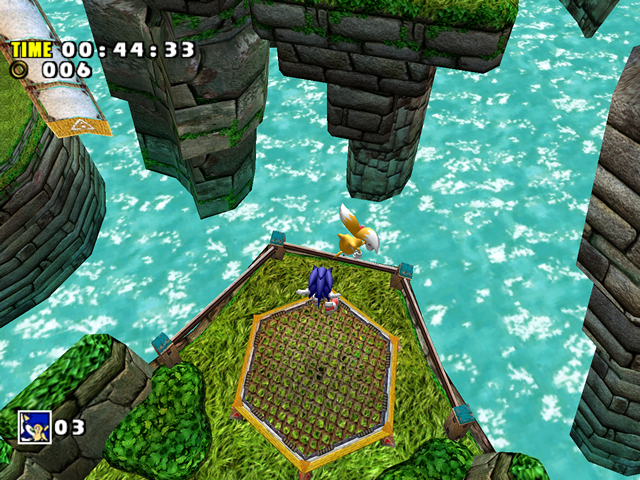 The lack of smoothness in the PC port is caused by two factors. 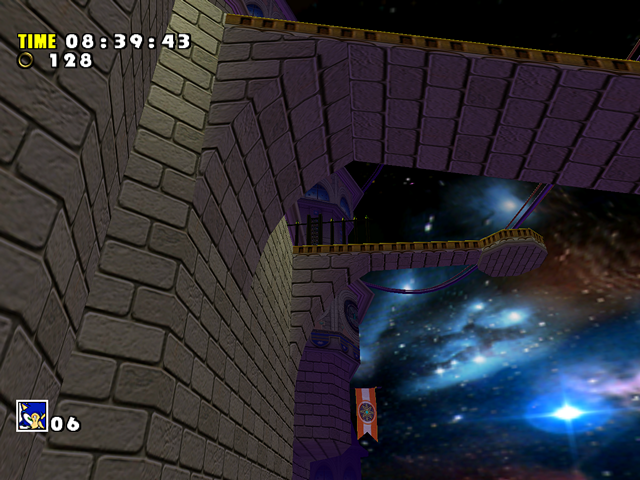 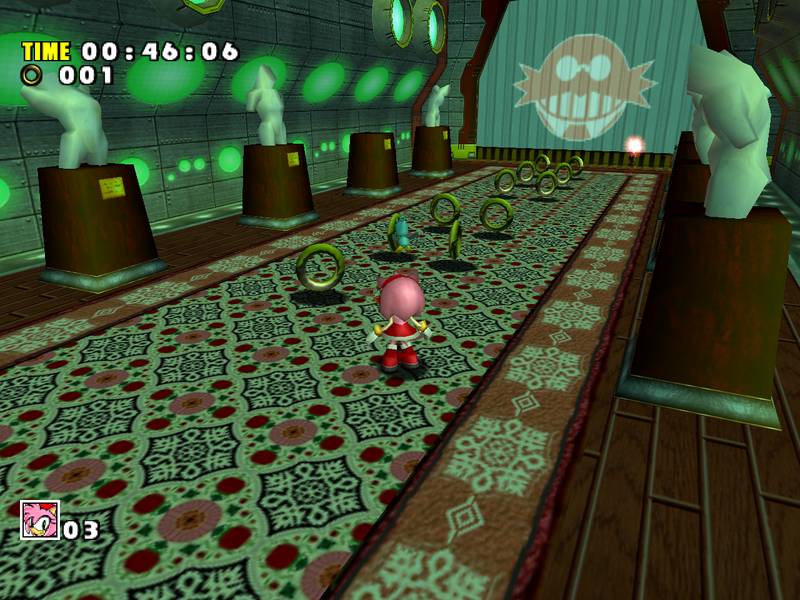 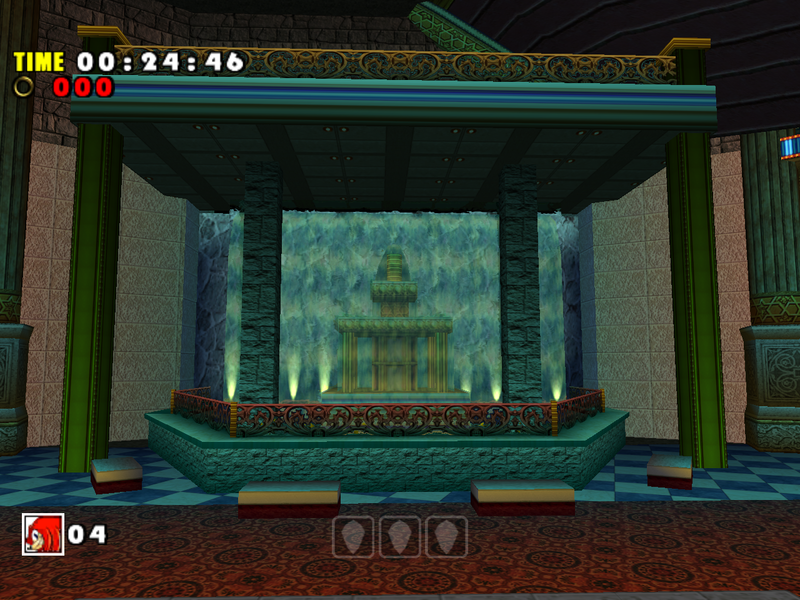 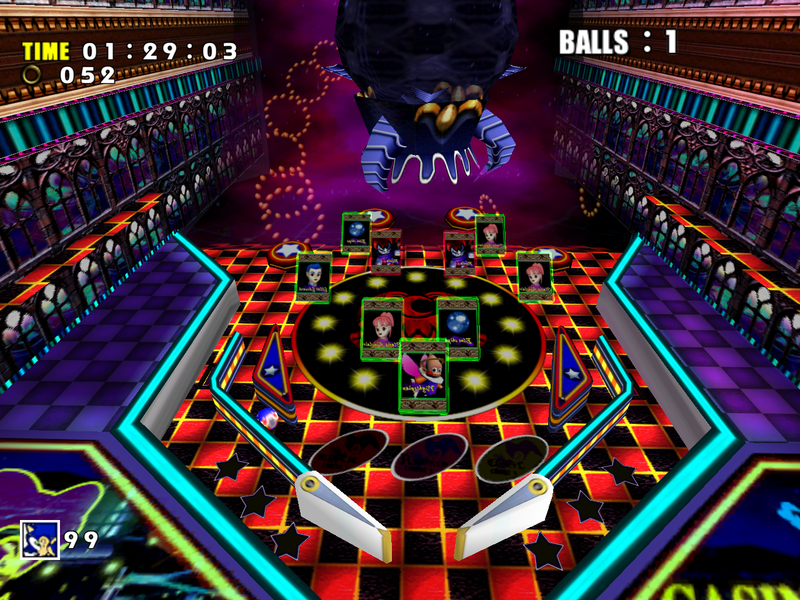 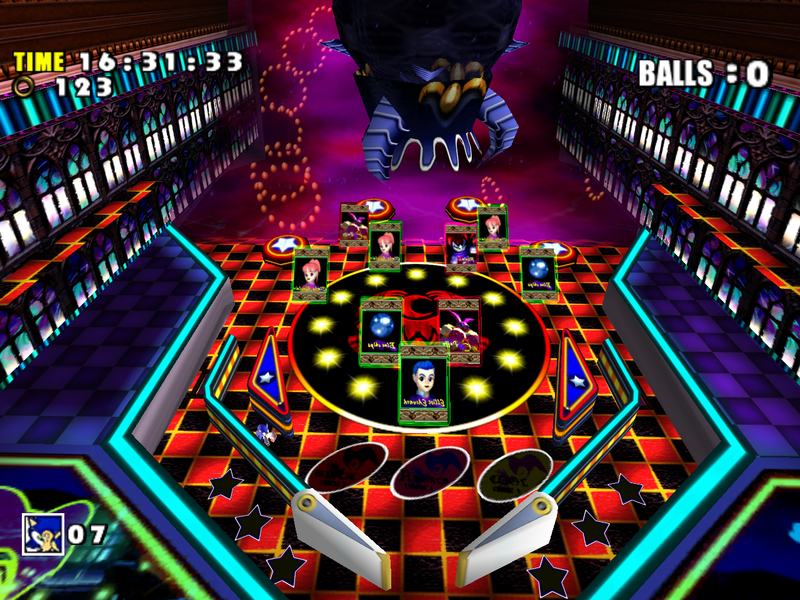 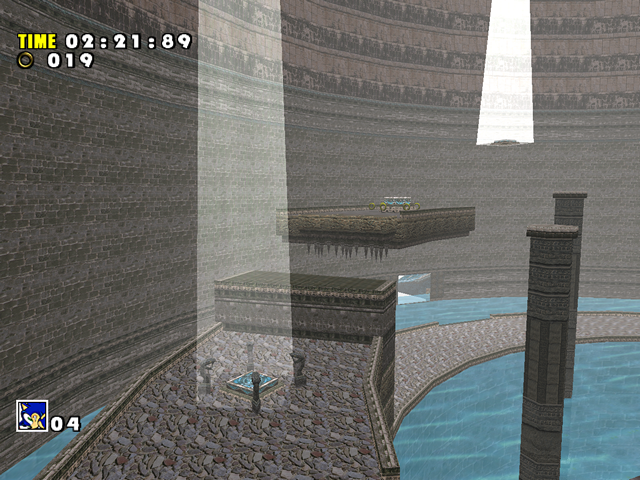 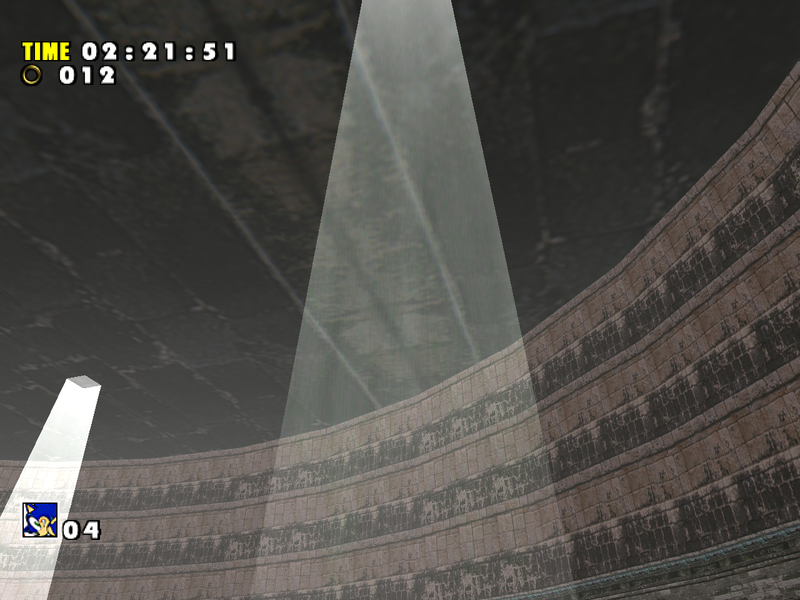 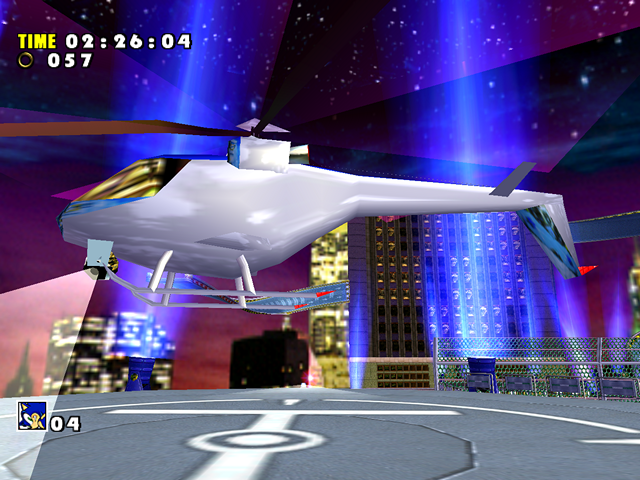 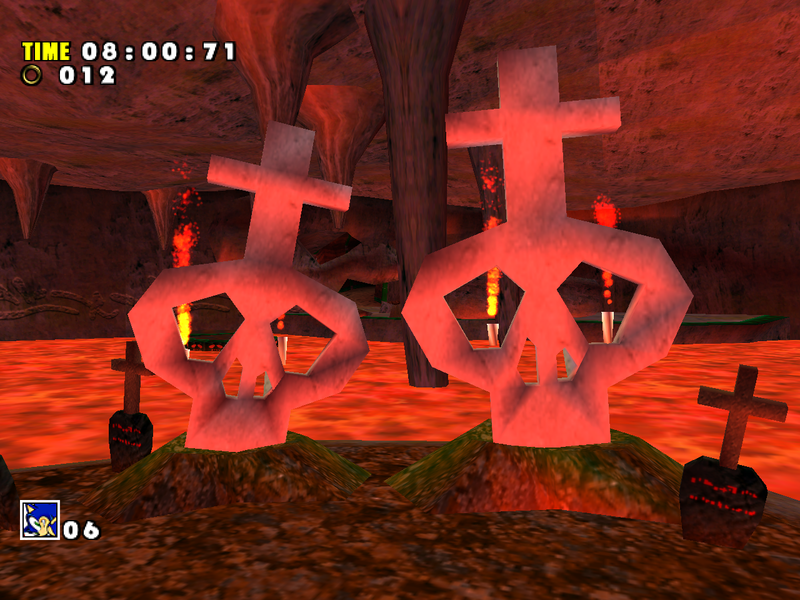 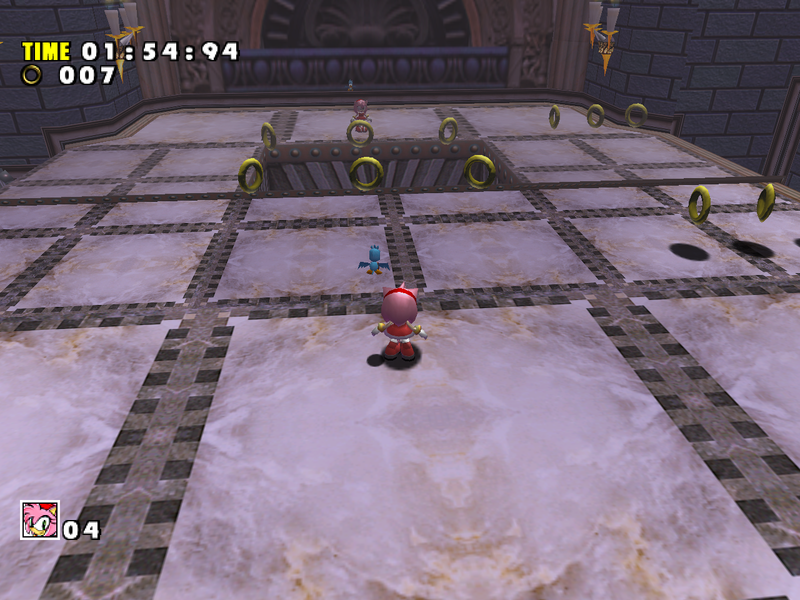 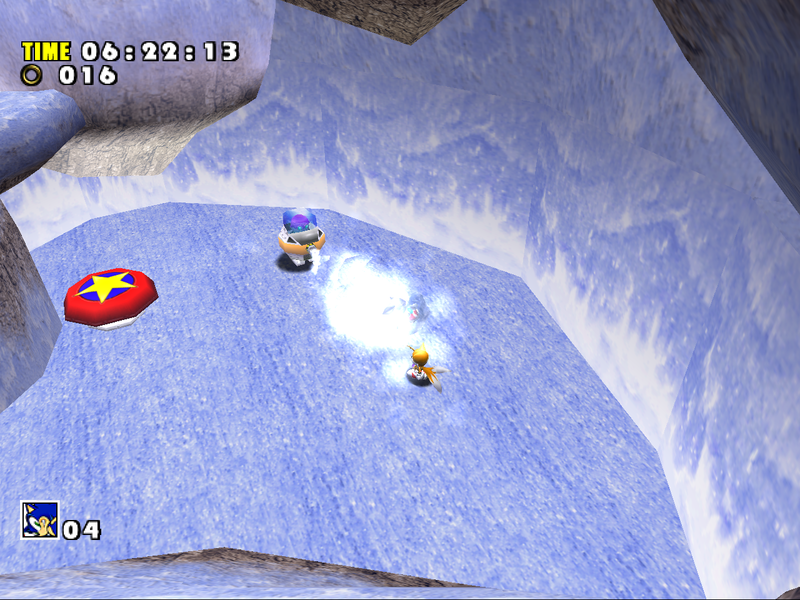 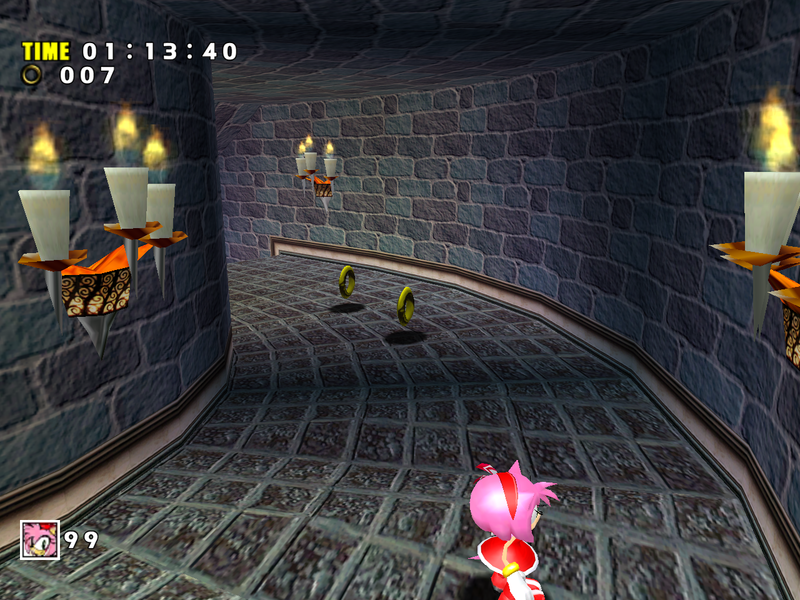 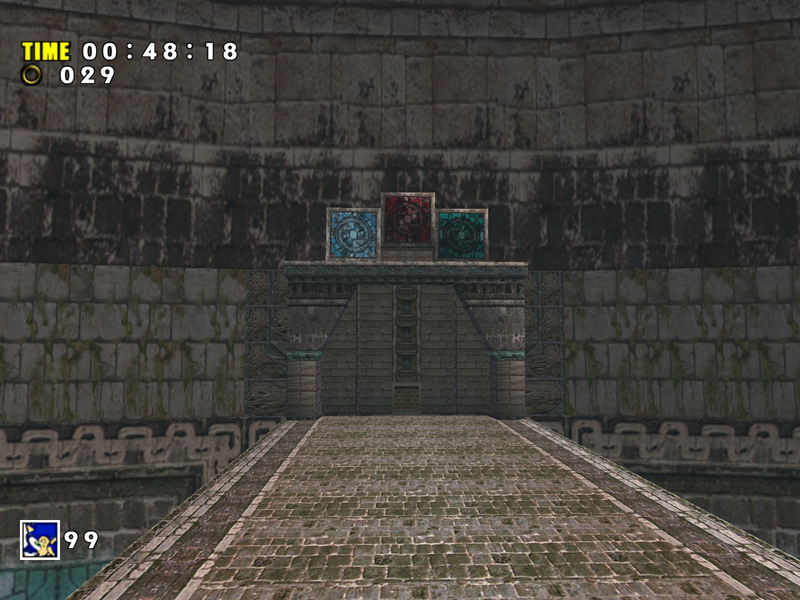 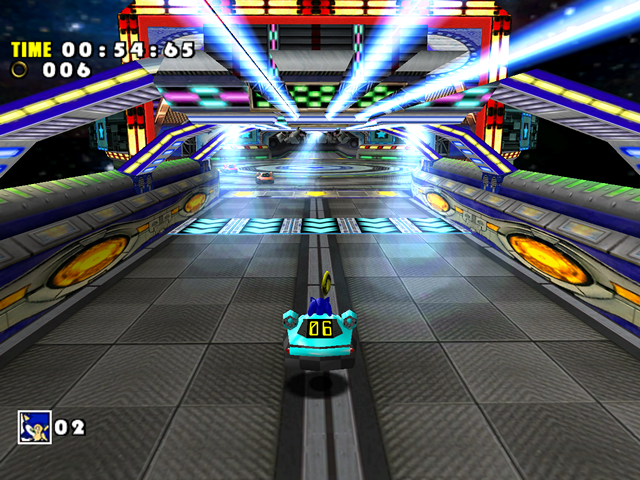 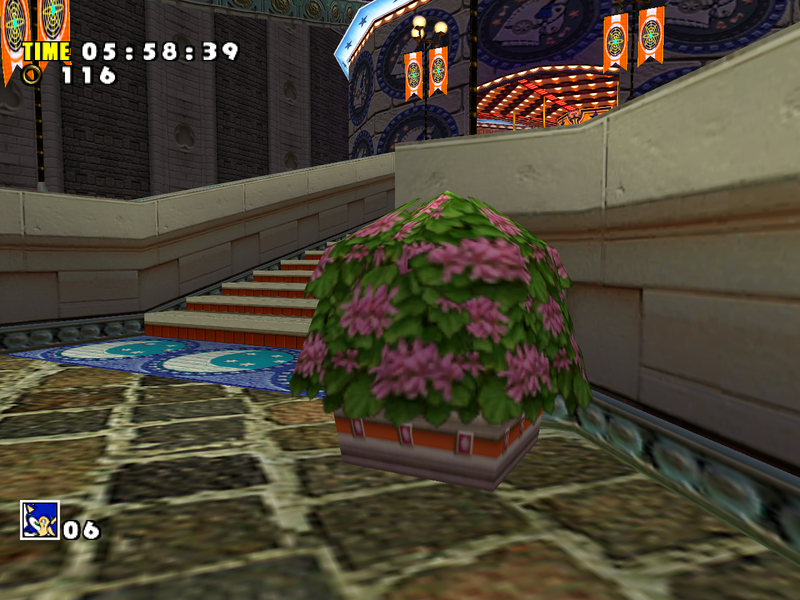 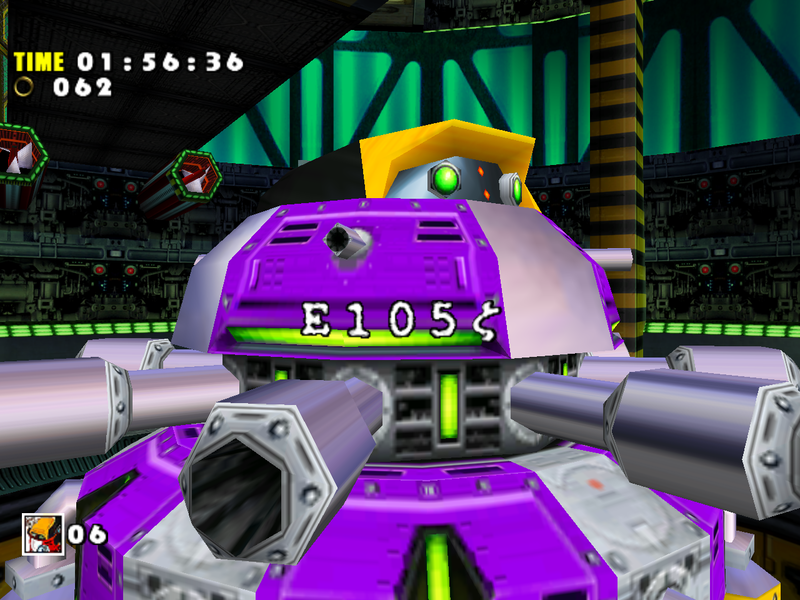 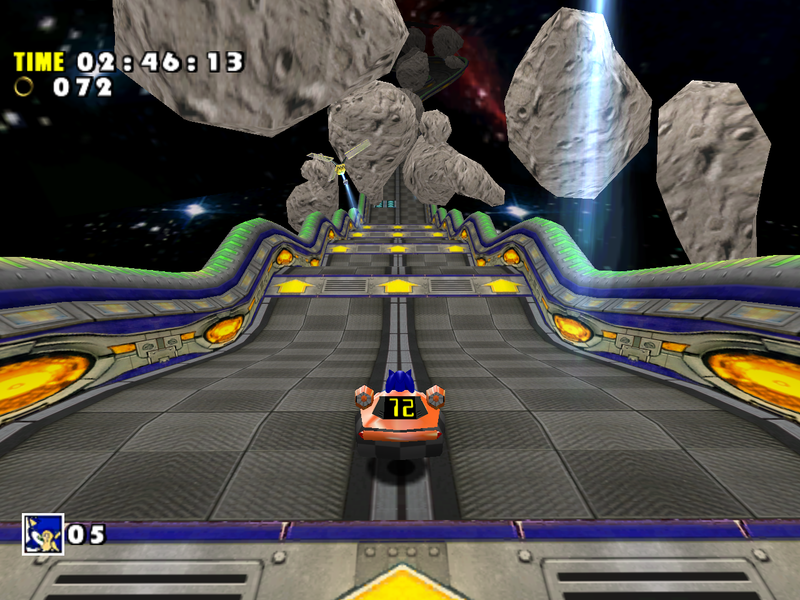 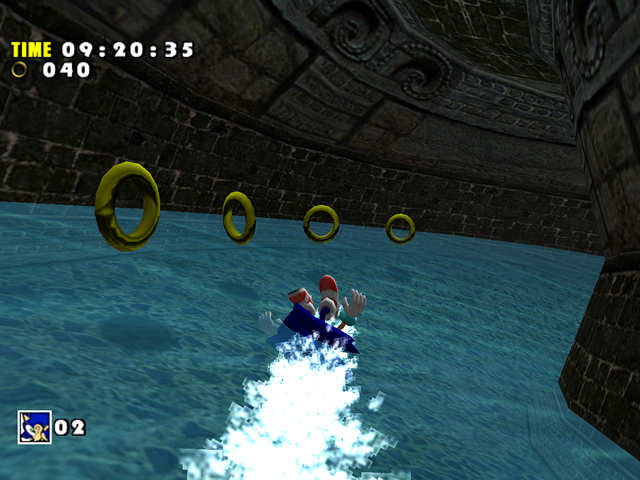 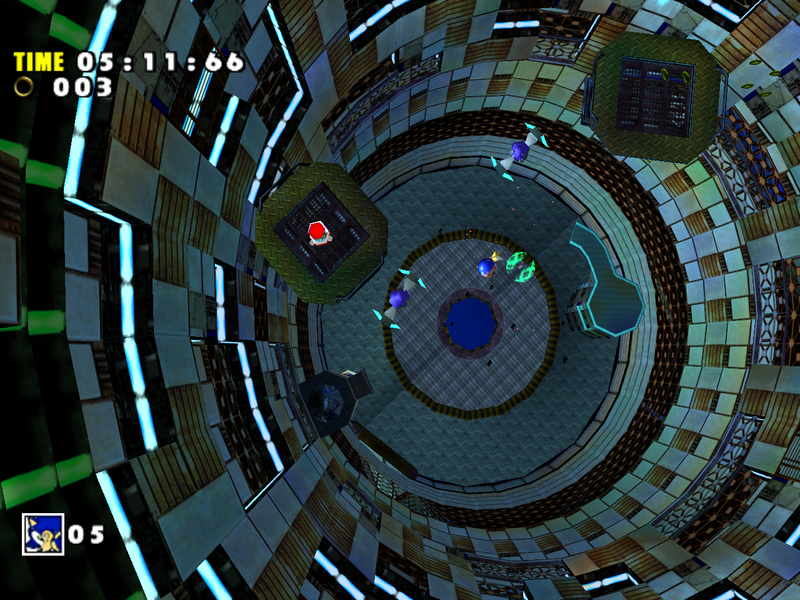 The Gamecube version uses per-pixel lighting for characters, while the Dreamcast uses per-vertex lighting. 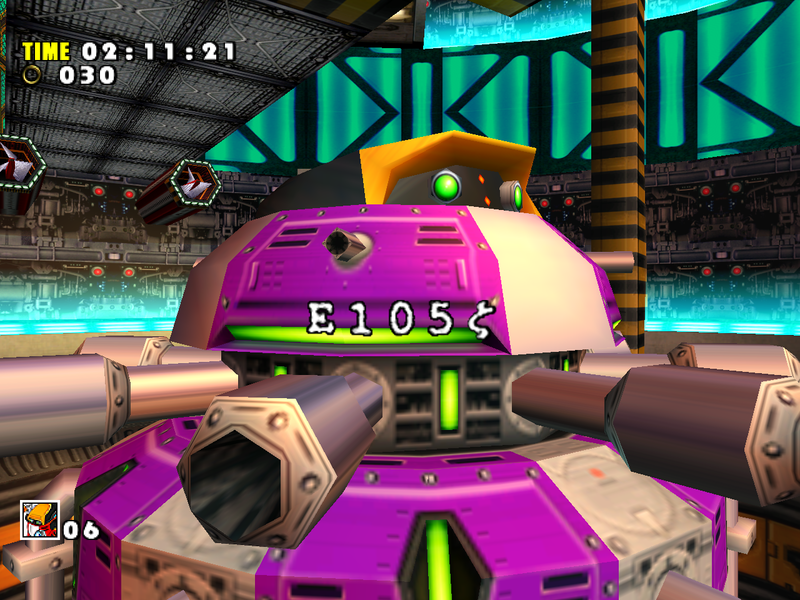 The PC version switches back to per-vertex lighting which combined with exceedingly high specular values on character models makes it accentuate the polygons stronger. This results in jerky light transitions. 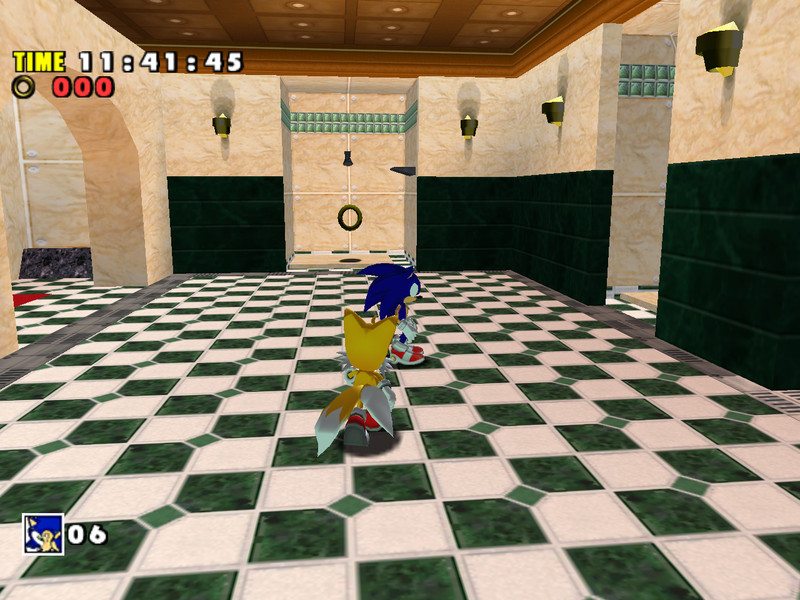 *From the Lighting section you may remember that the PC version ignores vertex colors on objects. 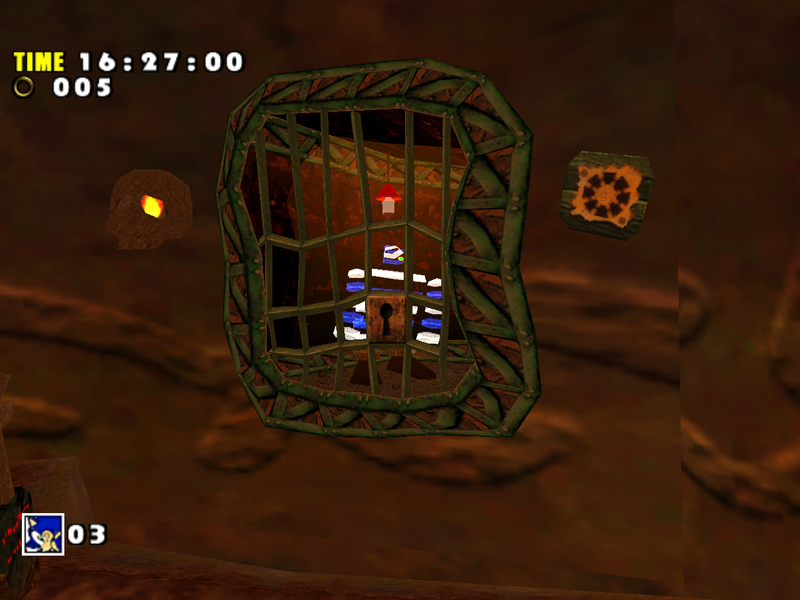 The above comparison is one instance where the PC version’s lighting is more broken than on the Gamecube, but the problem with ignoring vertex colors on anything that isn’t part of the level model persists across the entire game. 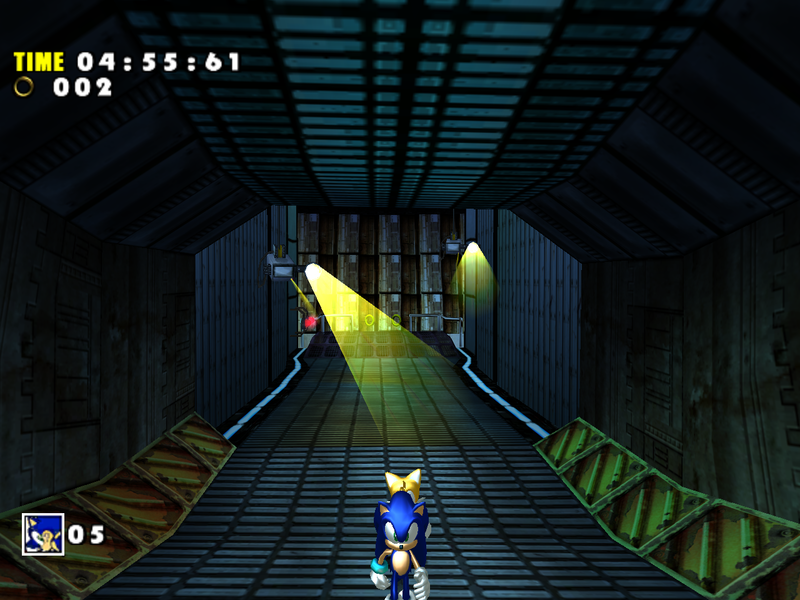 The problem was never fixed in later ports, so the Gamecube version is effectively the only port where the (heavily downgraded) SADX lighting system is fully functional. 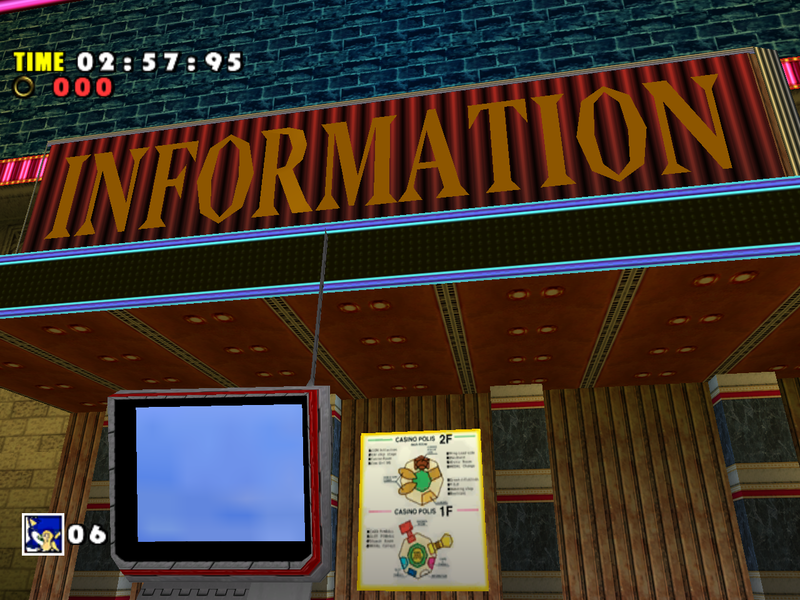 The letters on the “Information” billboard still have the environment mapping effect, but the textures and/or UVs were adjusted to make it look like a solid color, which made them look less colorful. 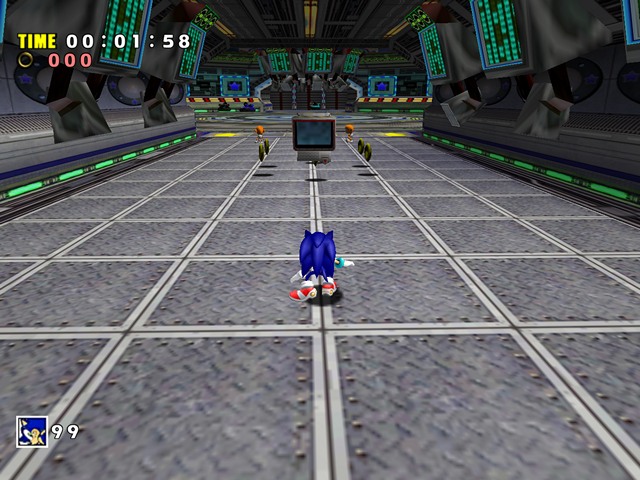 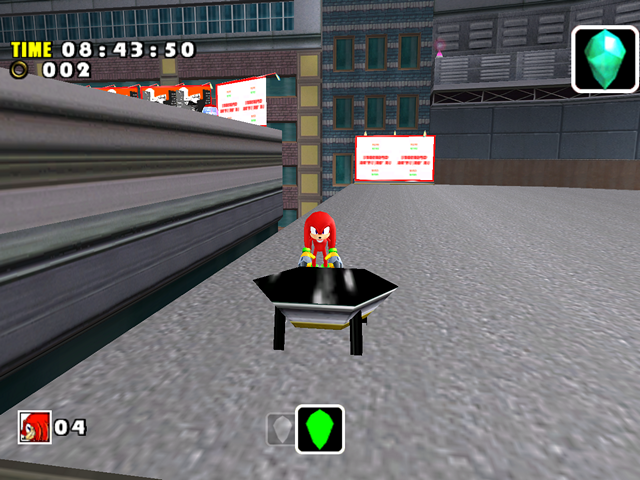 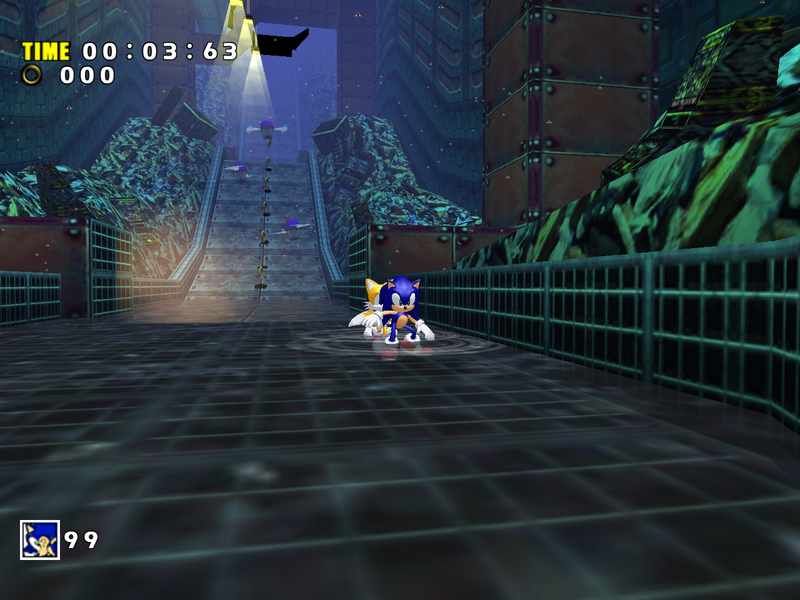 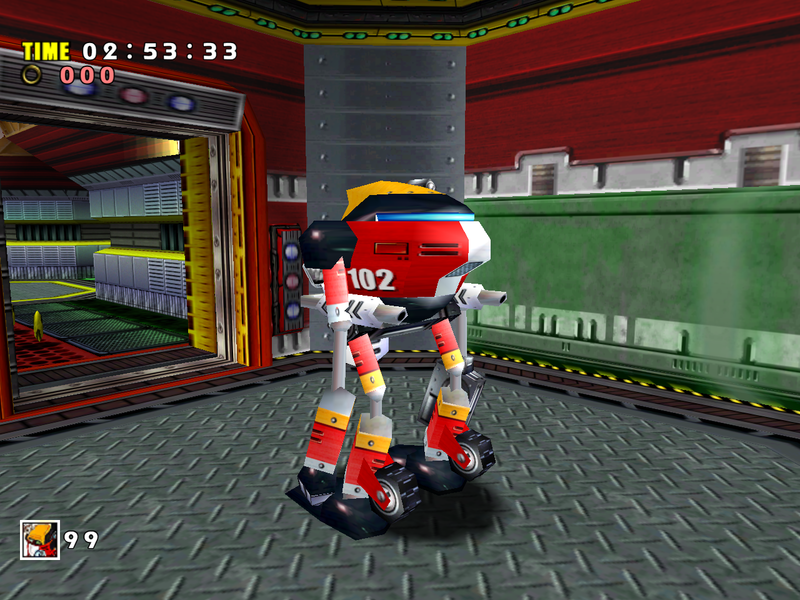 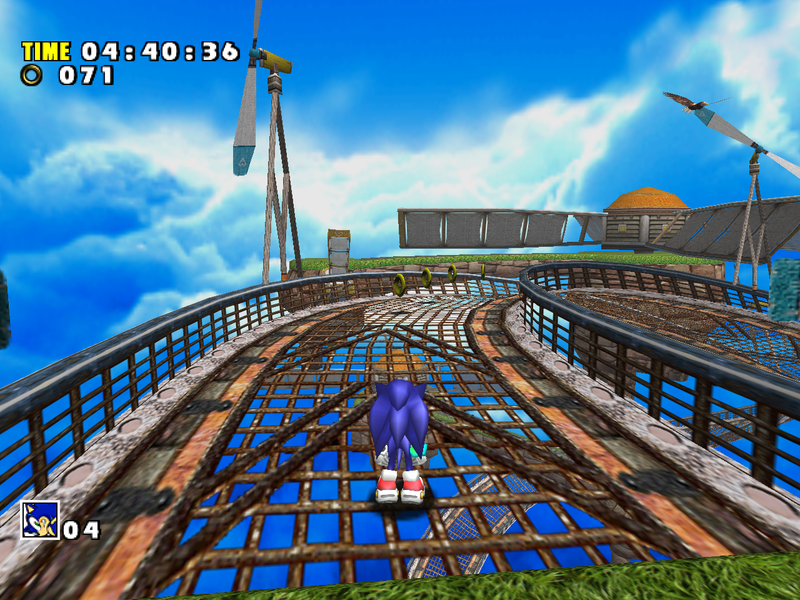 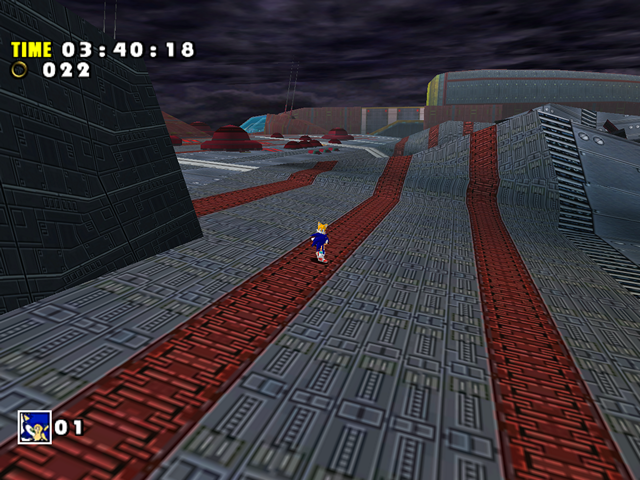 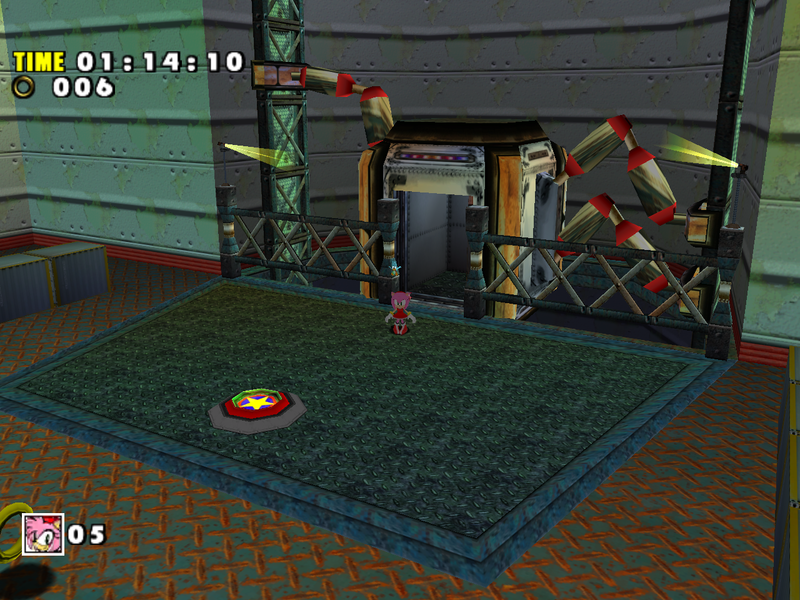 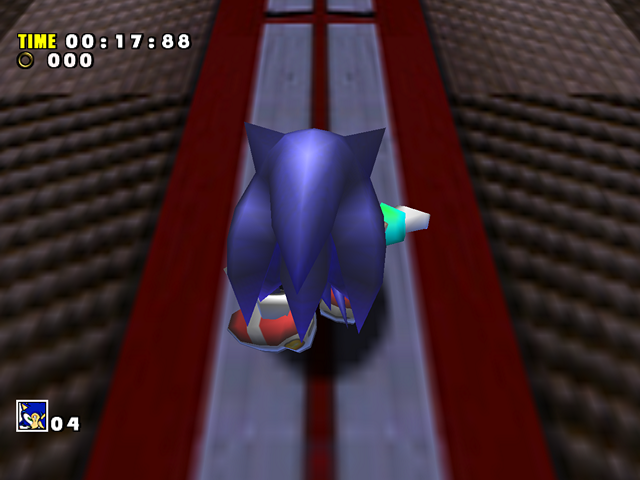 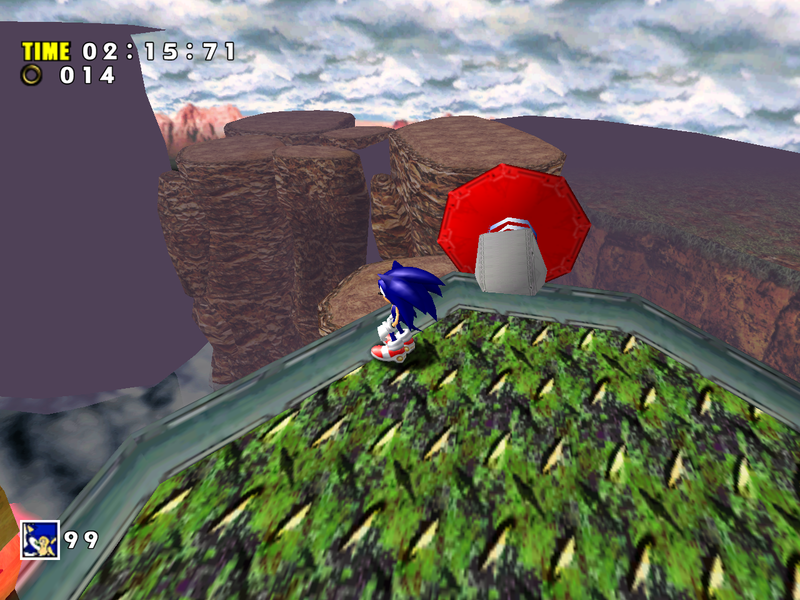 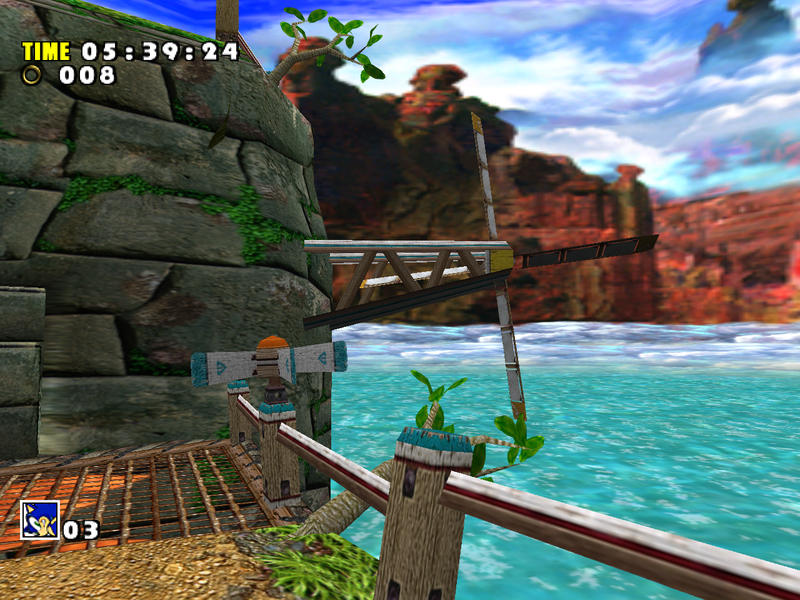 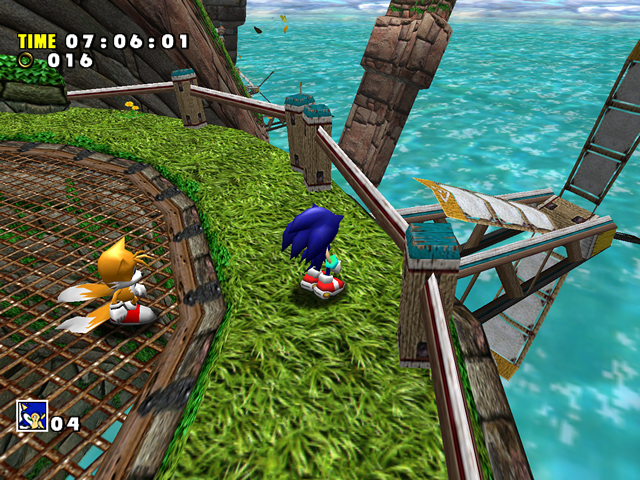 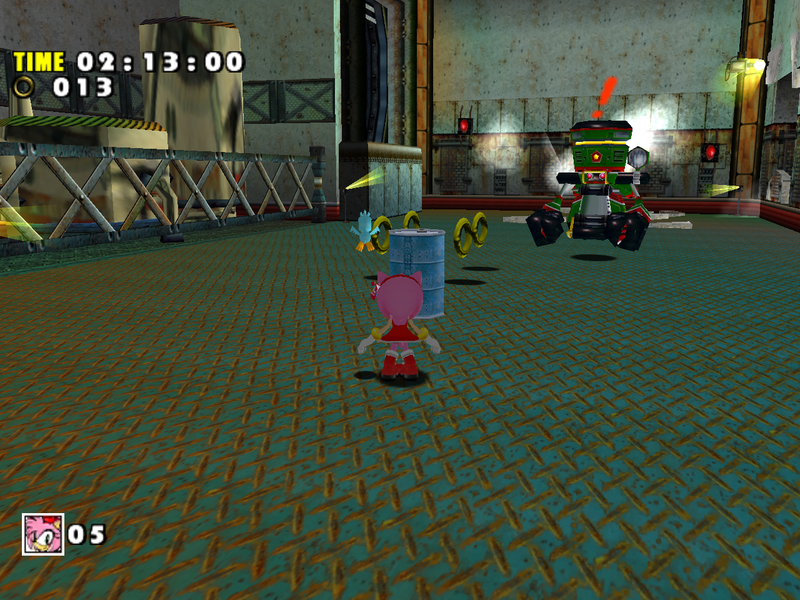 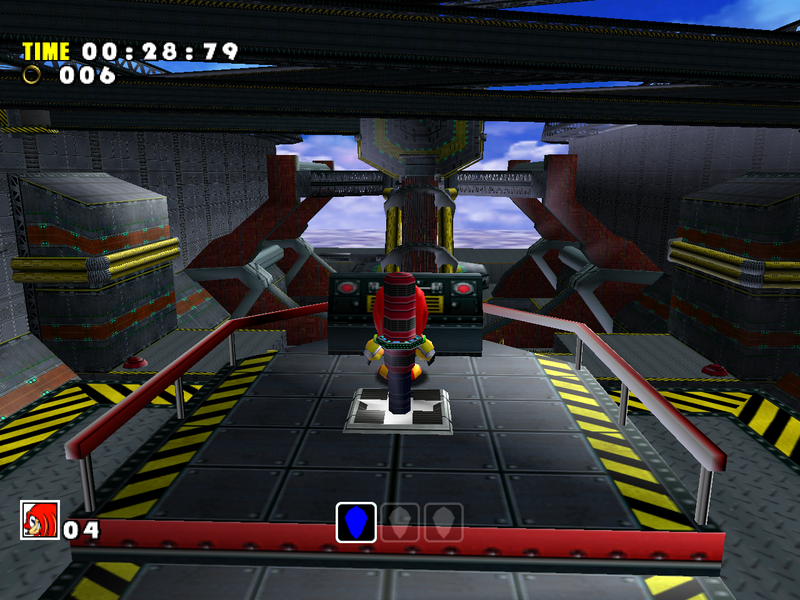 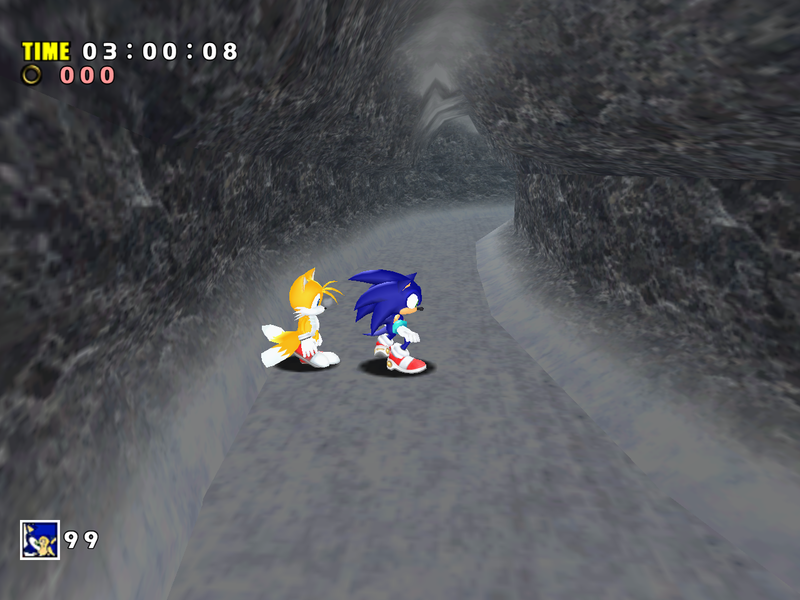 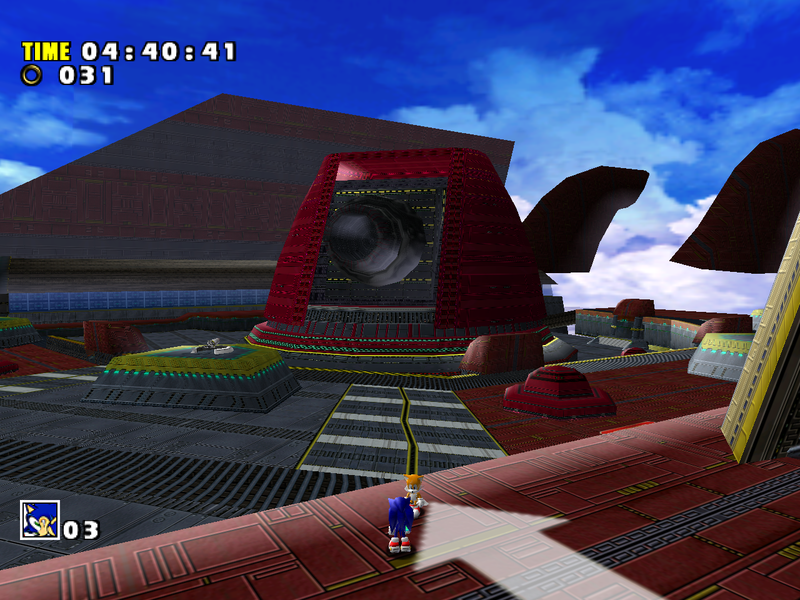 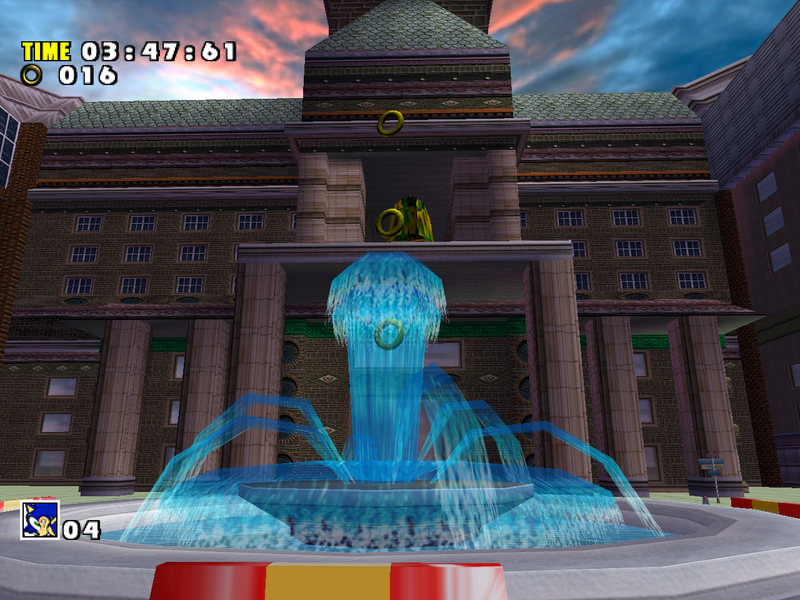 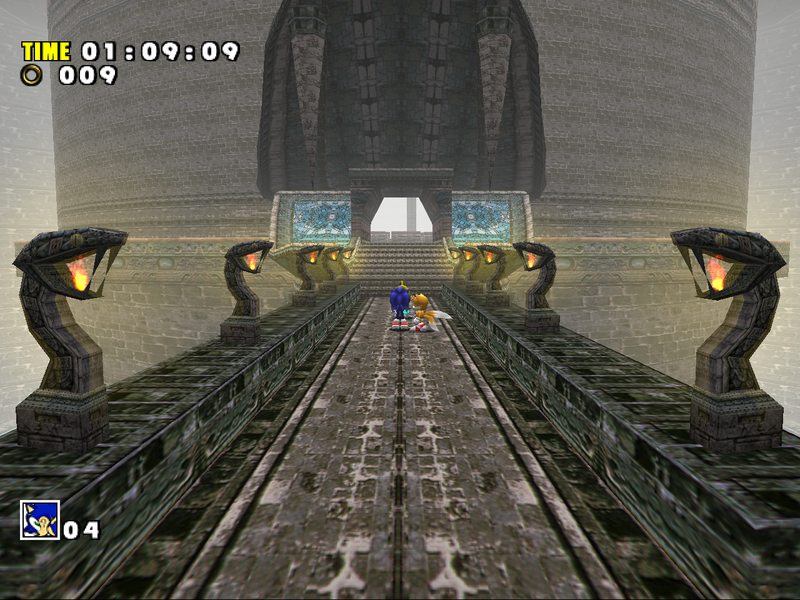 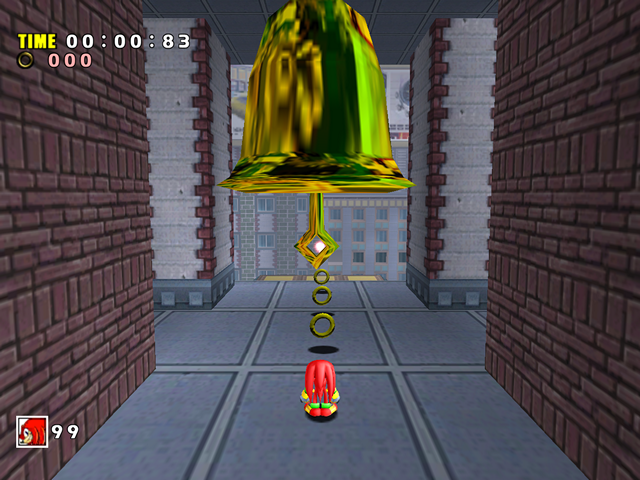 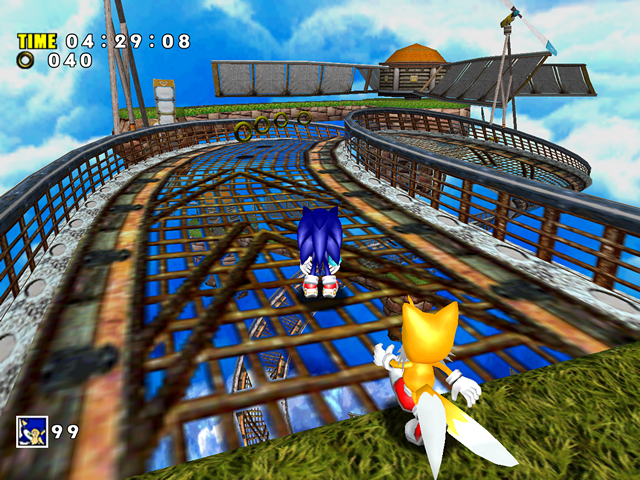 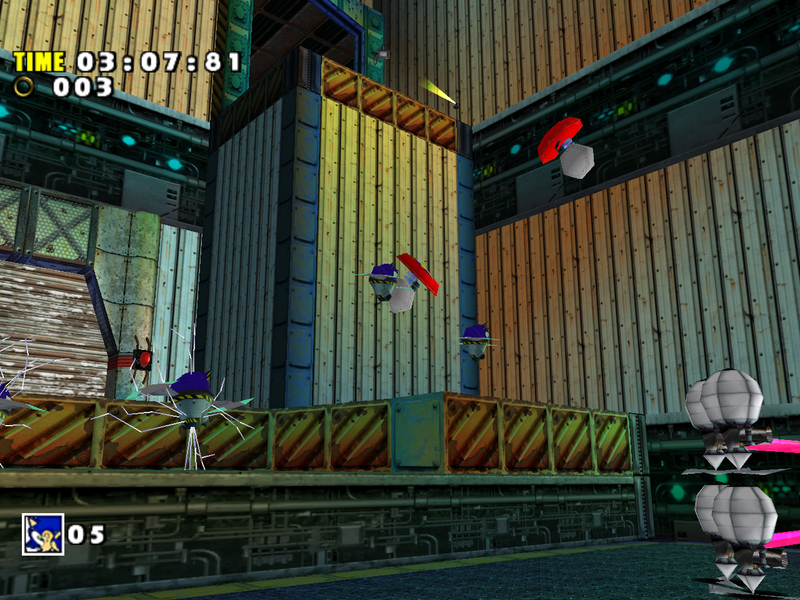 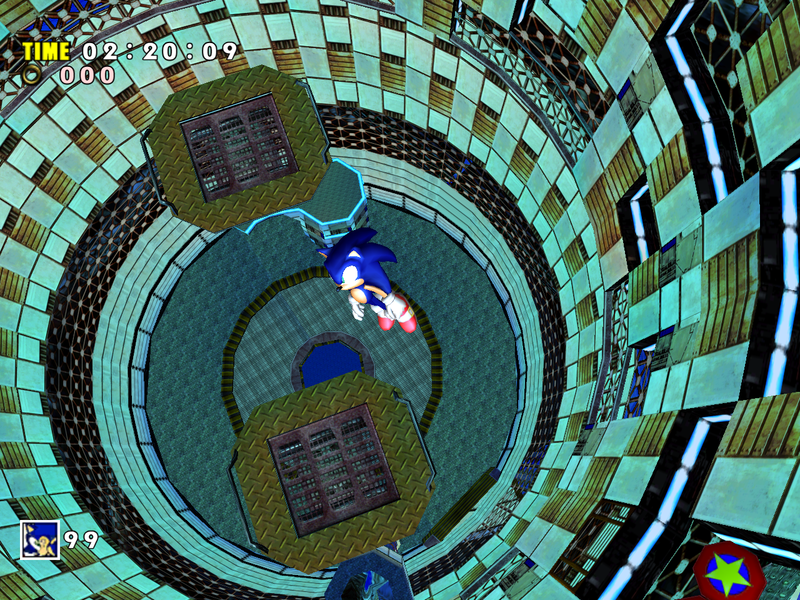 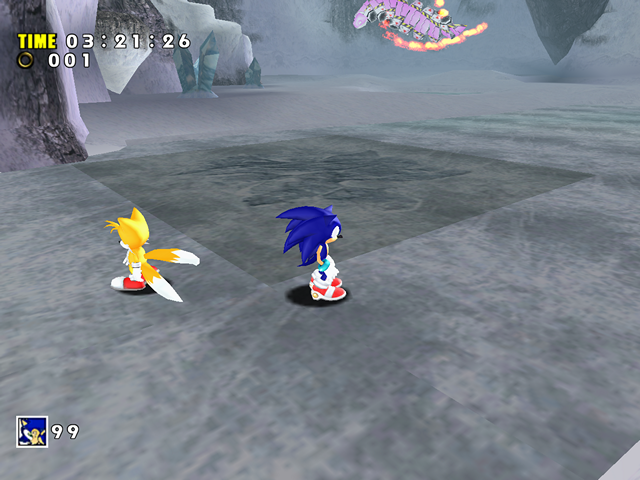 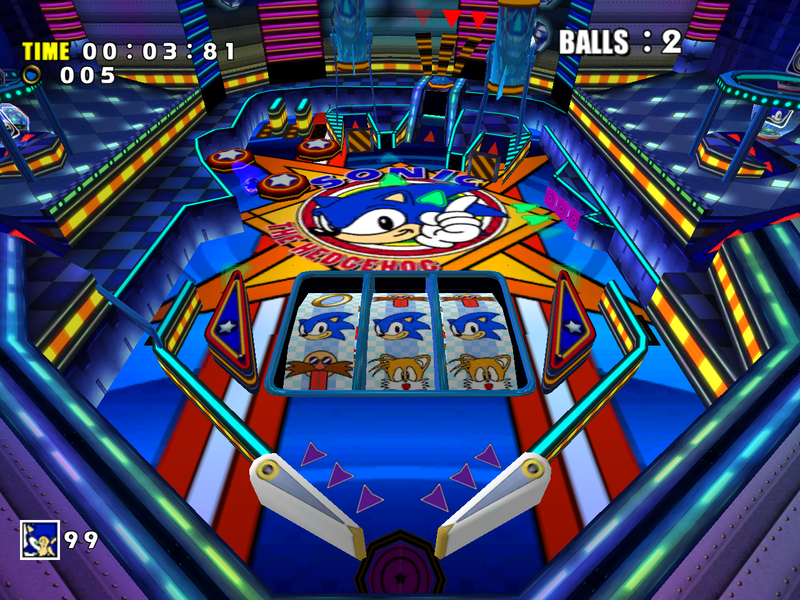 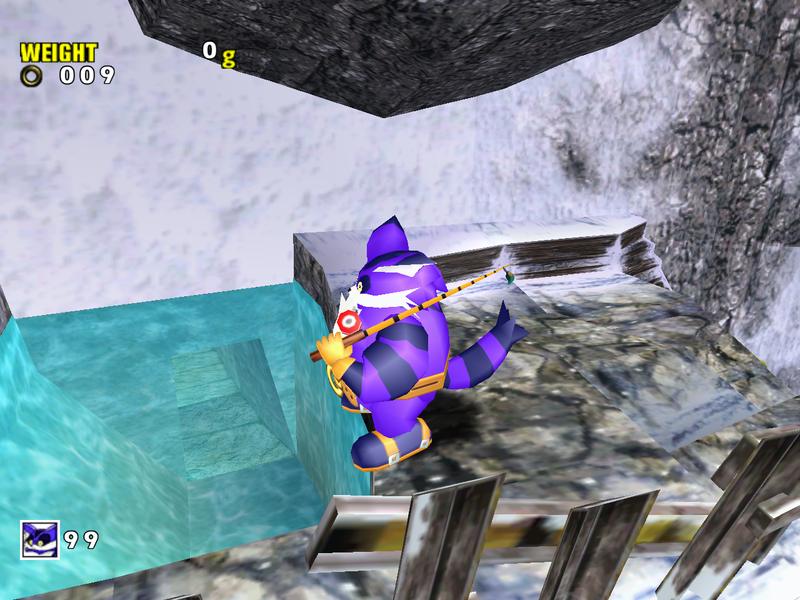 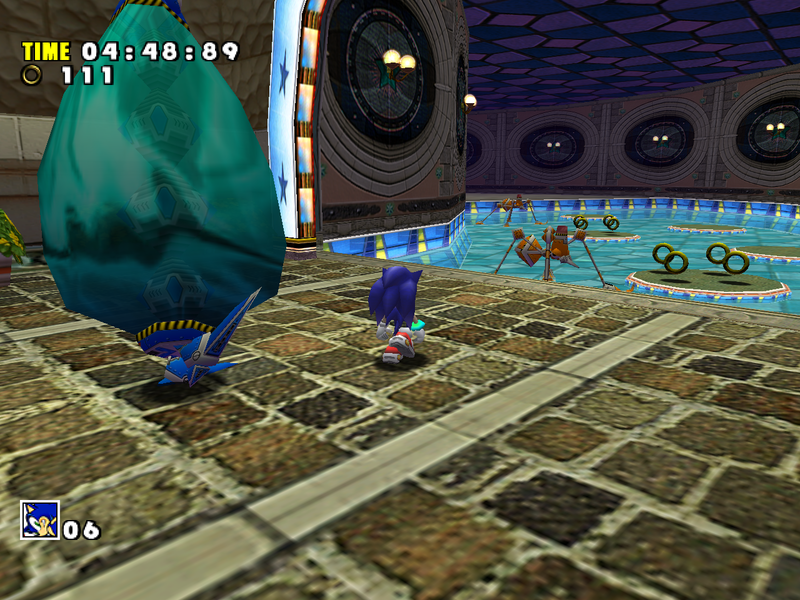 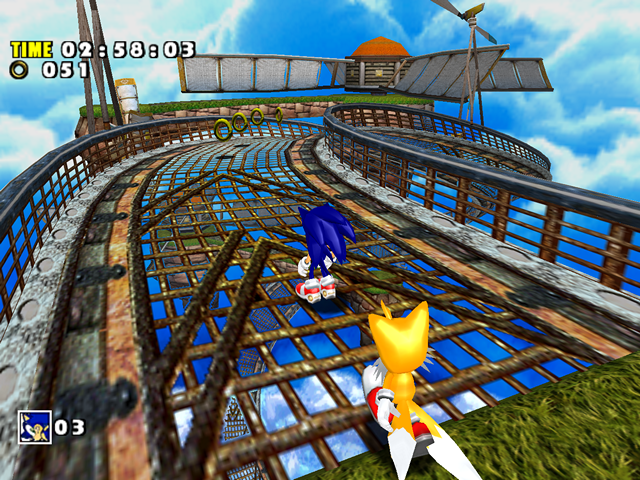 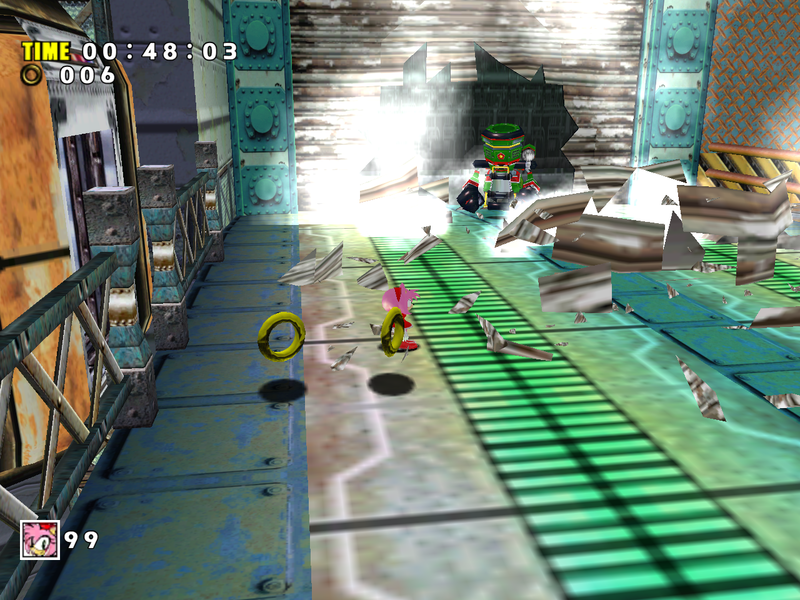 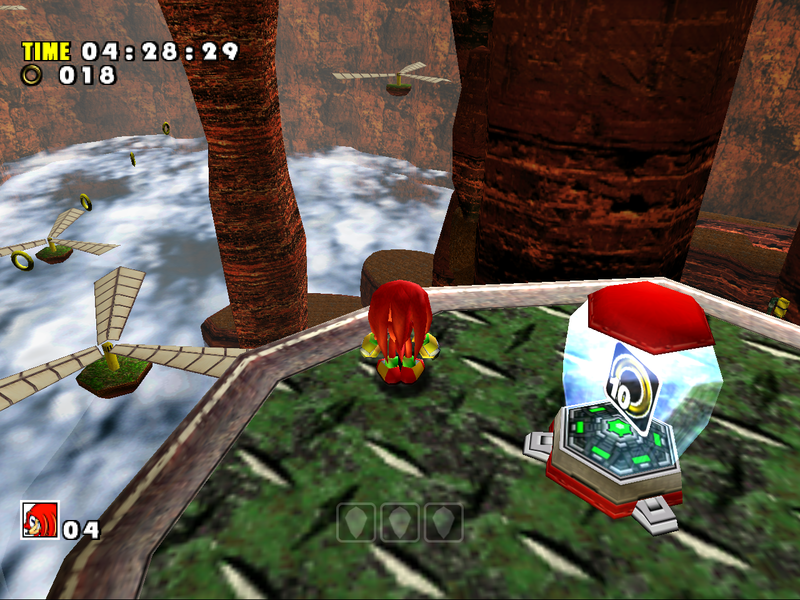 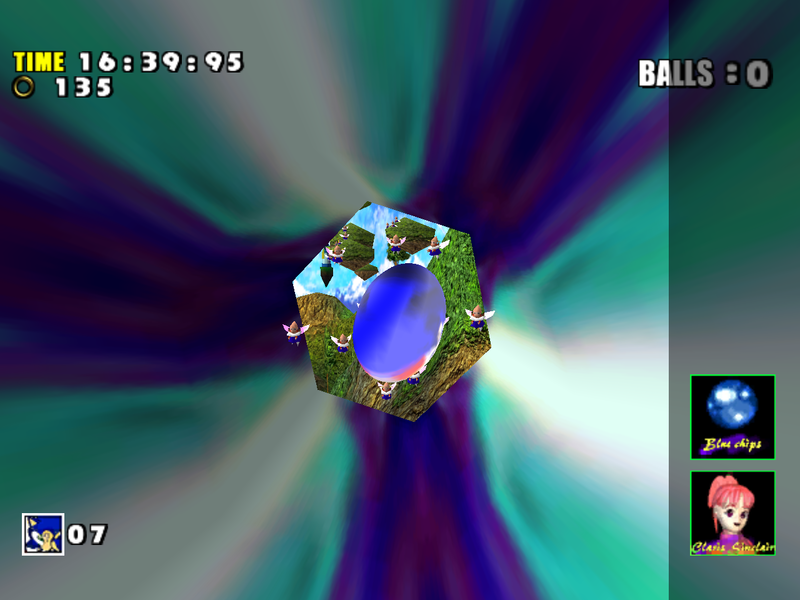 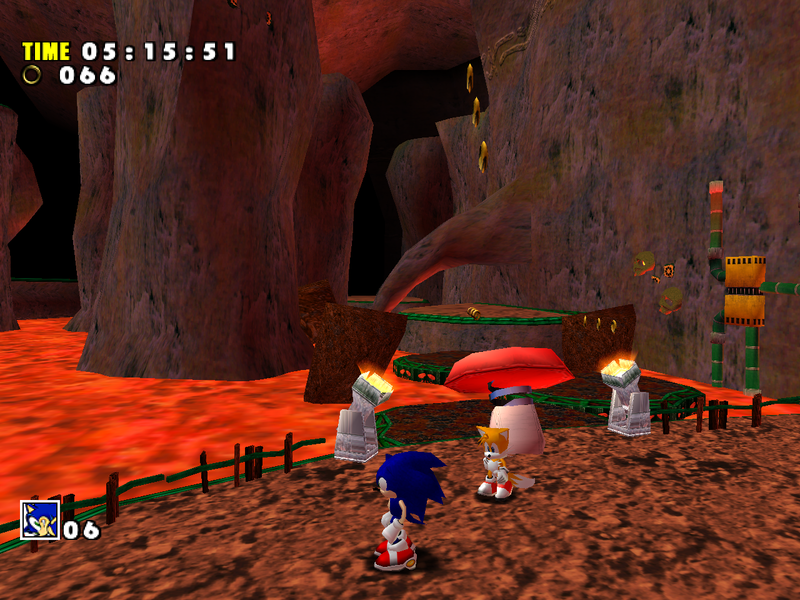 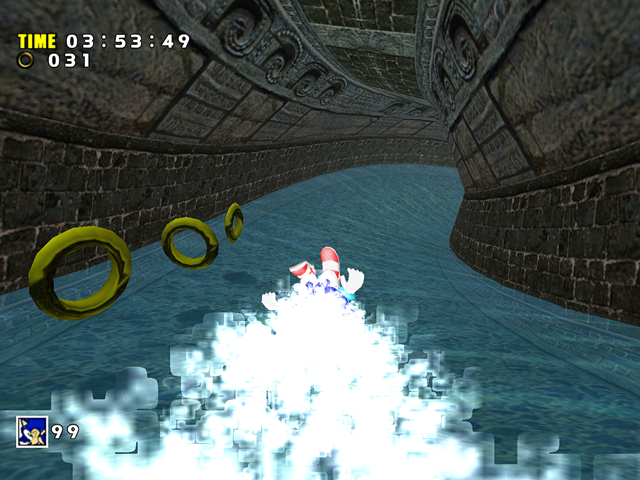 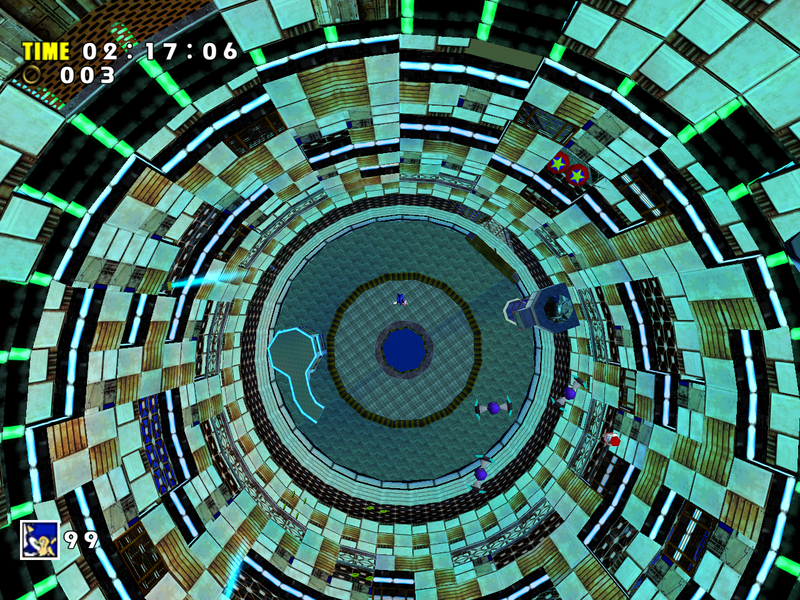 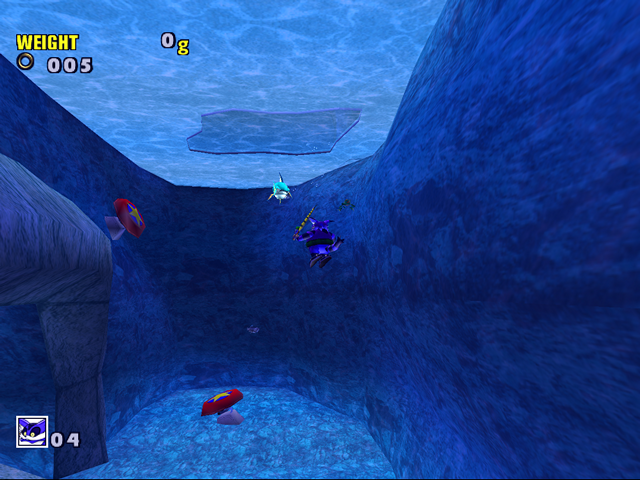 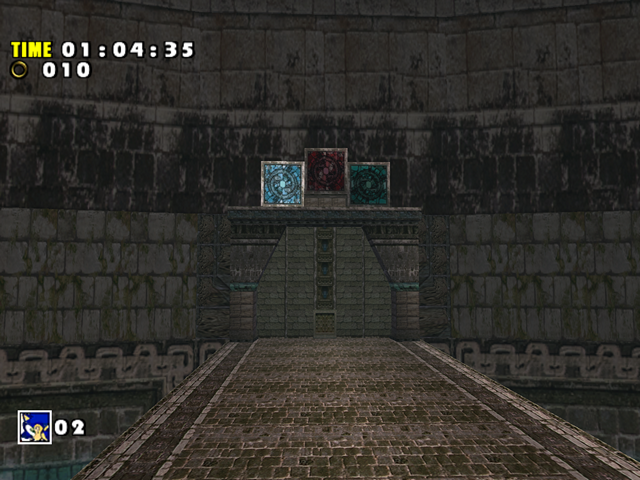 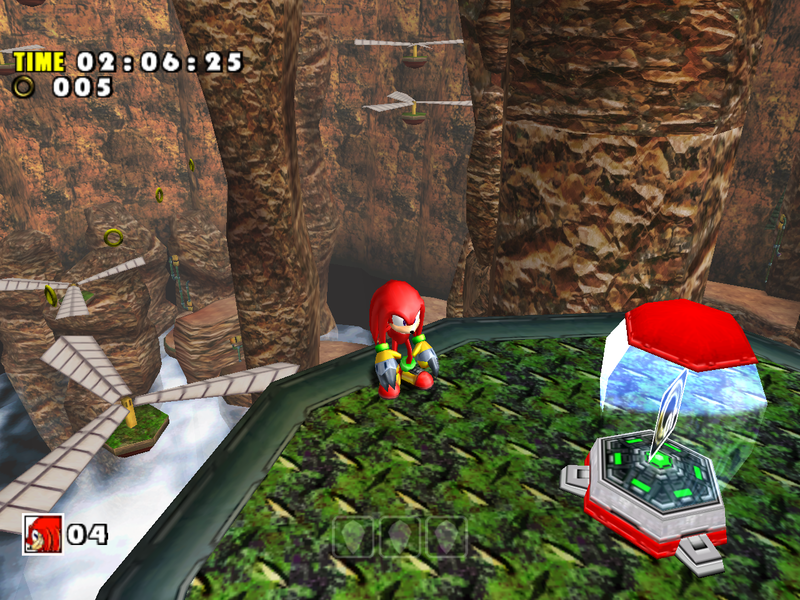 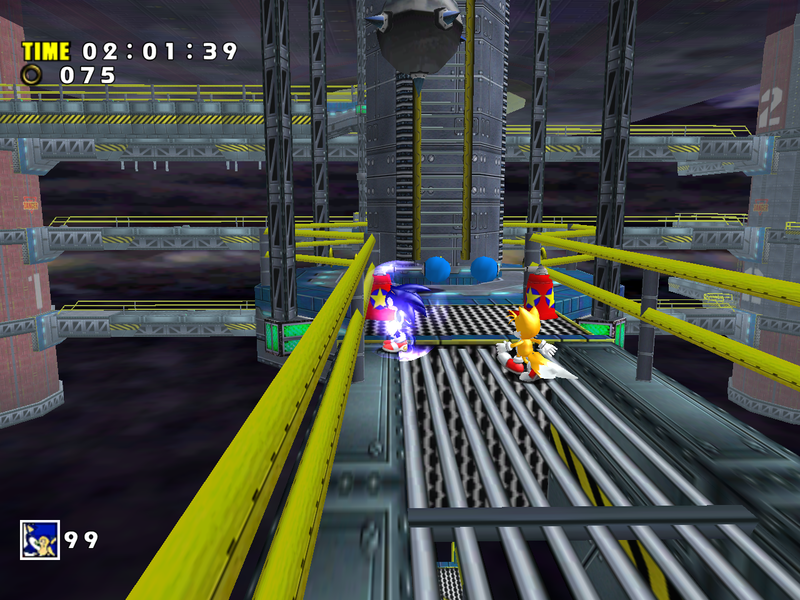 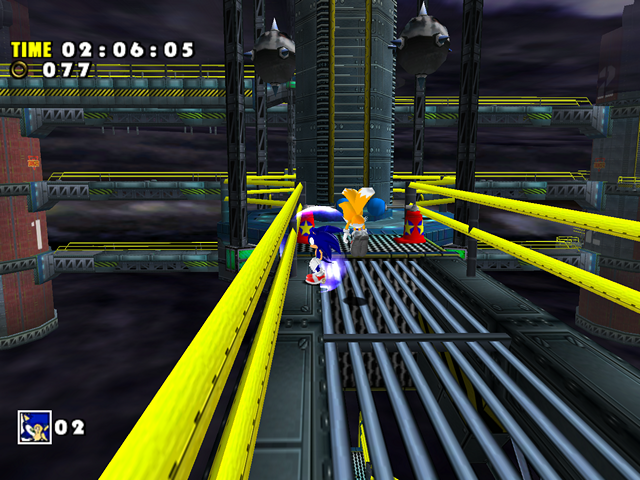 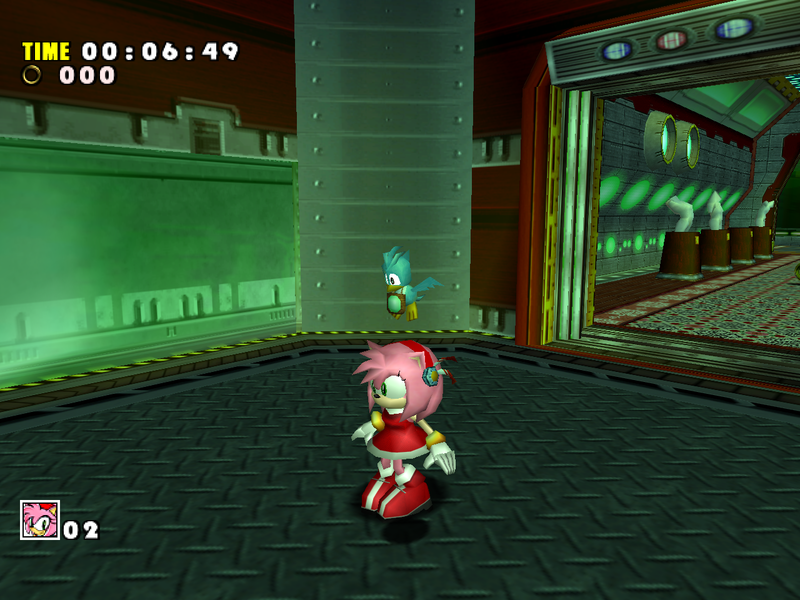 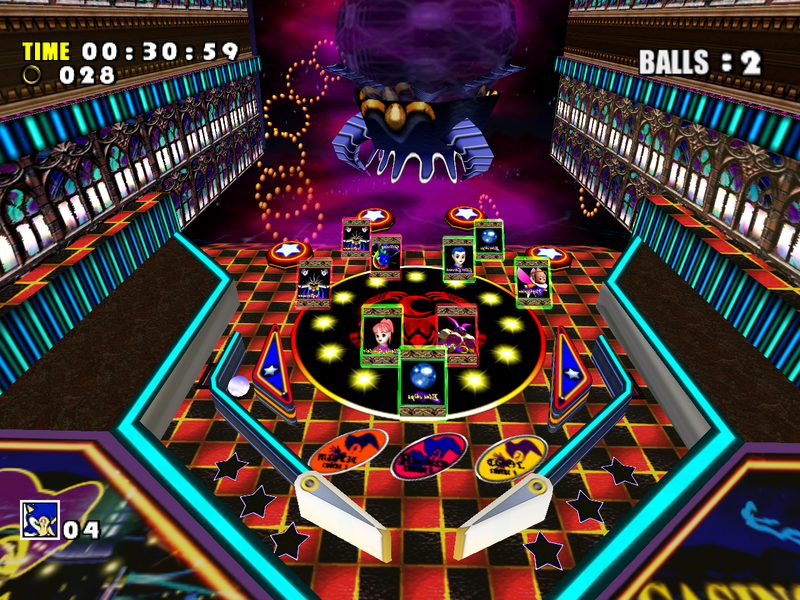 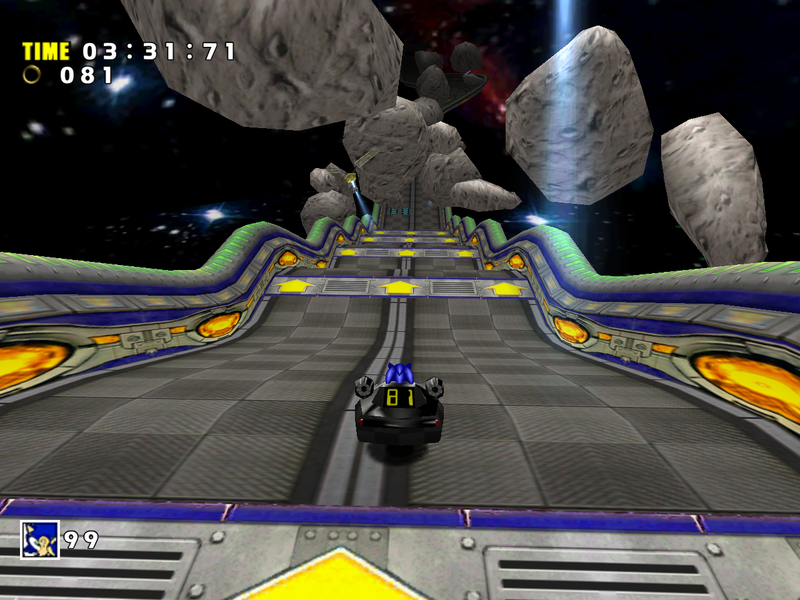 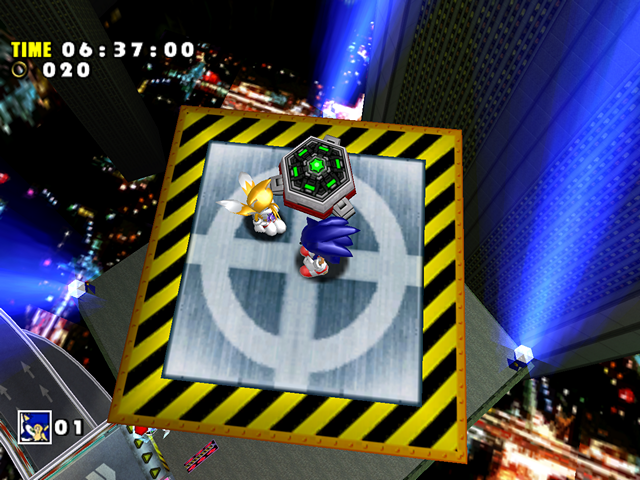 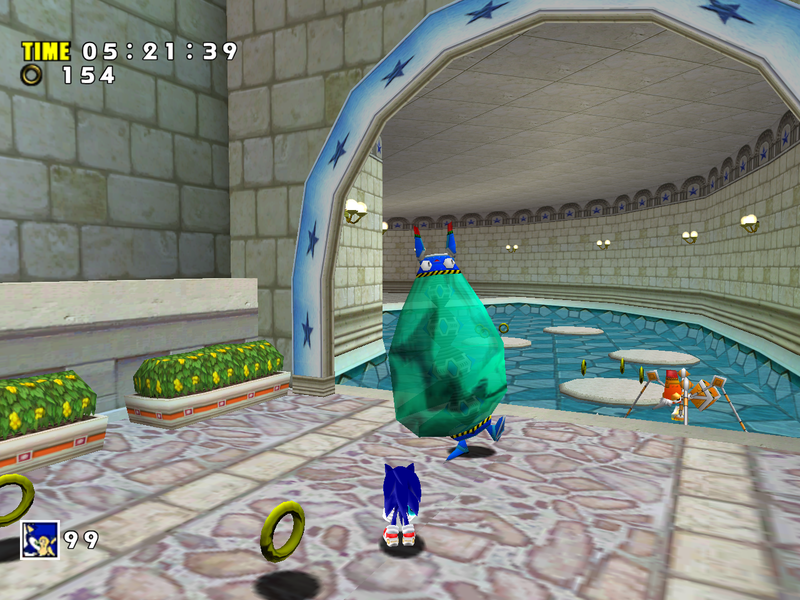 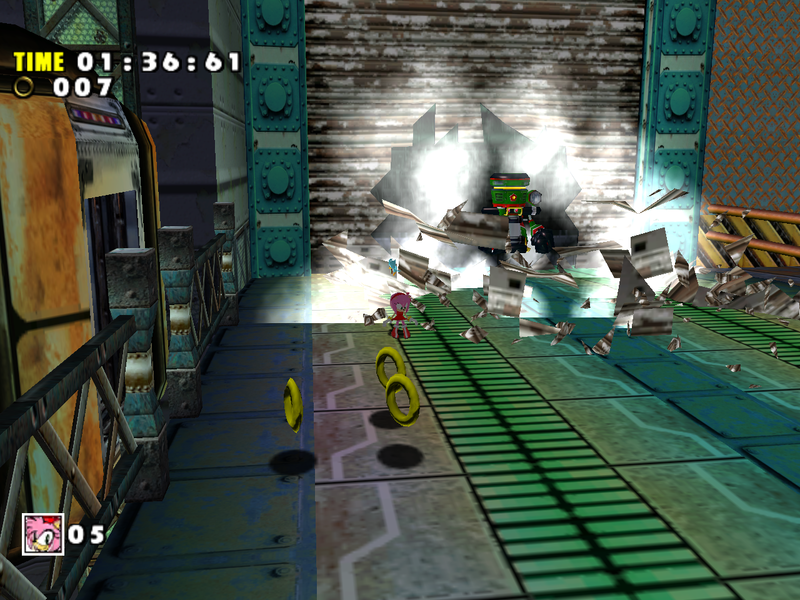 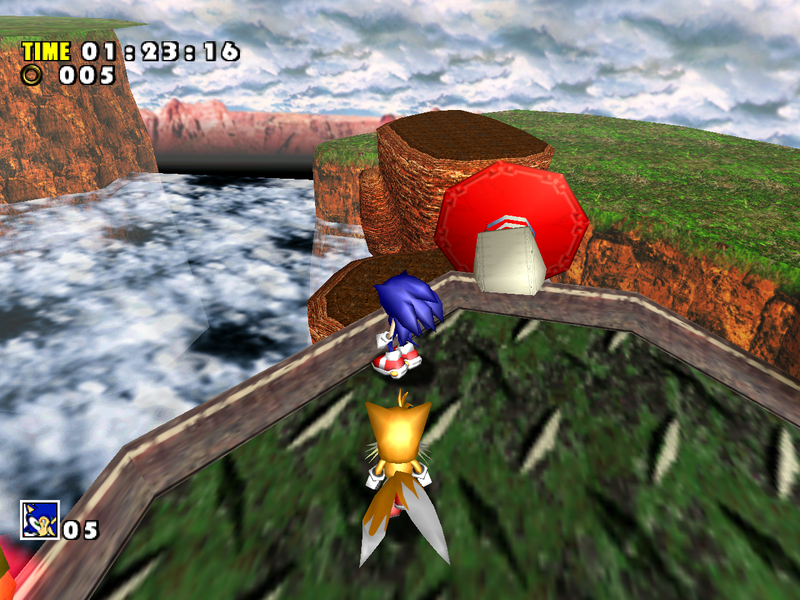 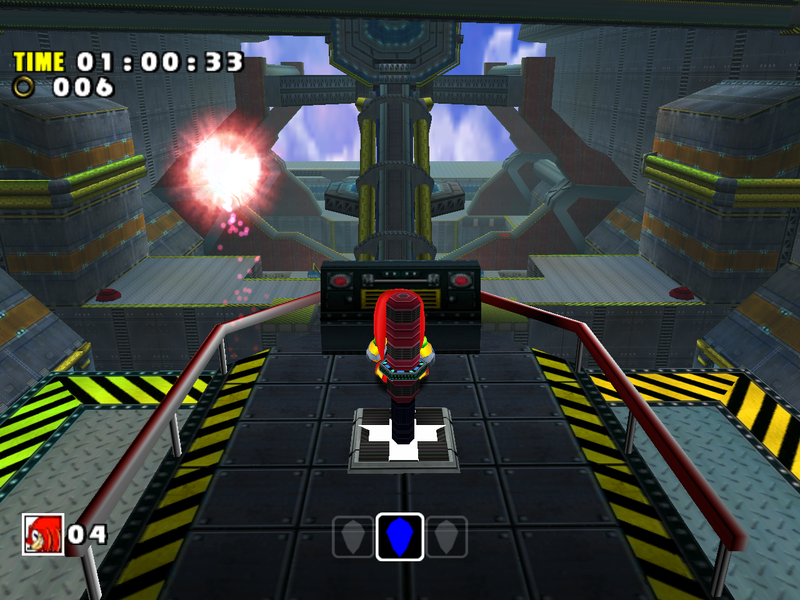 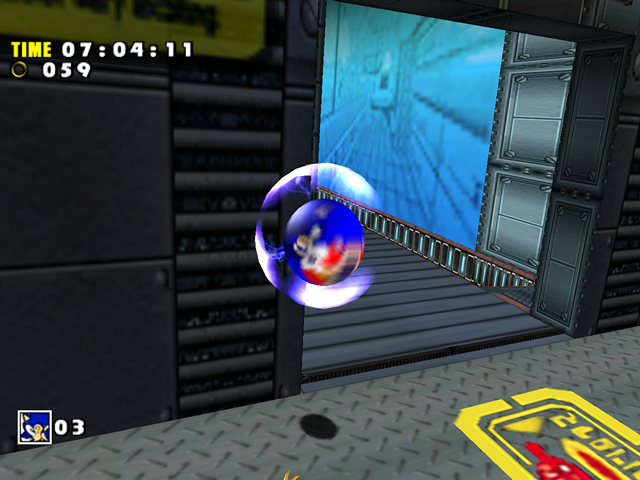 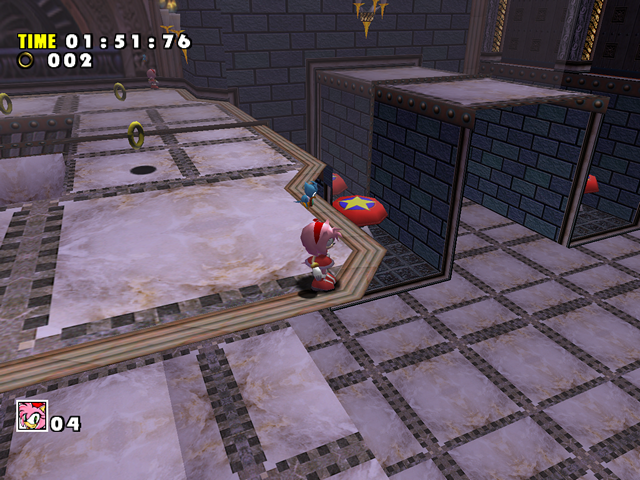 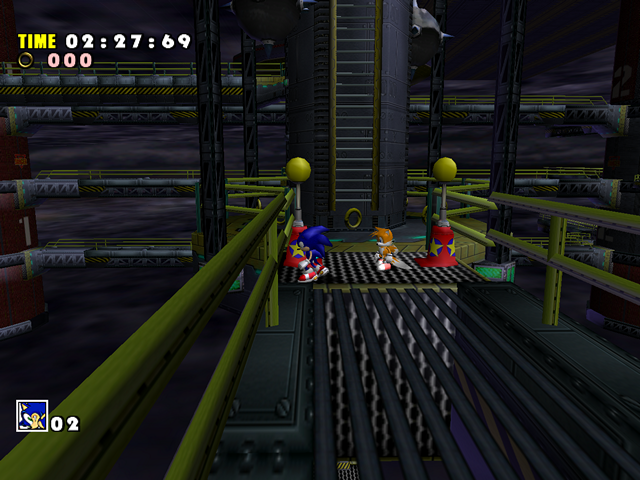 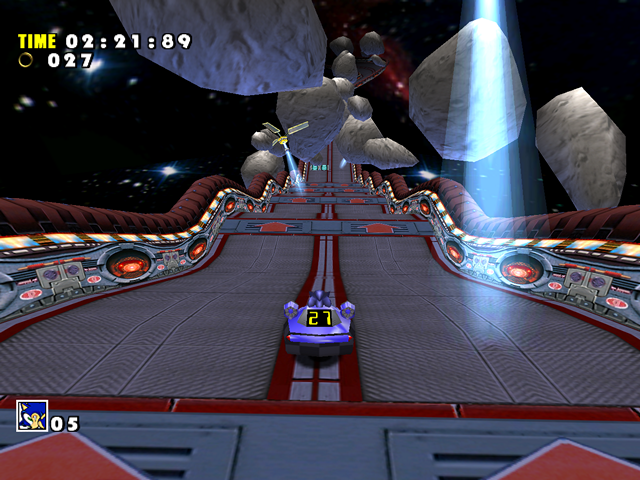 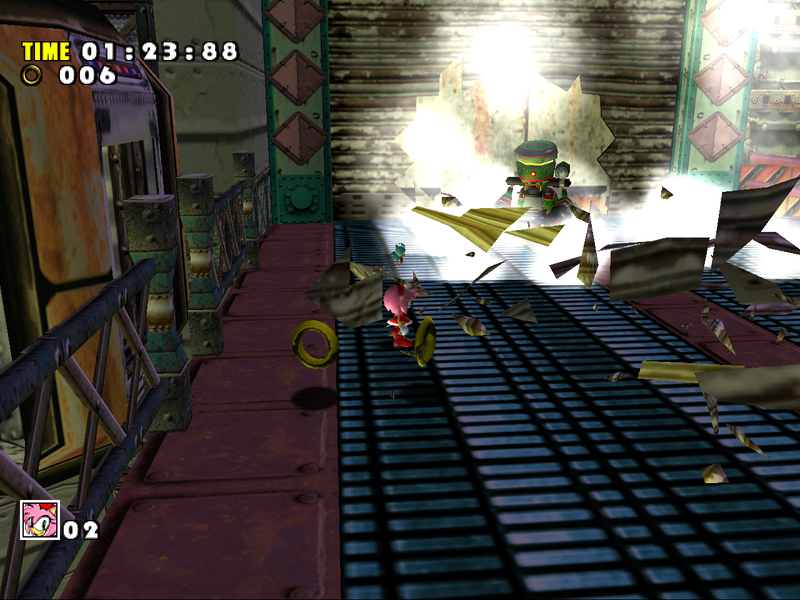 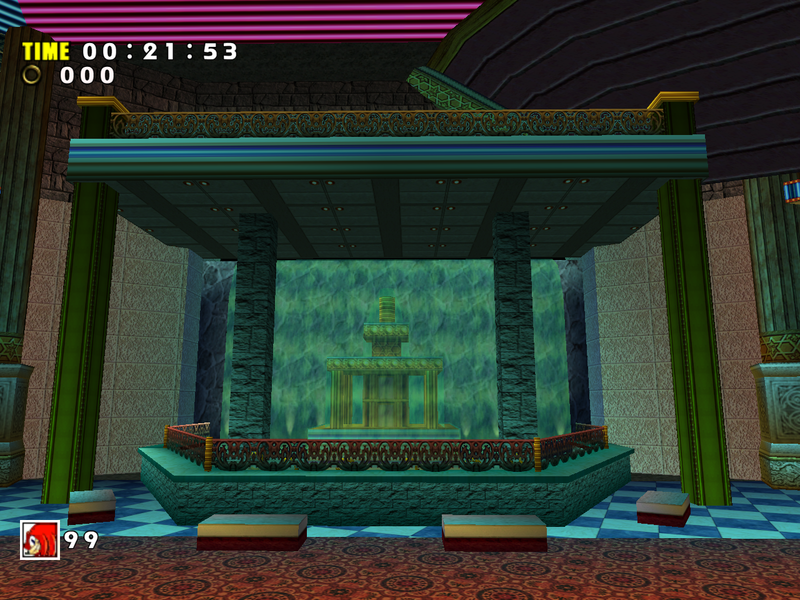 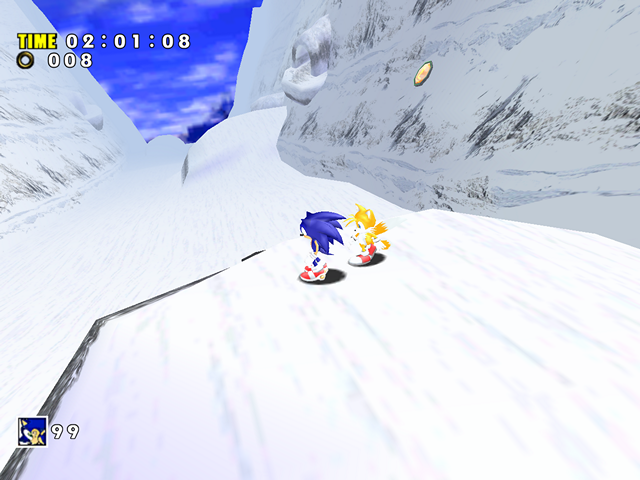 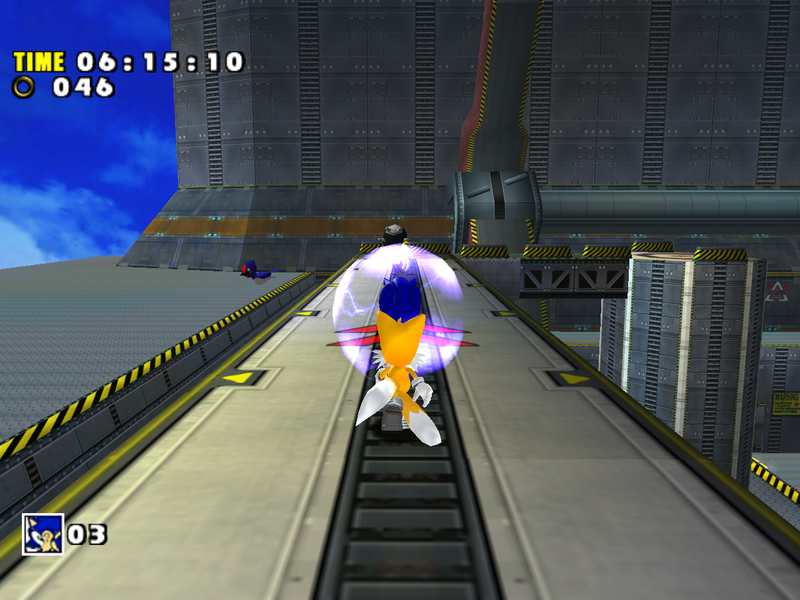 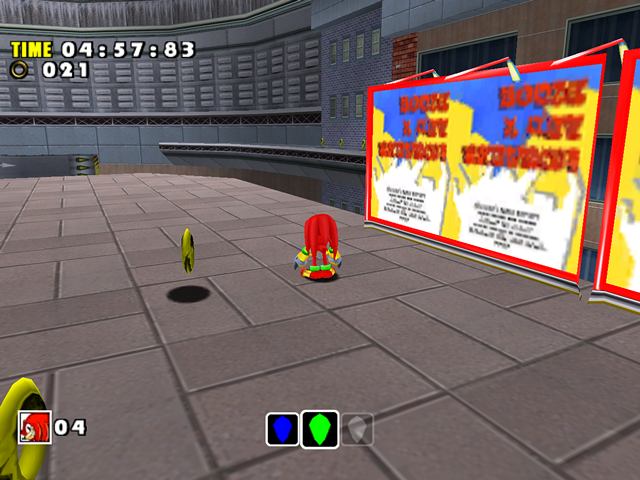 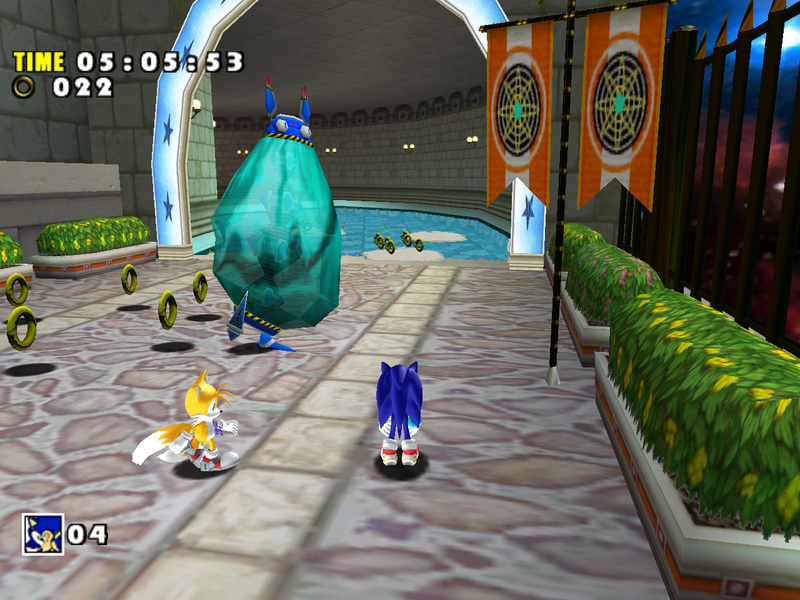 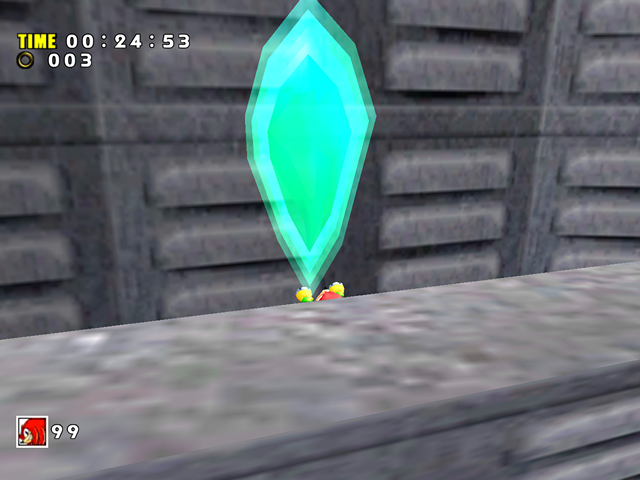 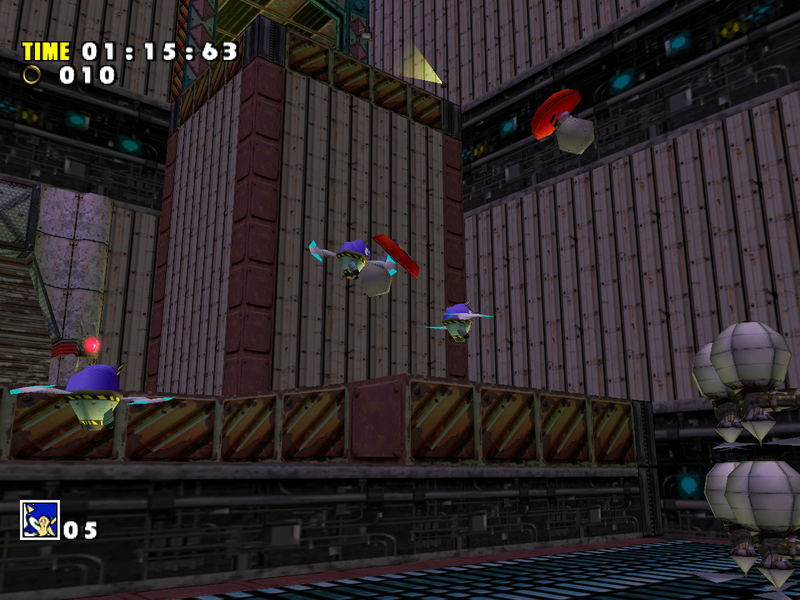 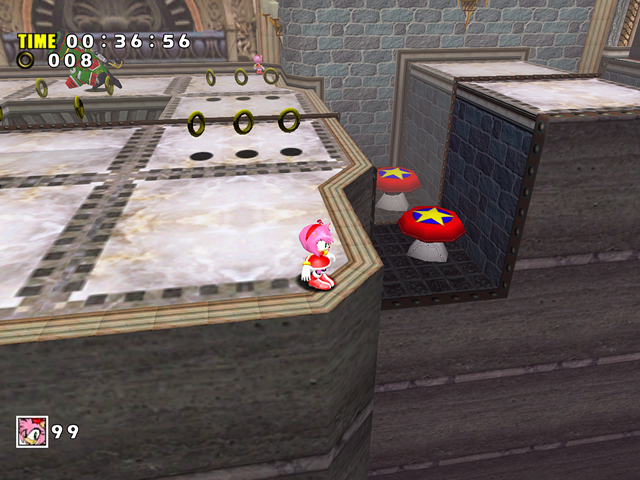 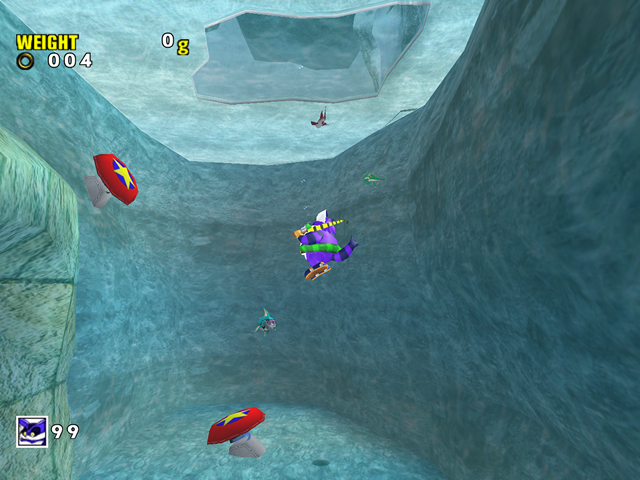 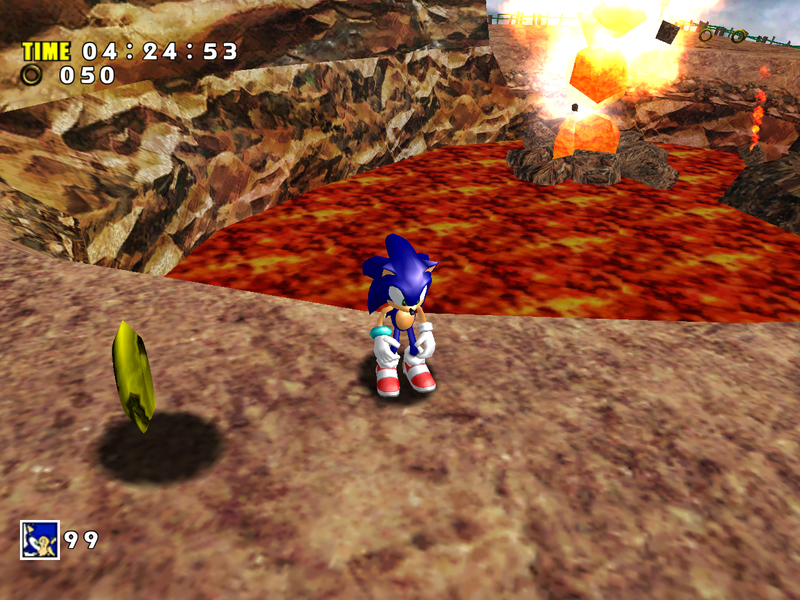 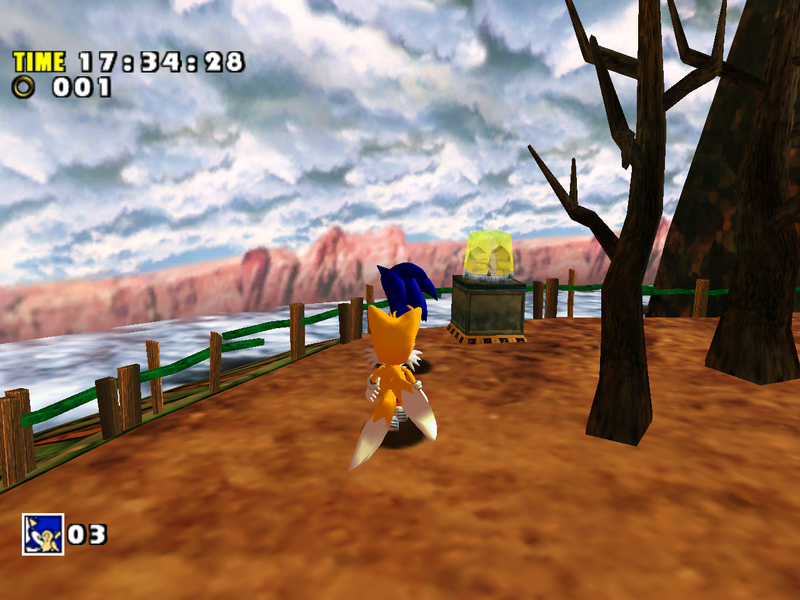 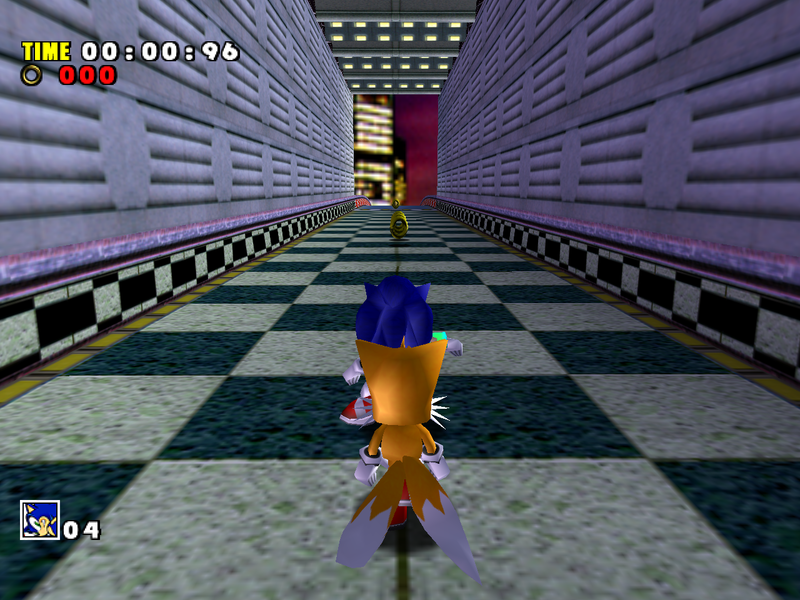 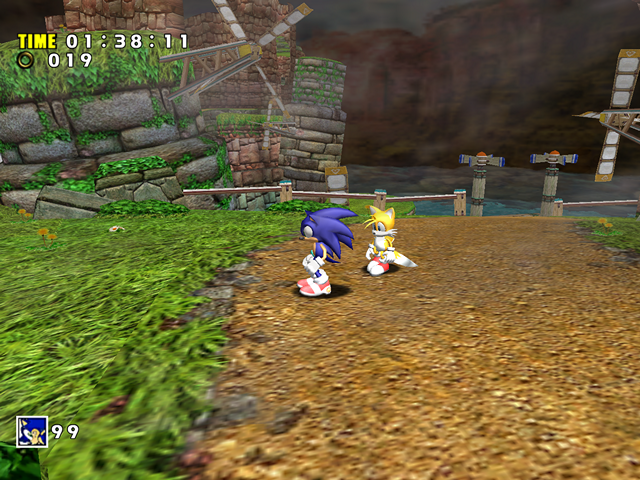 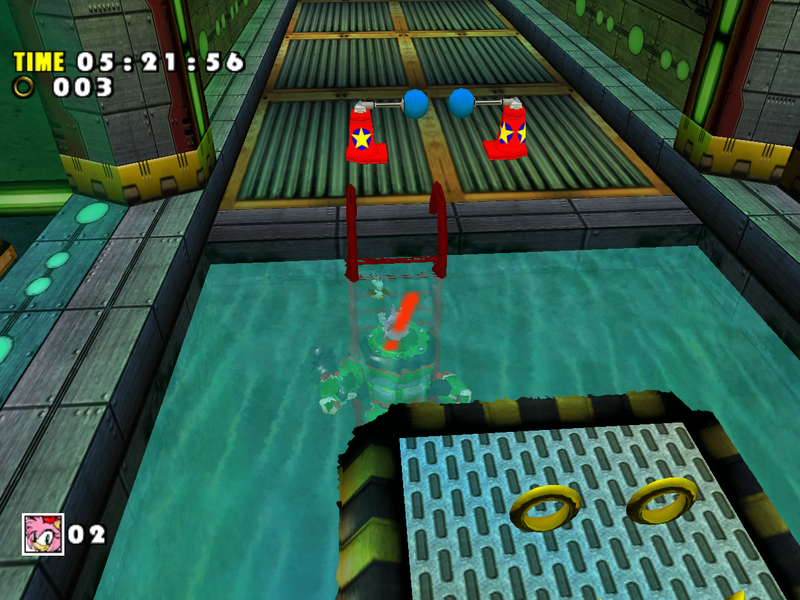 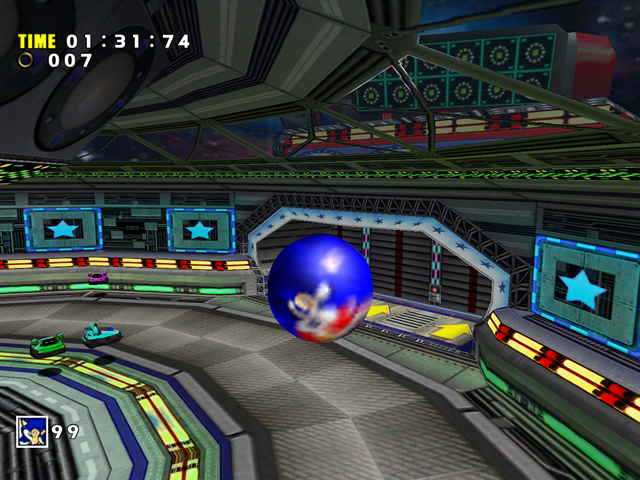 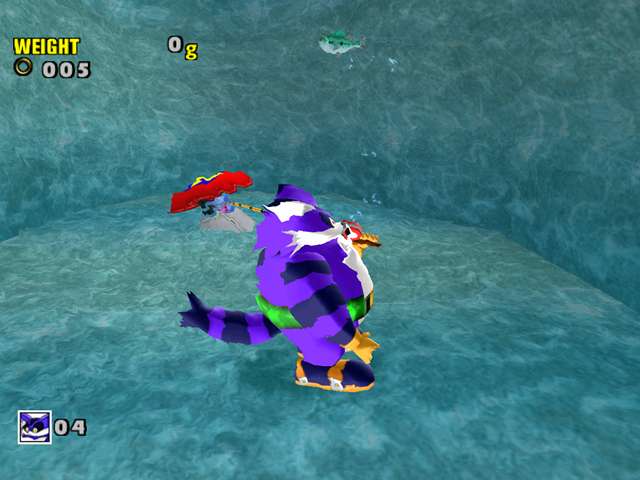 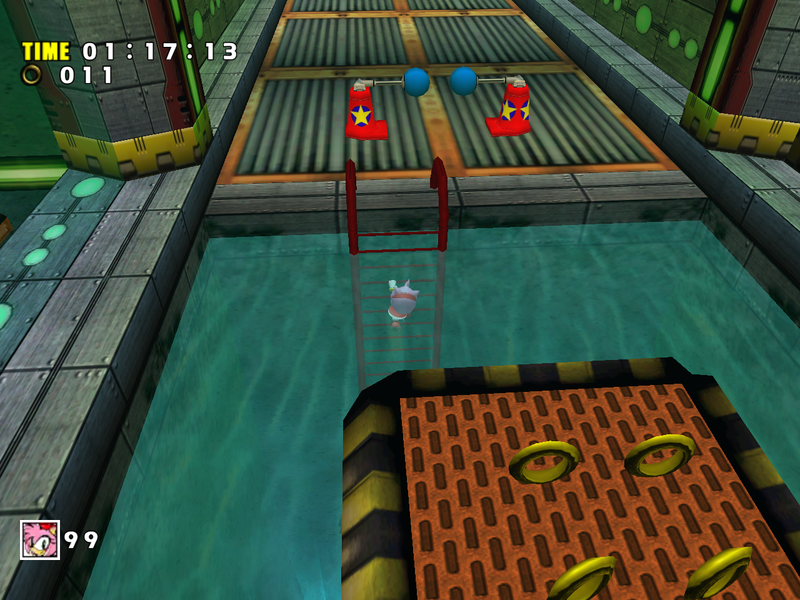 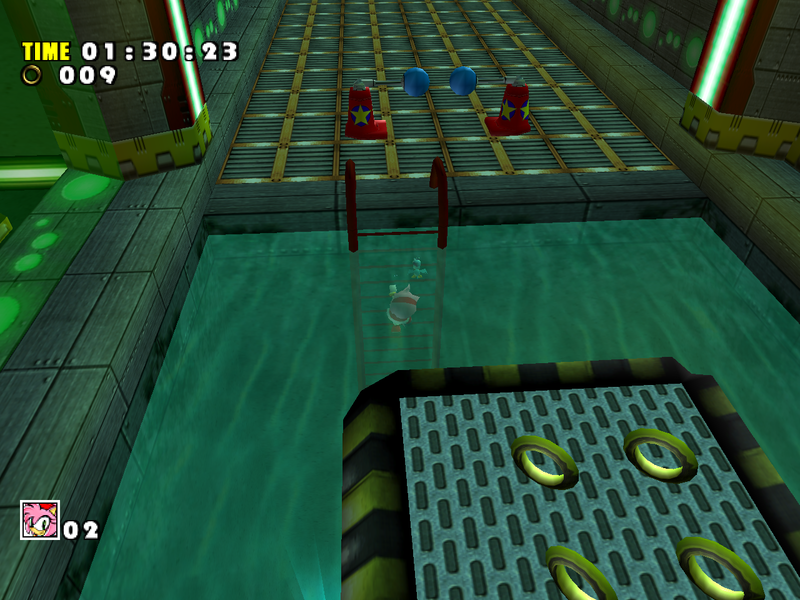 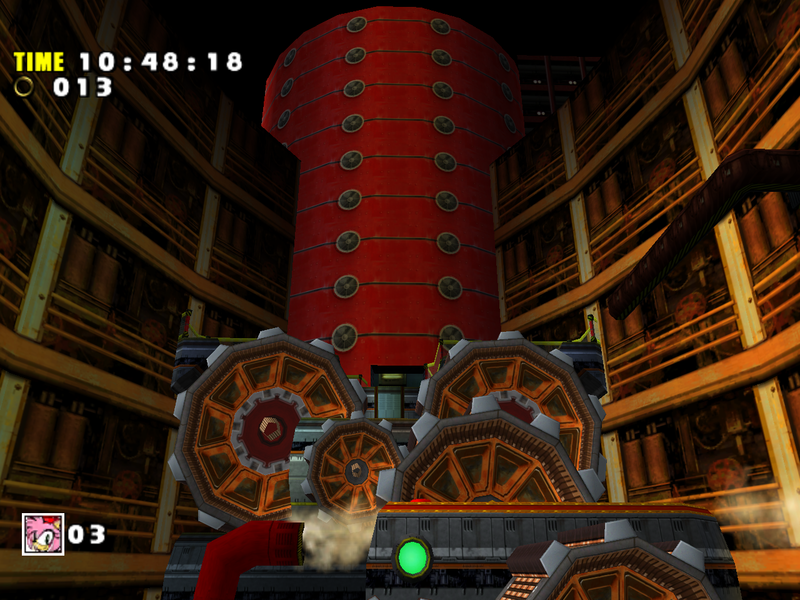 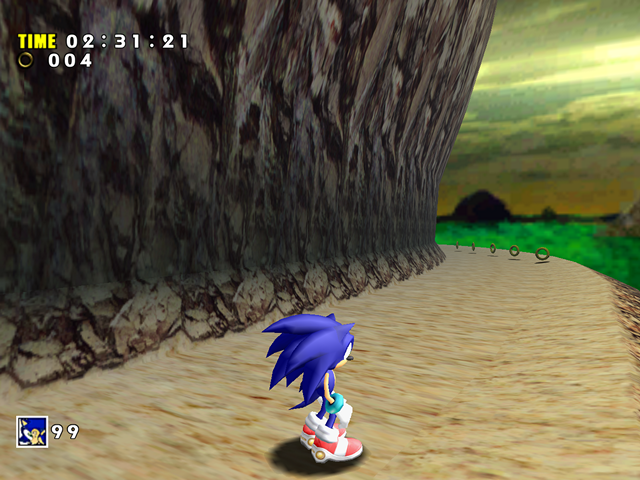 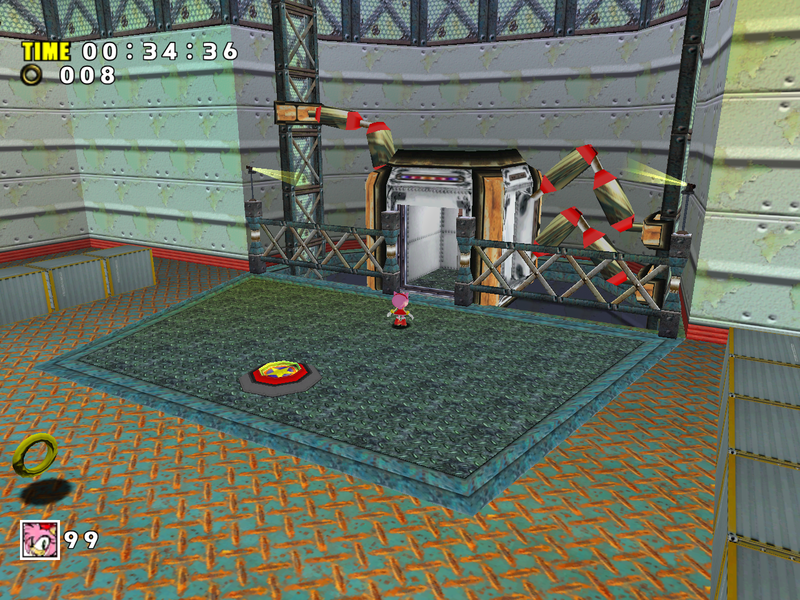 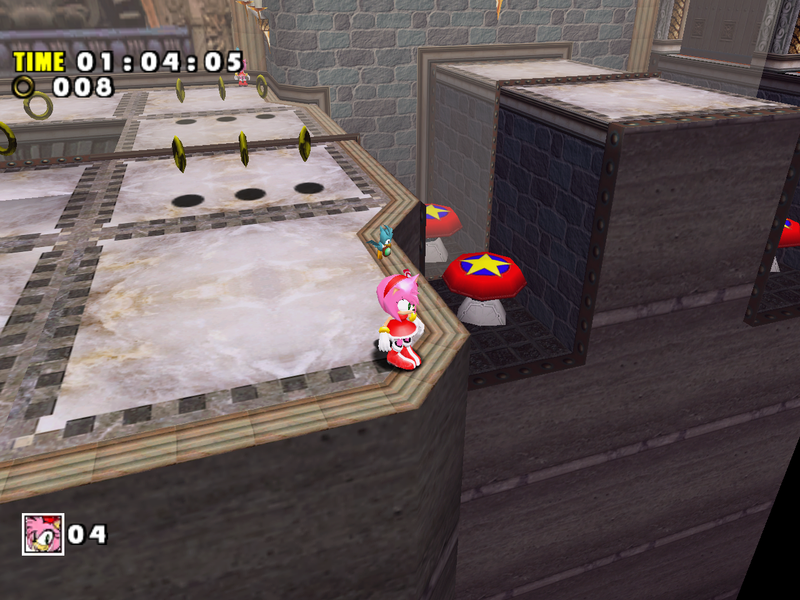 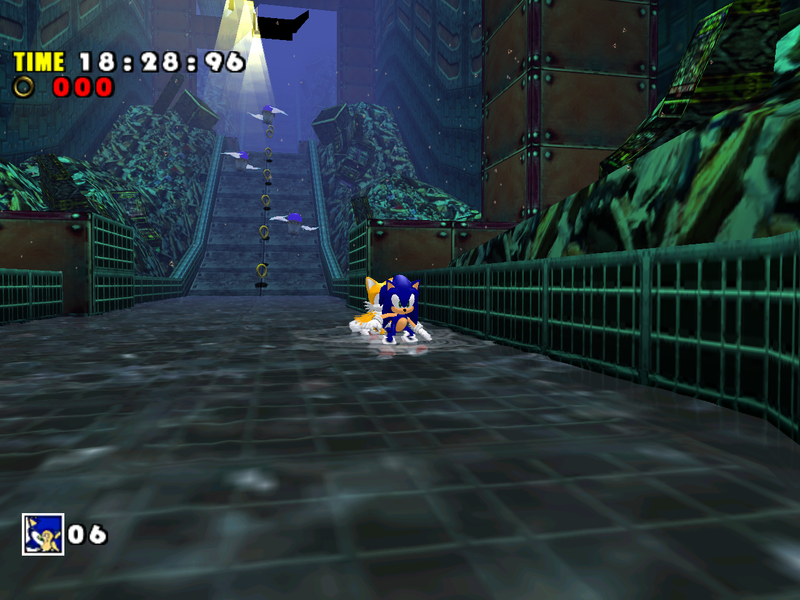 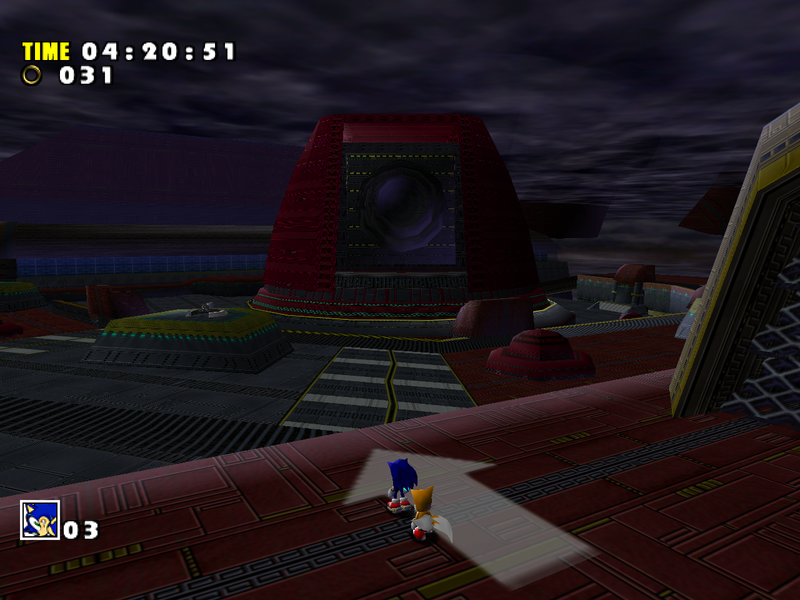 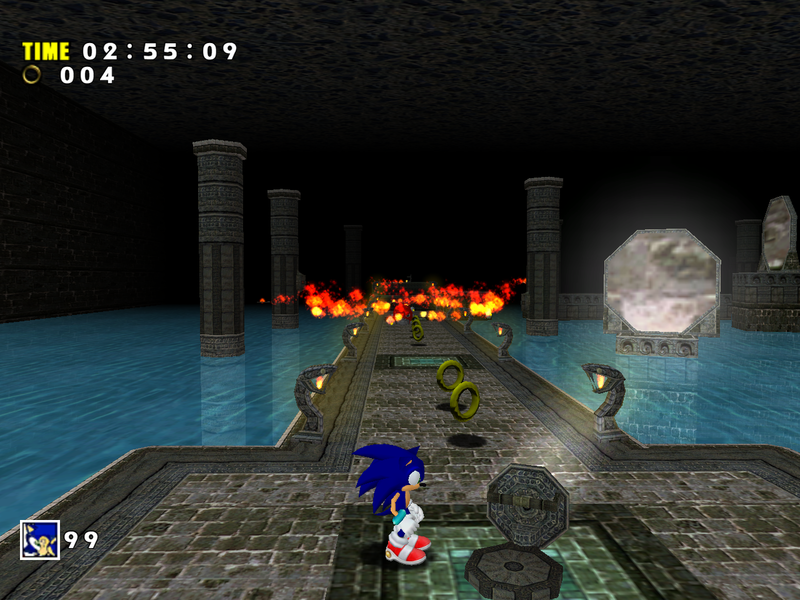 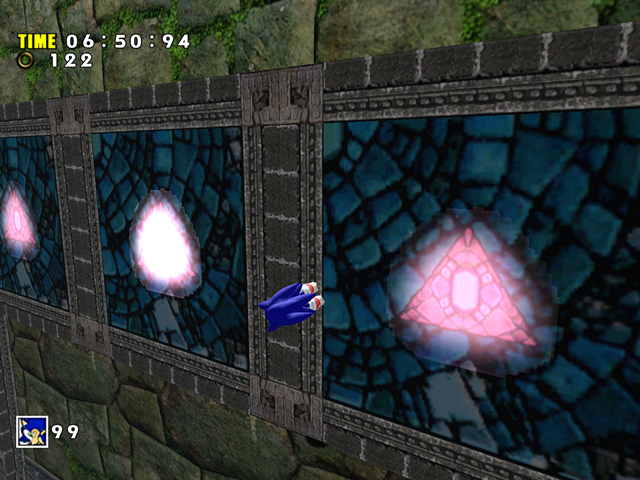 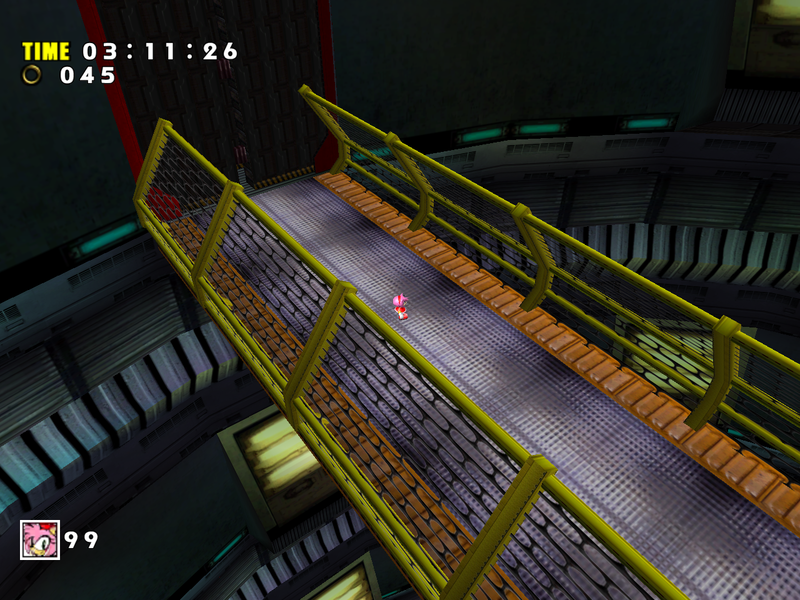 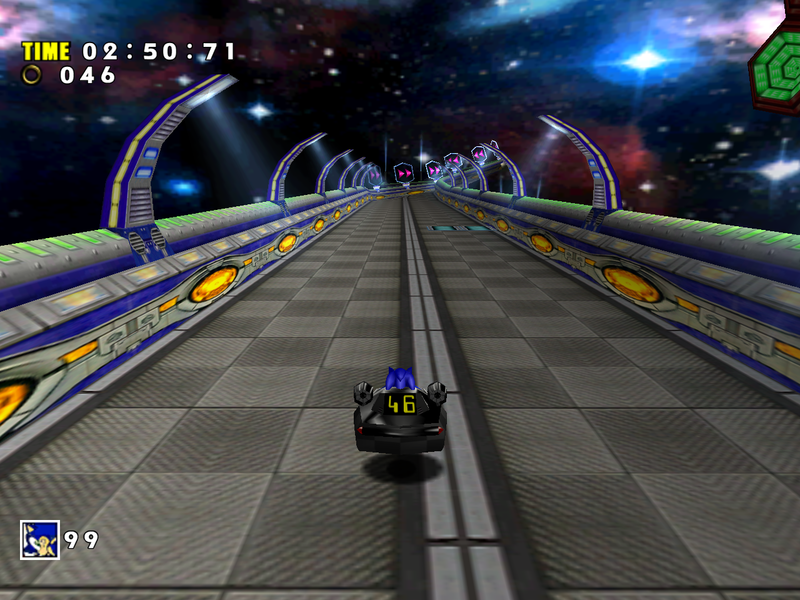 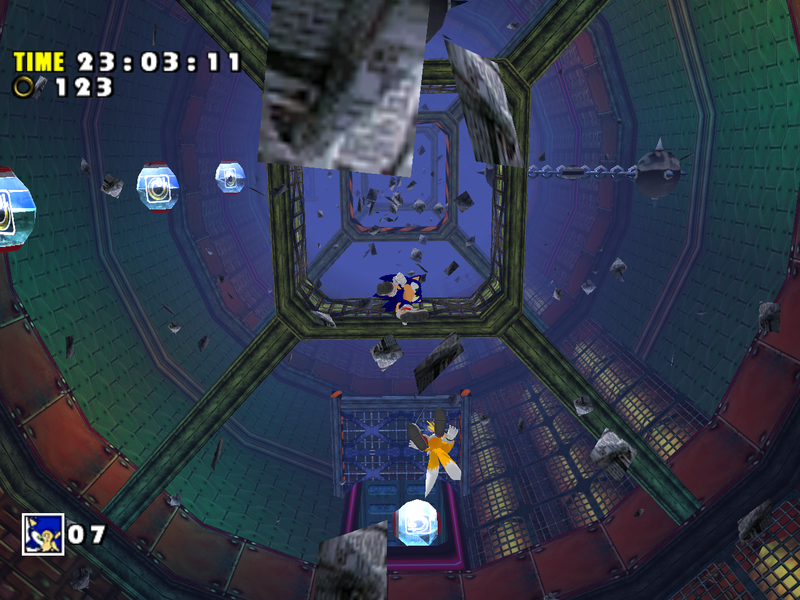 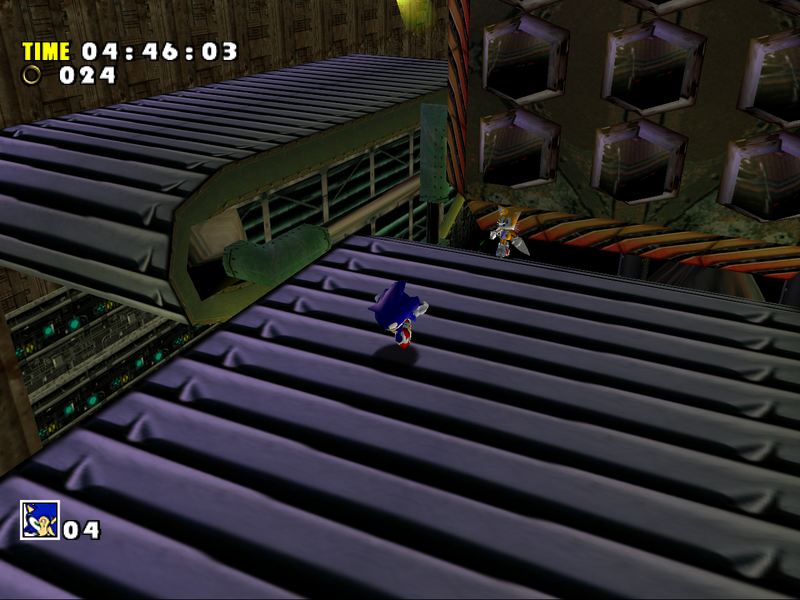 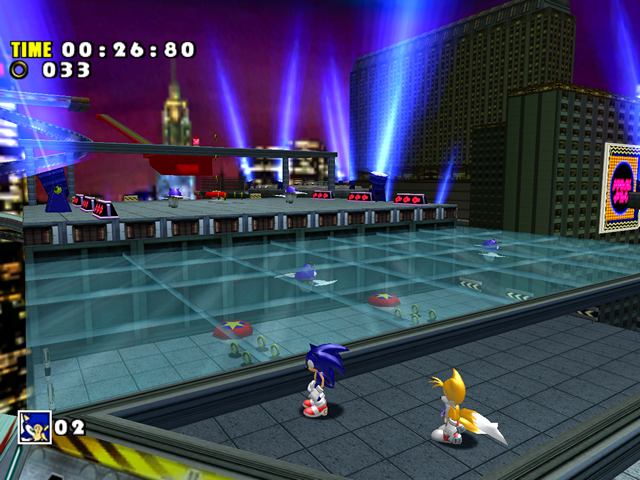 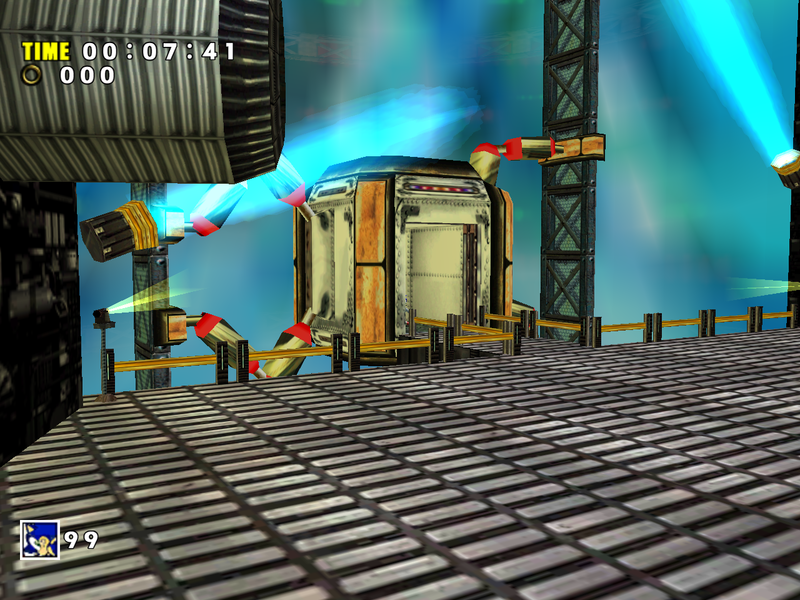 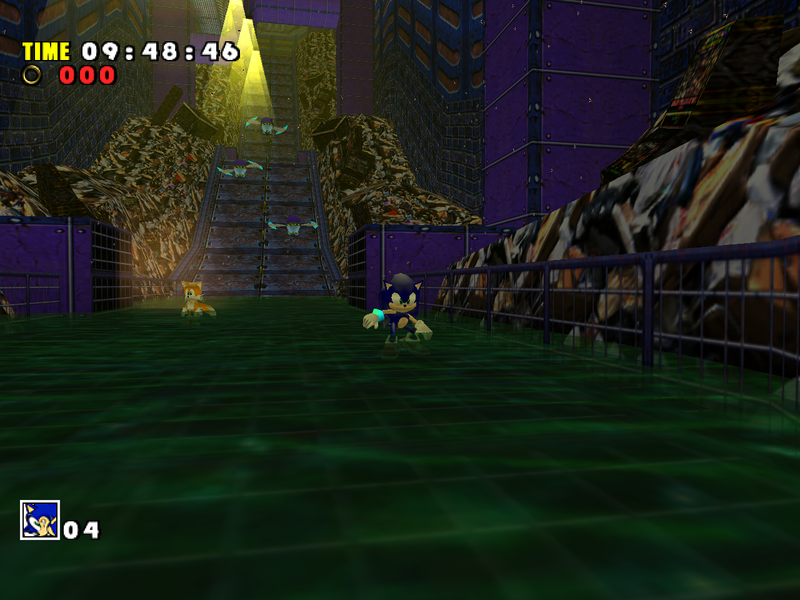 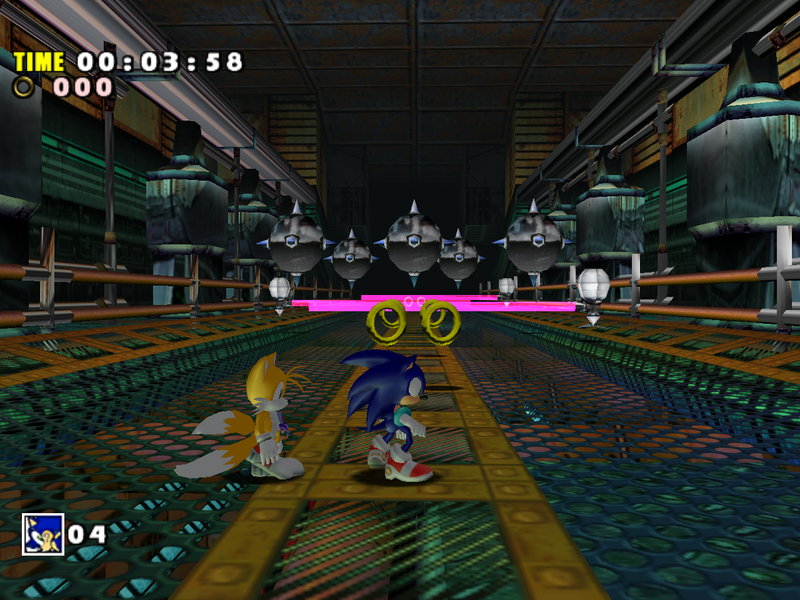 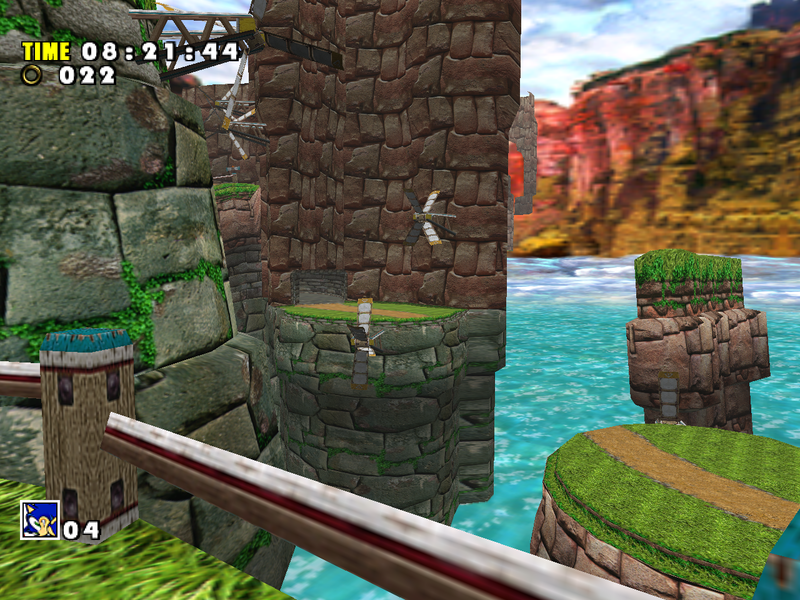 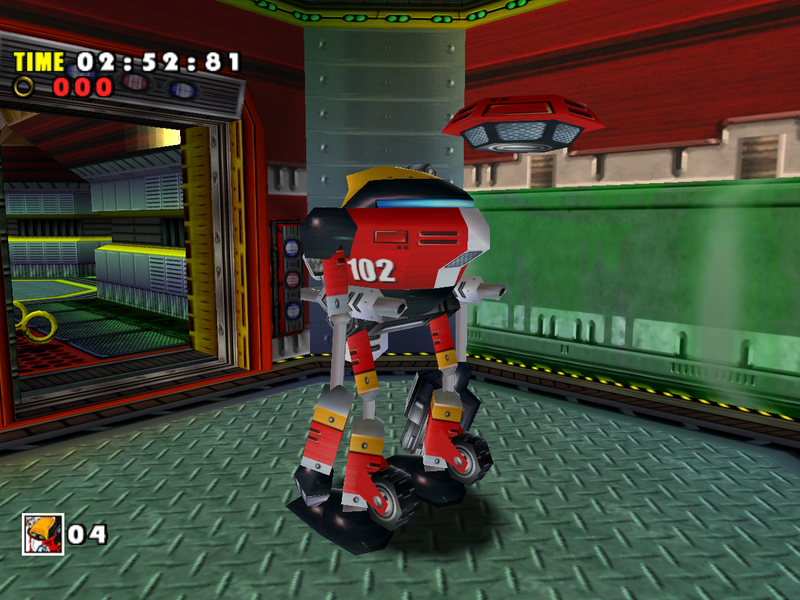 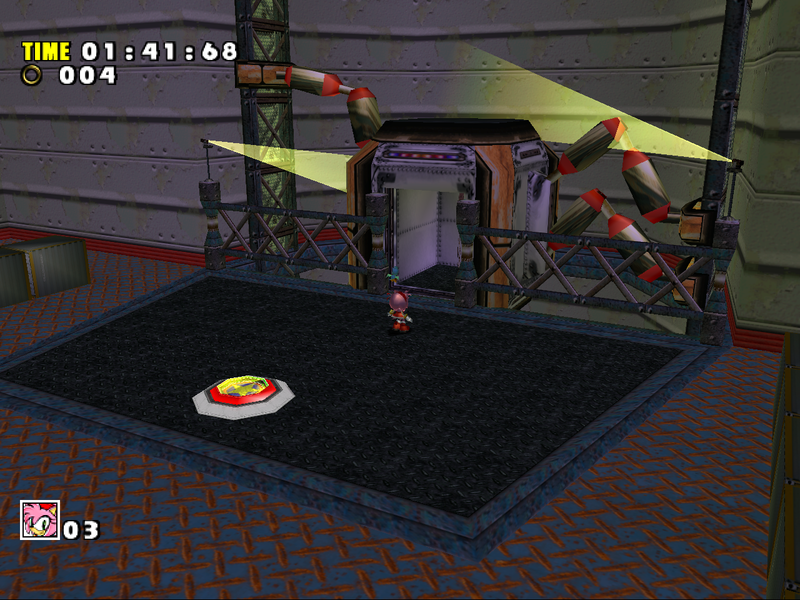 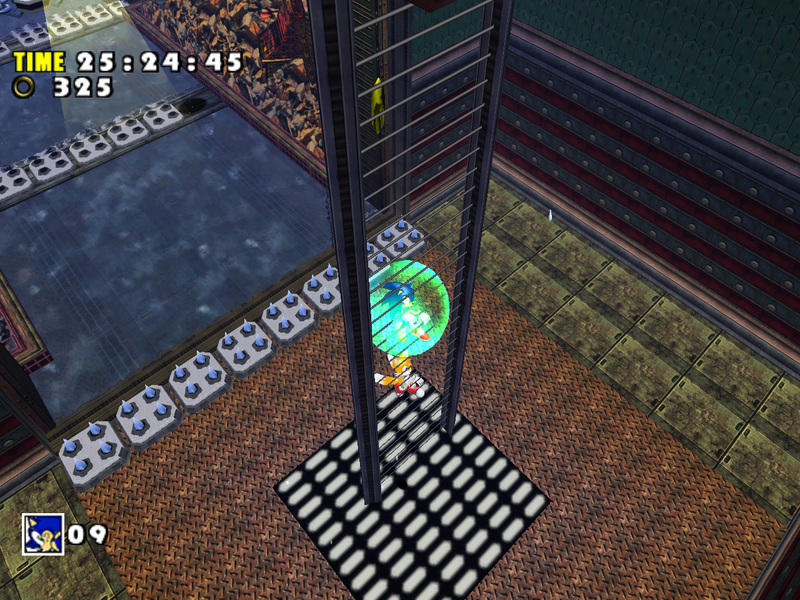 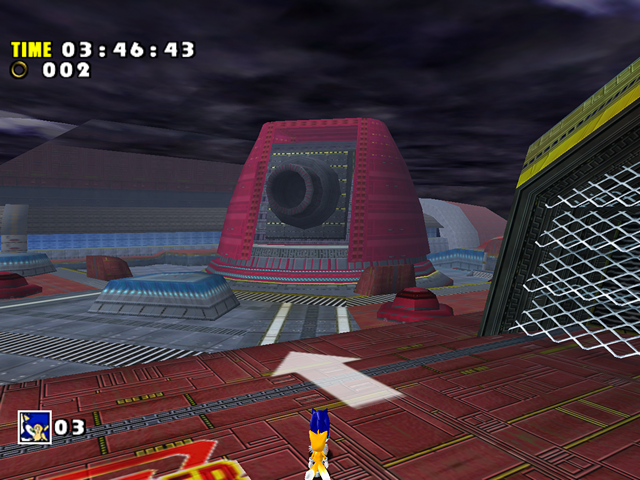 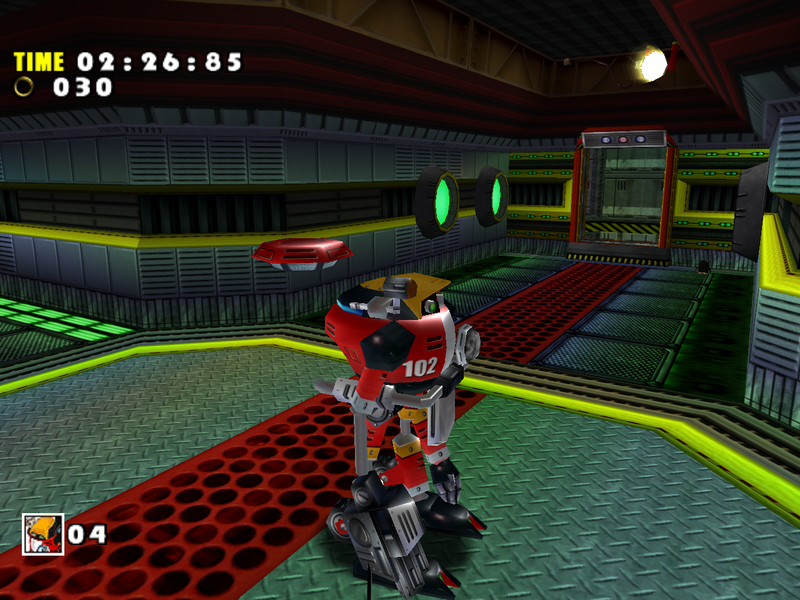 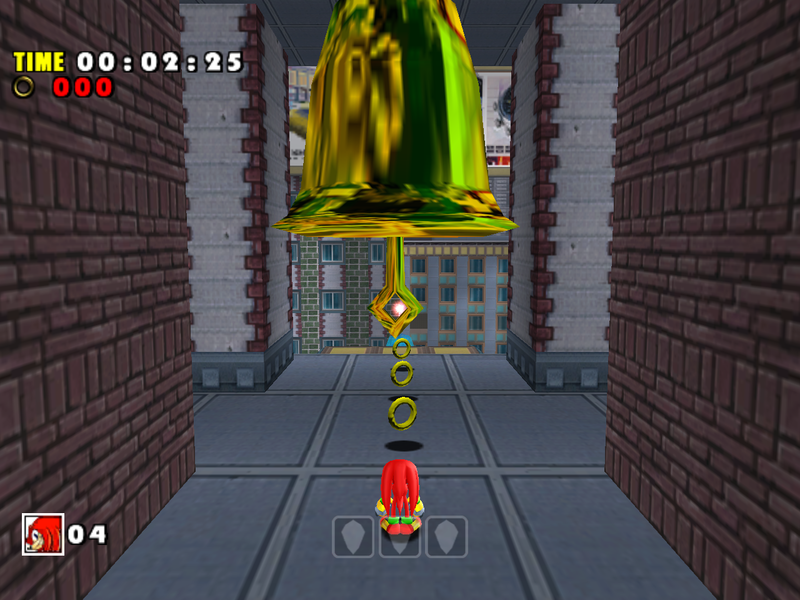 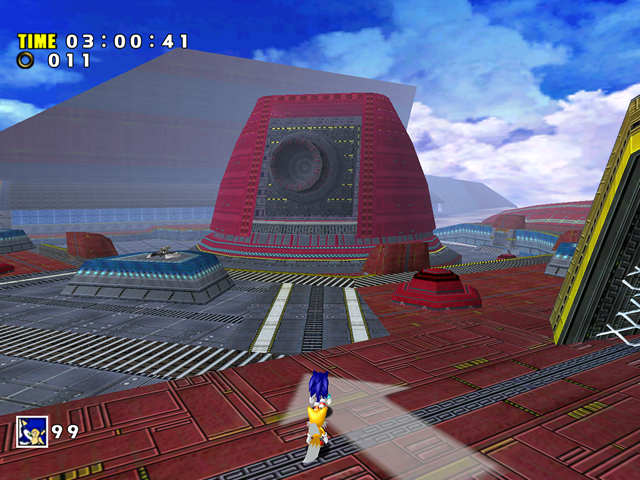 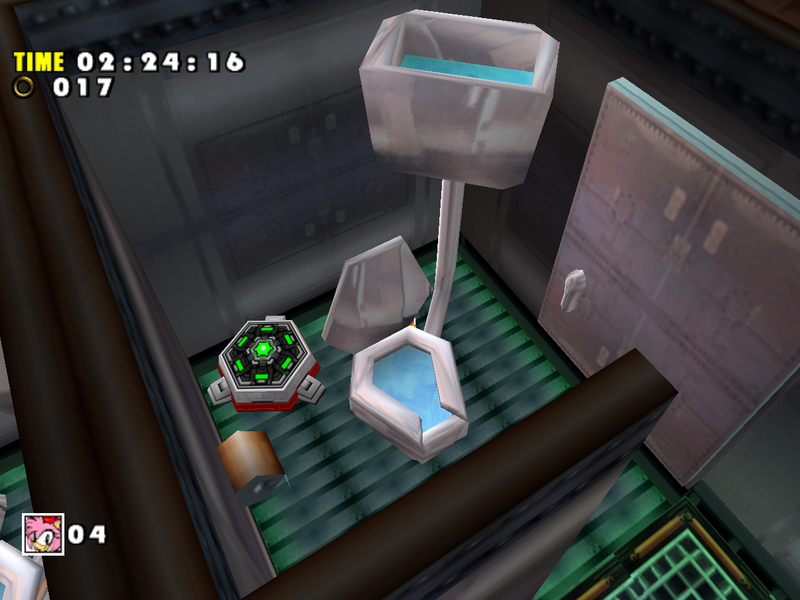 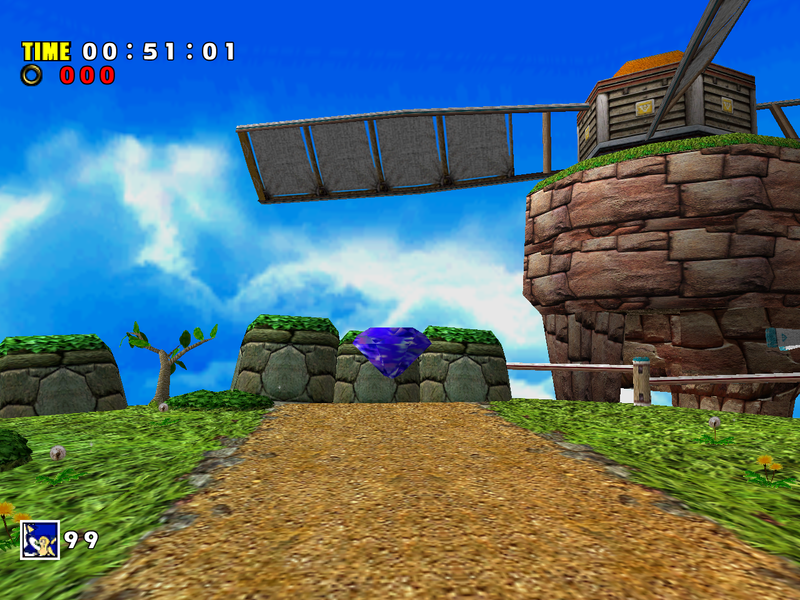 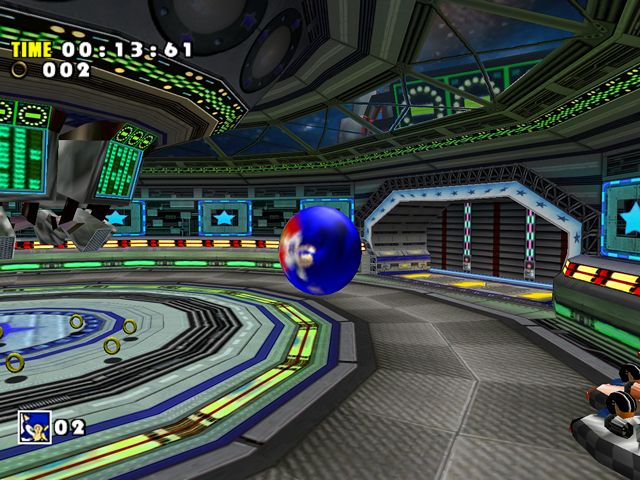 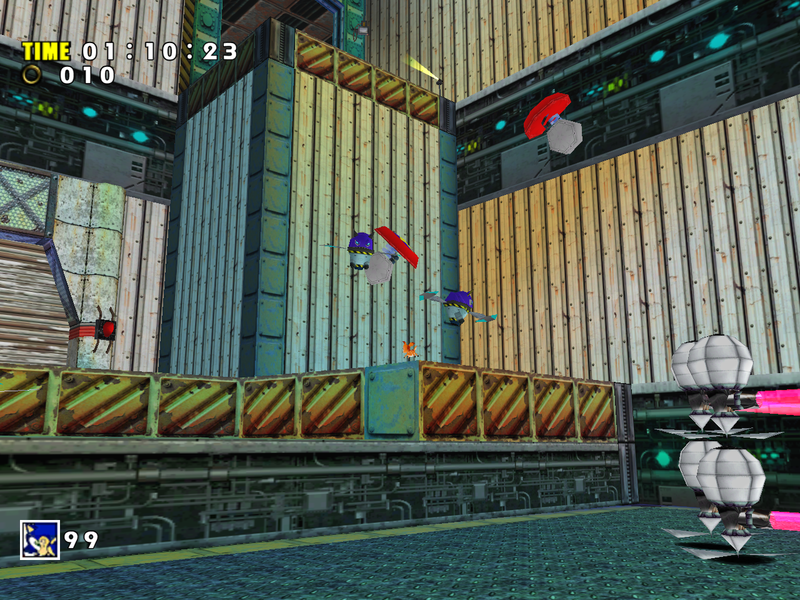 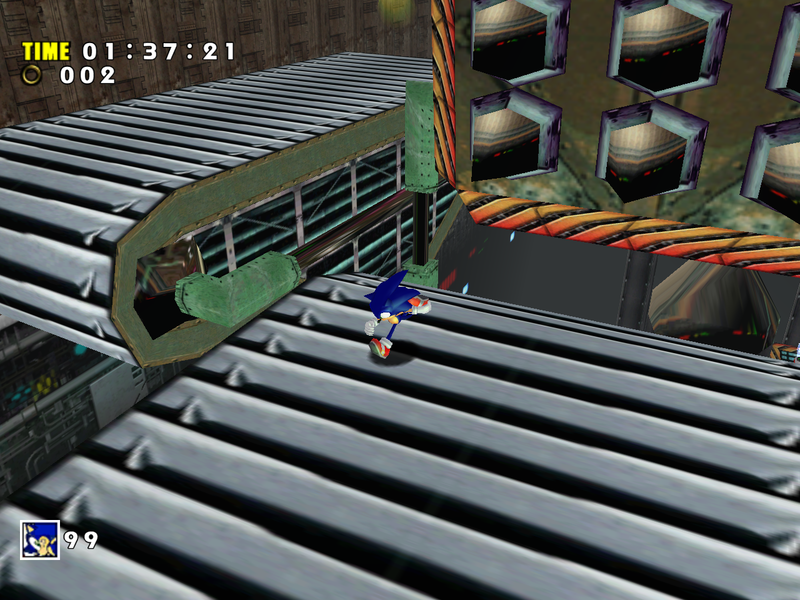 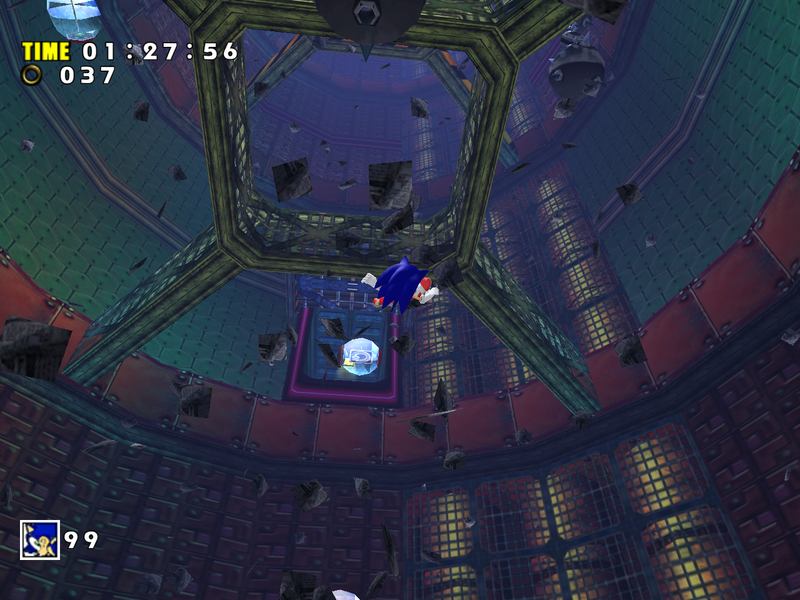 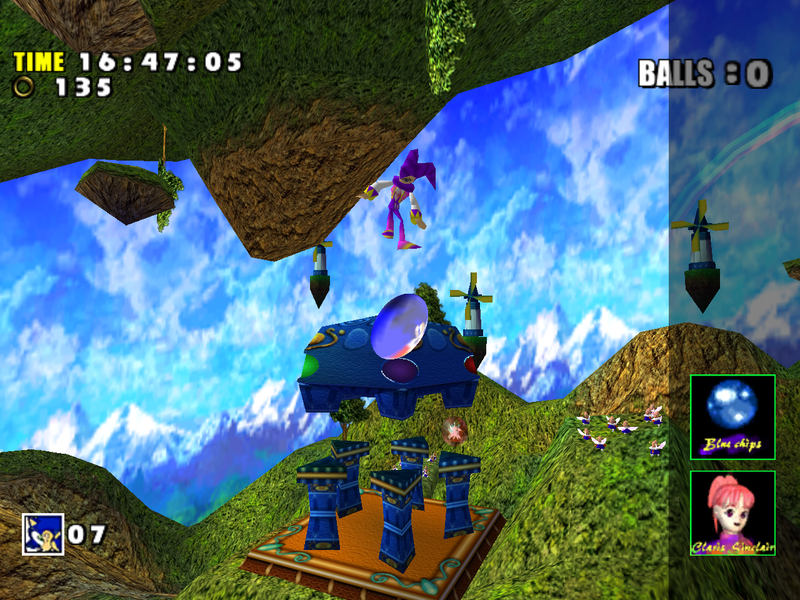 The Dreamcast version had several unique glass textures in different stages, while SADX uses one texture almost everywhere. 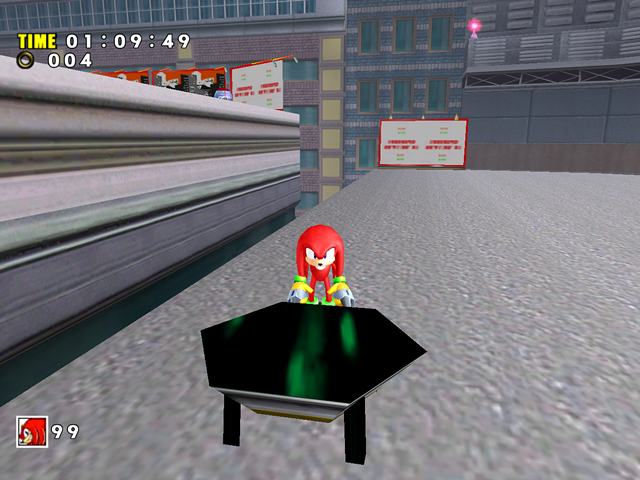 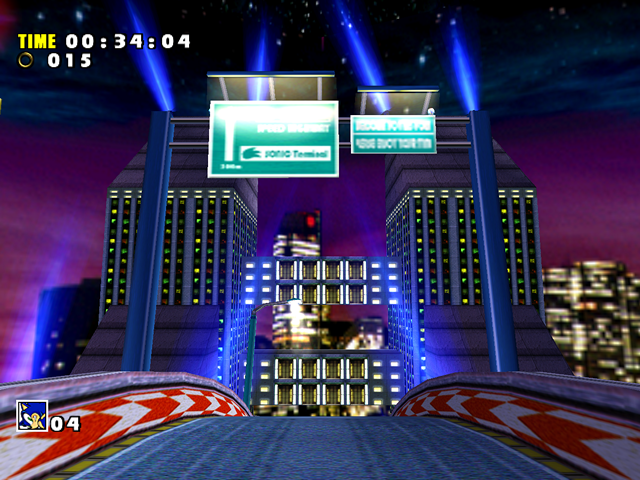 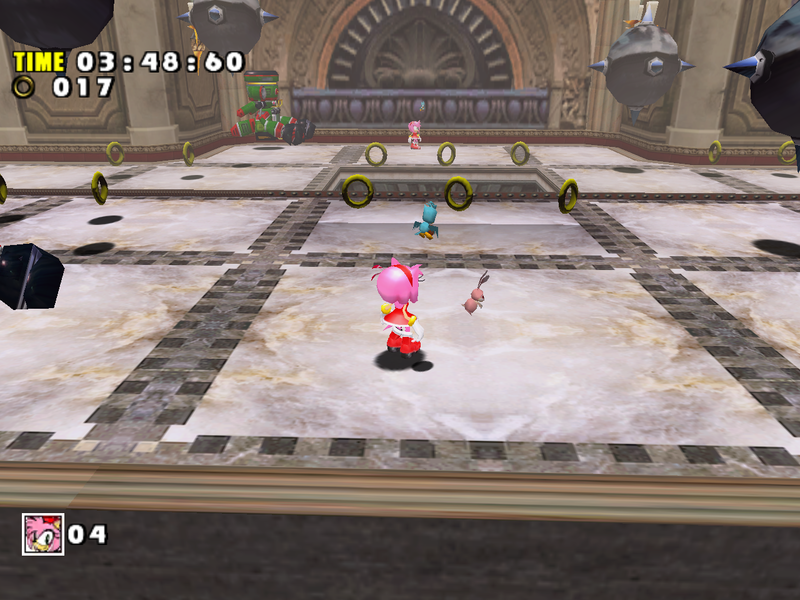 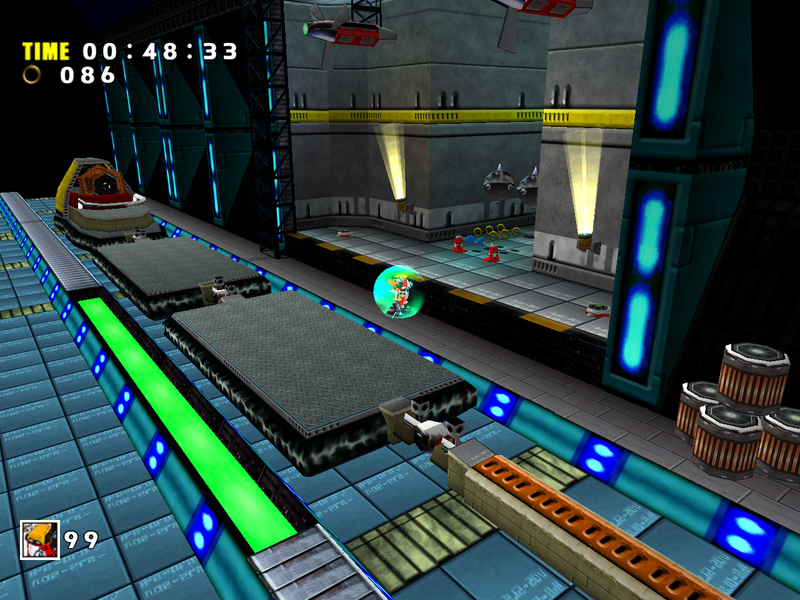 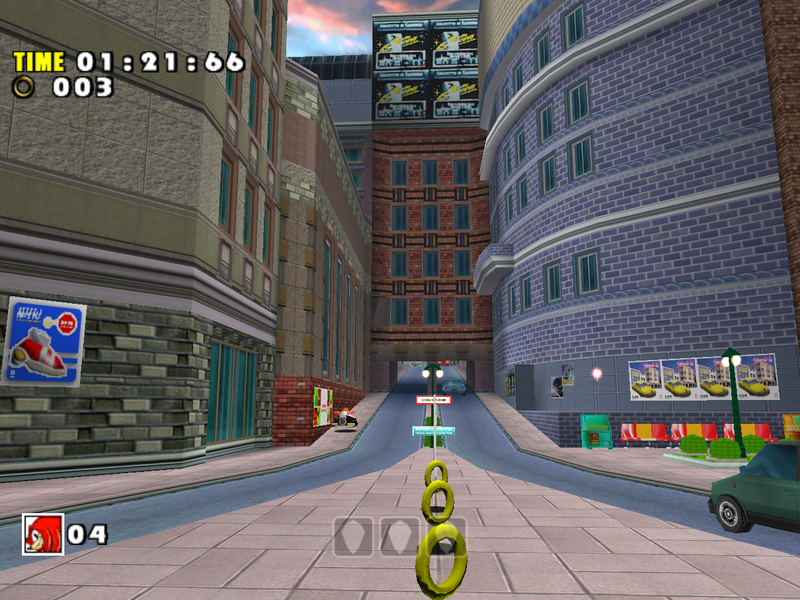 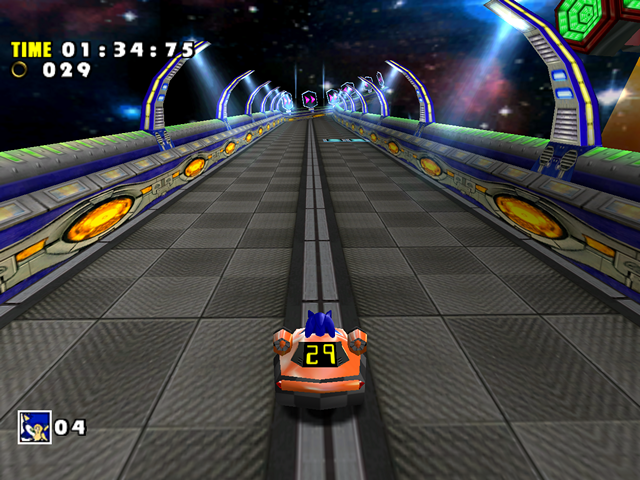 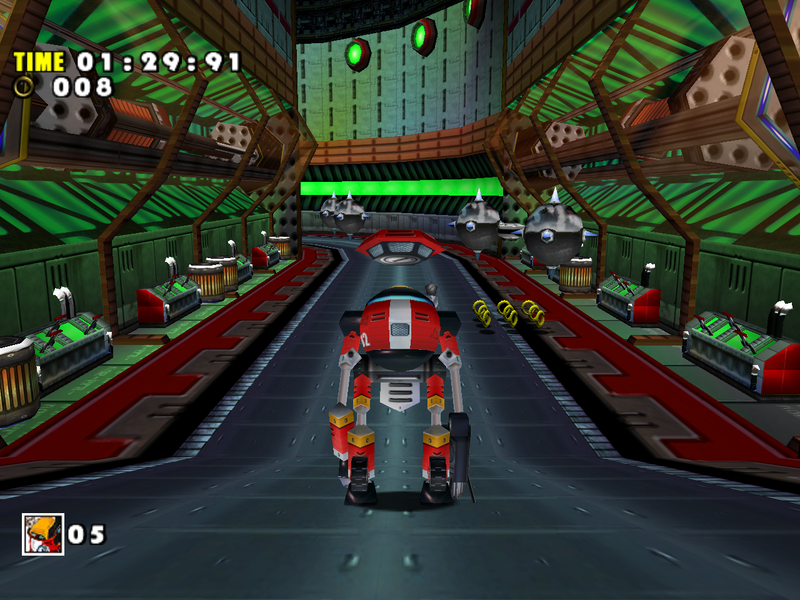 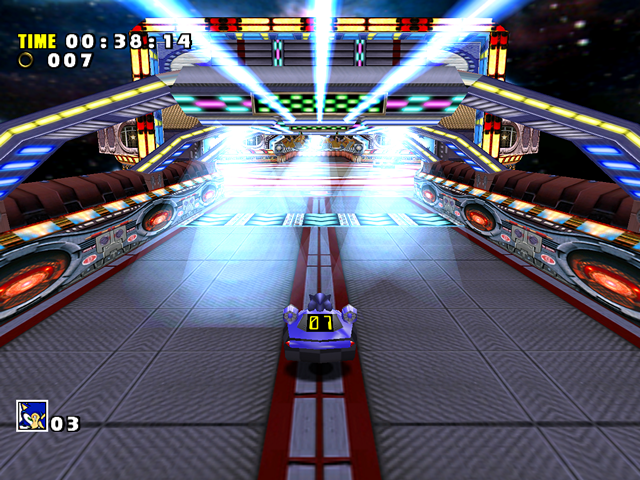 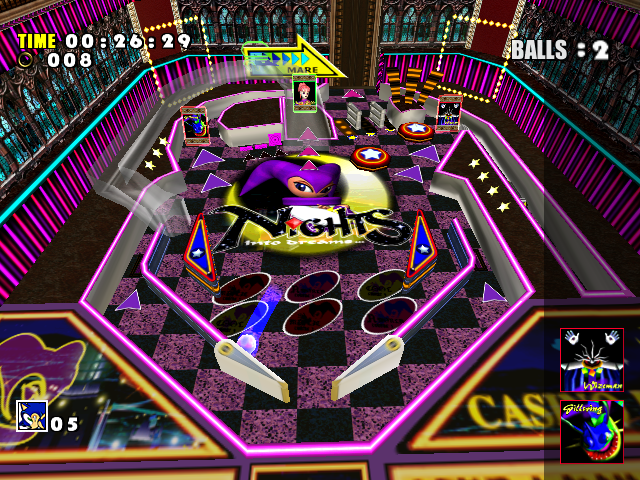 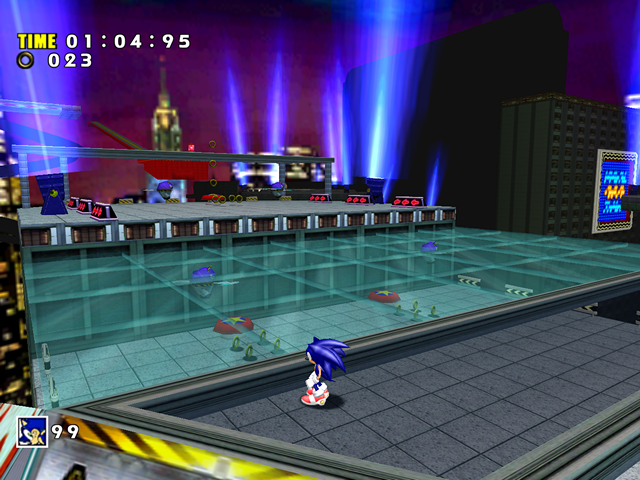 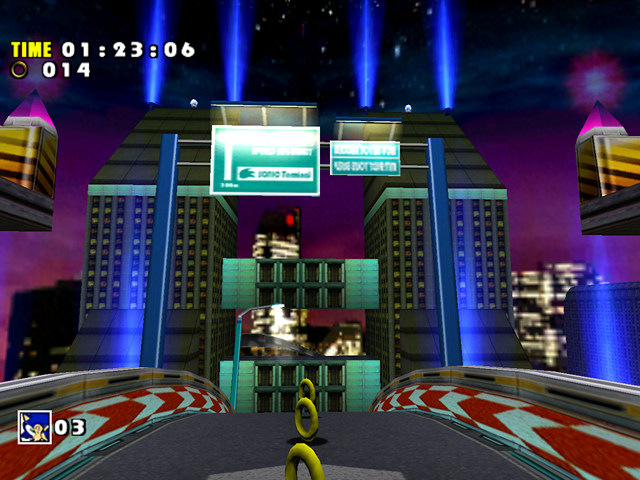 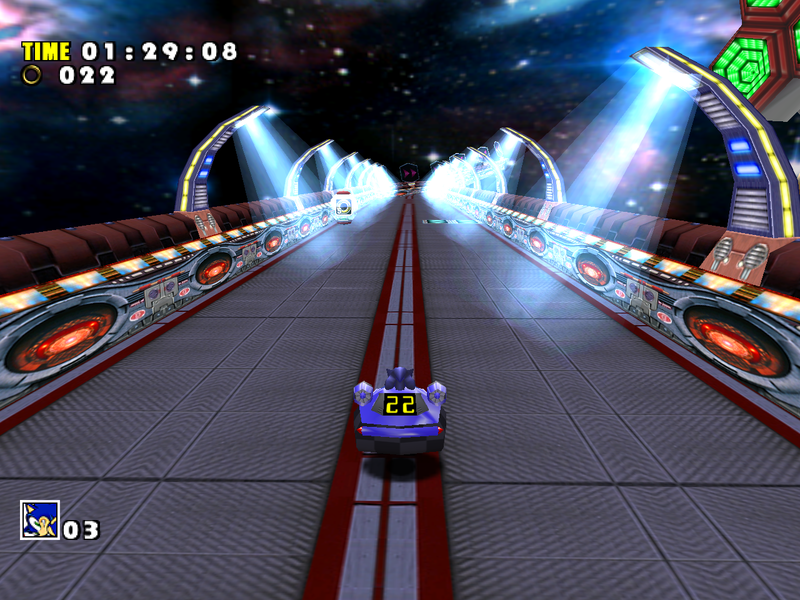 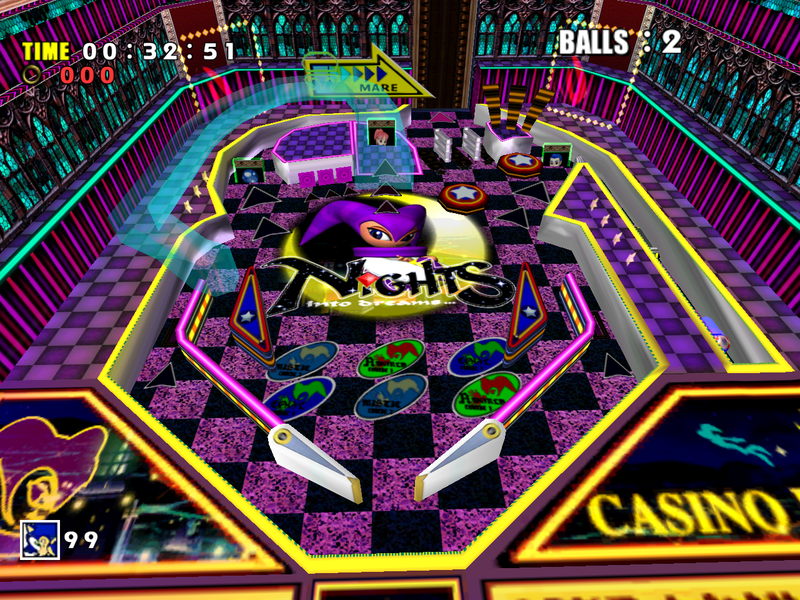 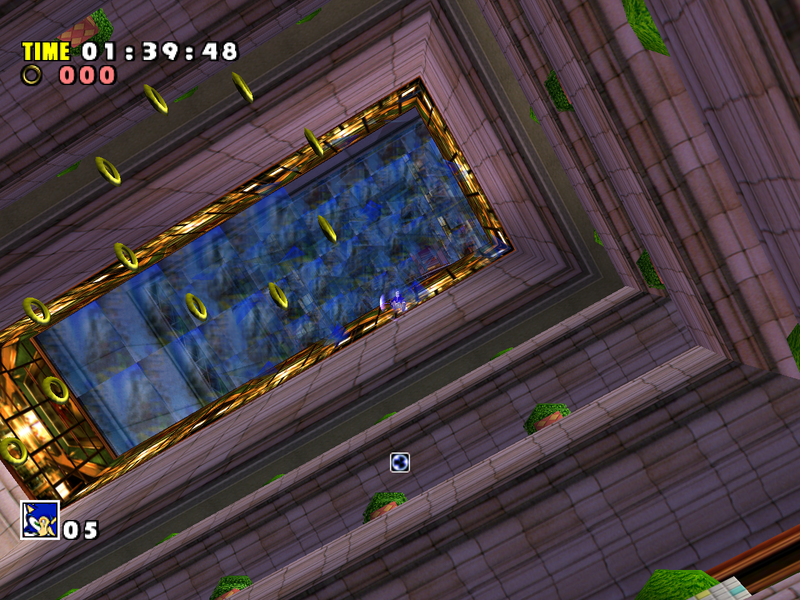 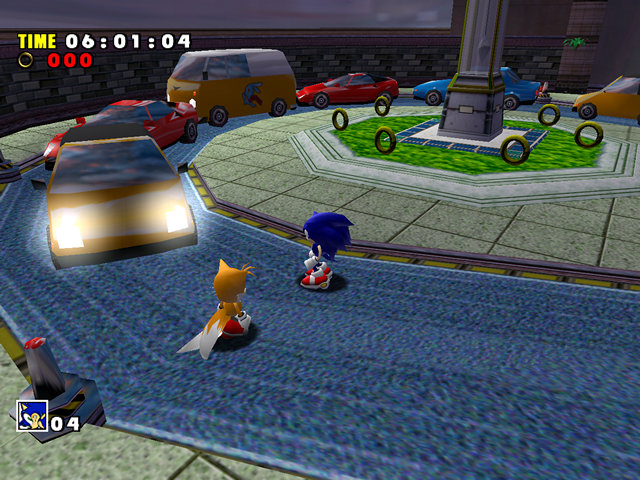 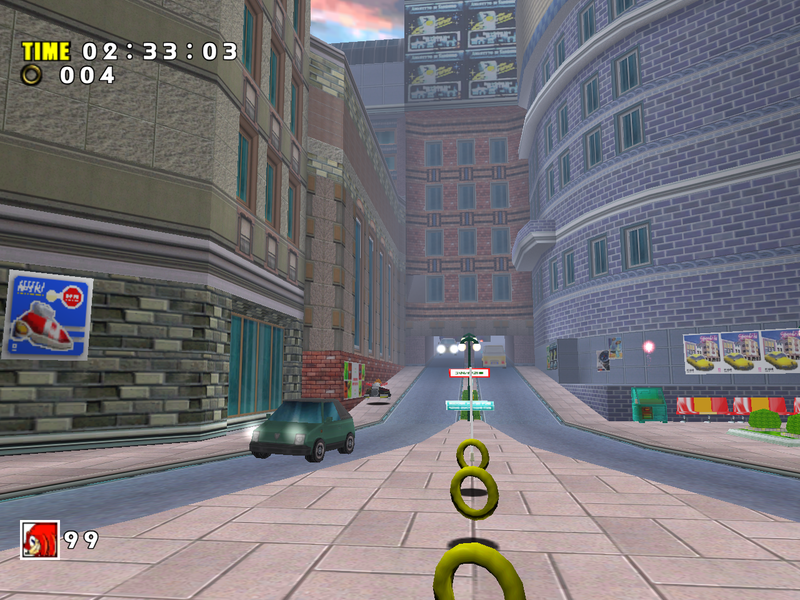 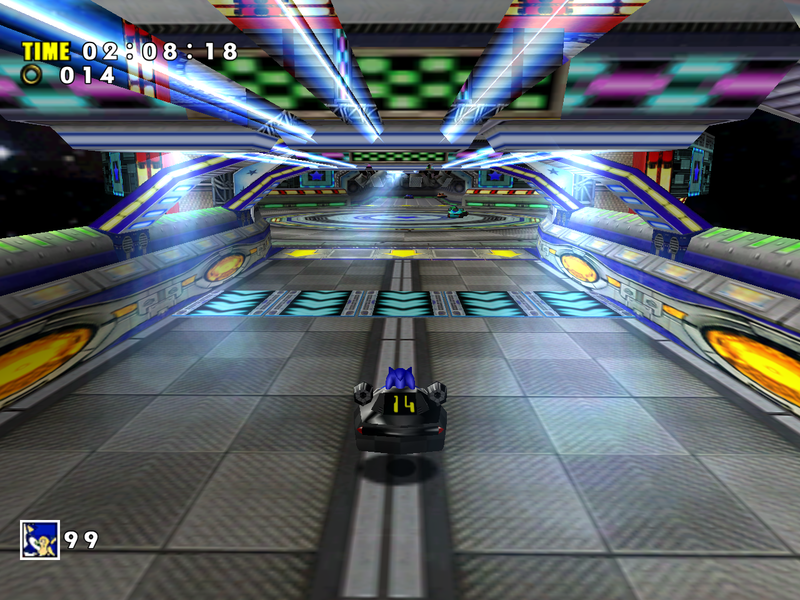 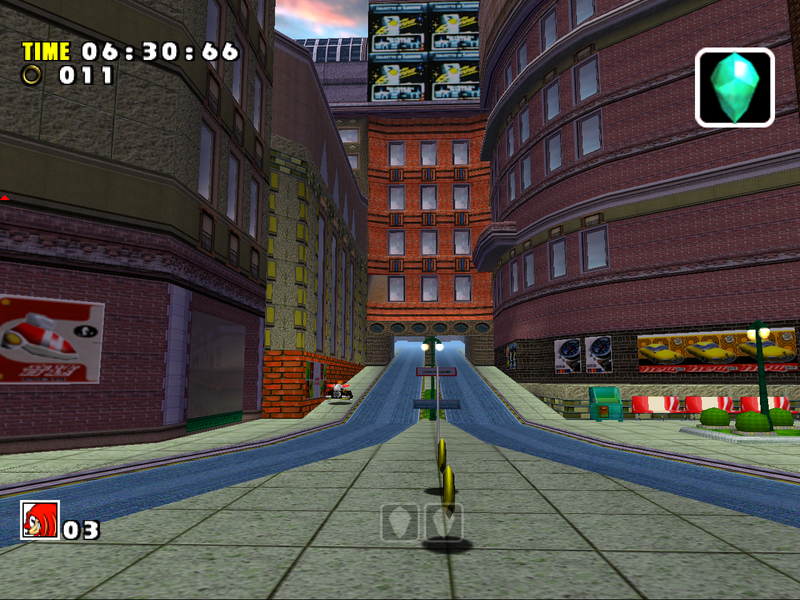 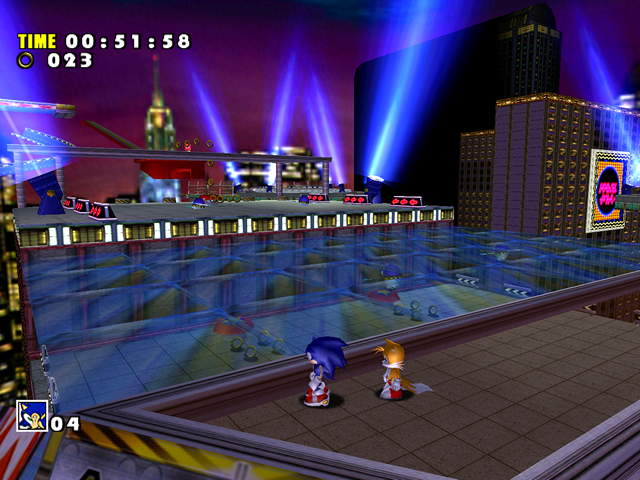 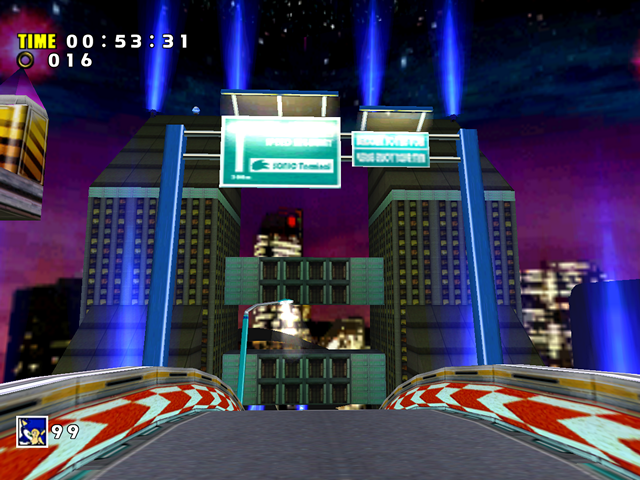 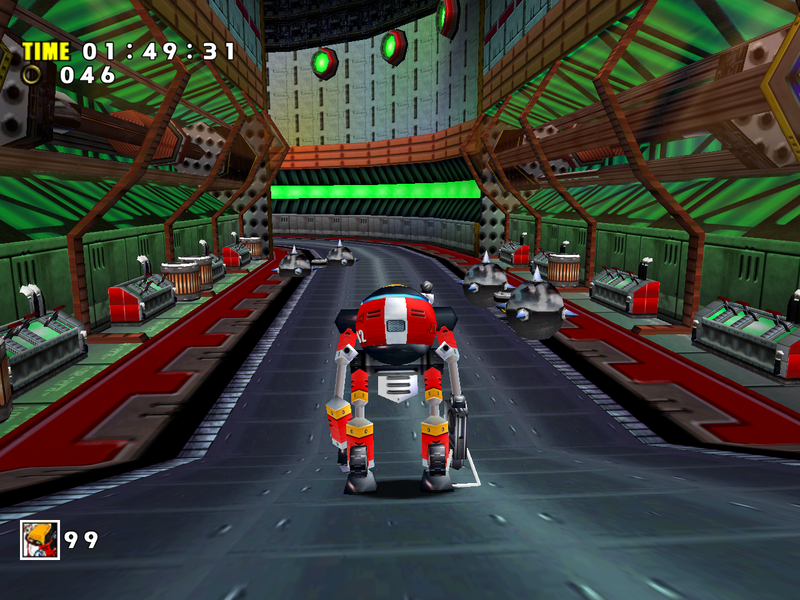 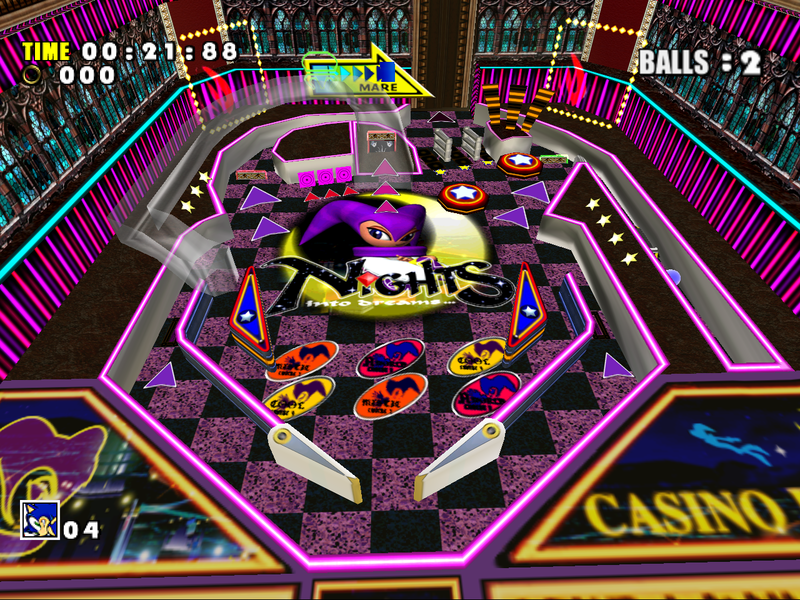 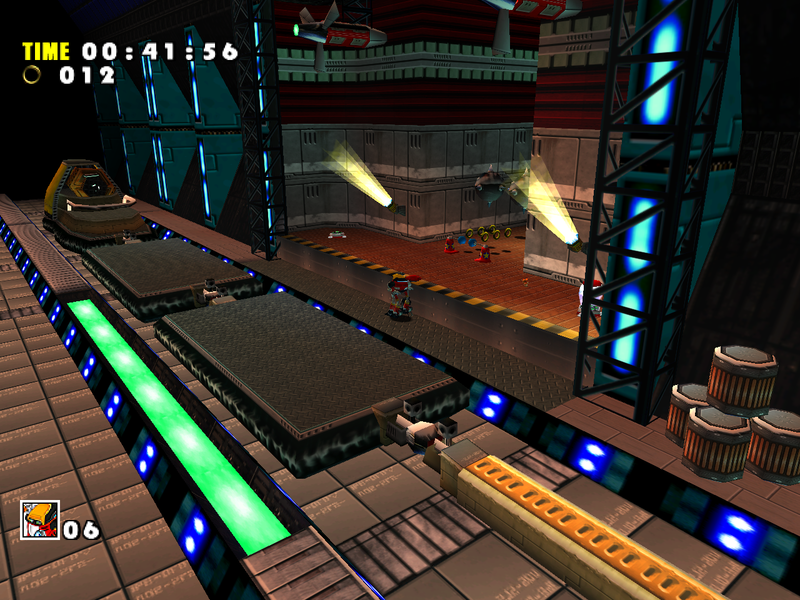 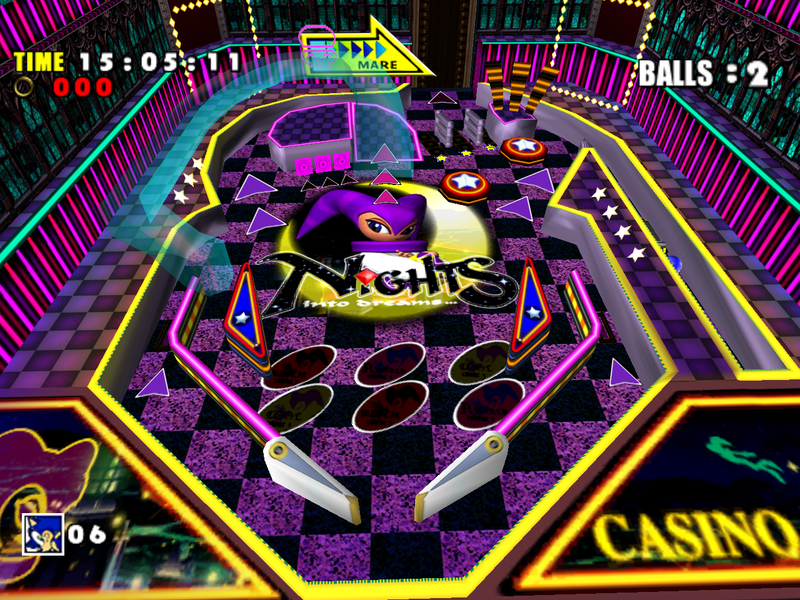 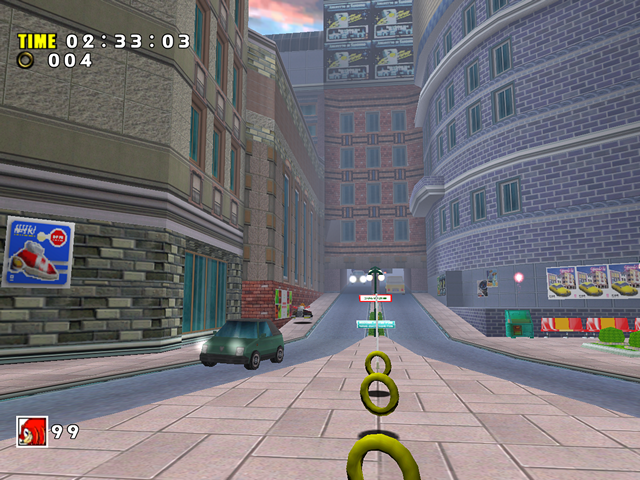 The same glass texture can be seen in Station Square, Speed Highway and Chaos 0. The giant fan areas have also been redesigned slightly. 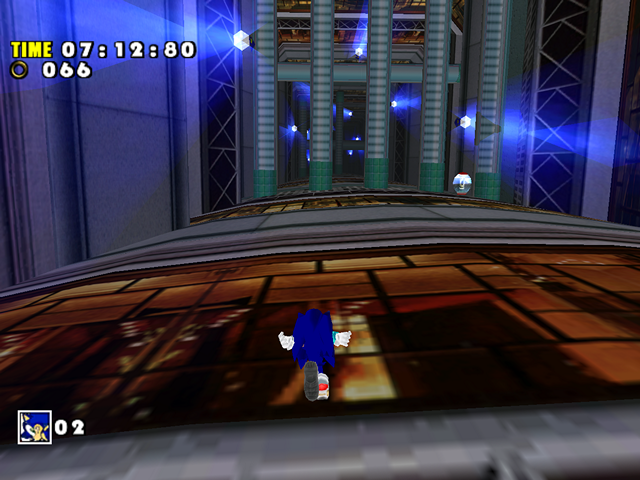 Outside of downgraded lighting, the change does not involve any particular downgrades (or improvements for that matter). 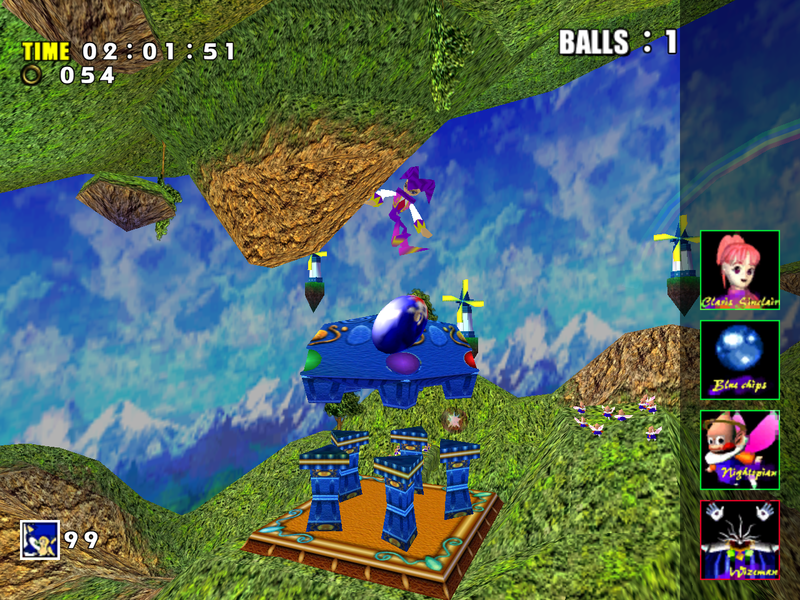 Looking at these screenshots side by side makes it hard to tell which is the supposedly enhanced version, especially considering the original game’s richer color scheme and more vibrant character lighting. 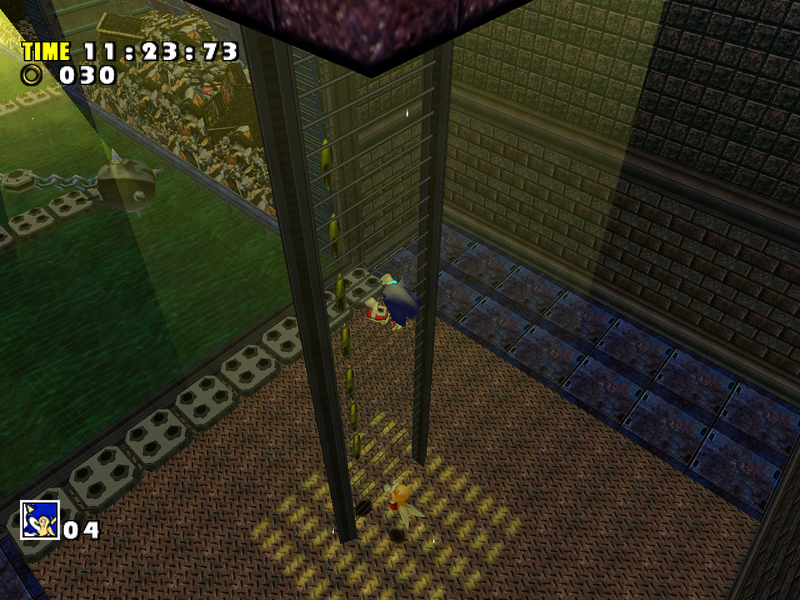 The strange-looking square on the floor near the end of the level is supposed to be a light texture. 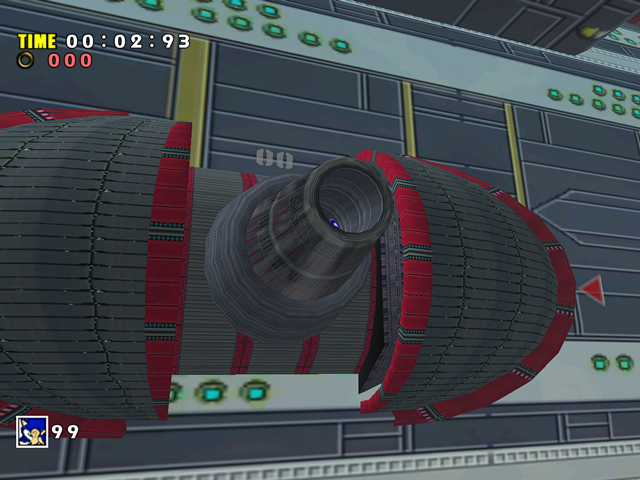 It is using an incorrect blending mode, which makes it look like grating. 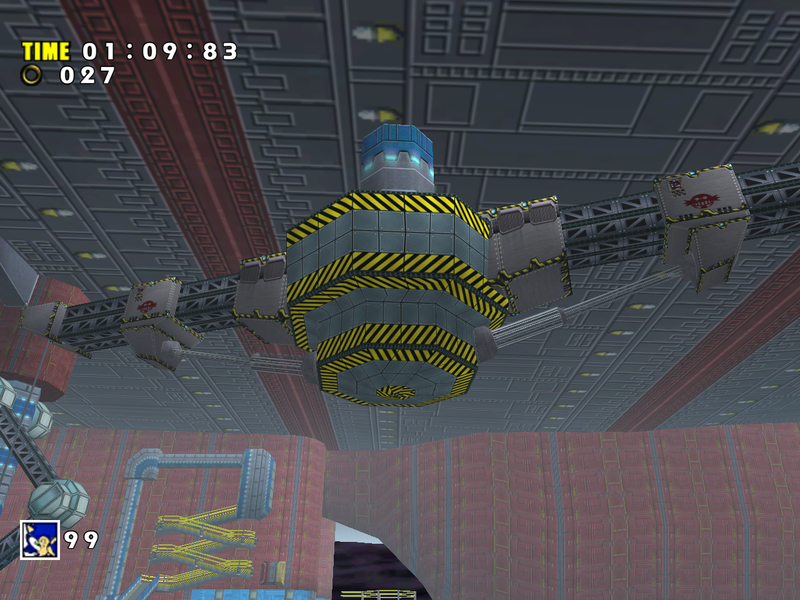 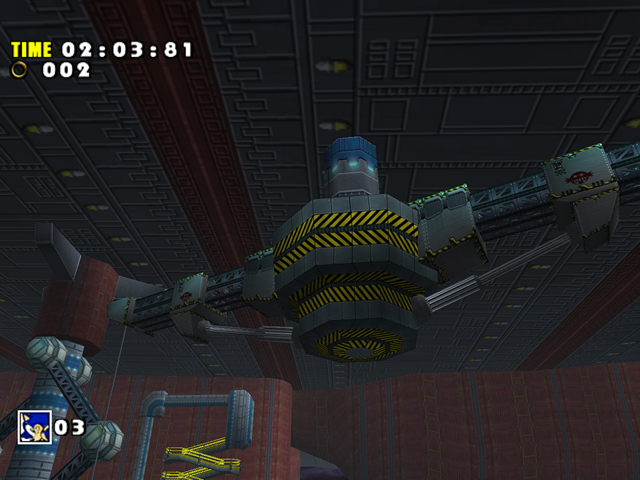 Note how the big ceiling light is also missing in SADX. 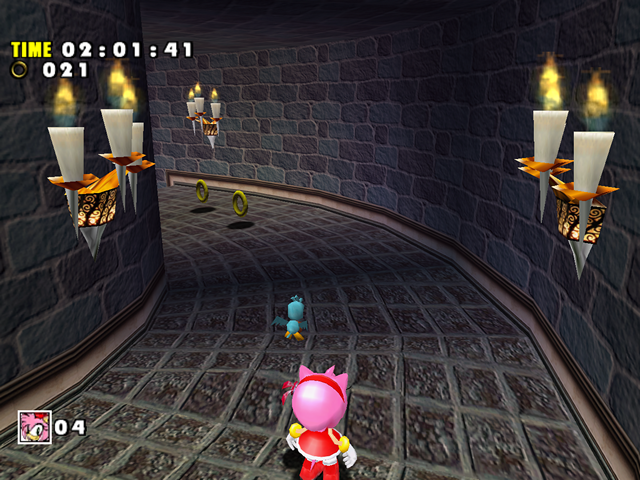 The second NiGHTS area also has some lighting differences. 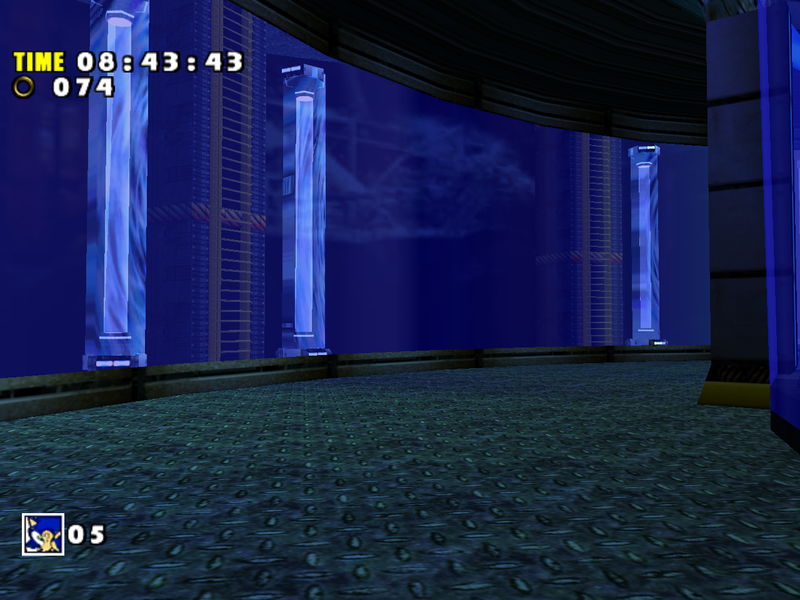 The scrolling effect on the walls breaks further with each port for some reason. 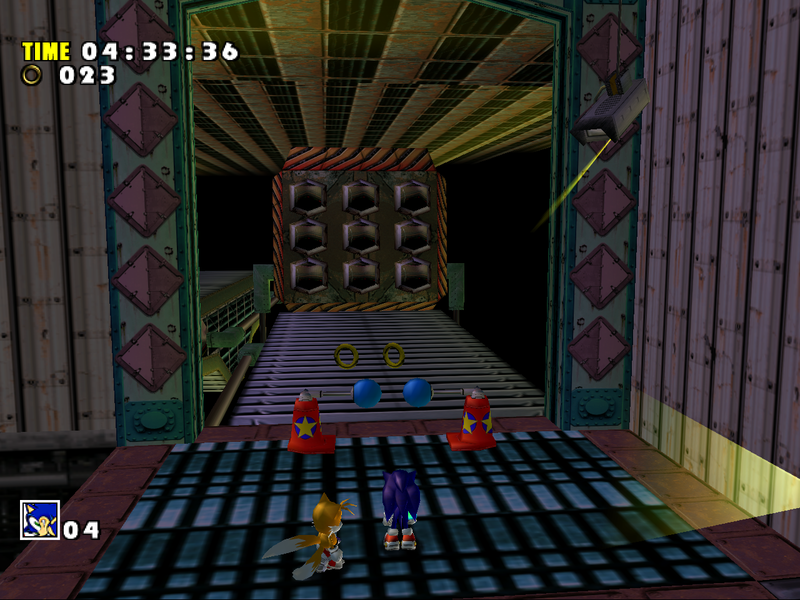 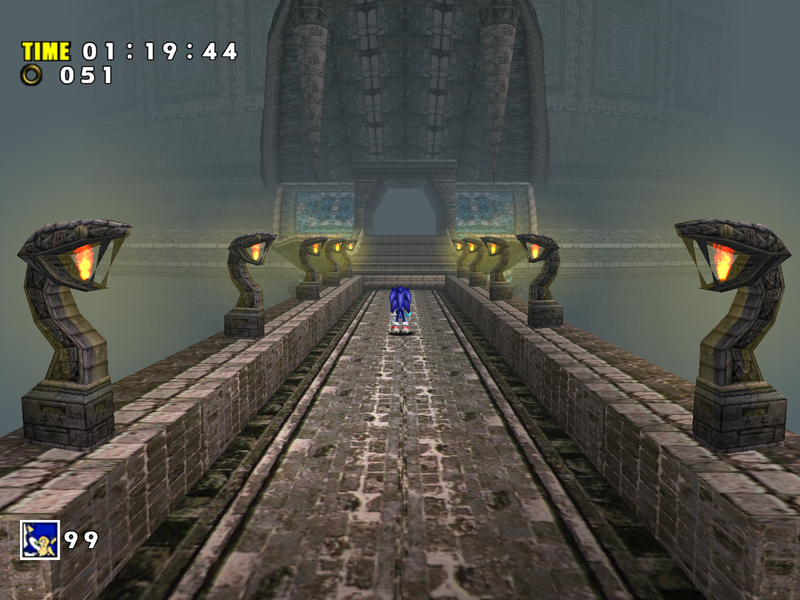 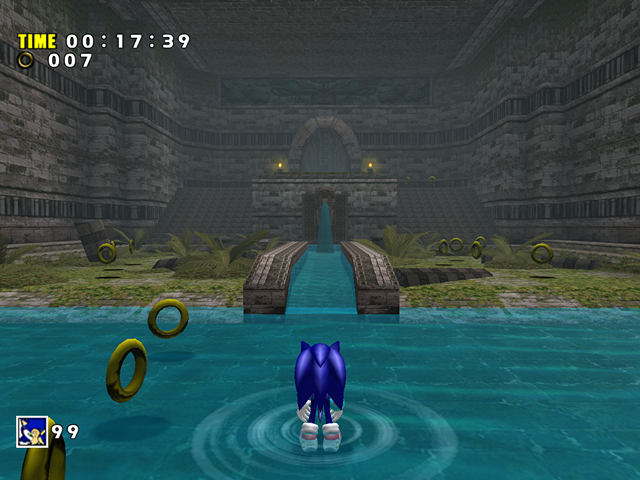 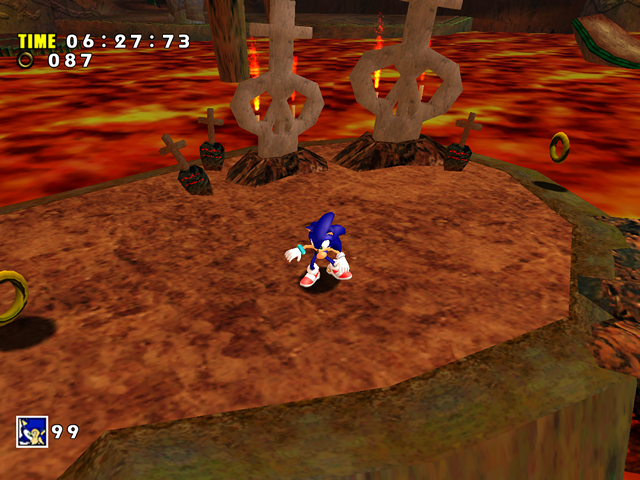 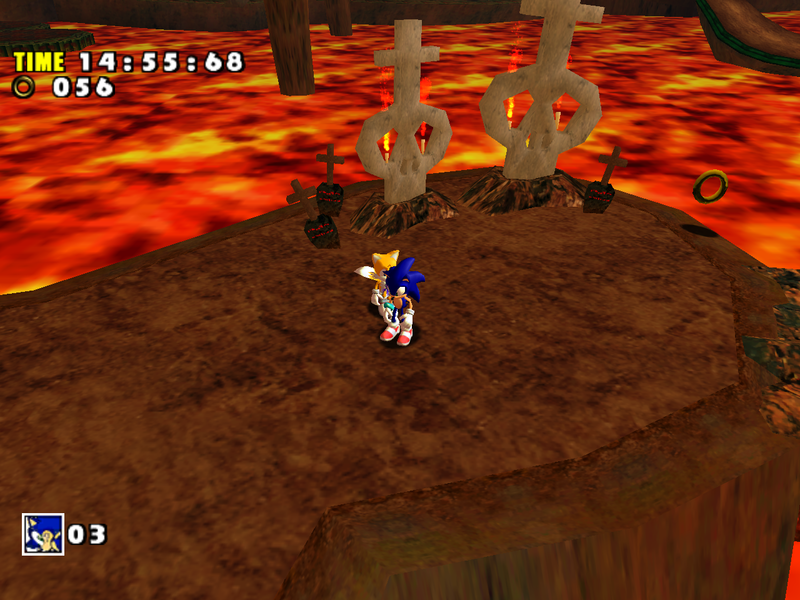 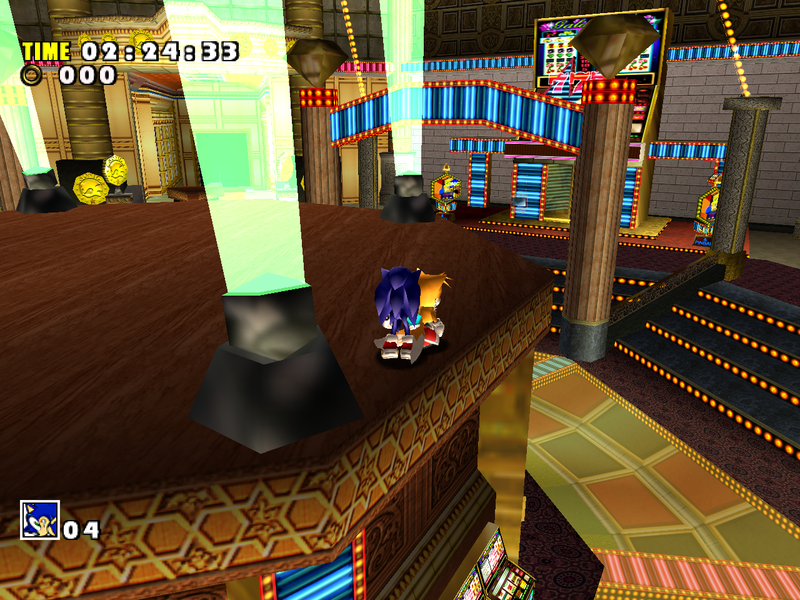 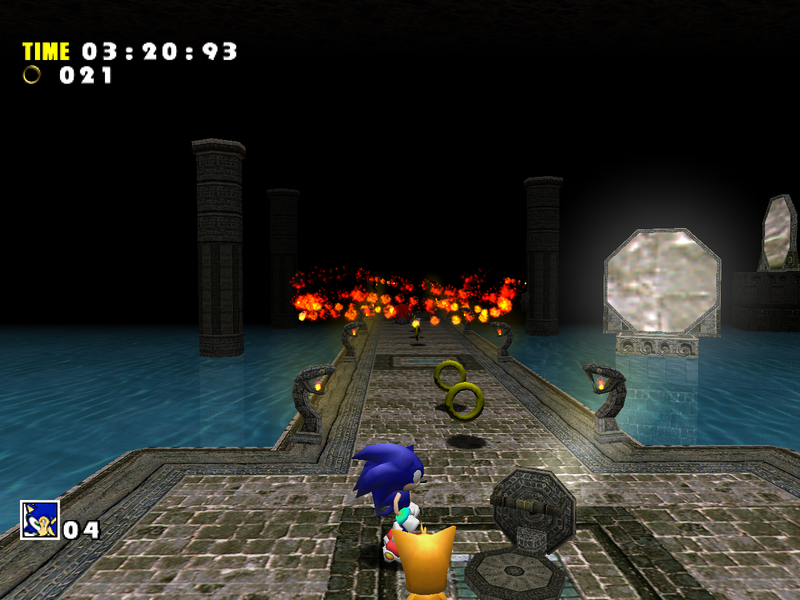 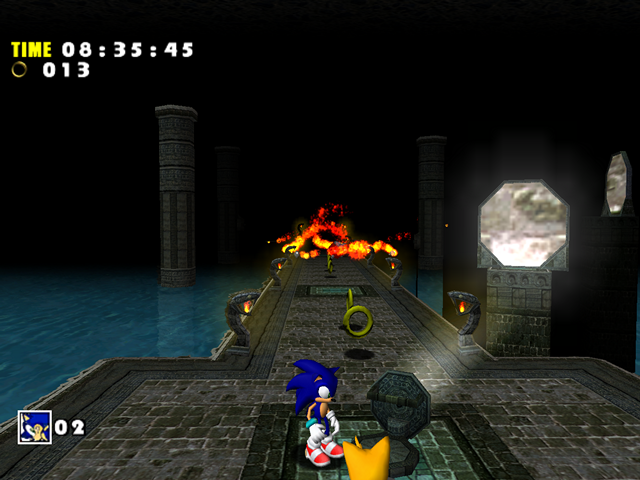 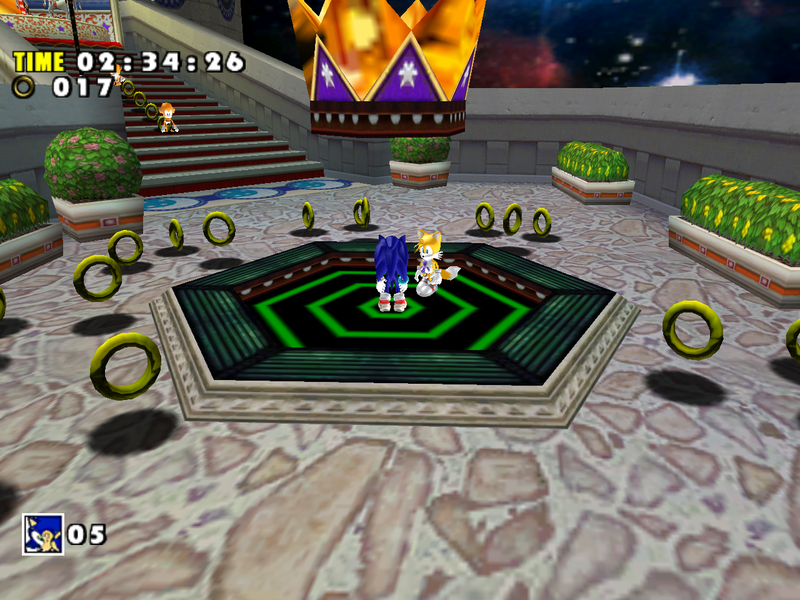 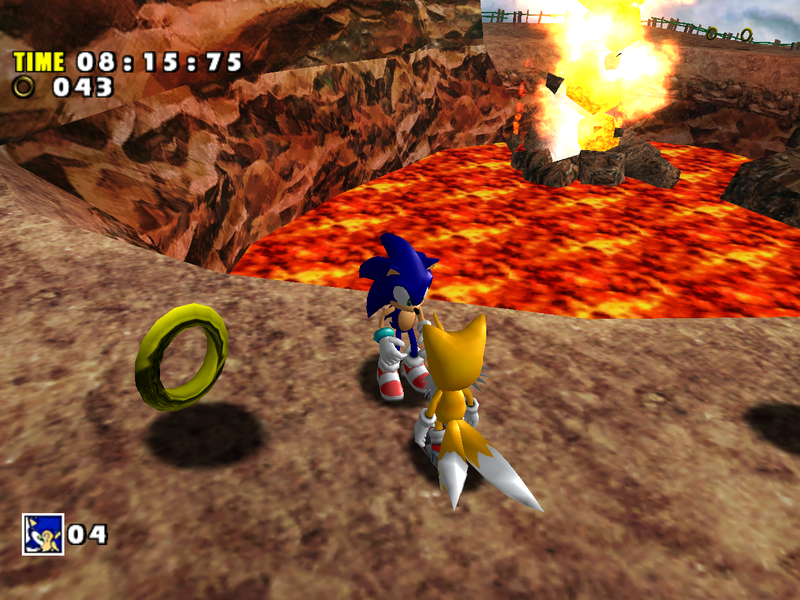 The rings NiGHTS takes Sonic through in this area are supposed to play a sound as you go through them, but this is also missing in the ports. 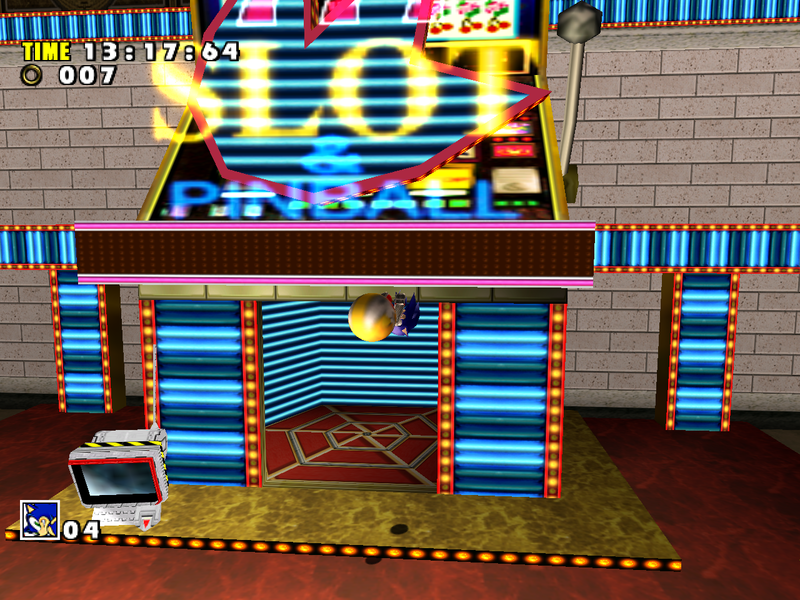 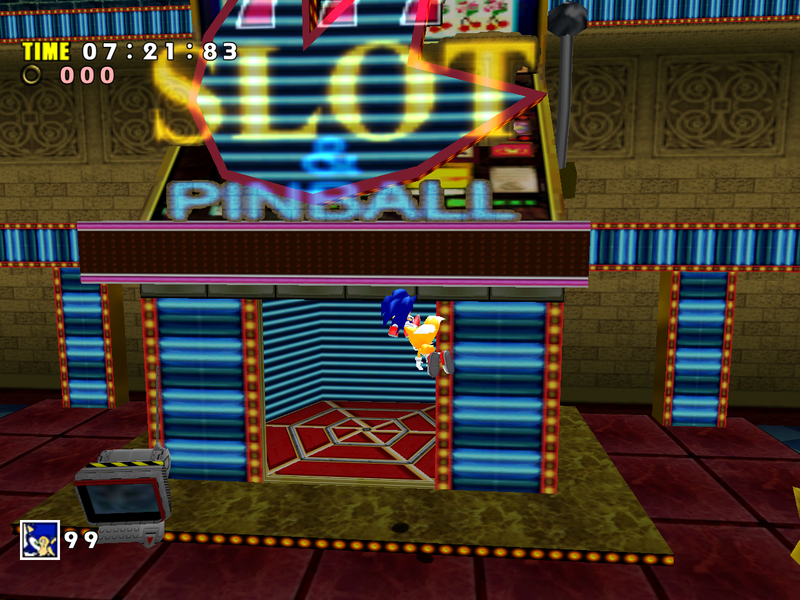 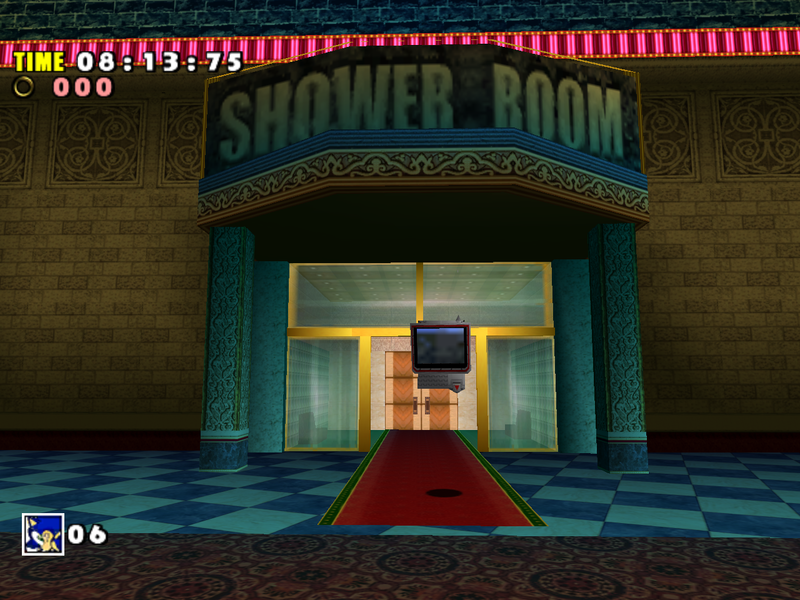 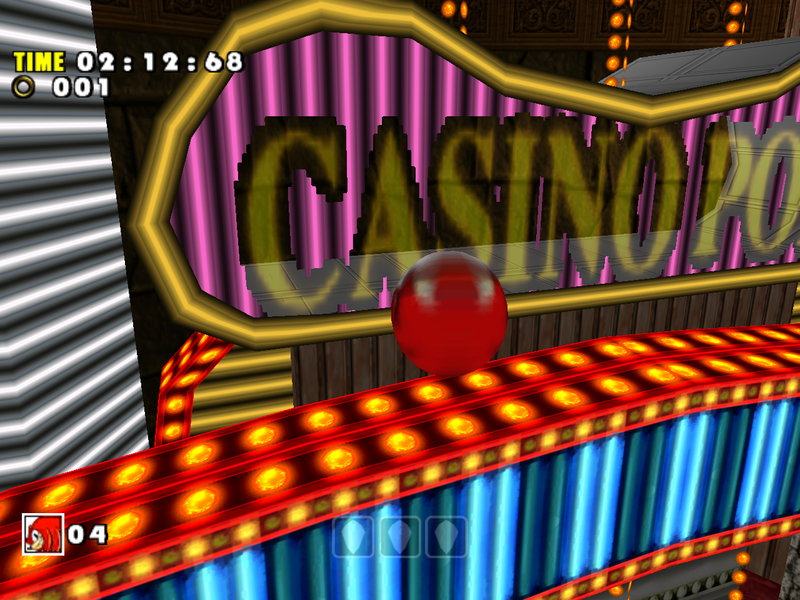 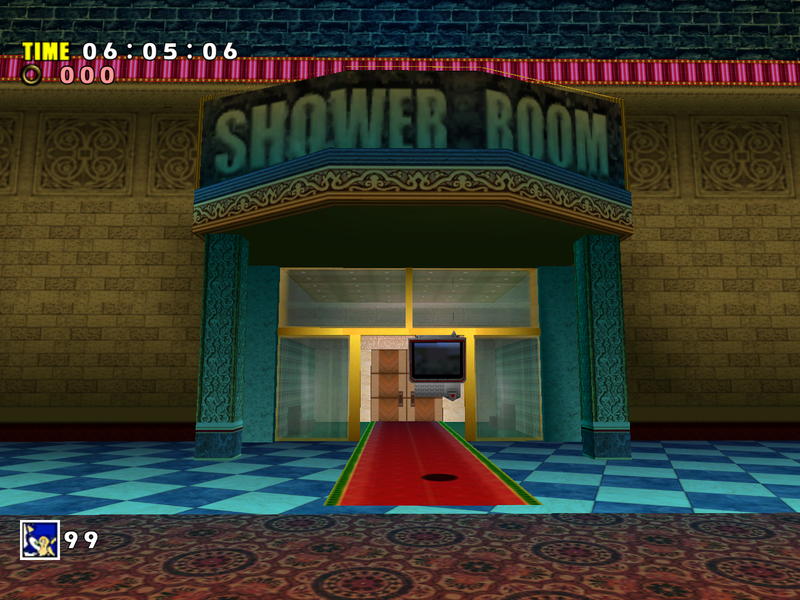 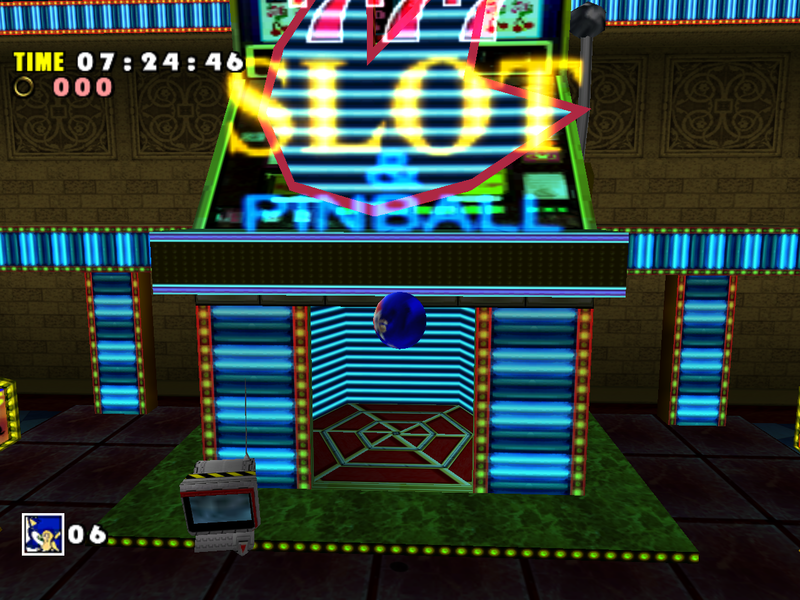 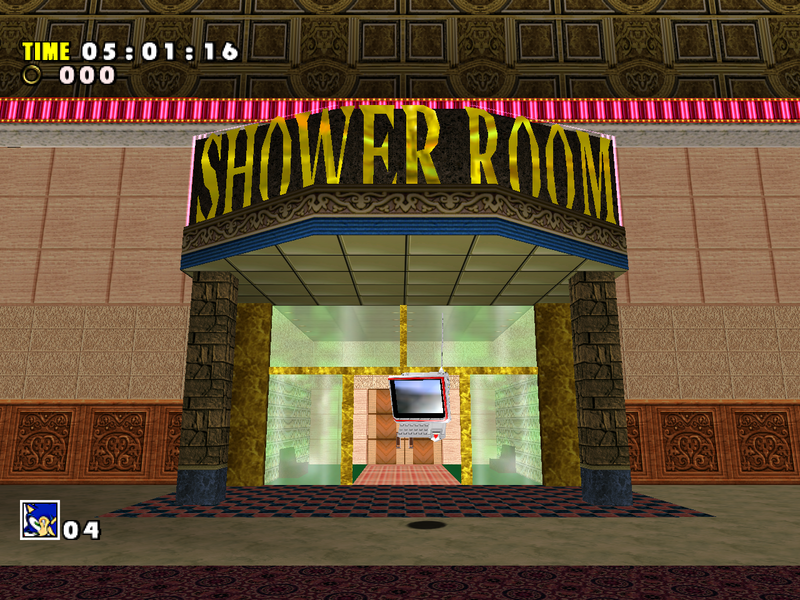 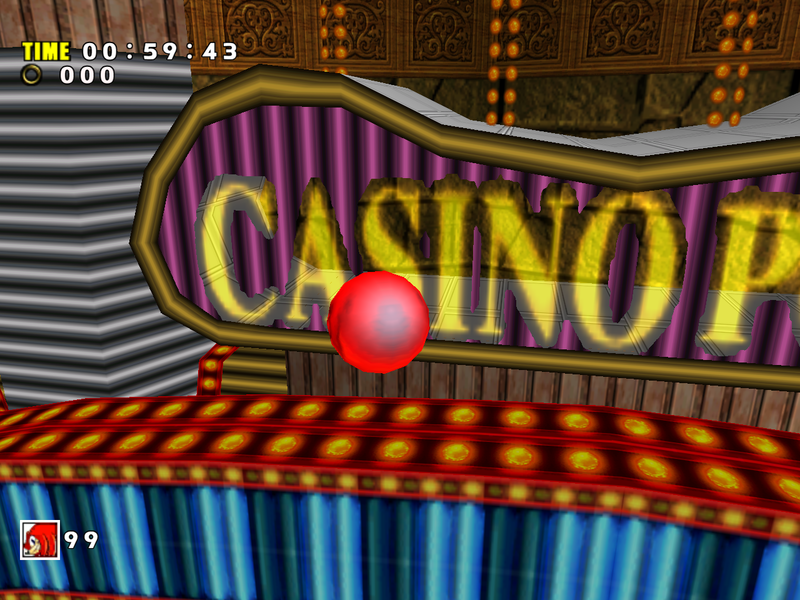 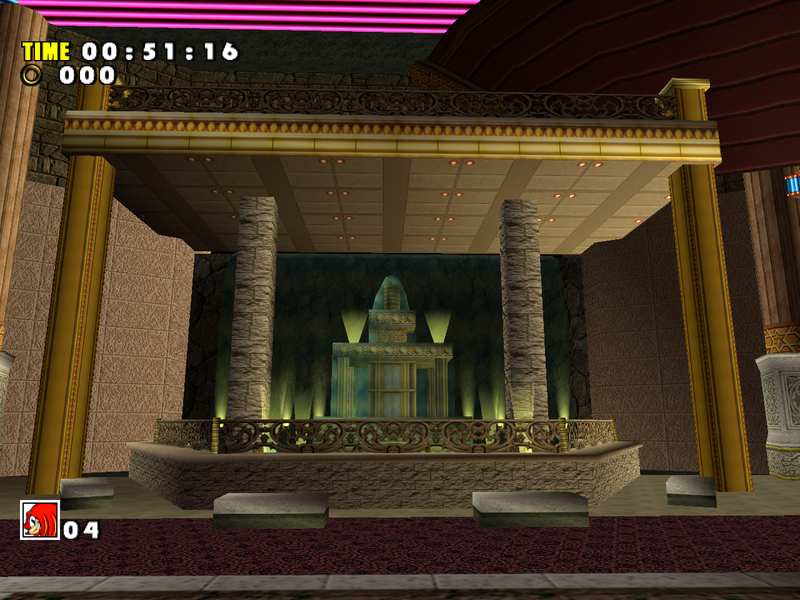 From a quick look Casino doesn’t seem heavily downgraded in SADX. 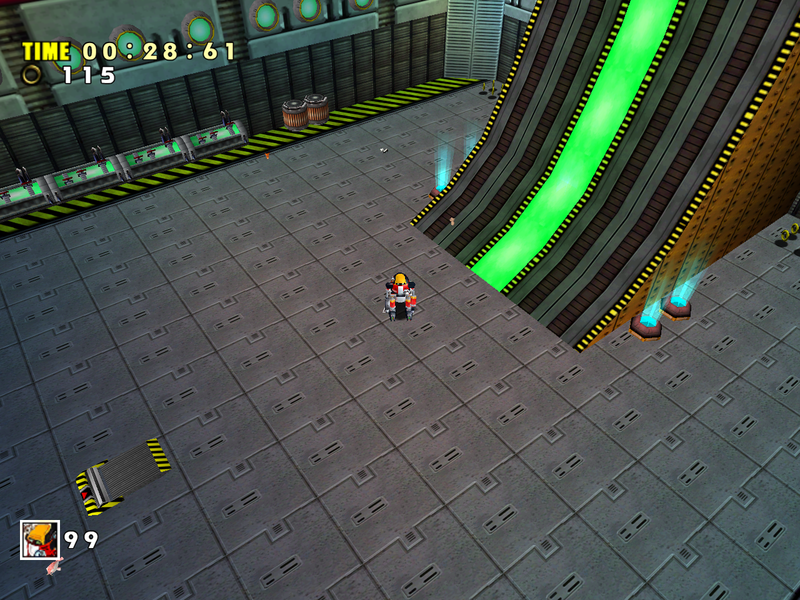 However, much detail is lost in the supposedly enhanced ports, and some parts of the level are broken. 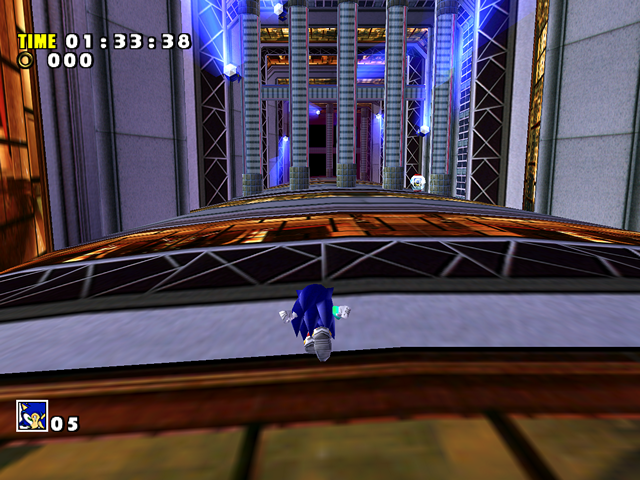 This level (particularly the second act) benefits greatly from Dreamcast lighting (restored in the PC version by the Lantern Engine mod) and fixed level models (Dreamcast Conversion mod). 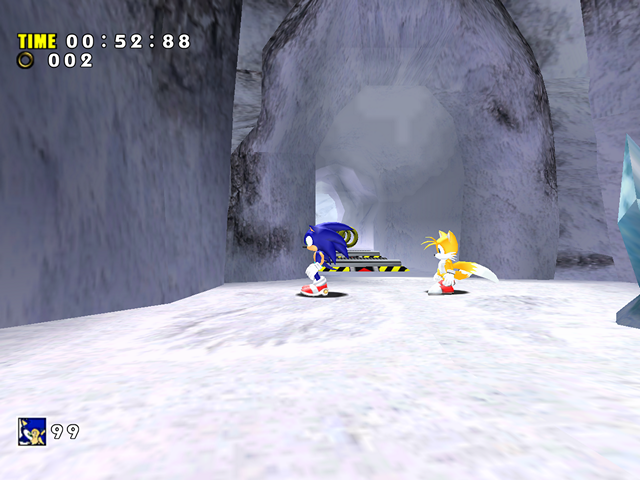 Find out how to install the mods in the section dedicated to fixing the PC version of SADX. Ice Cap is a level that received a strange redesign in SADX, if it could be called a redesign at all. 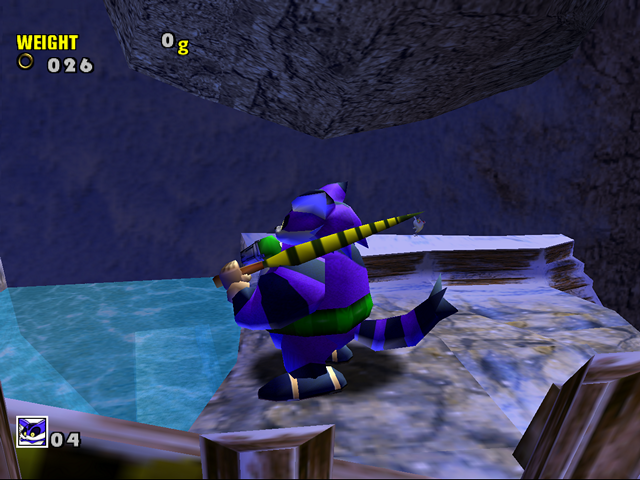 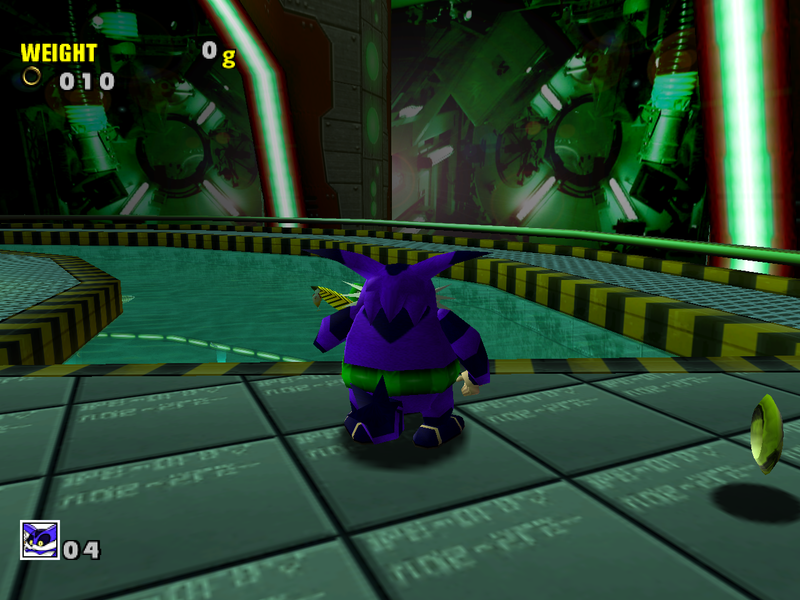 The textures were made less colorful, some effects were removed, and the lighting, especially in Big’s level, looks more basic. 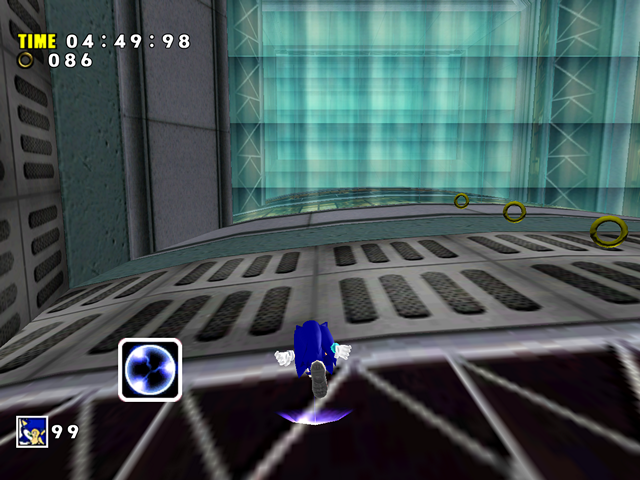 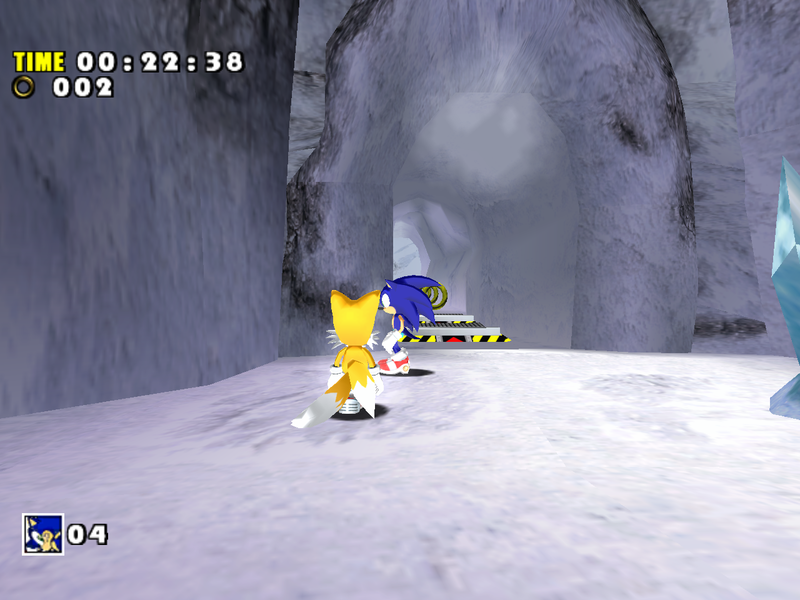 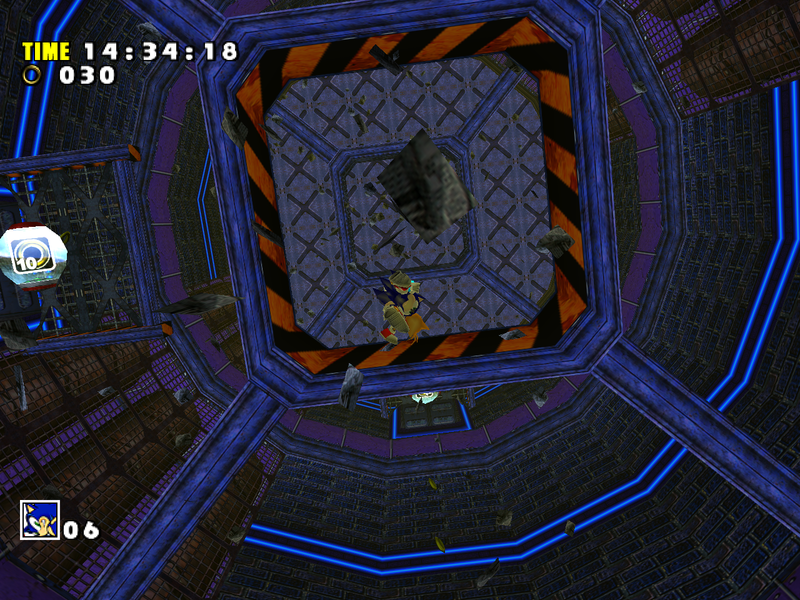 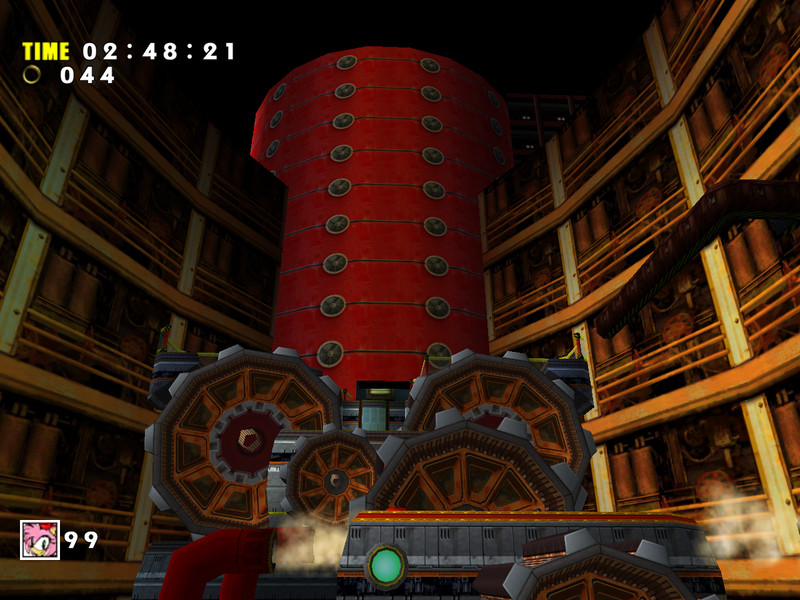 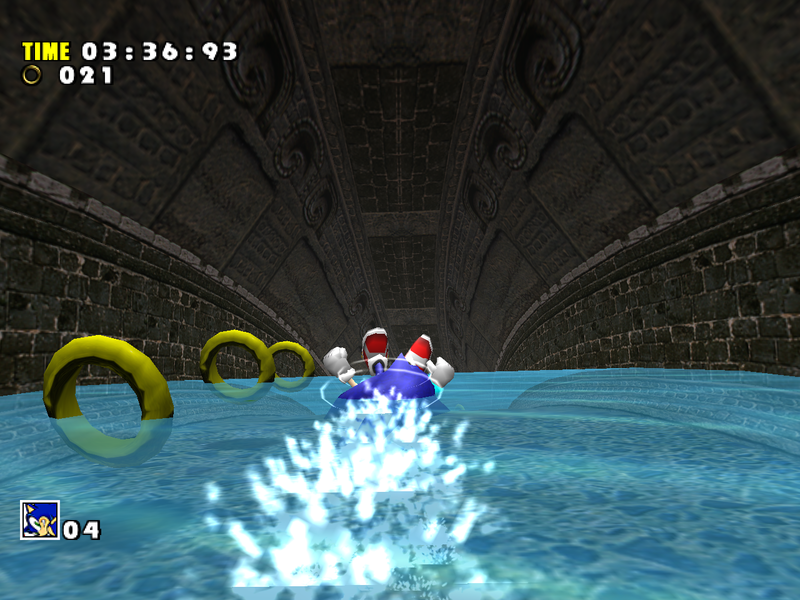 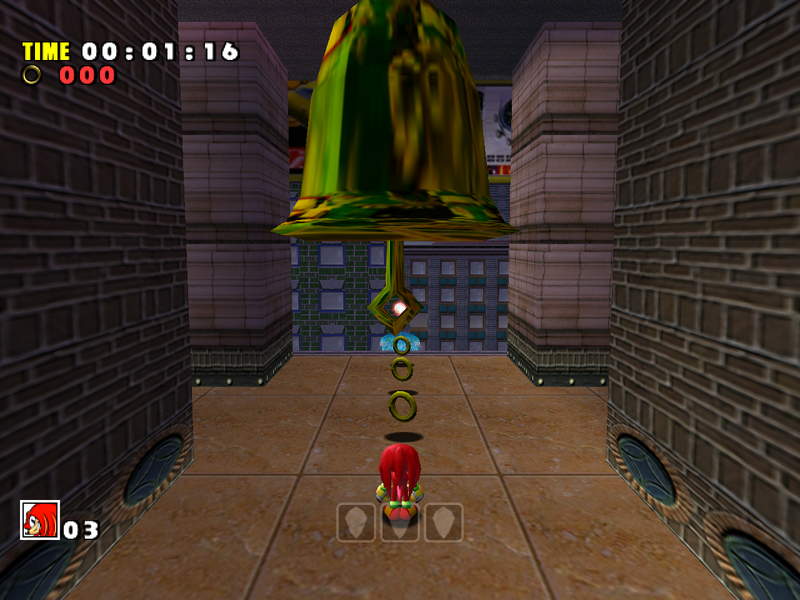 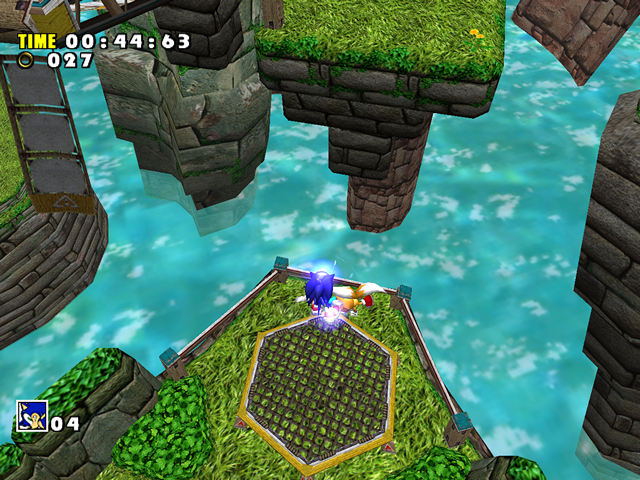 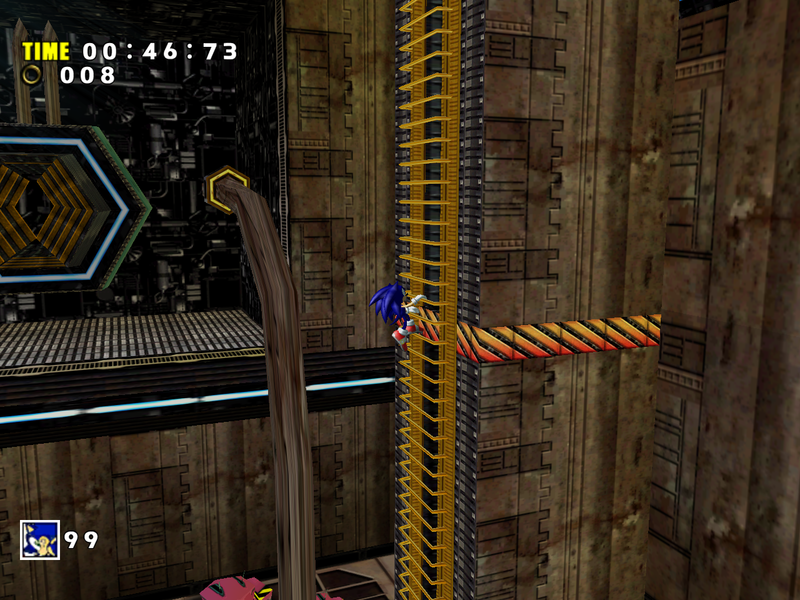 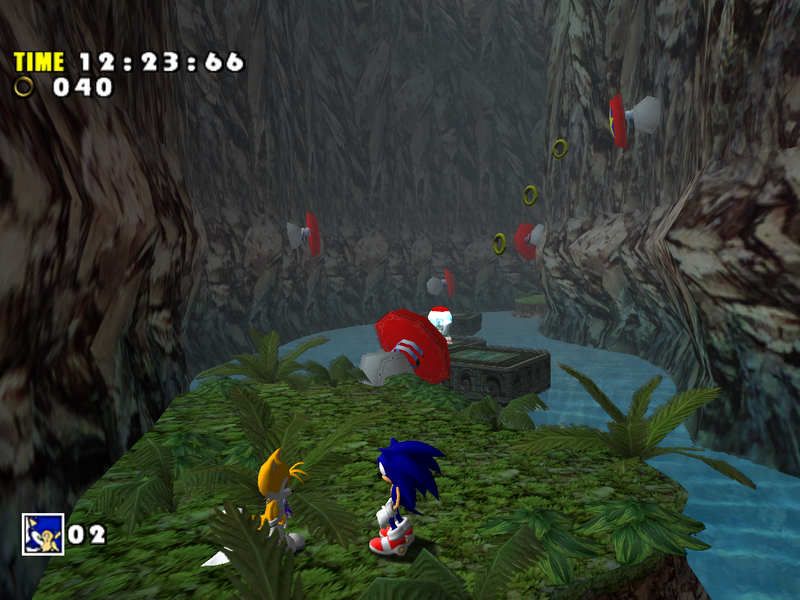 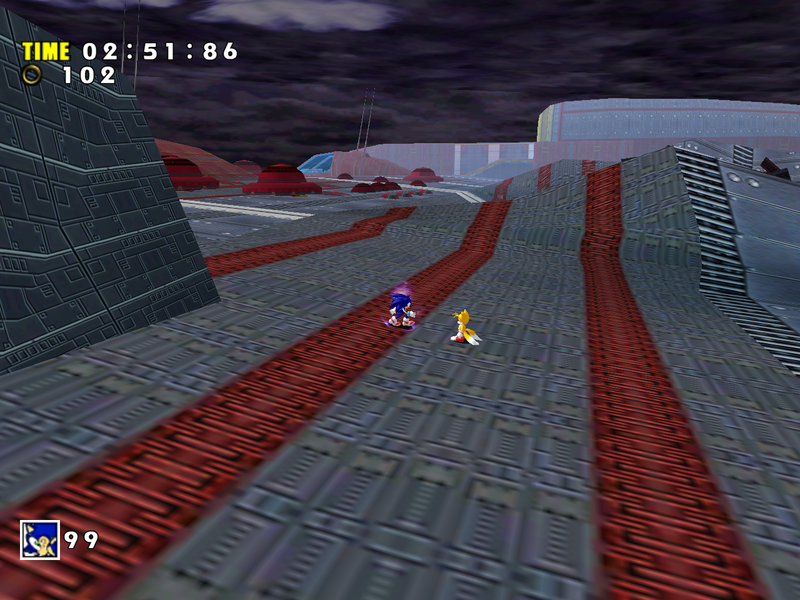 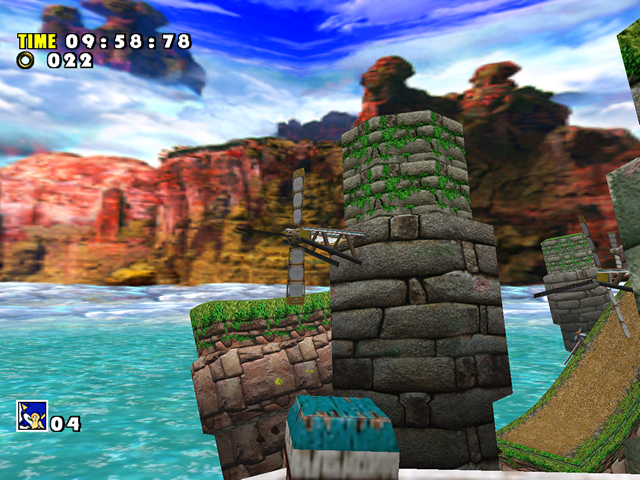 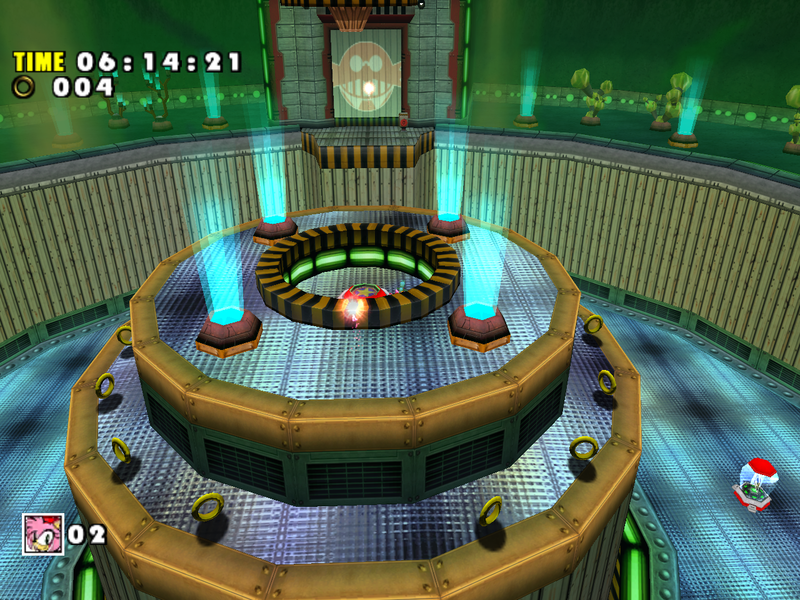 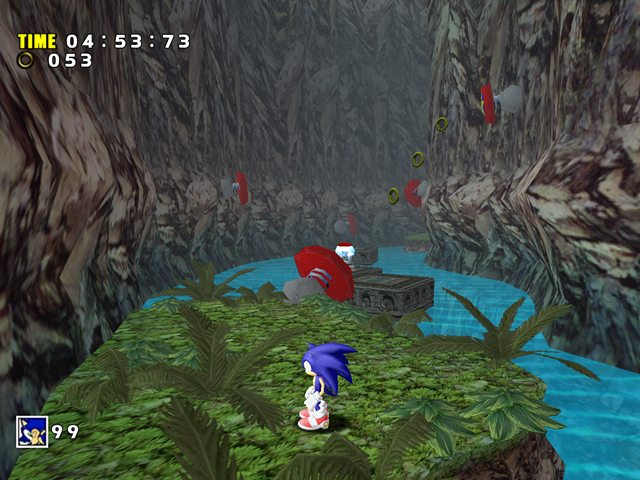 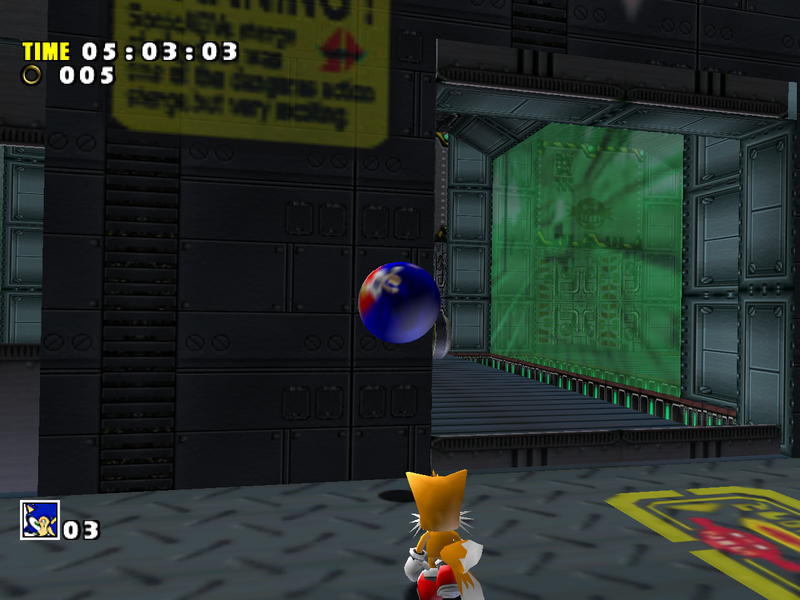 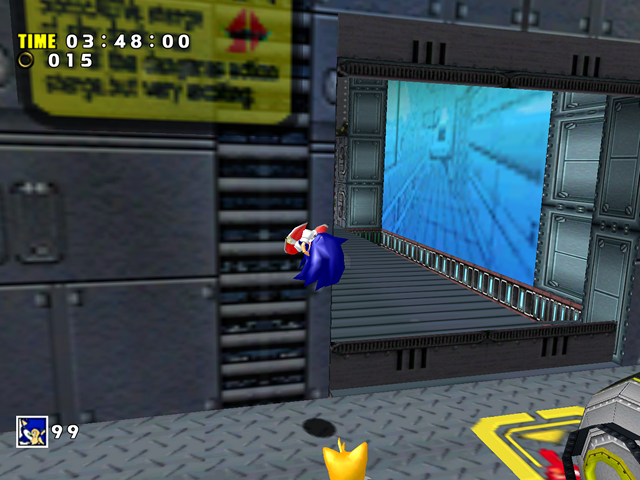 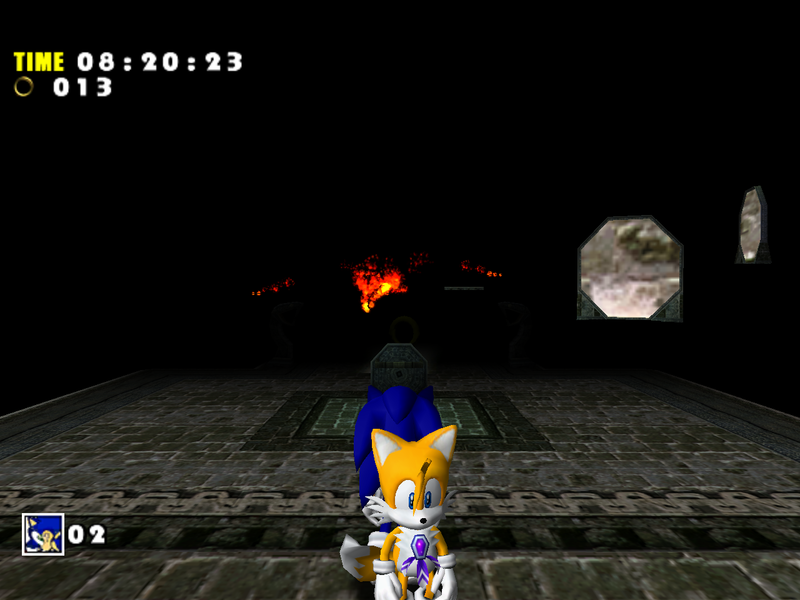 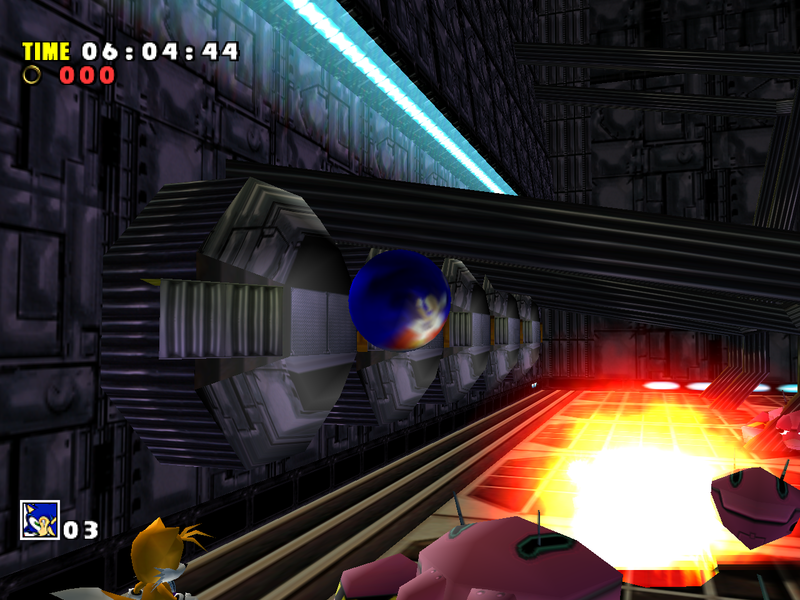 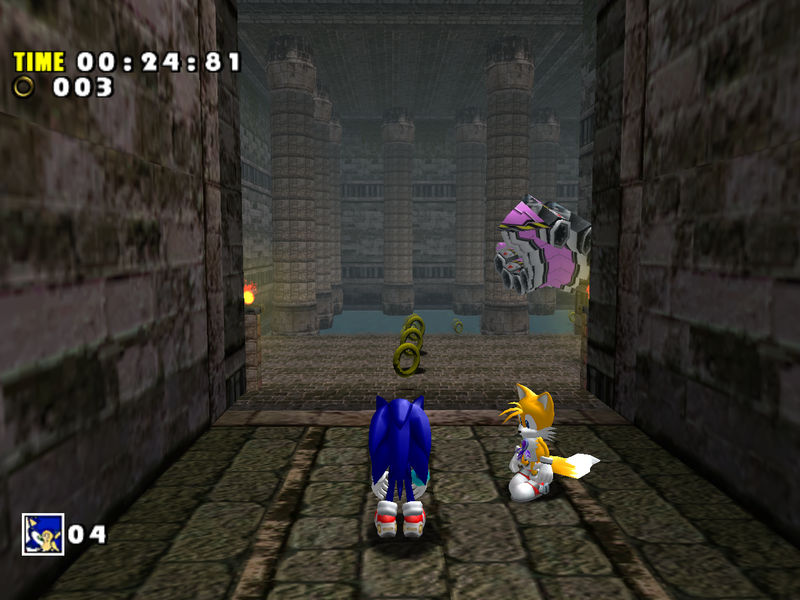 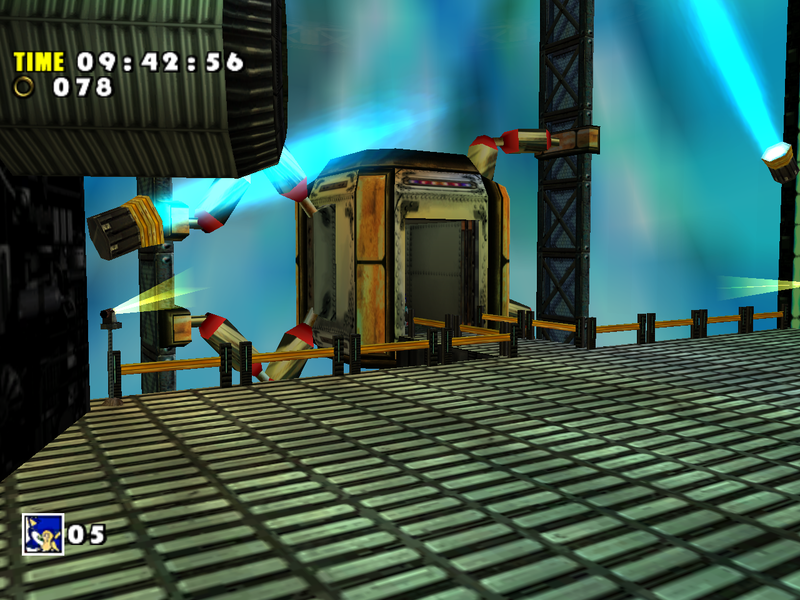 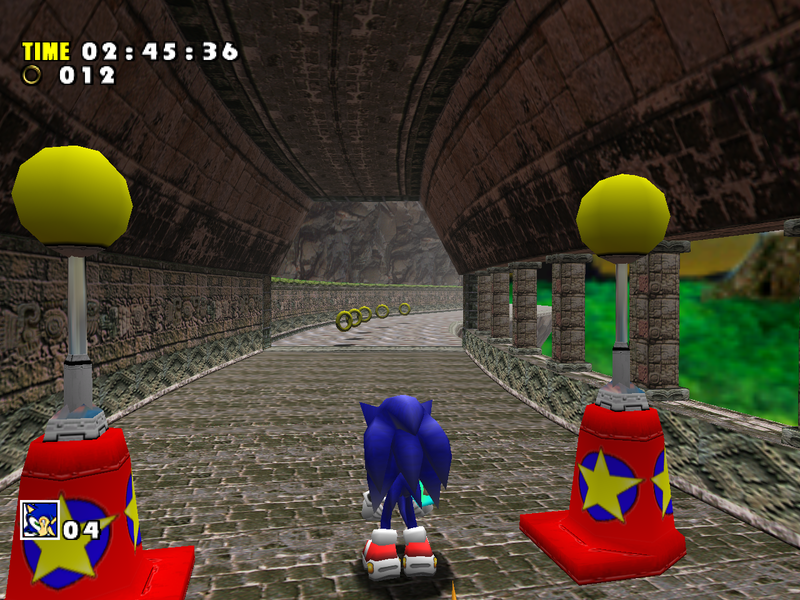 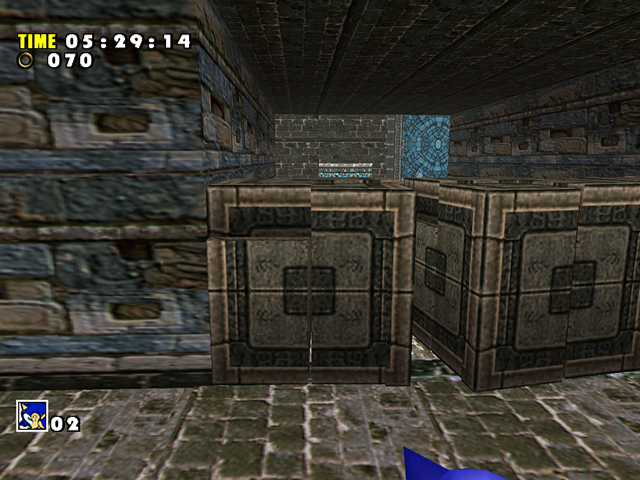 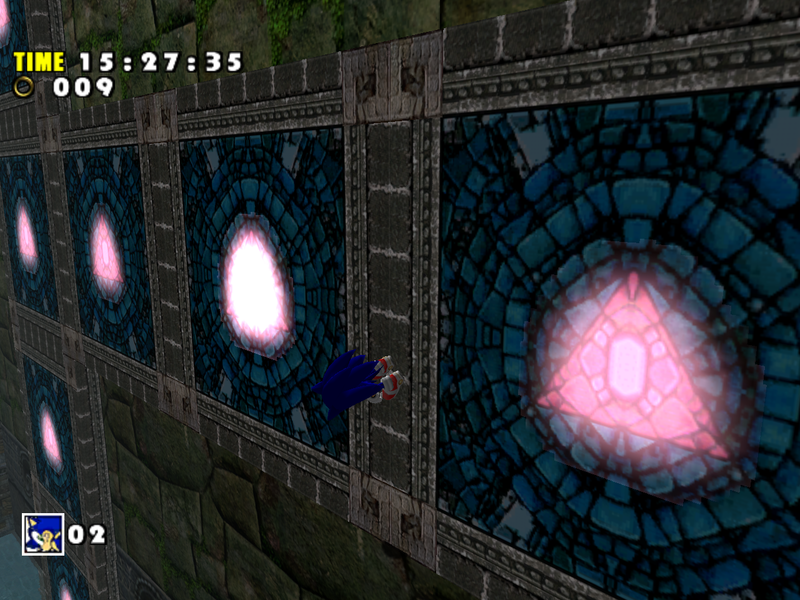 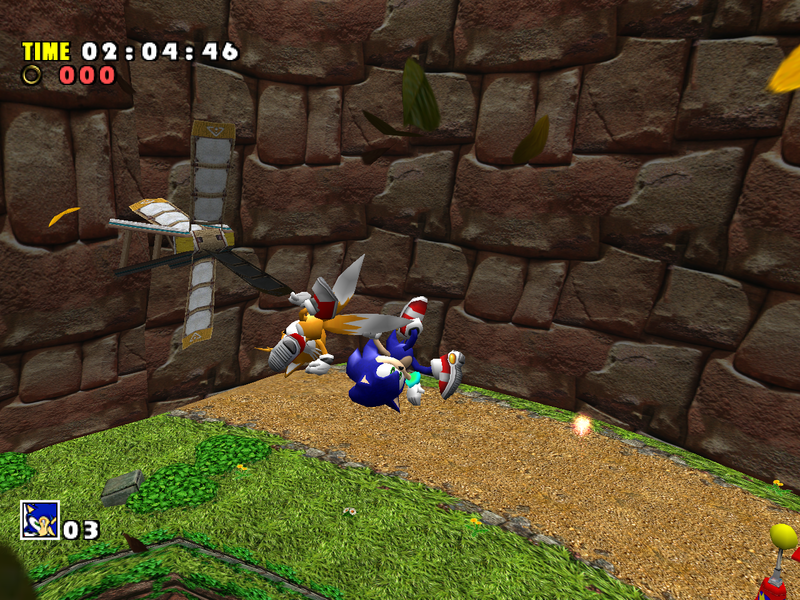 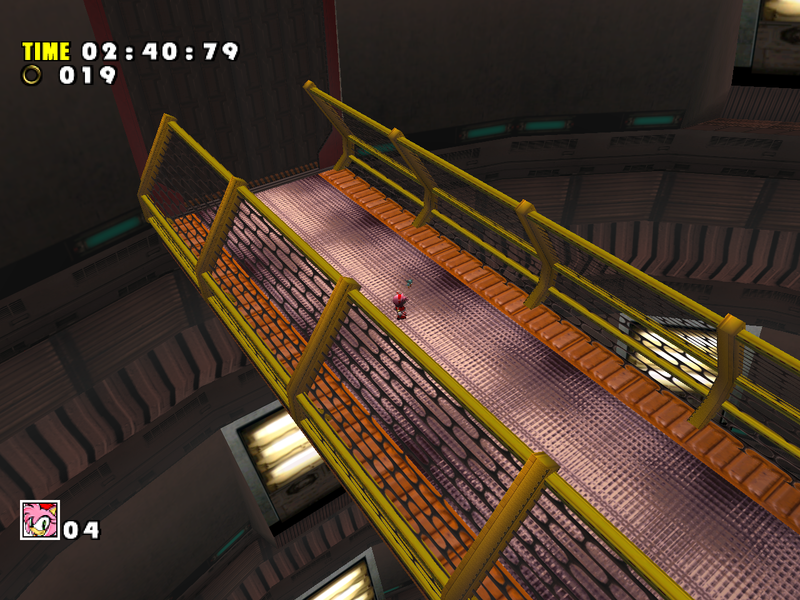 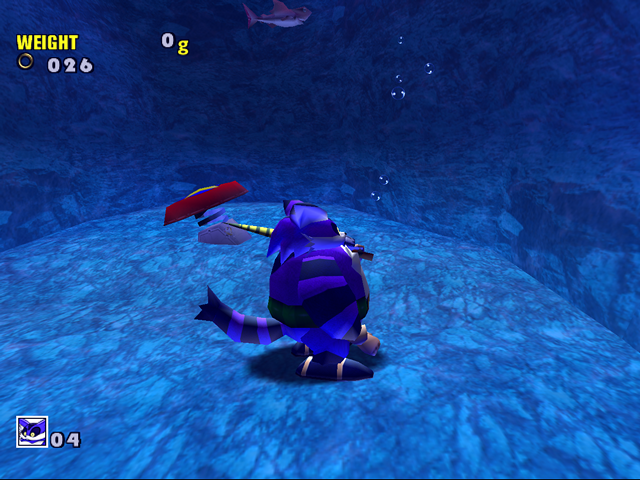 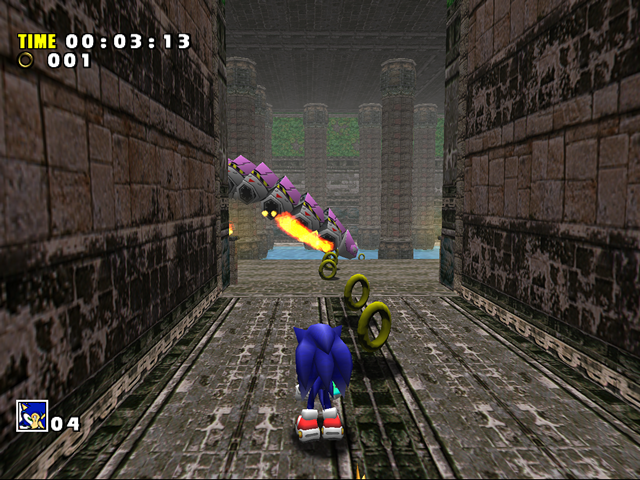 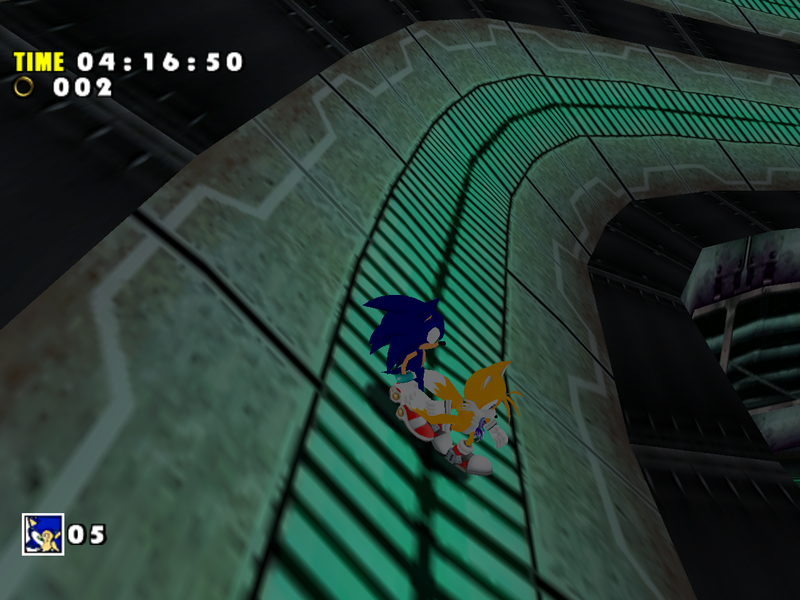 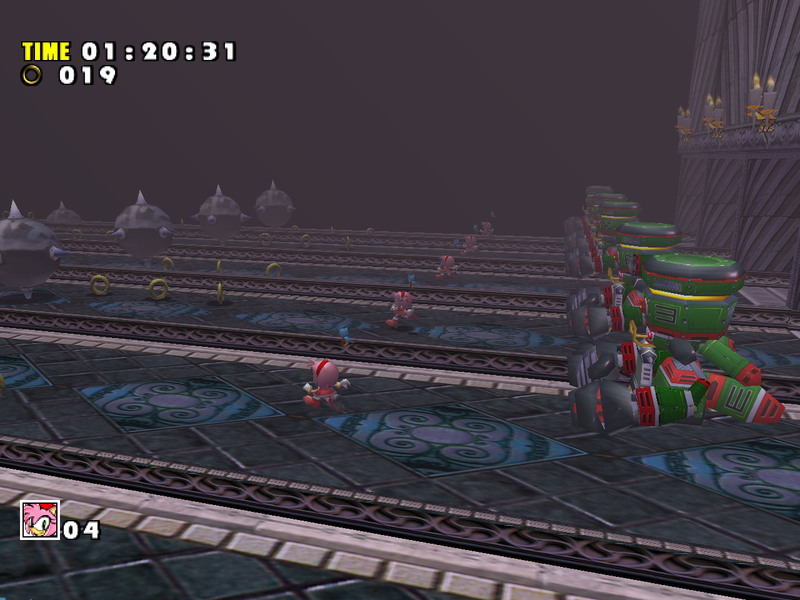 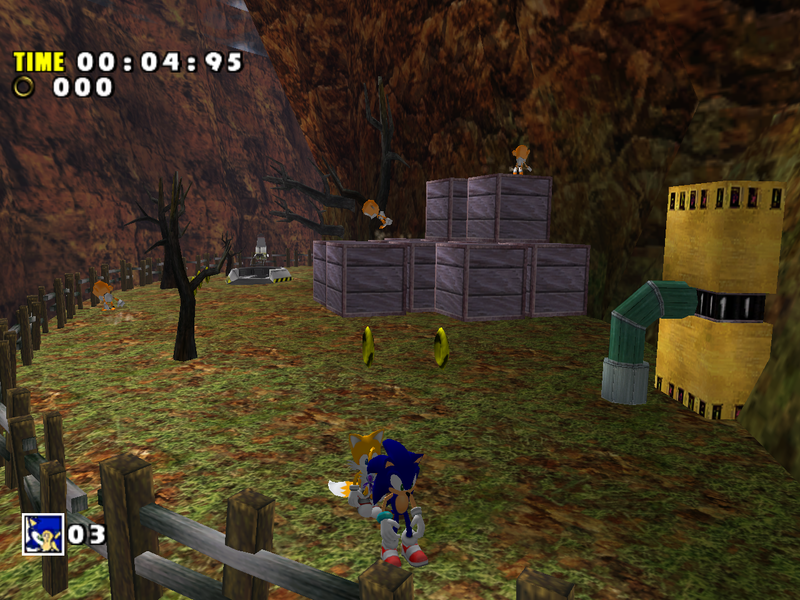 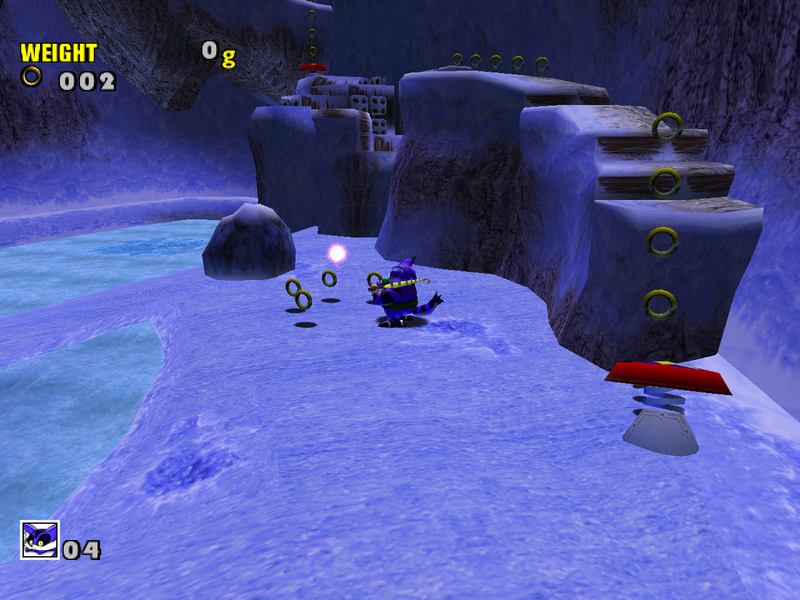 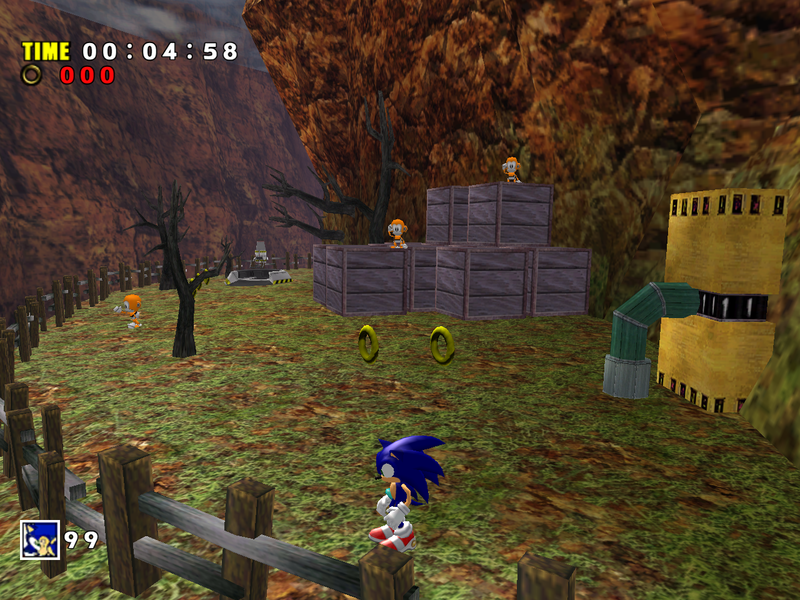 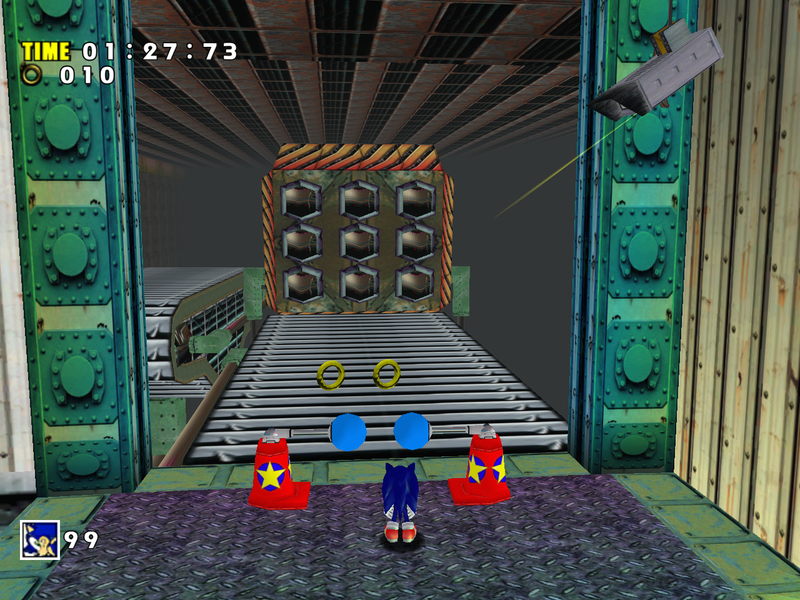 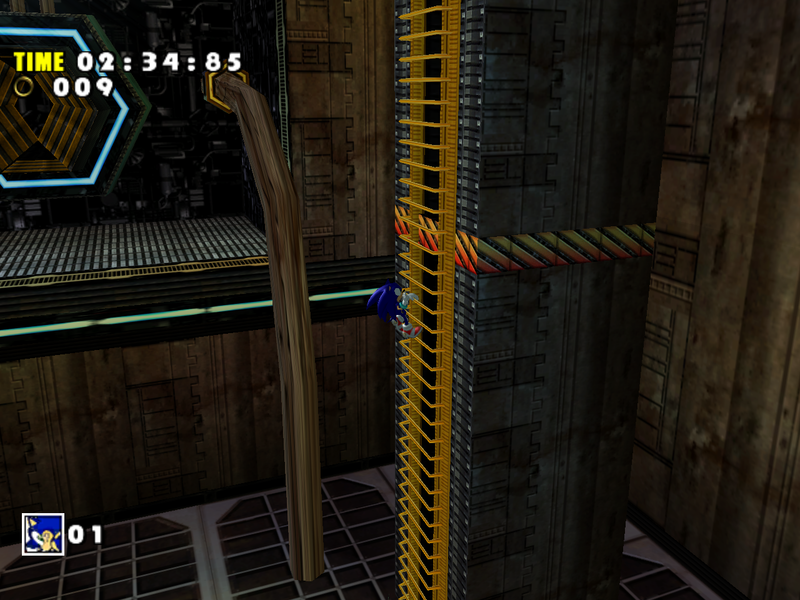 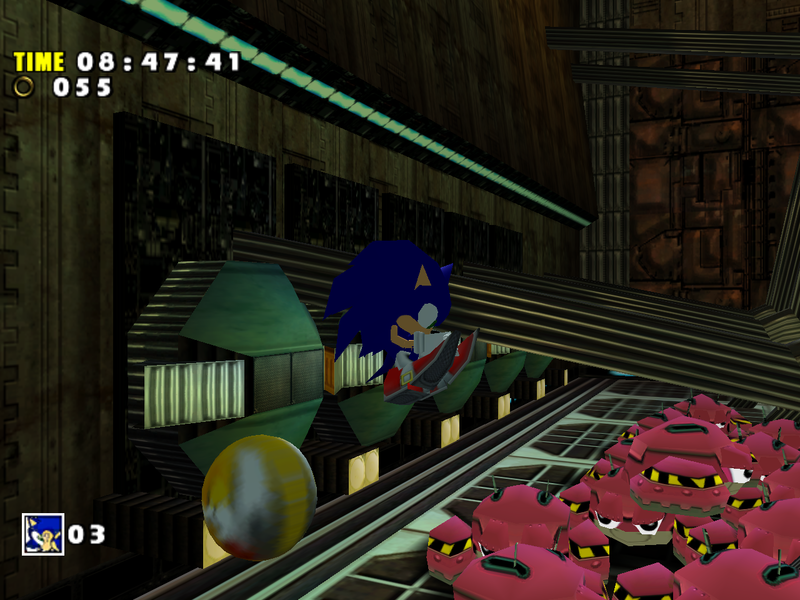 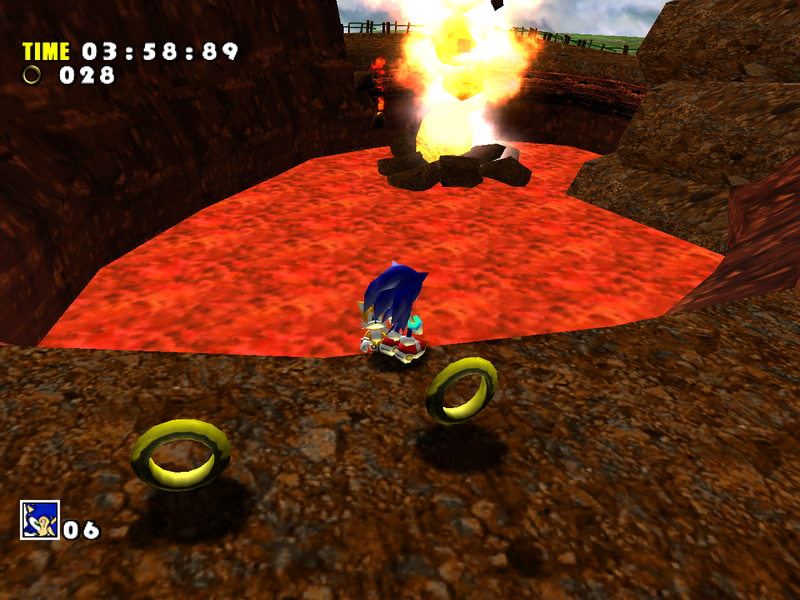 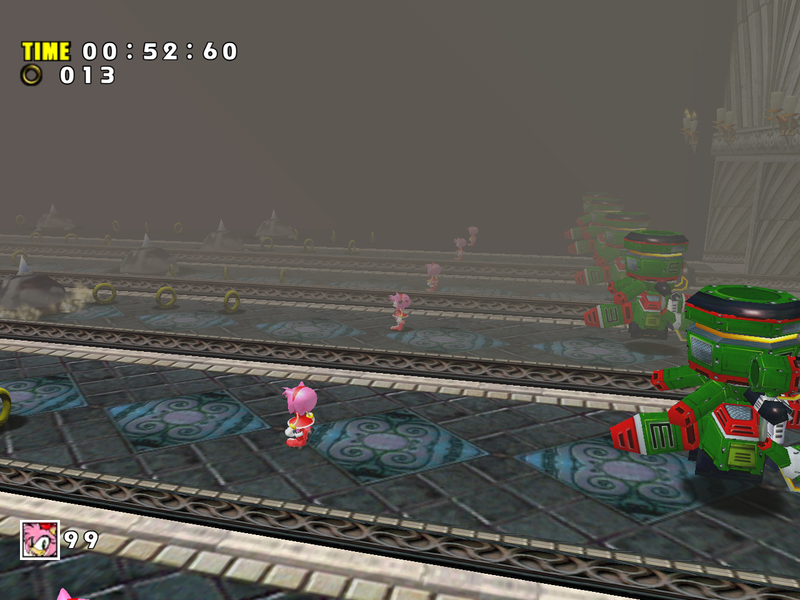 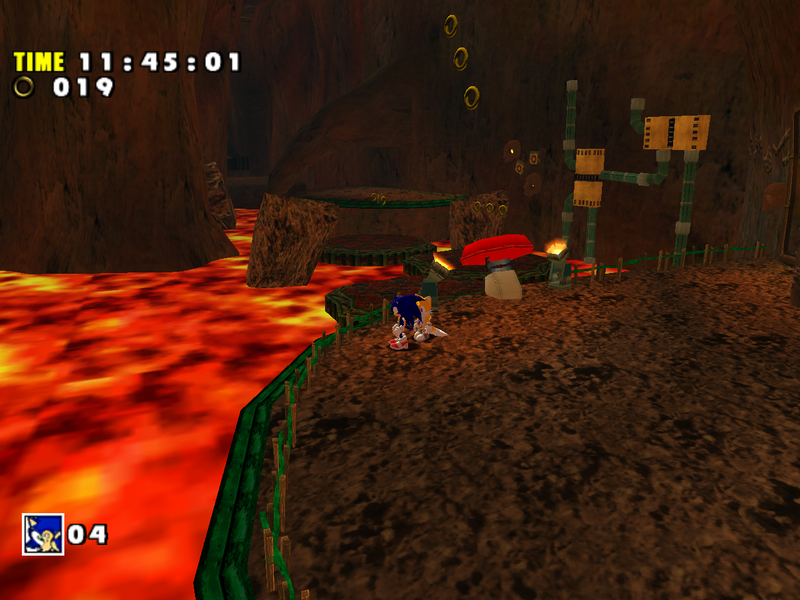 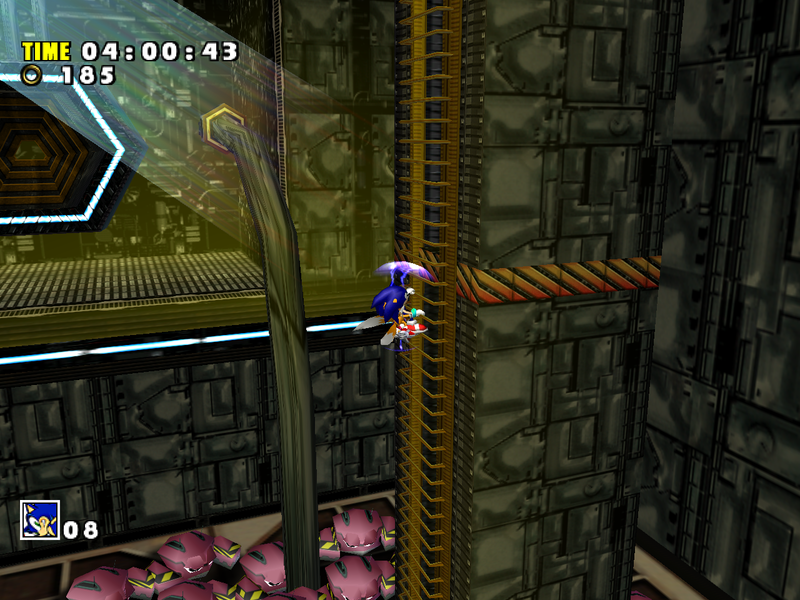 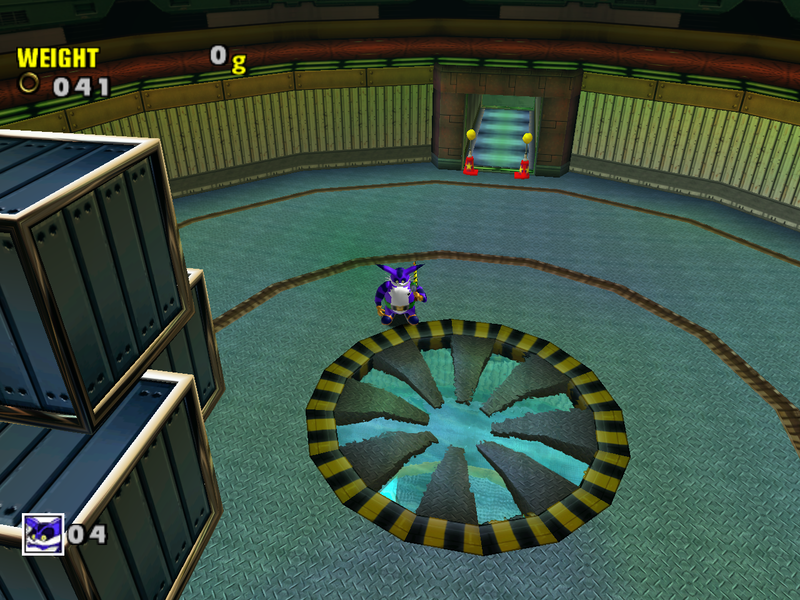 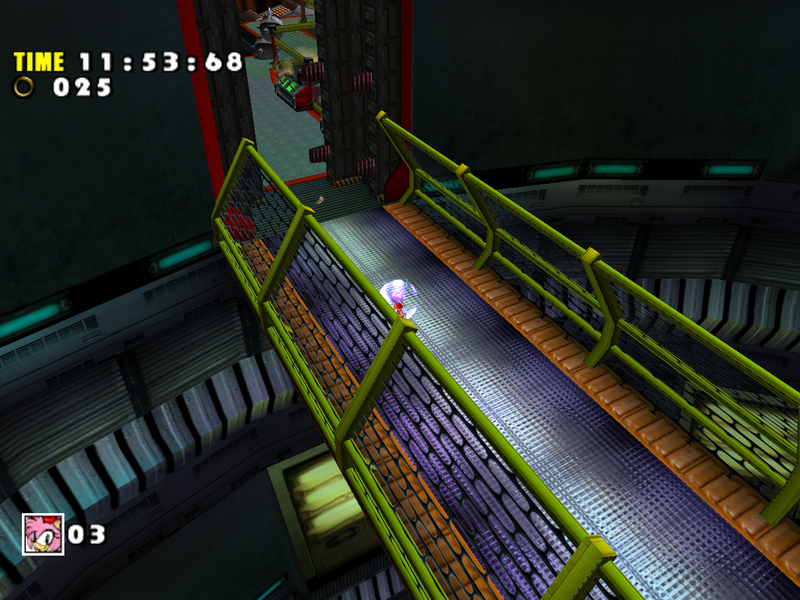 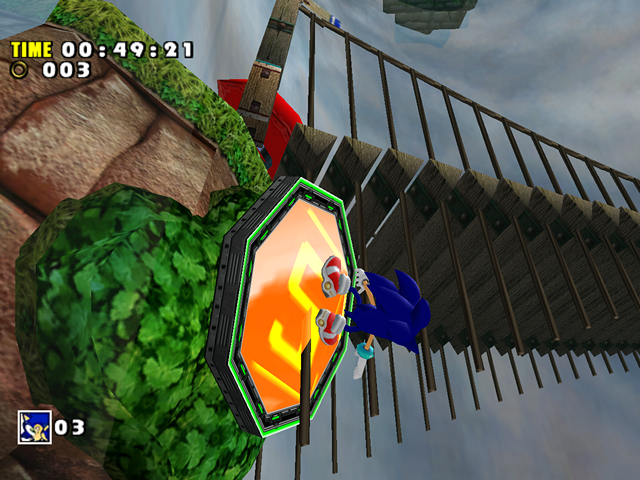 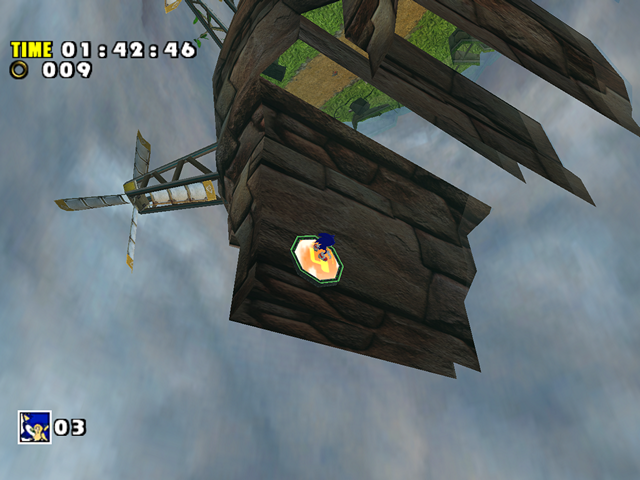 Some inherent problems with the SADX engine are also visible in this level. 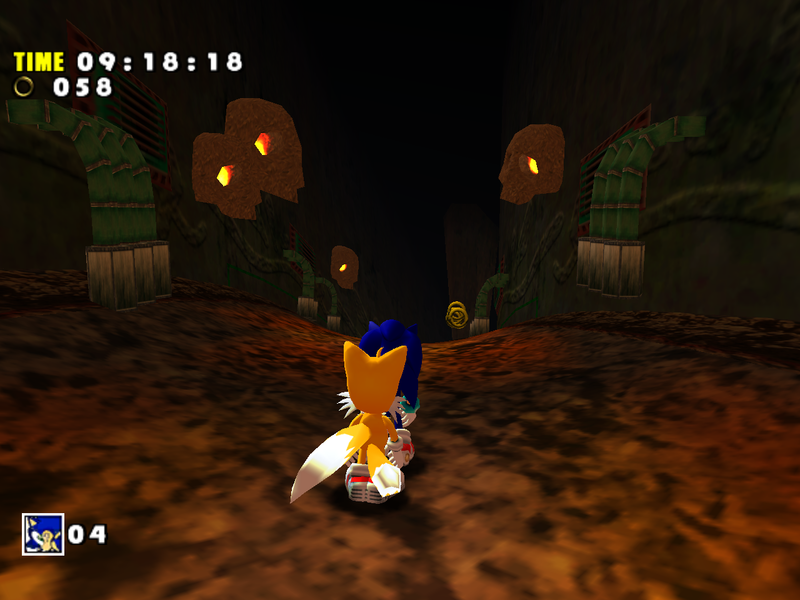 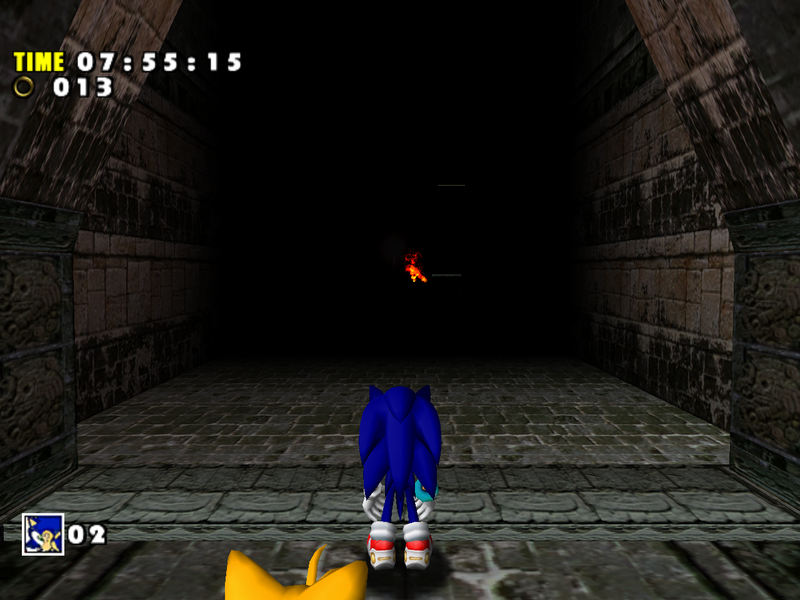 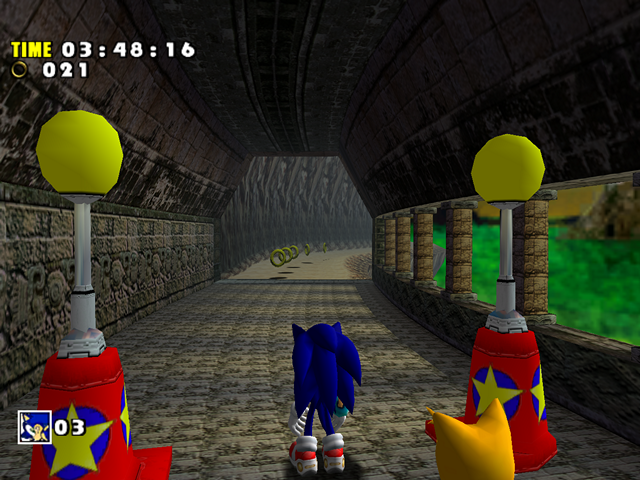 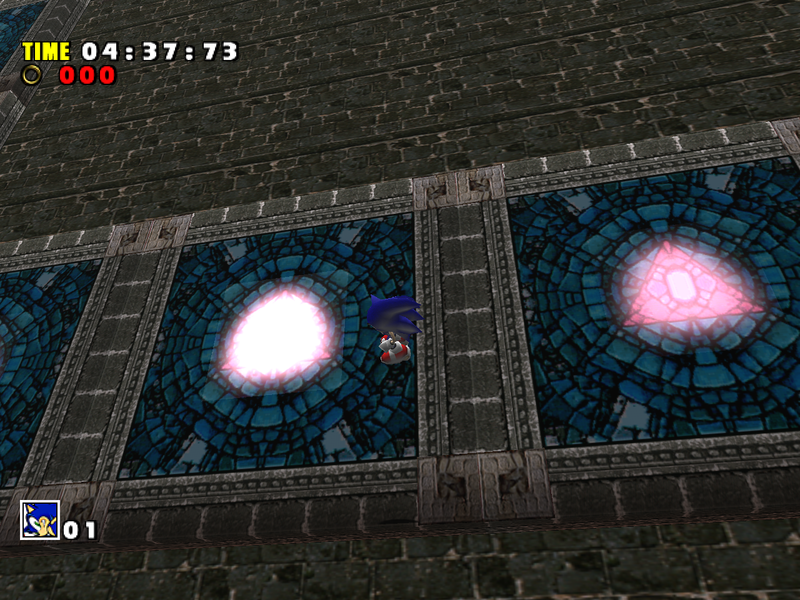 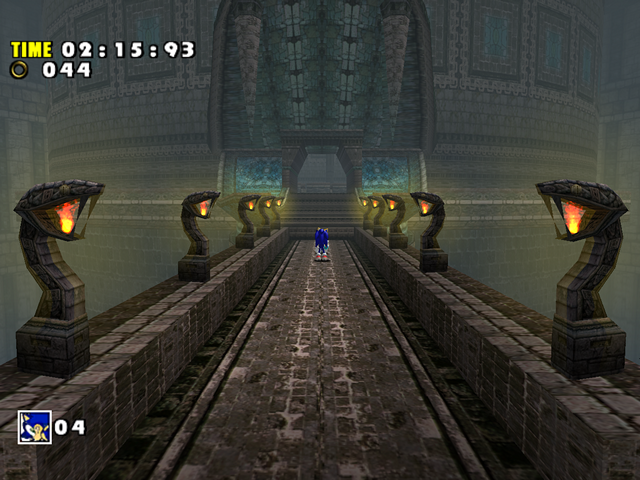 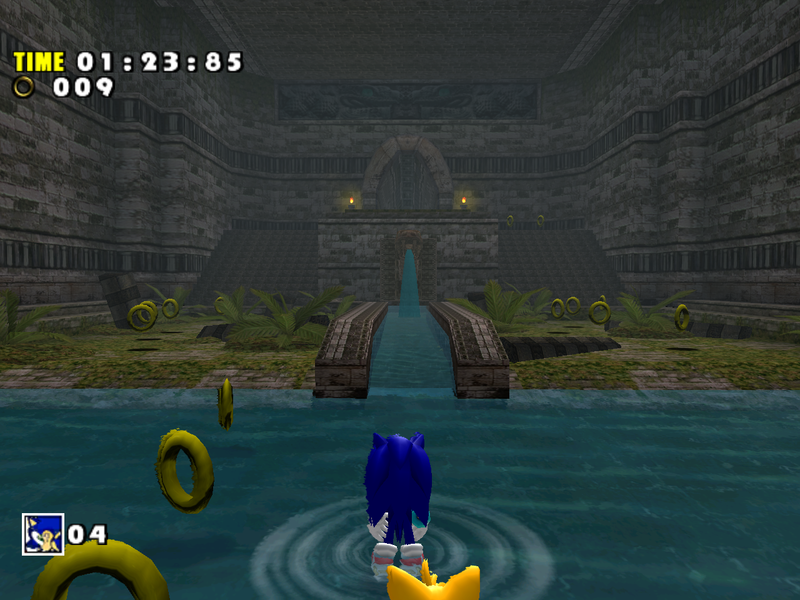 Sonic’s starting location reveals several lighting and texture differences. 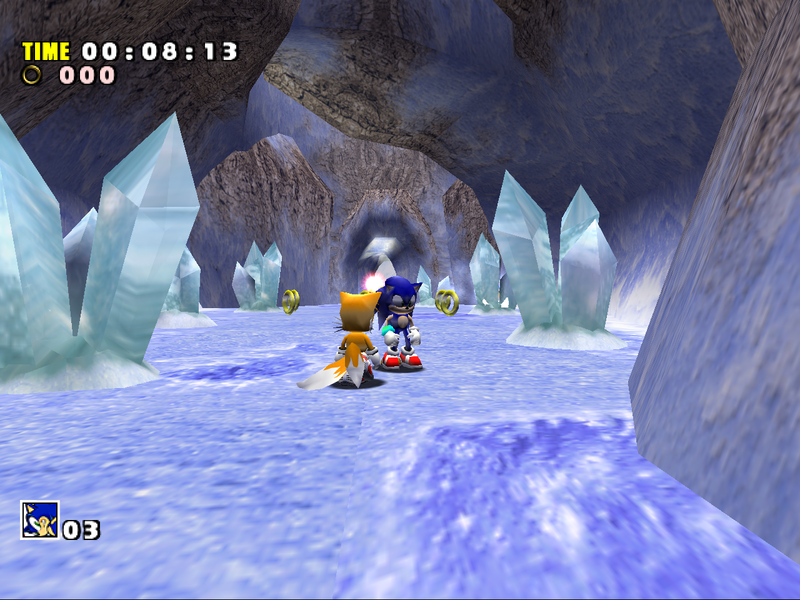 Minor complaint, but the crystals are also no longer translucent, which makes the small sparkle effect less visible. 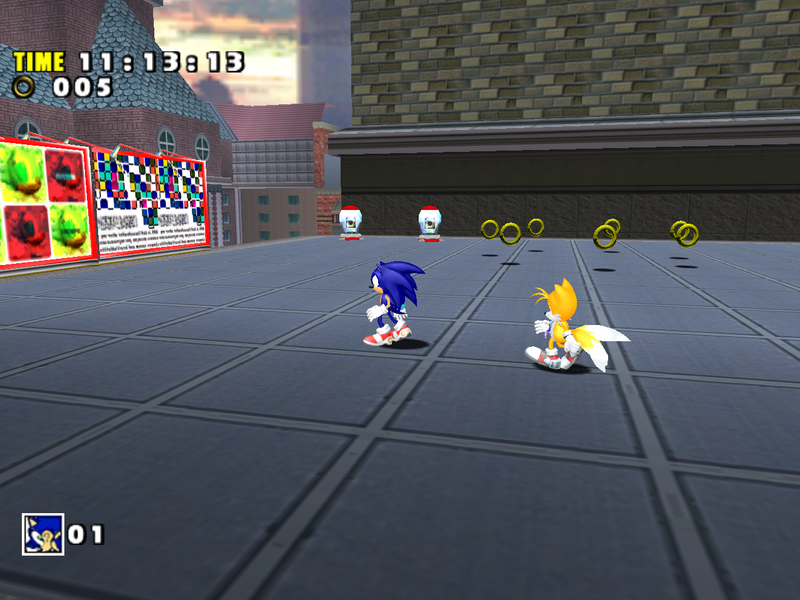 Note how the shadows are more pronounced in the Dreamcast screenshot. 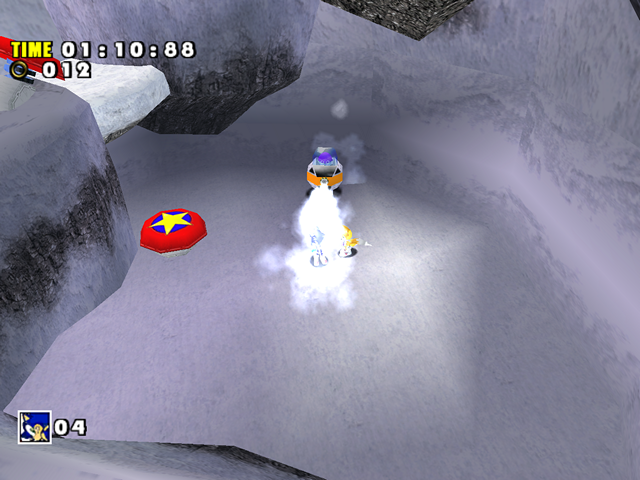 The freezer badnik has a similar problem. 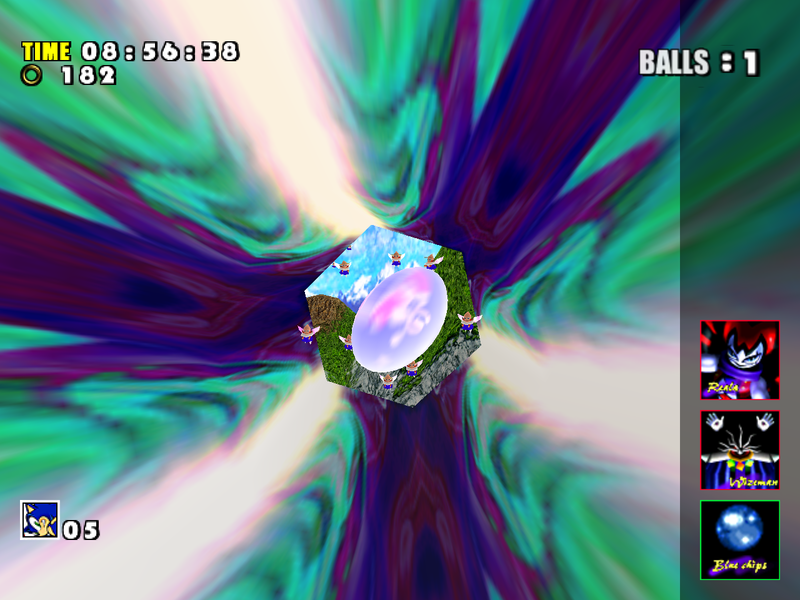 The particle effect also suffers from lack of rotation, which makes it look less dynamic compared to the original version. 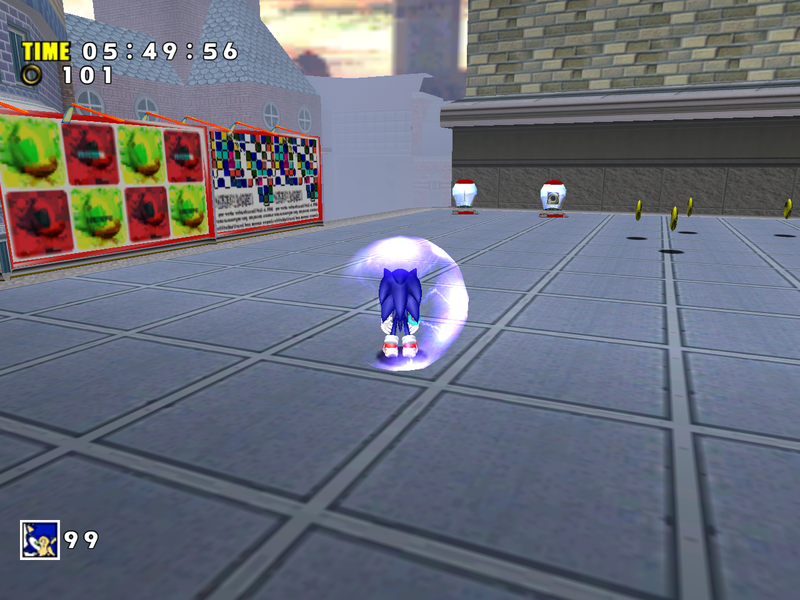 Act 3 has lost its bluish bits and is now blindingly white – the result of inferior lighting and reduced color saturation in textures. 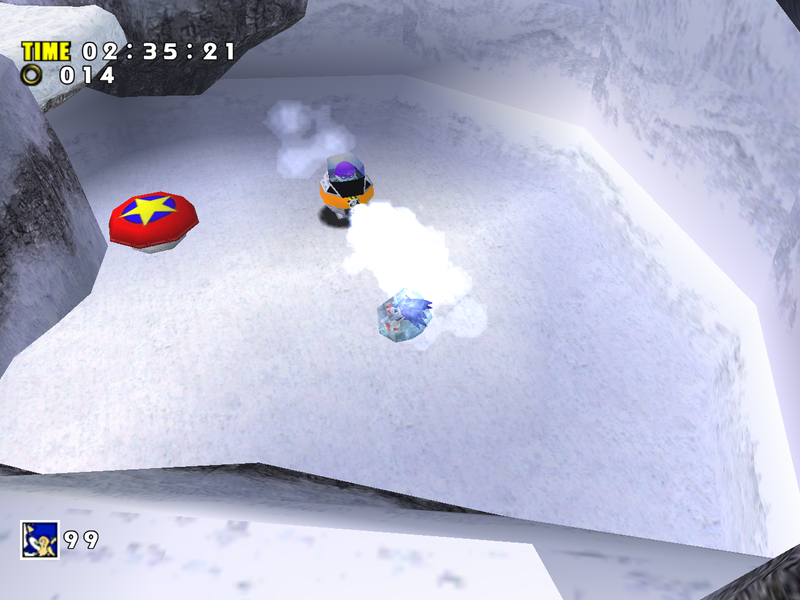 In addition, the particle effect in front of the avalanche looks like a white blob most of the time. 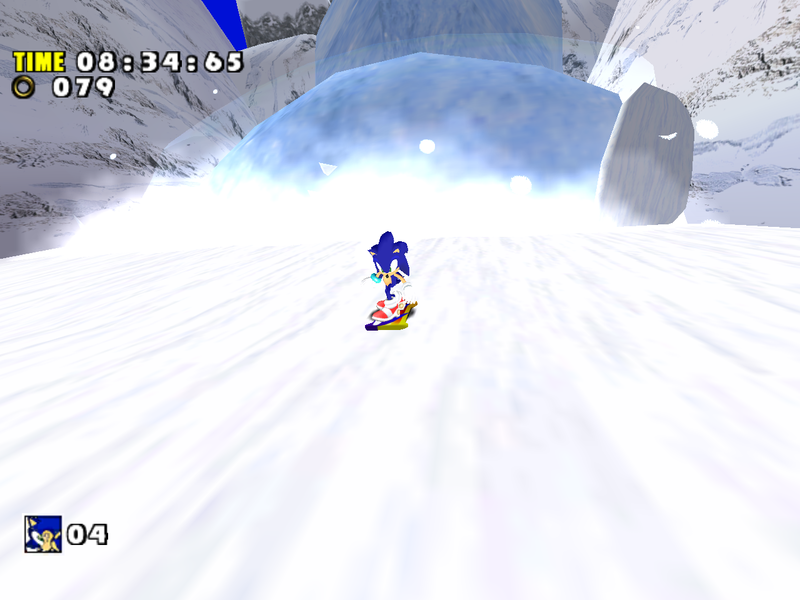 While some may prefer this look, it’s caused by a bug – the game doesn’t set the correct blending mode for the particle, which blends with the avalanche behind it and washes out the details with solid white. 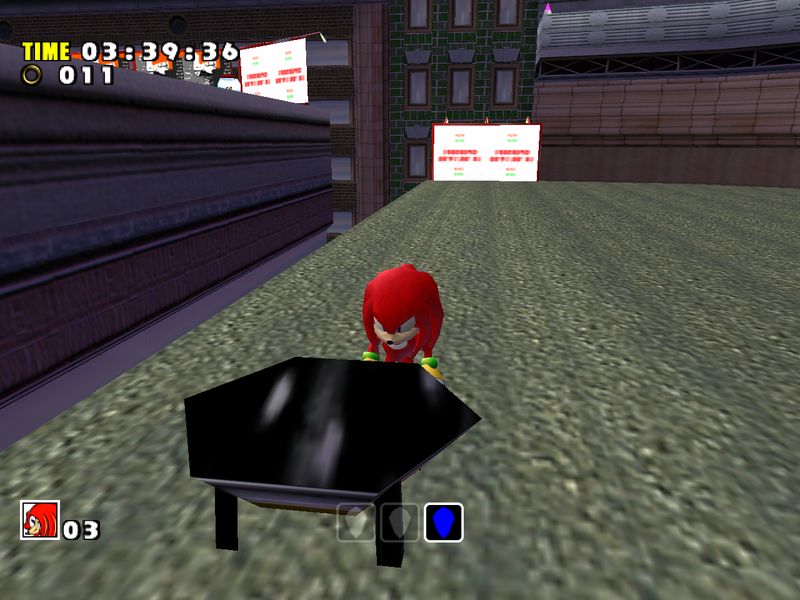 Not a video but you get the idea. 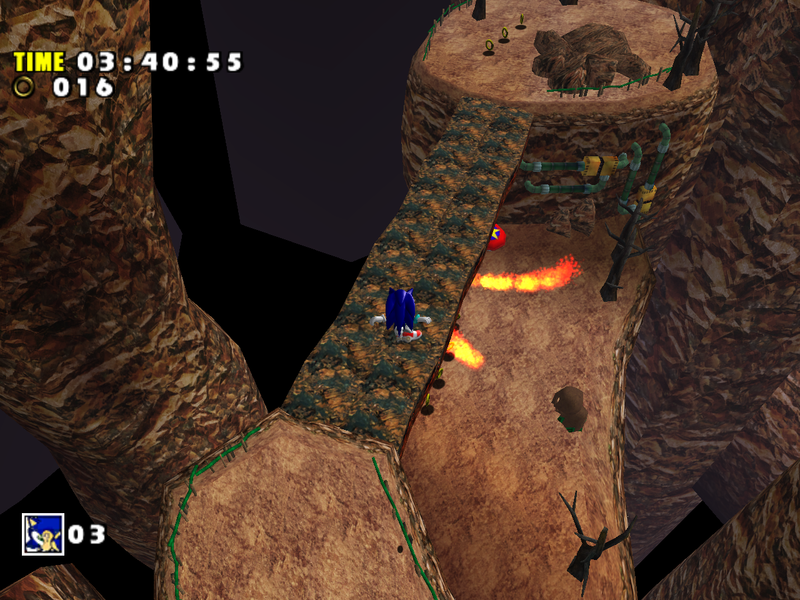 One of the most radical changes happened to Big’s area. Since the palette lighting system played the main role in creating the night look of Big’s level in the original game, it’s no wonder the level was changed from night to day when the palette lighting engine was removed in SADX. 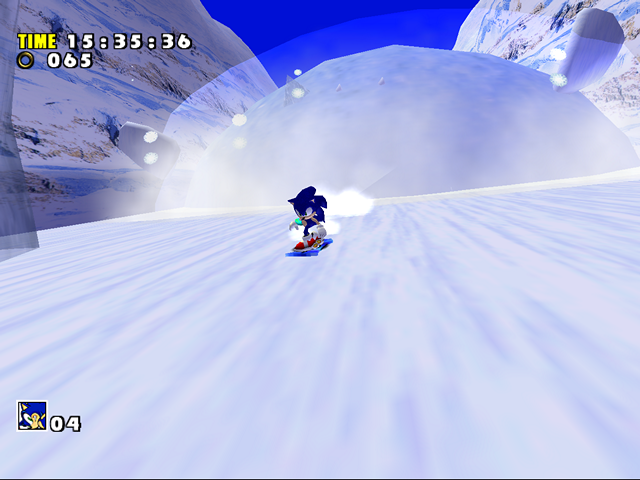 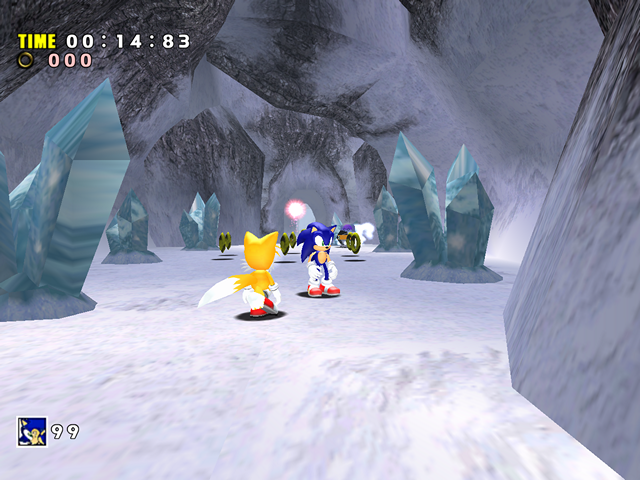 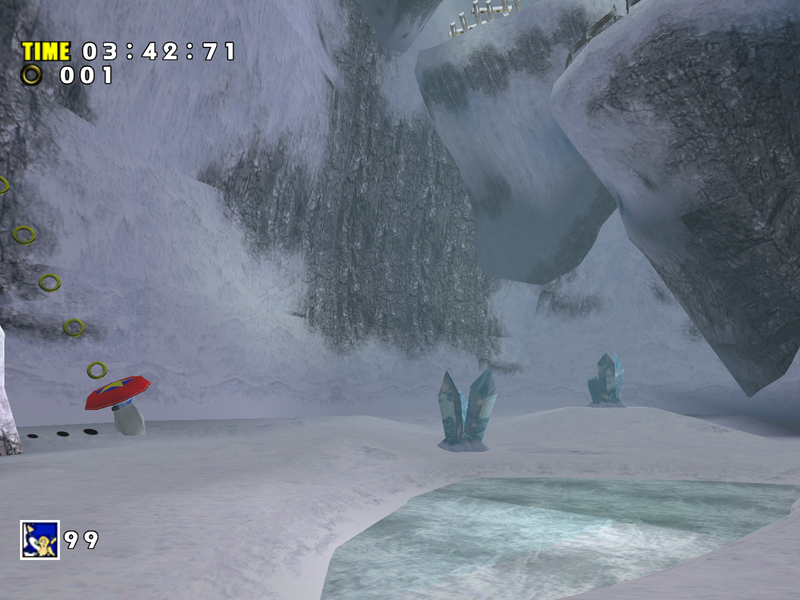 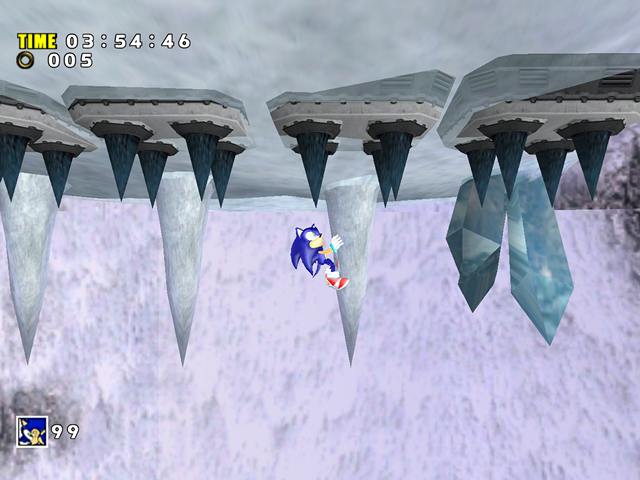 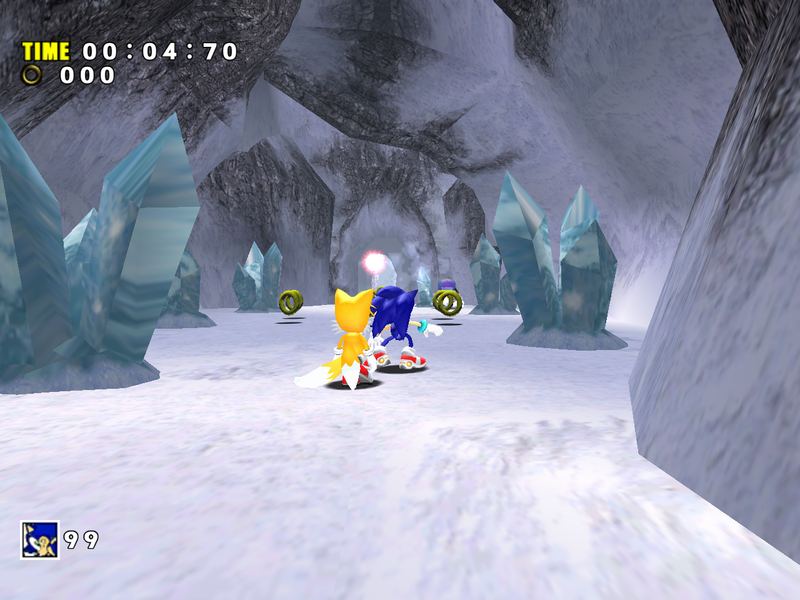 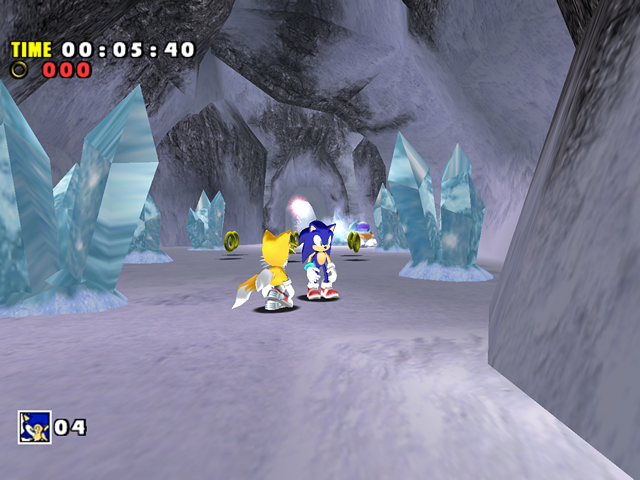 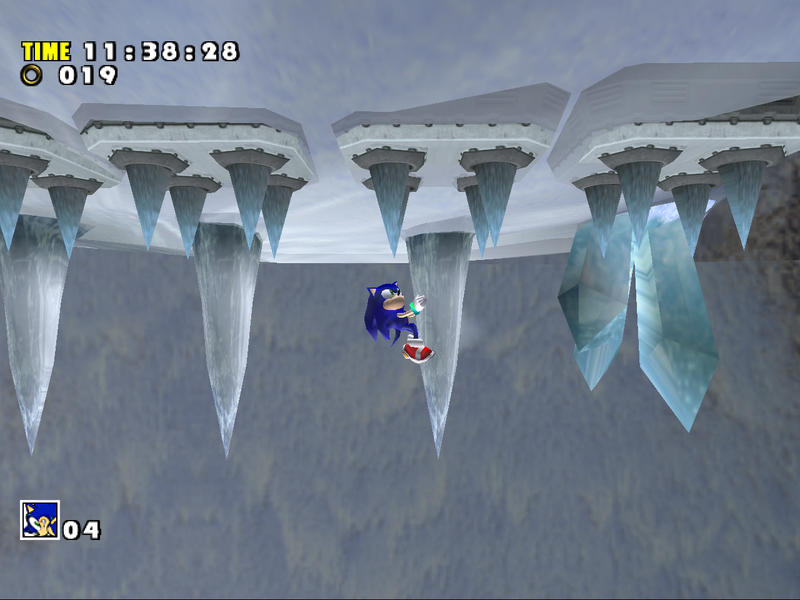 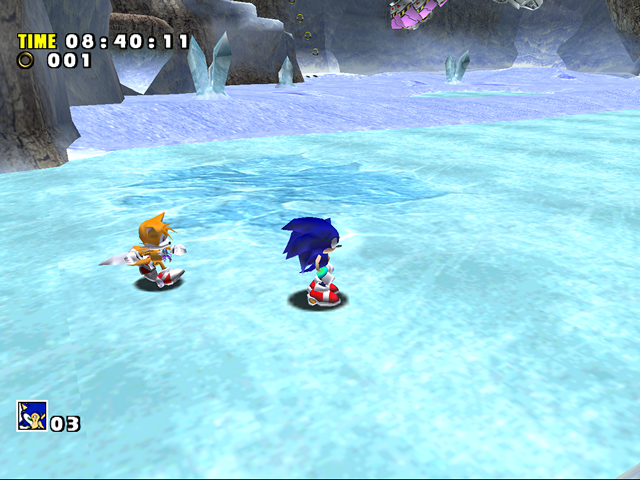 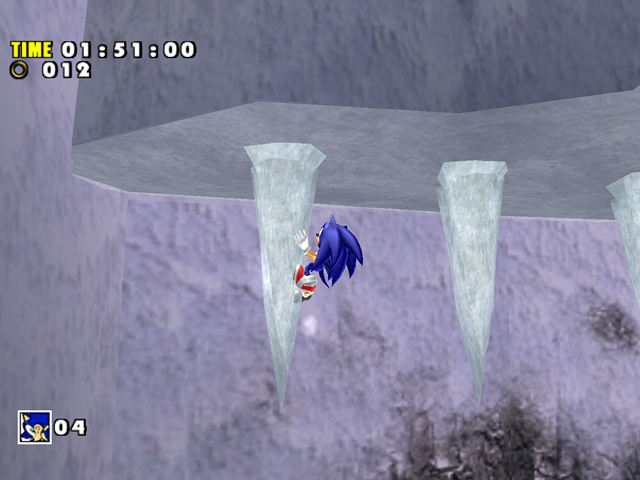 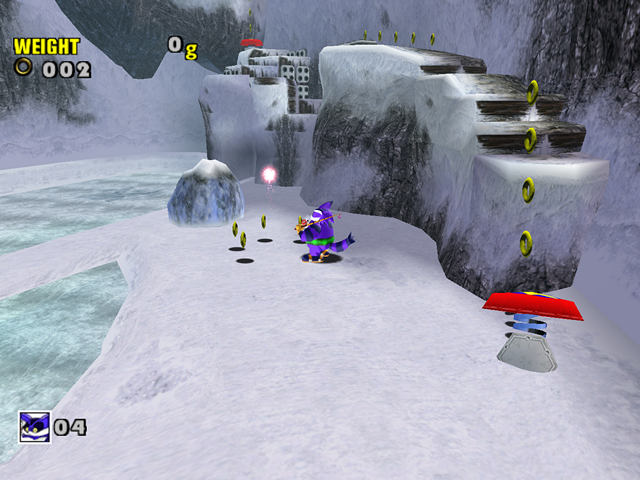 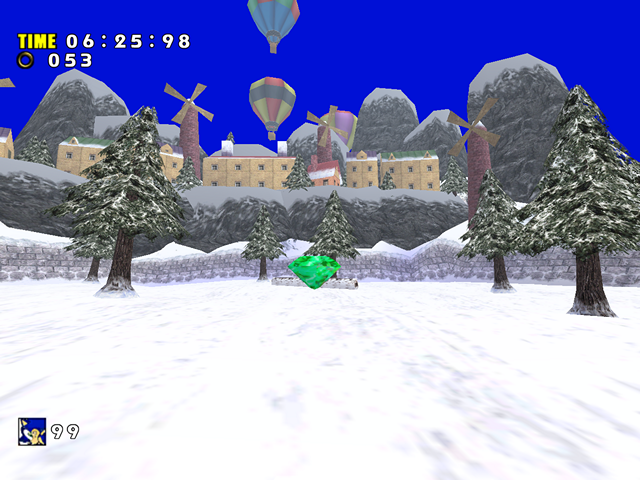 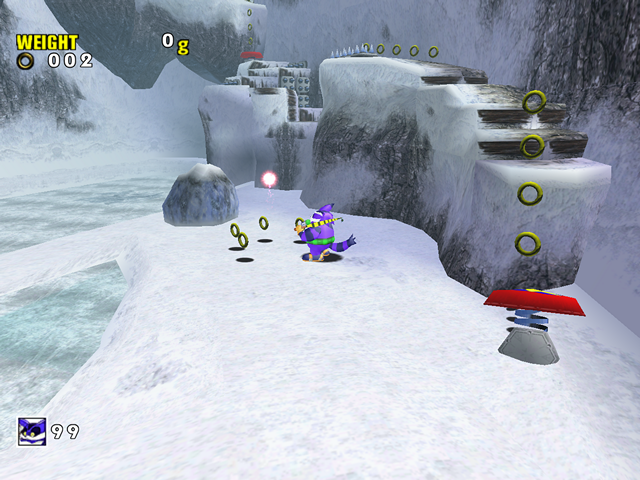 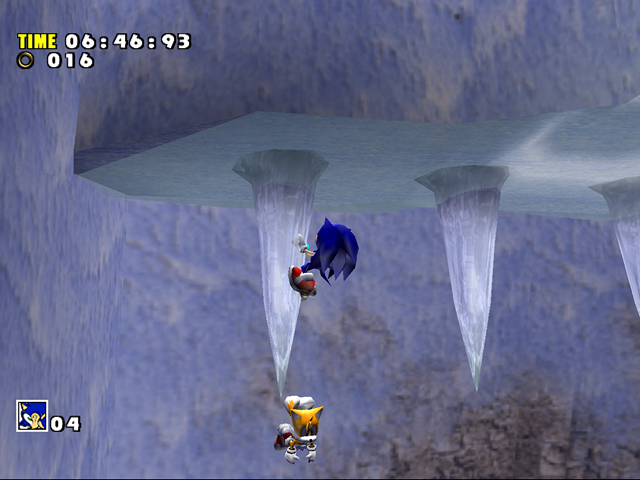 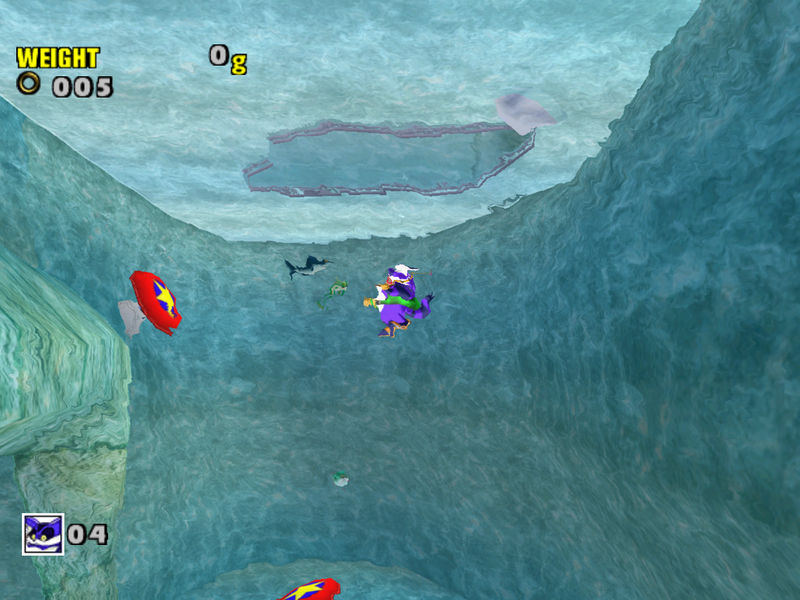 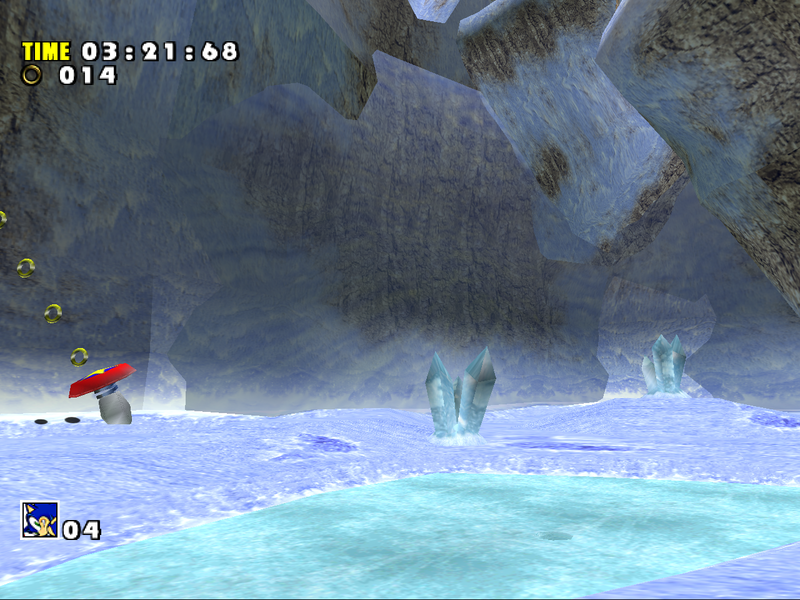 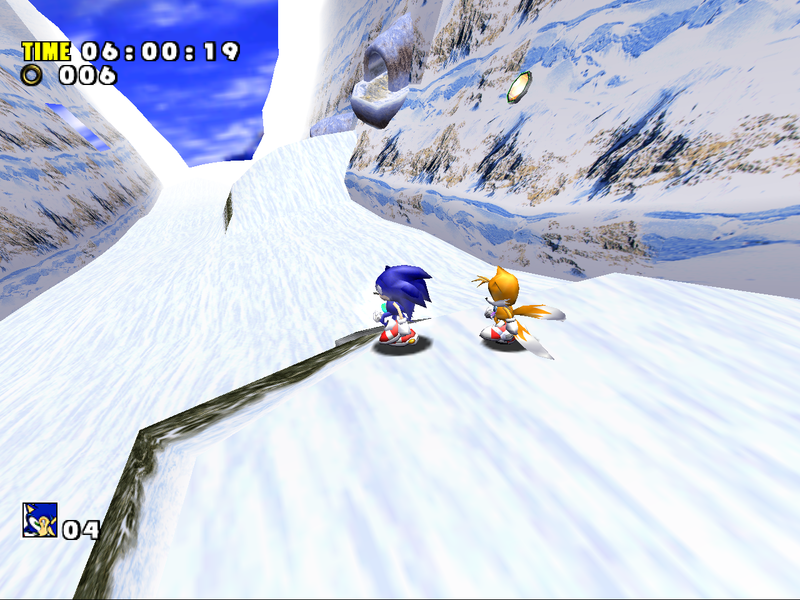 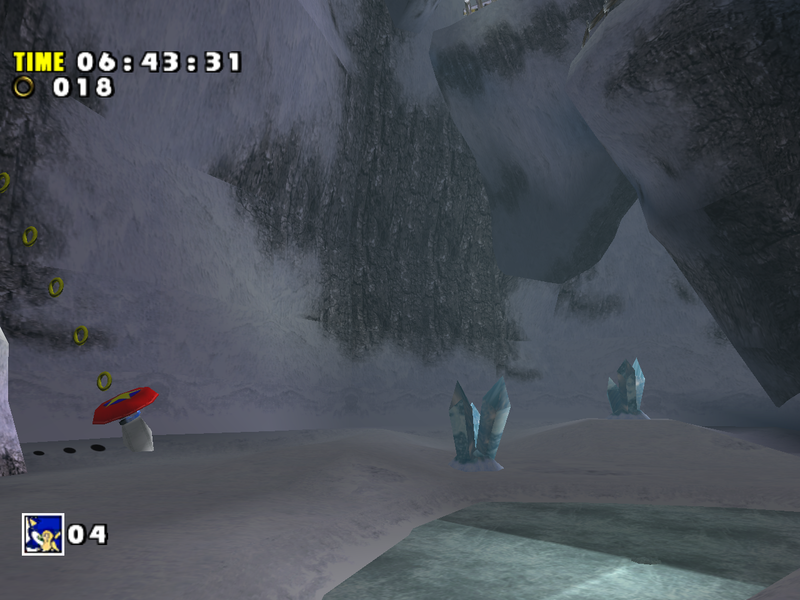 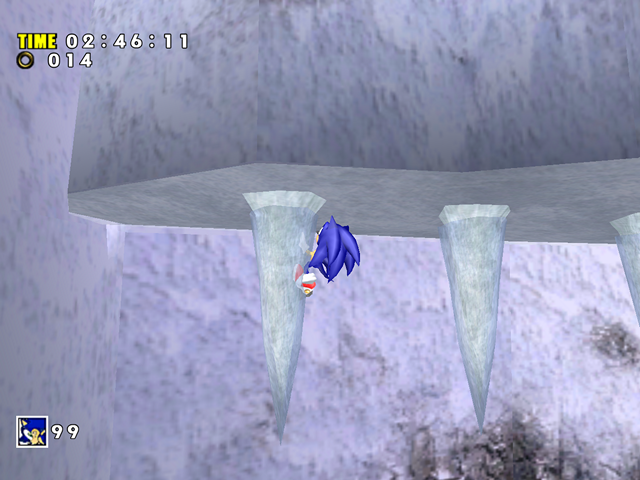 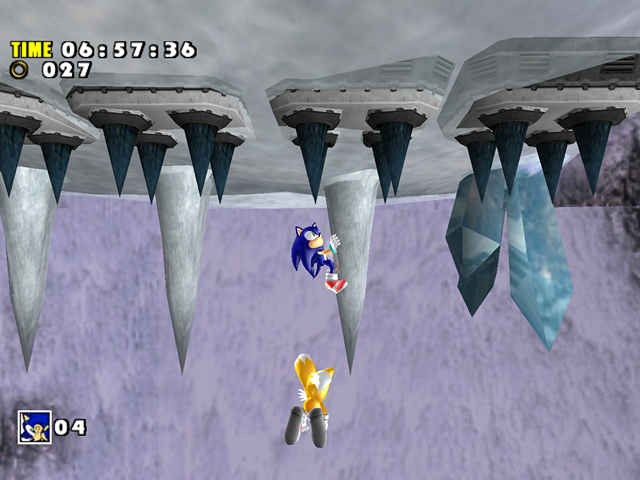 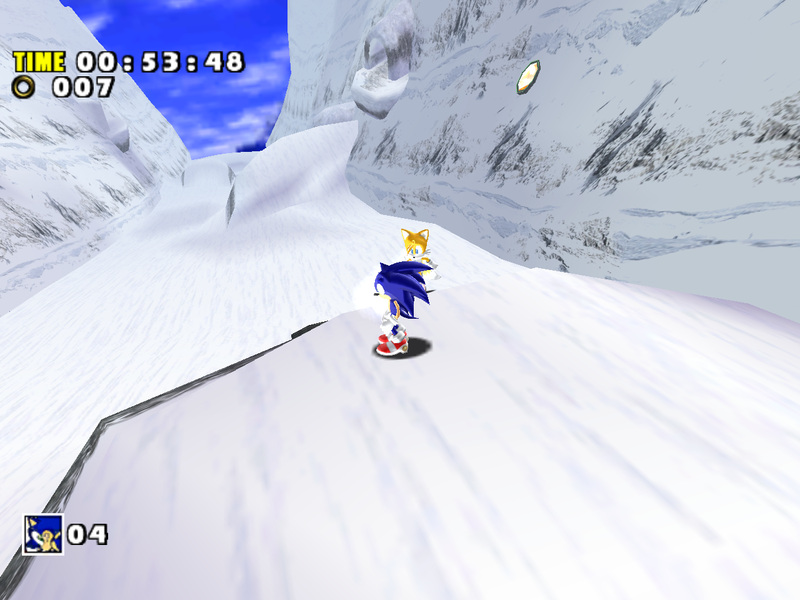 As can be seen from above, Ice Cap did not change for the better in SADX. 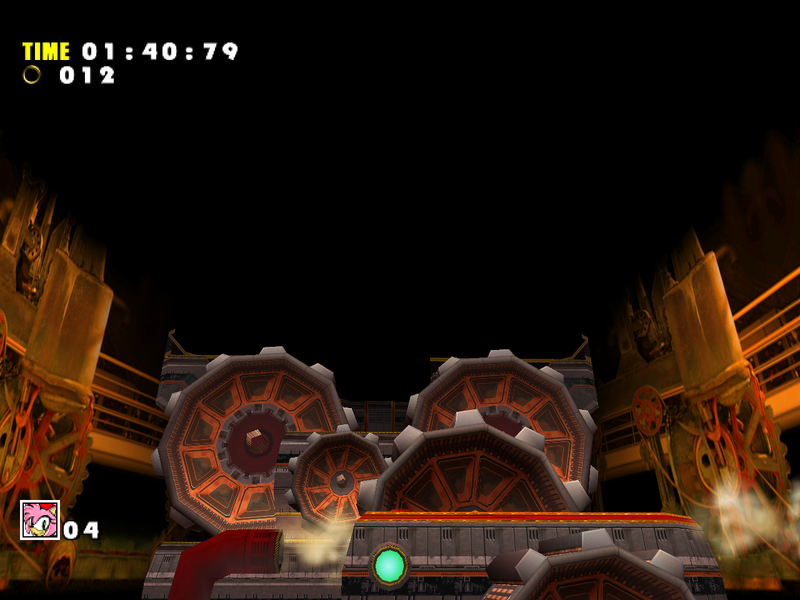 Thankfully it’s possible to revert to the original version of the level (including palettized lighting!) 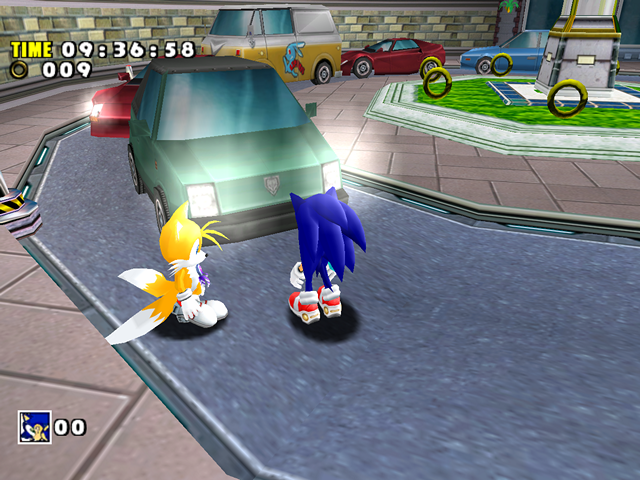 with mods. 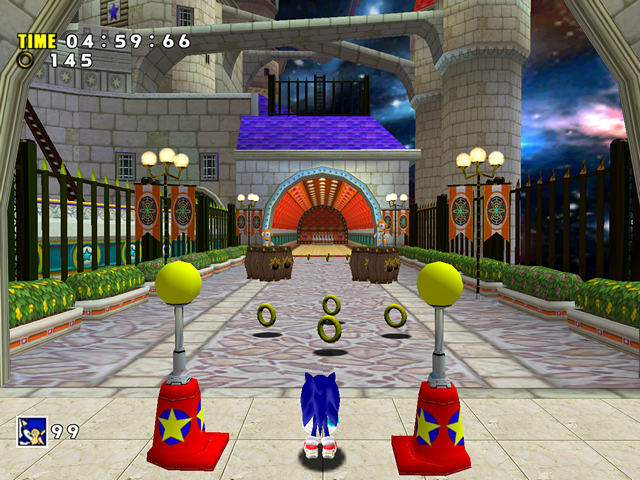 Check out this section to learn more about mods for the PC version. 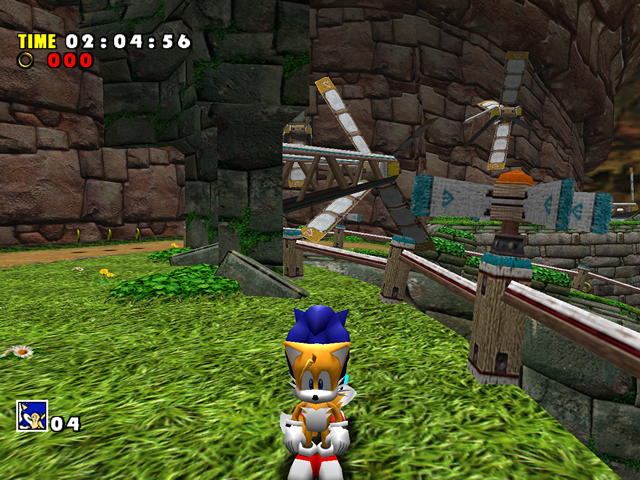 Lost World has gone through fewer quality downgrades than other levels in SADX. 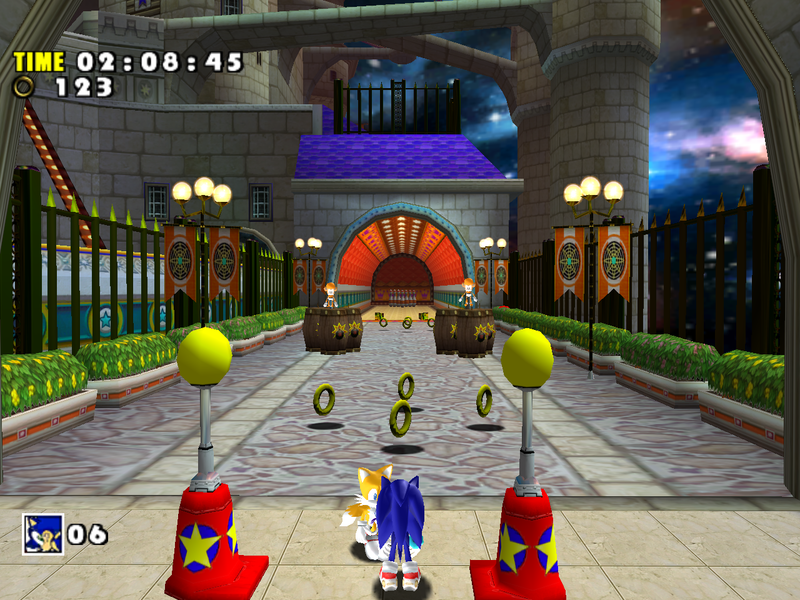 There are several areas that can be called an improvement over the Dreamcast version. There are also some problems with lighting and transparency, and several new textures in the ports. 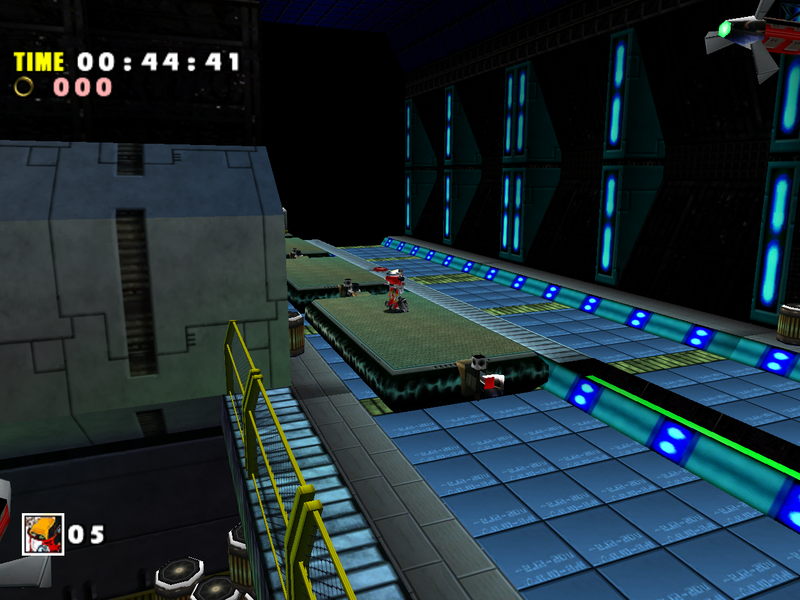 Let’s take a closer look at the SADX redesign of this level. 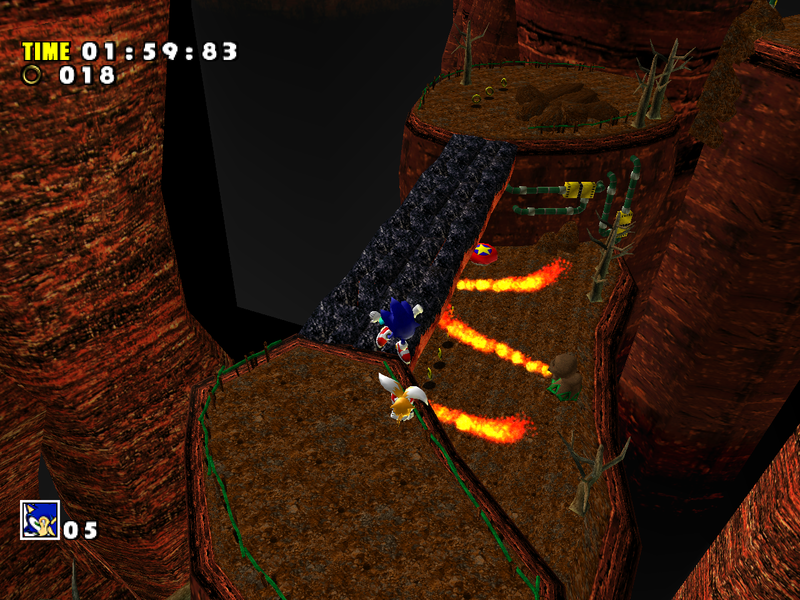 * While not immediately noticeable, the majority of fire sprites in SADX are broken slightly because of changes to the particle system. 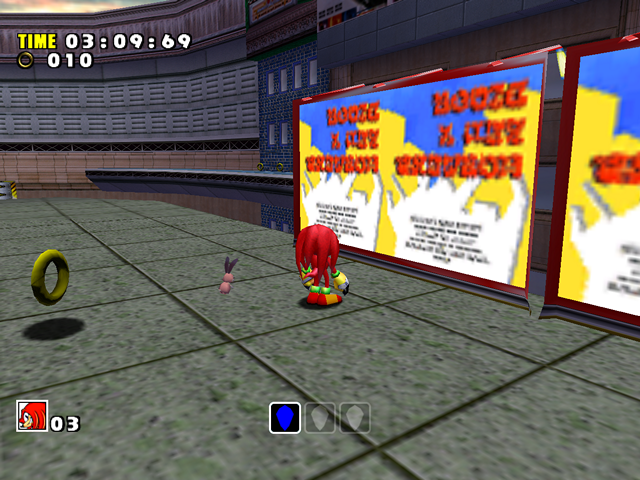 More on that in the Miscellaneous section. 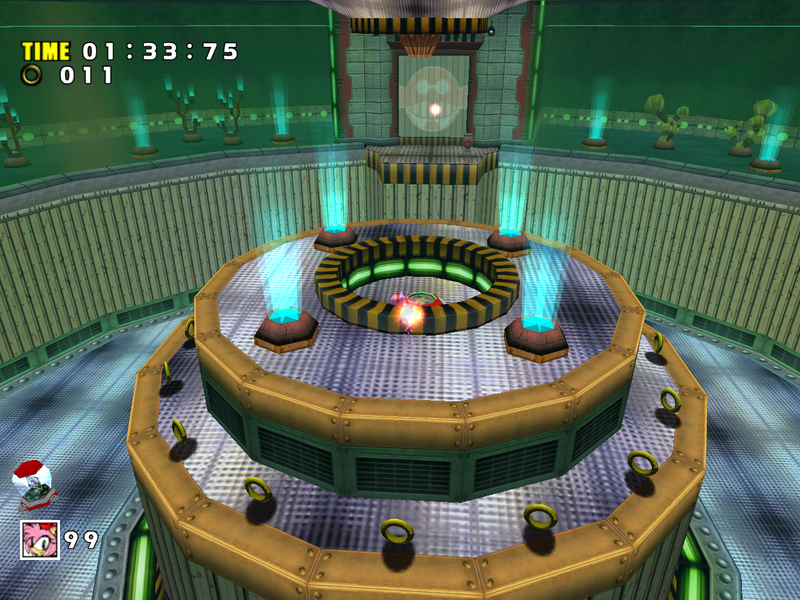 In conclusion, it is safe to say this level didn’t suffer too much in the Dreamcast-Gamecube transition in comparison with other levels. Some issues seen in this level are general issues with SADX rather than level-specific problems. 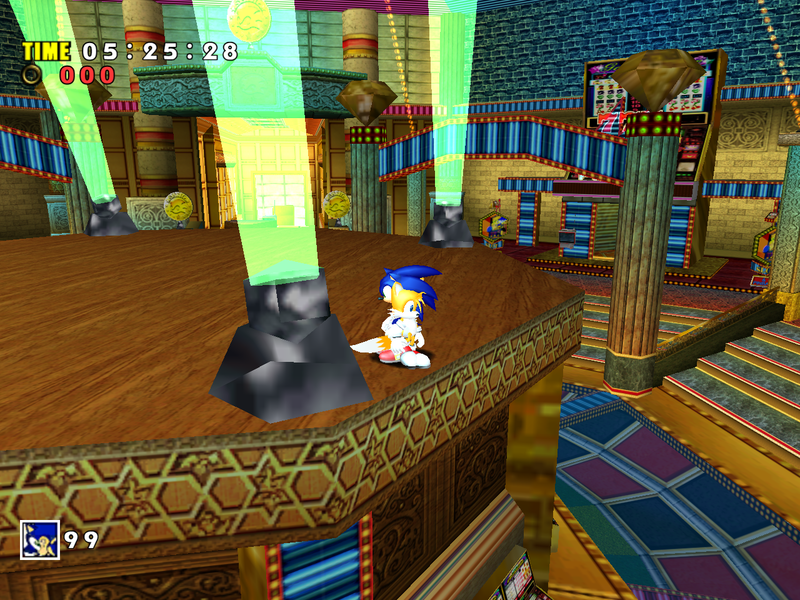 As Lost World didn’t have complex lighting or special effects, there wasn’t much the developers could break in it (but when there was, they did – like the mirror room in the PC version or ceiling lights in Act 1). 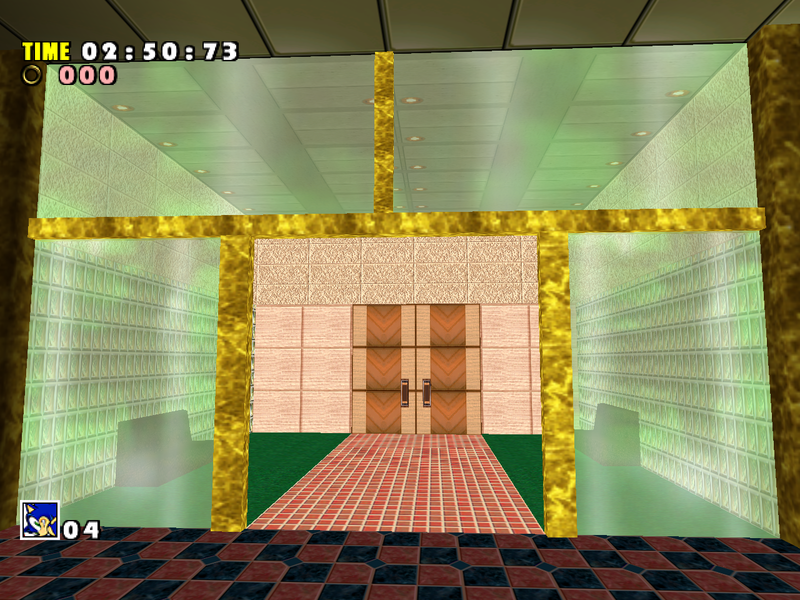 You can play the original Dreamcast version of this level (which fixes issues with the mirror room, particles etc.) 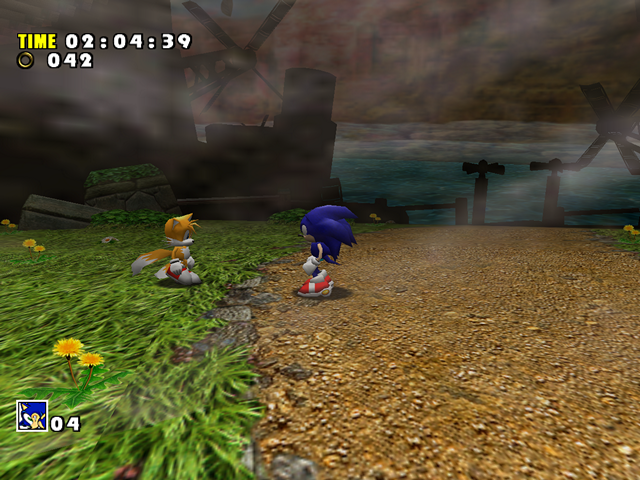 on PC with the Dreamcast Conversion mod. Find out more in the section on fixing the PC version of SADX. 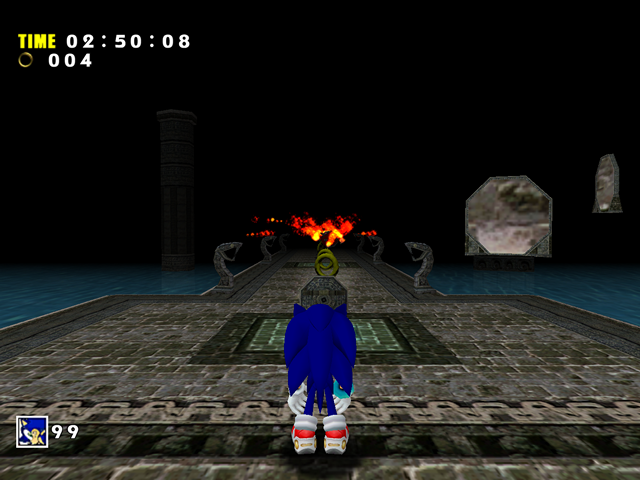 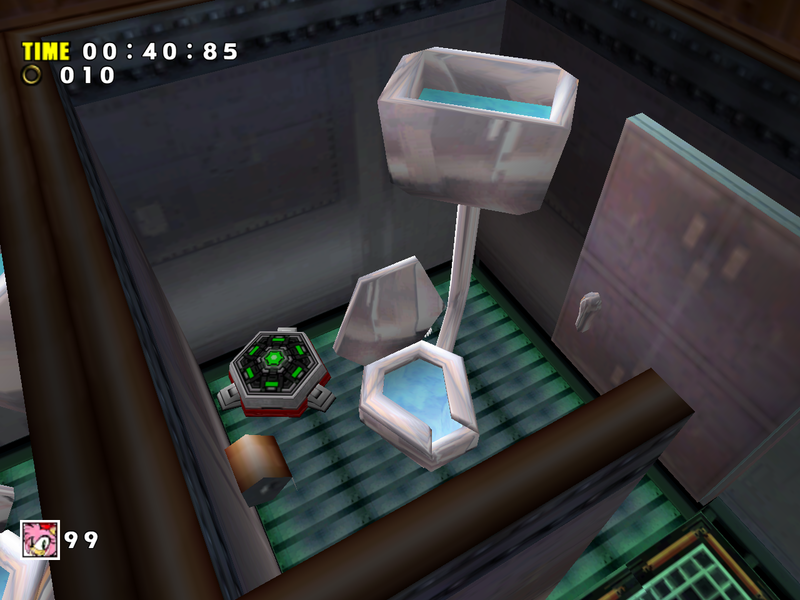 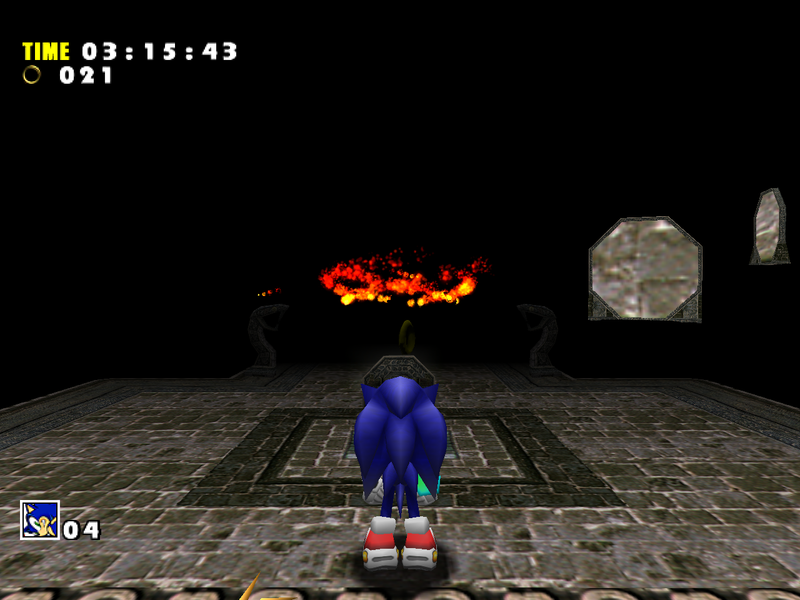 Like other Sonic games, every level in Sonic Adventure was designed around a certain theme. 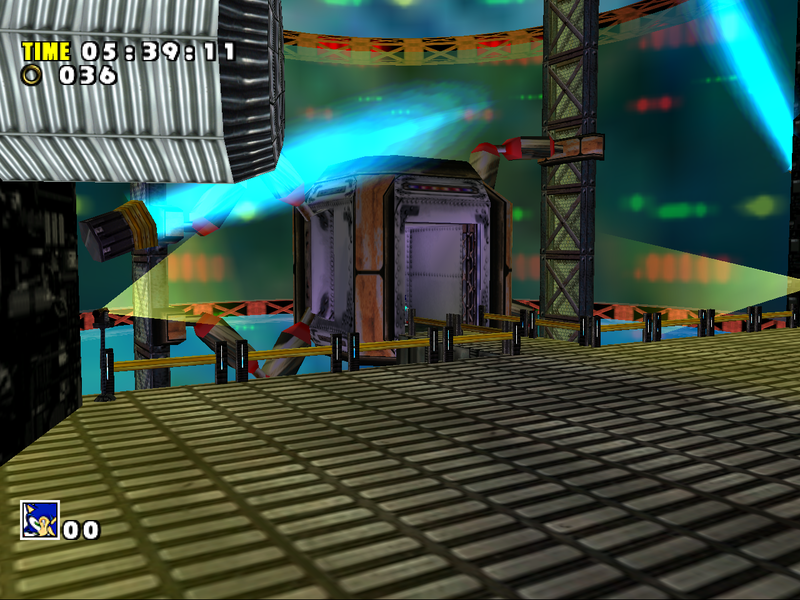 There was also some feature or special effect that was specific to a particular level. 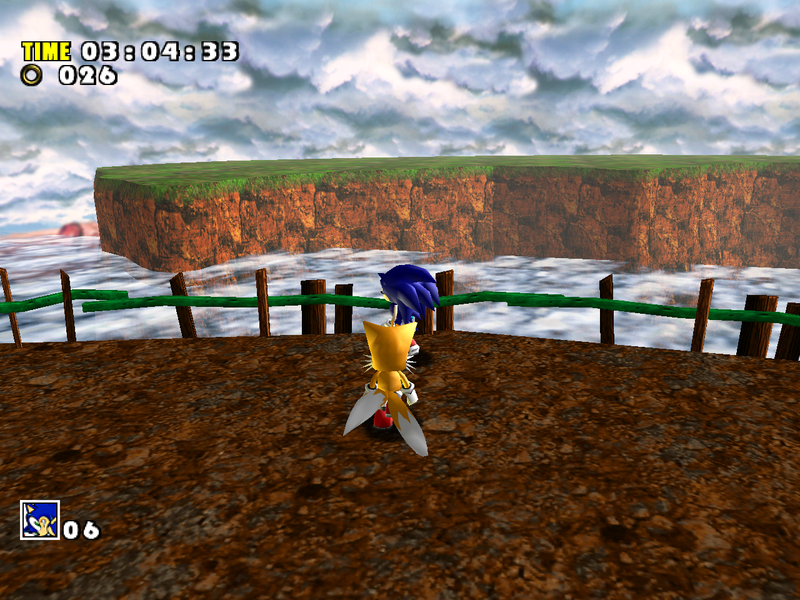 For Emerald Coast that was the ocean waves effect (removed in SADX), for Windy Valley it was the tornado etc. 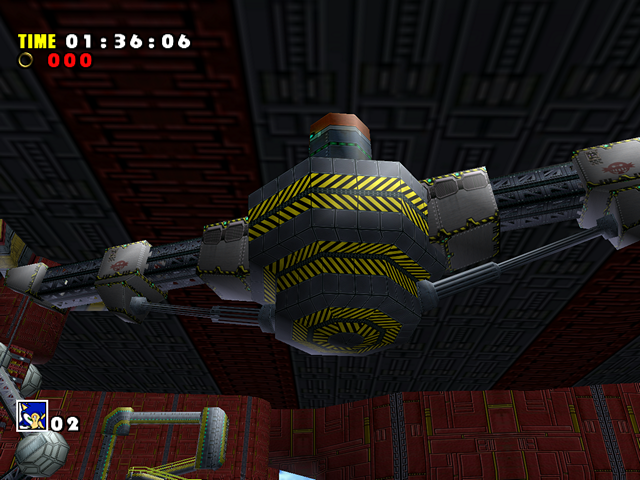 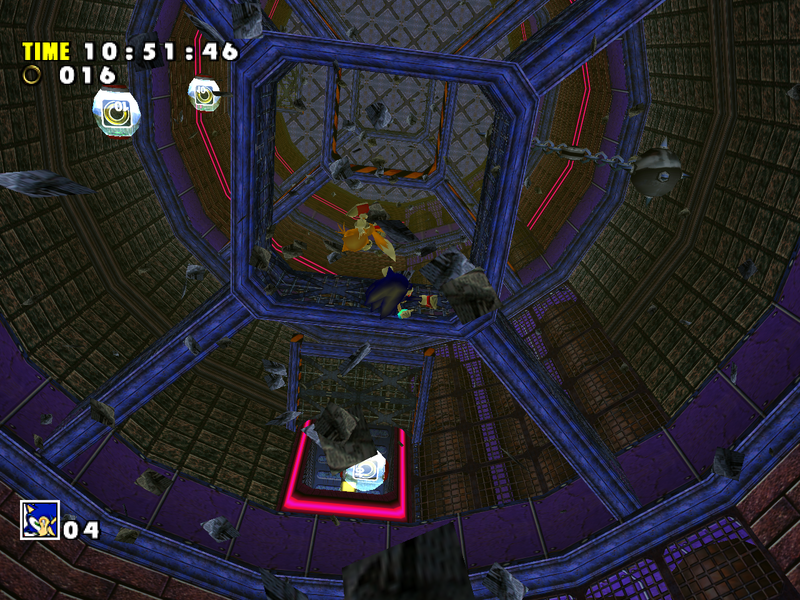 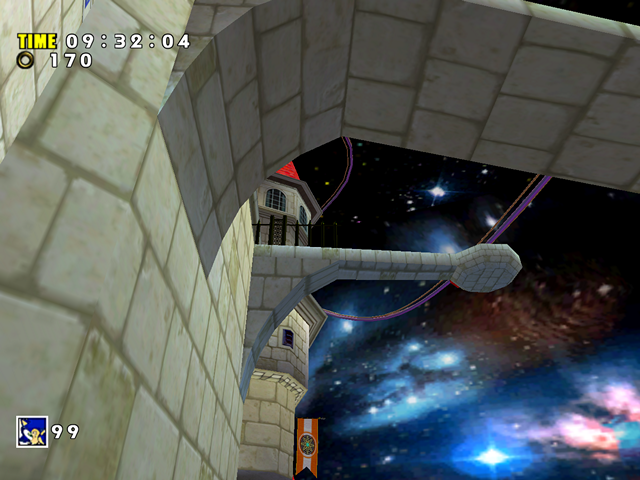 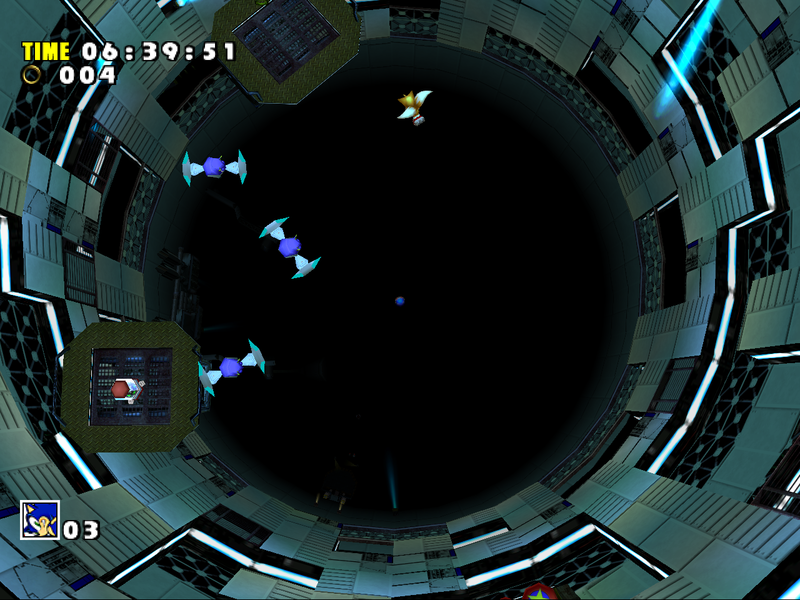 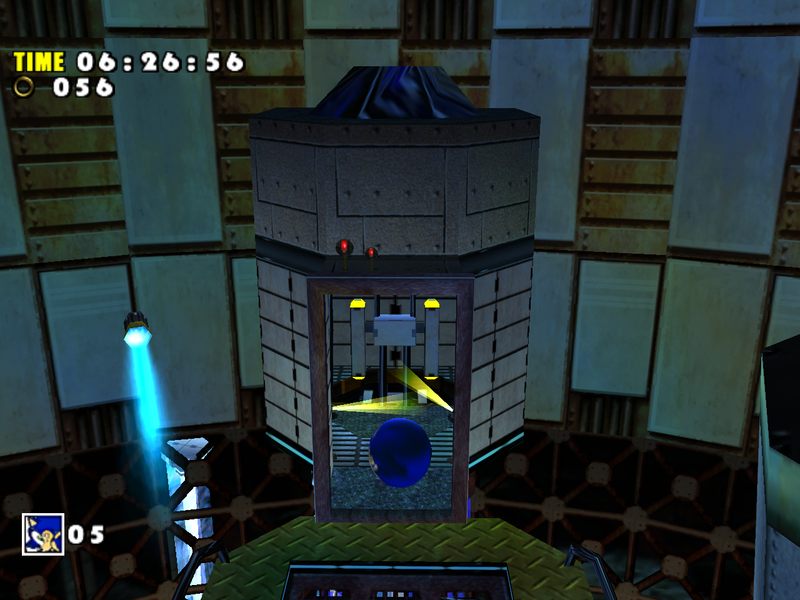 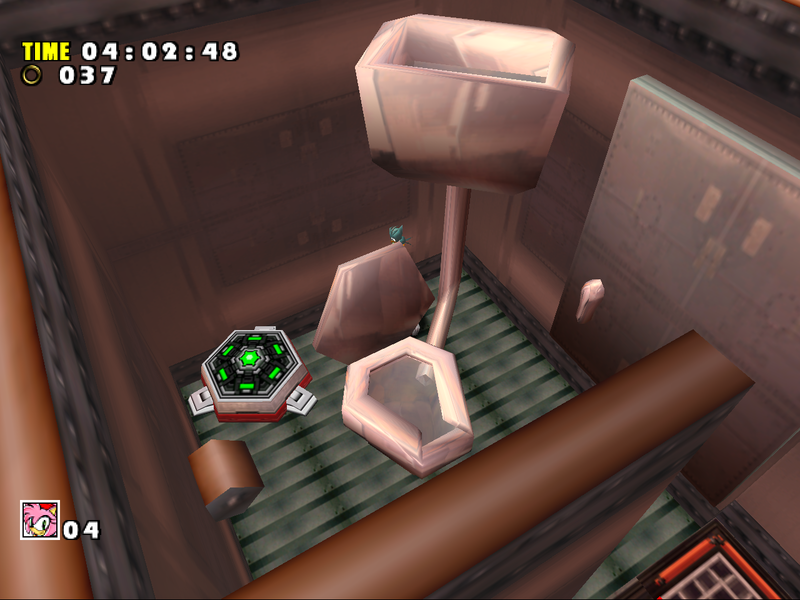 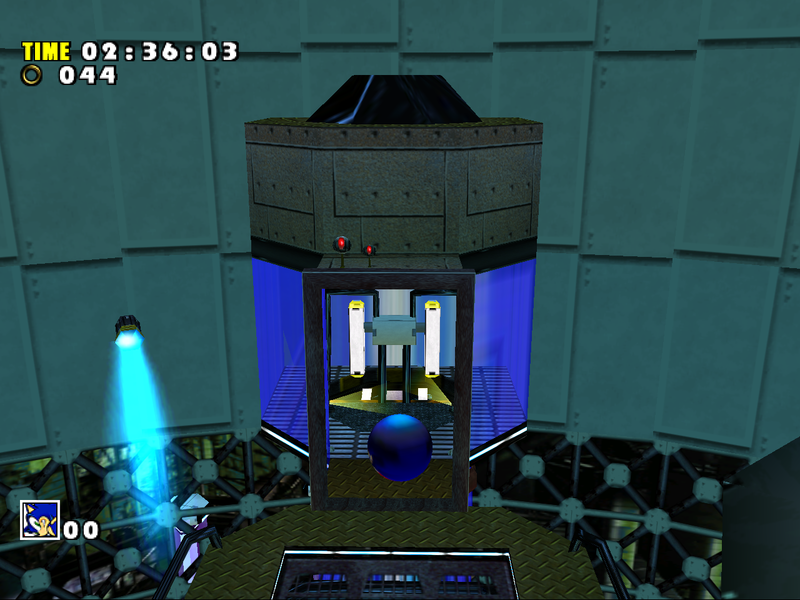 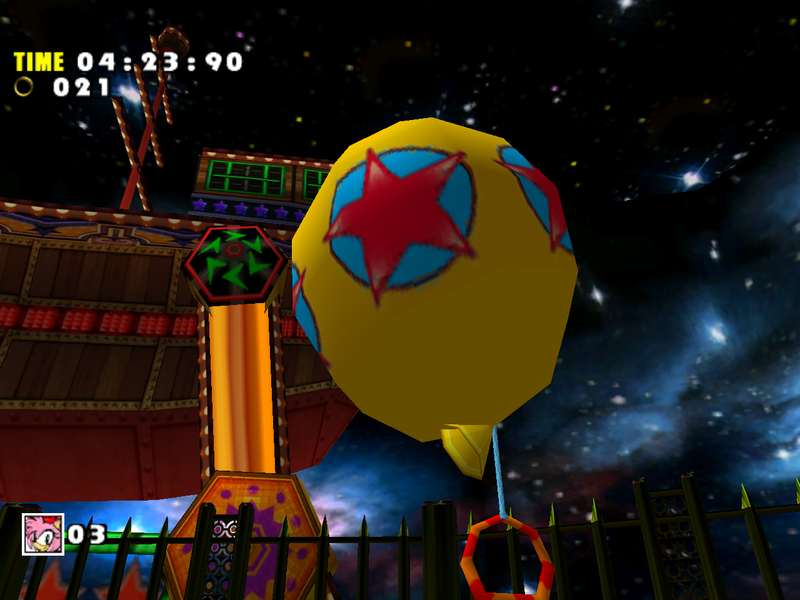 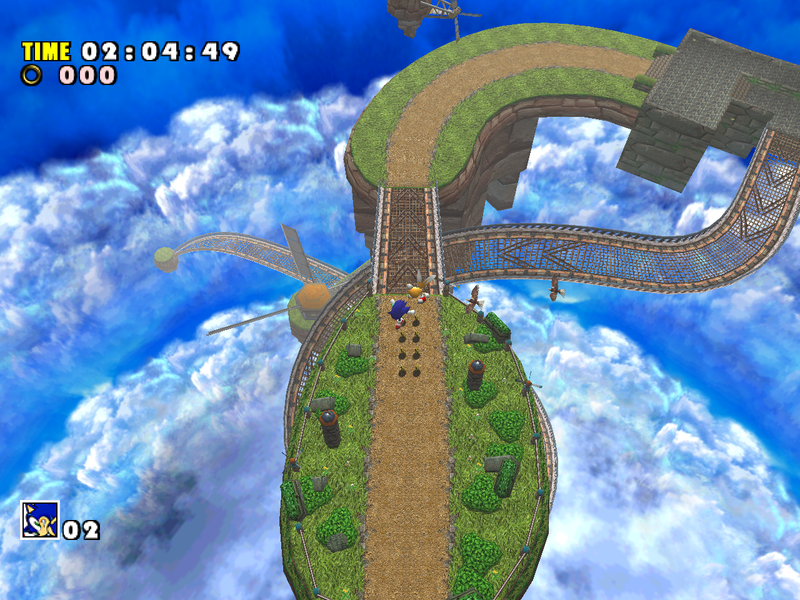 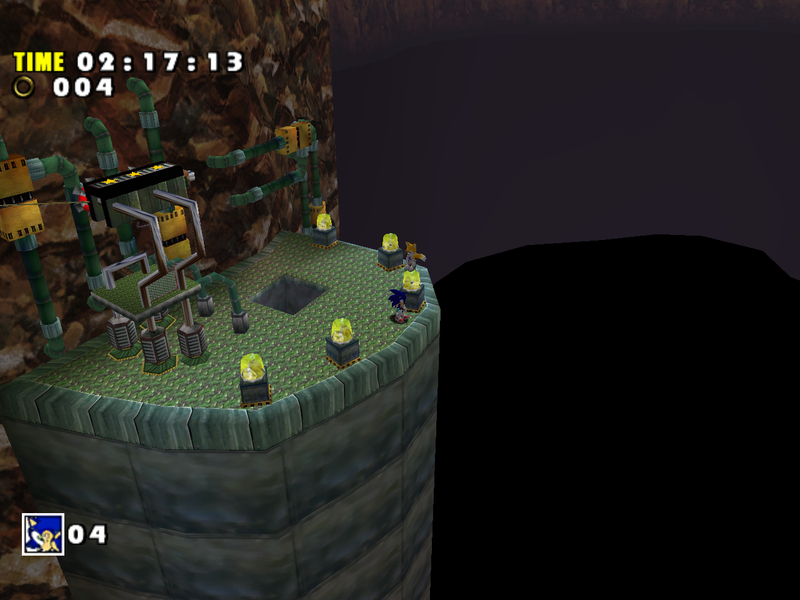 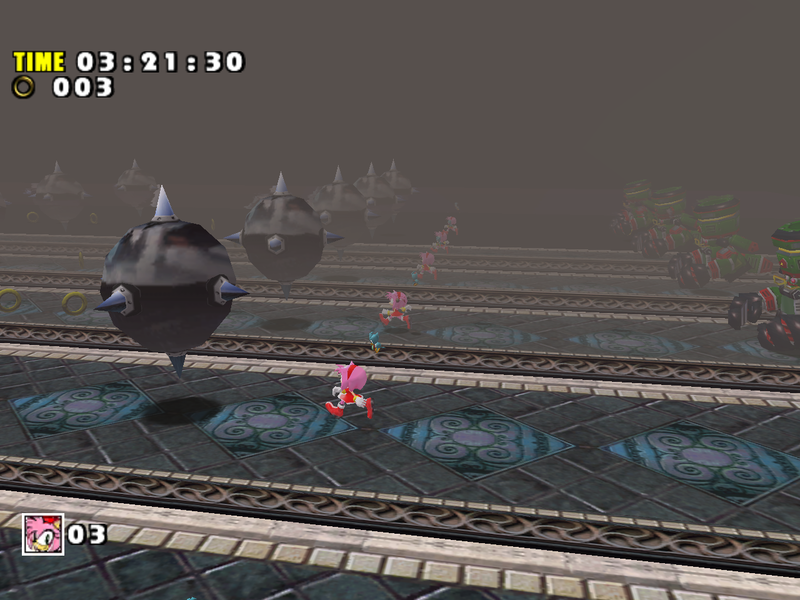 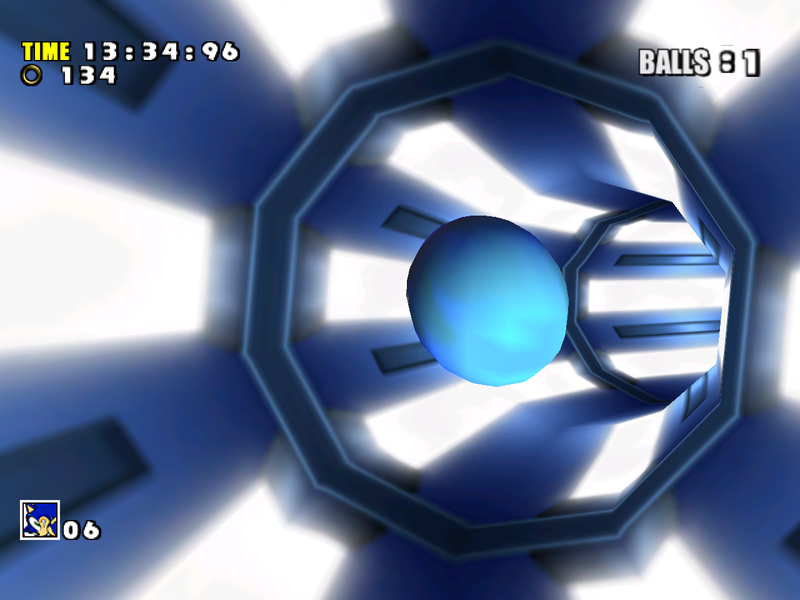 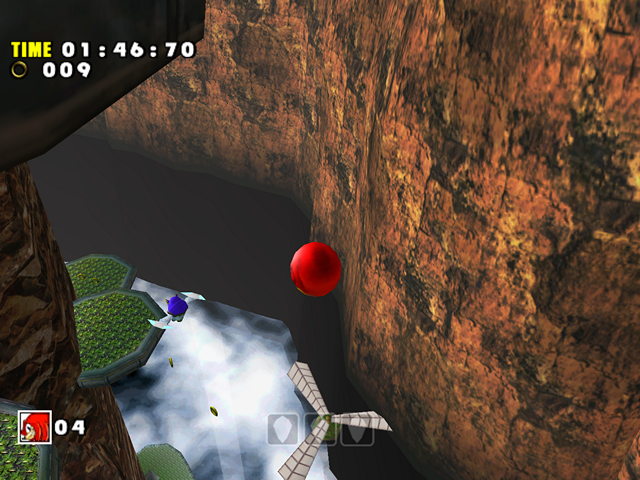 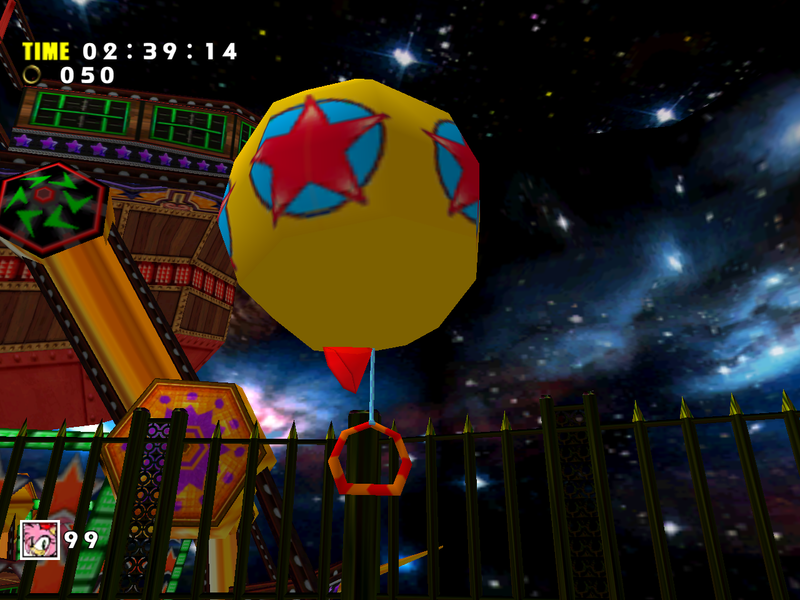 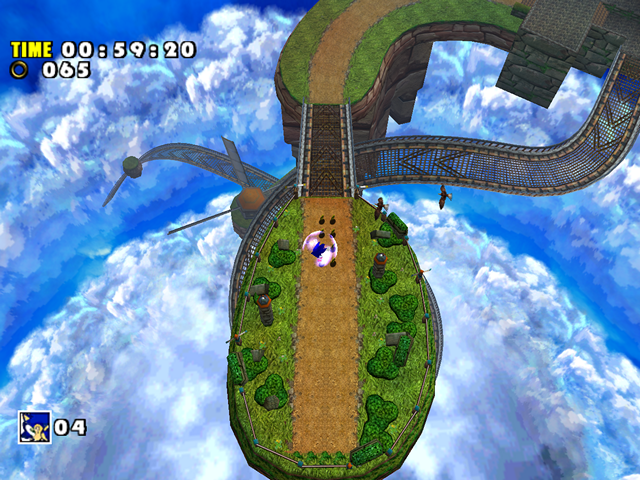 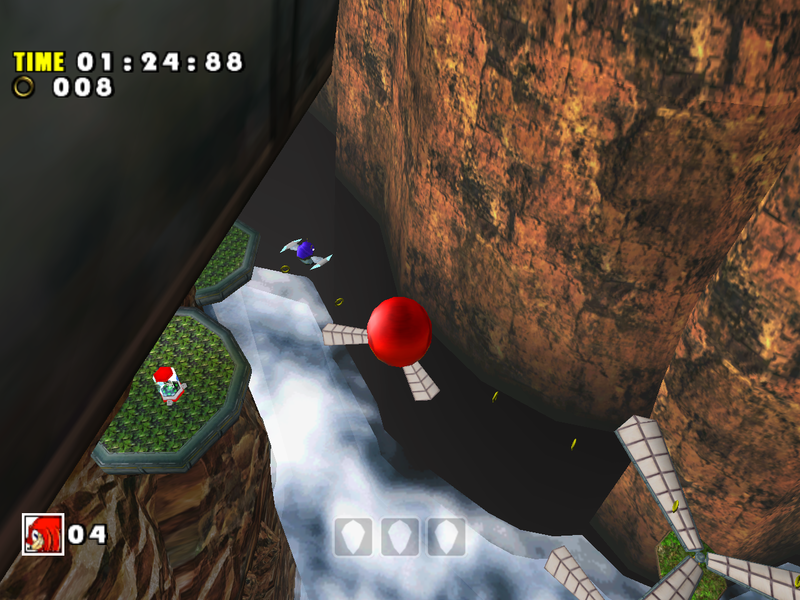 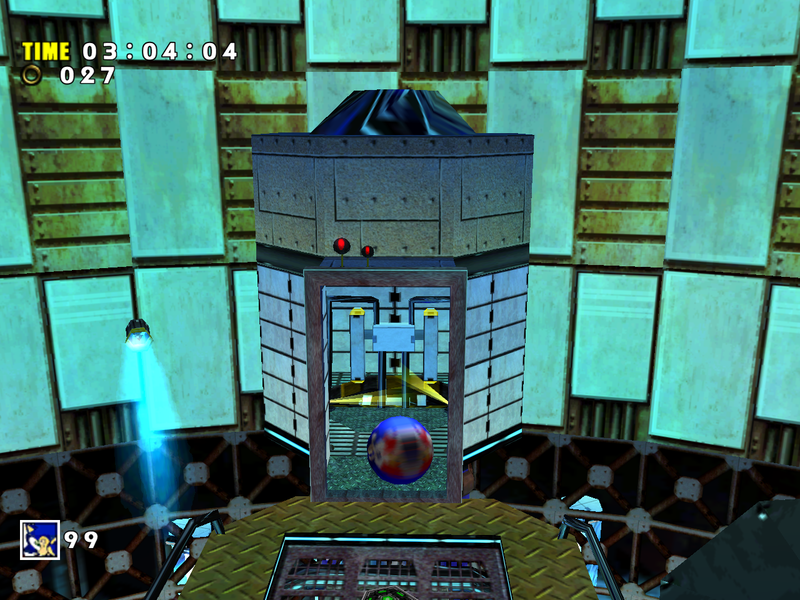 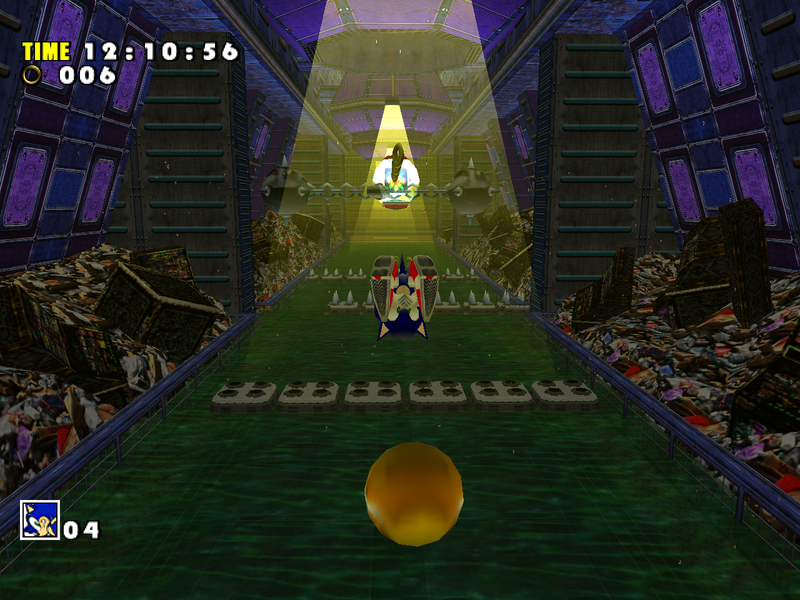 Sky Deck, a sky-themed level, also had a unique gimmick: every once in a while the Egg Carrier changes altitude, and the environment descends into darkness. The wind also gets stronger, sometimes blowing things away. 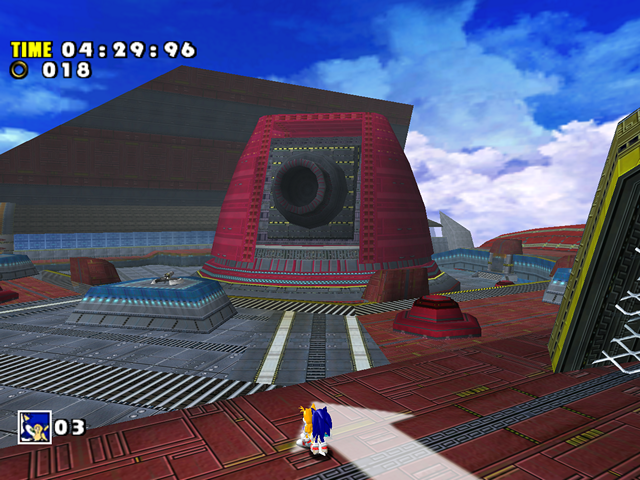 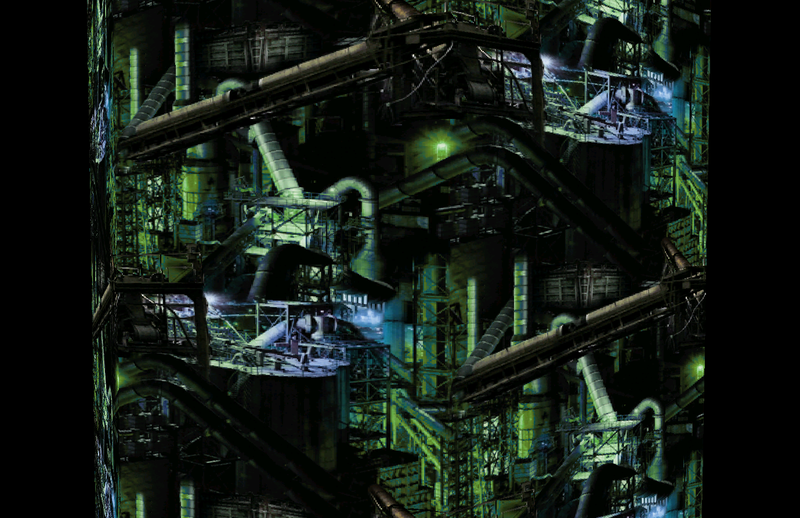 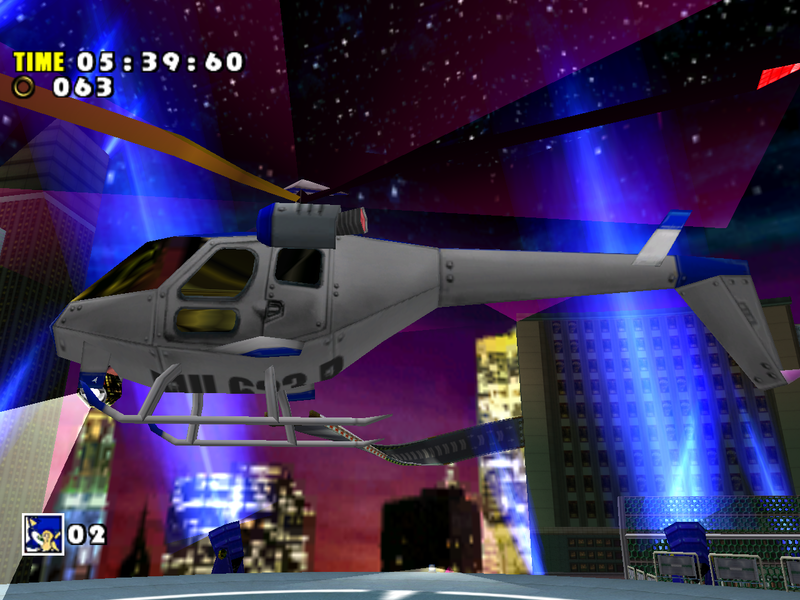 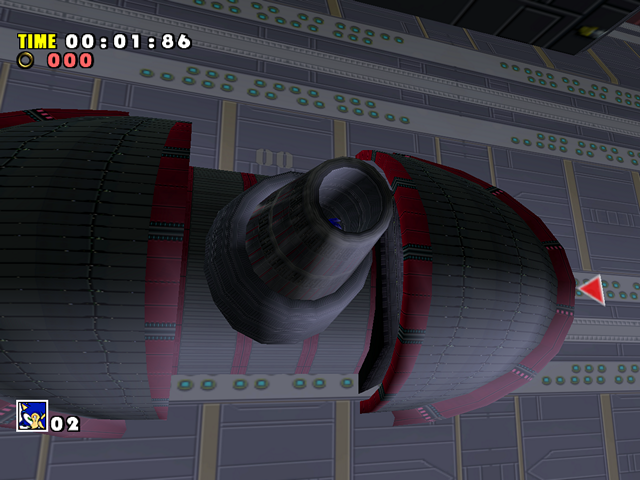 Like every other level in Sonic Adventure, it was made to be visually impressive. 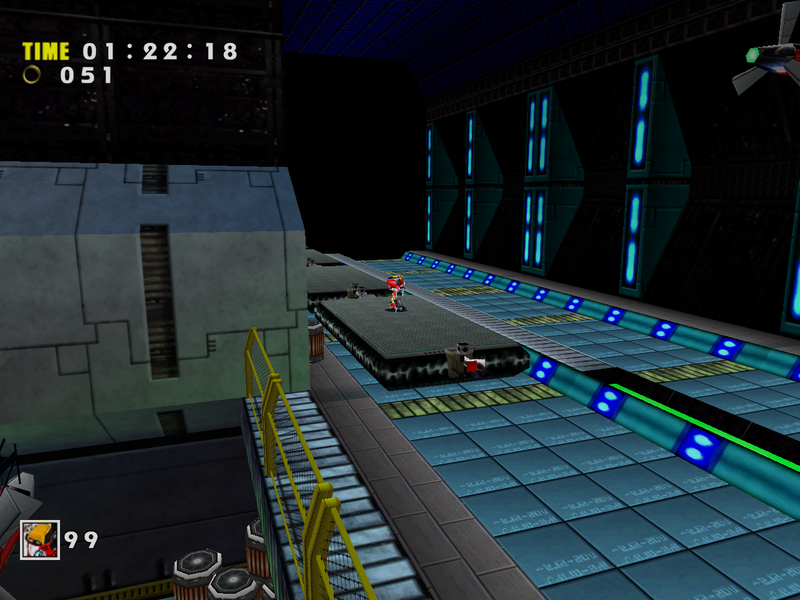 The SADX version of the level, however, has some of the most severe downgrades in comparison with the original game. 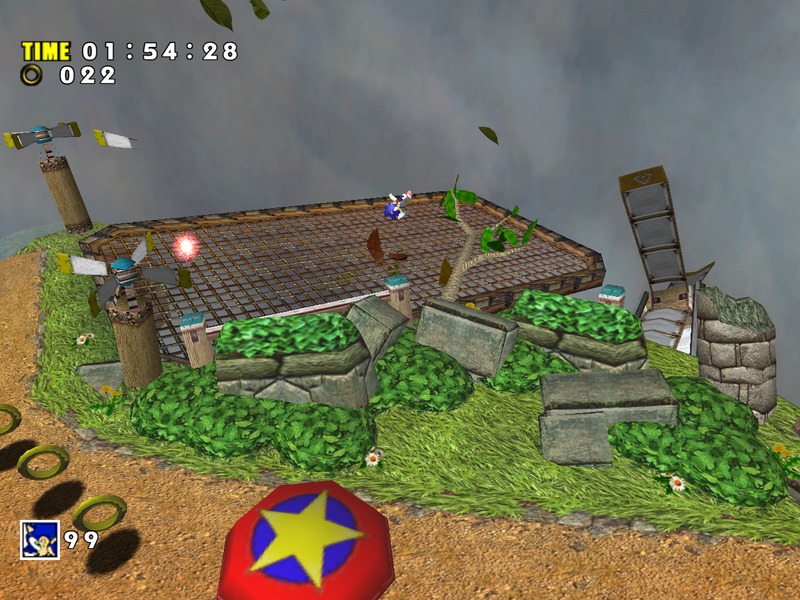 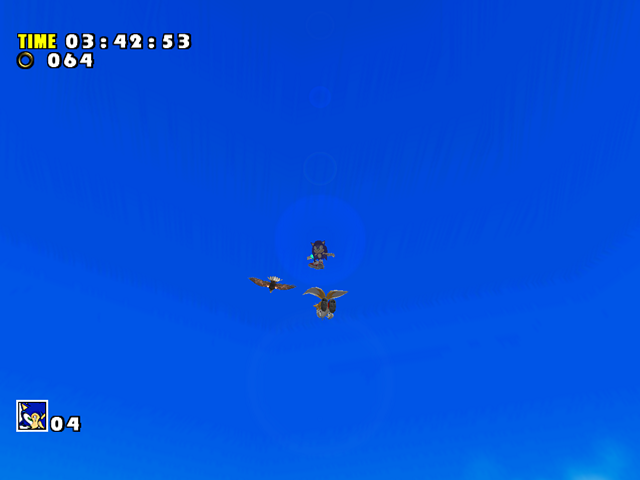 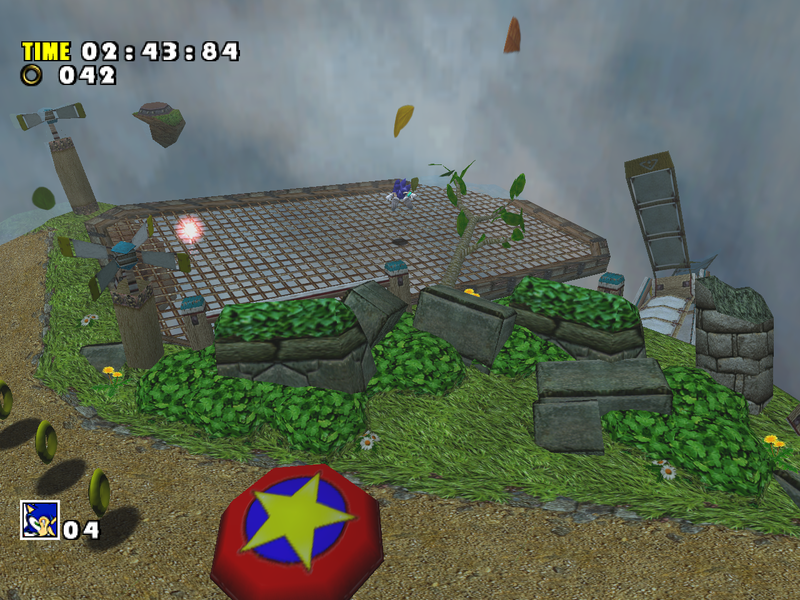 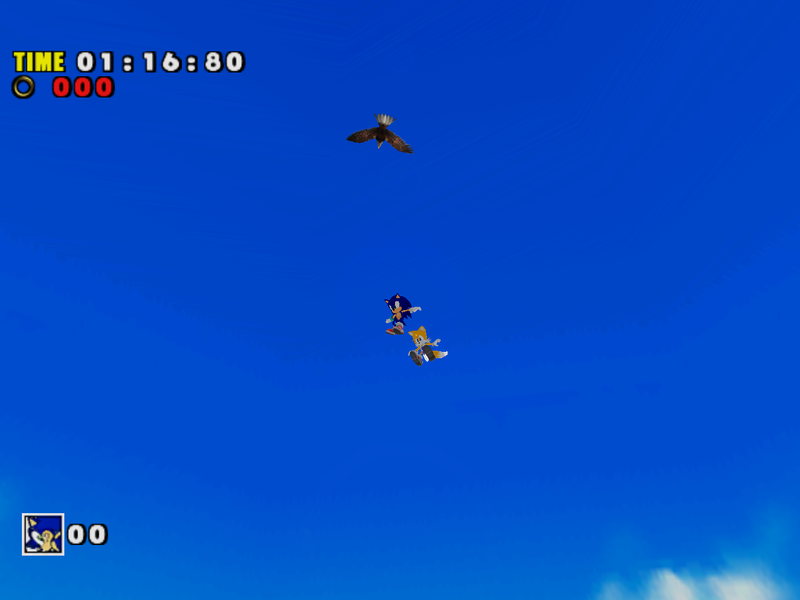 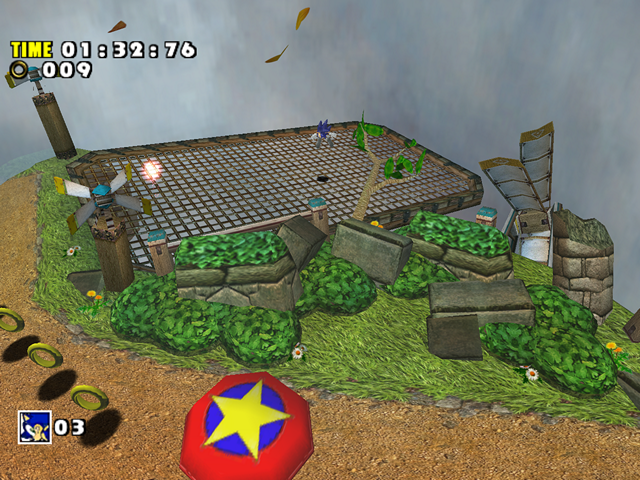 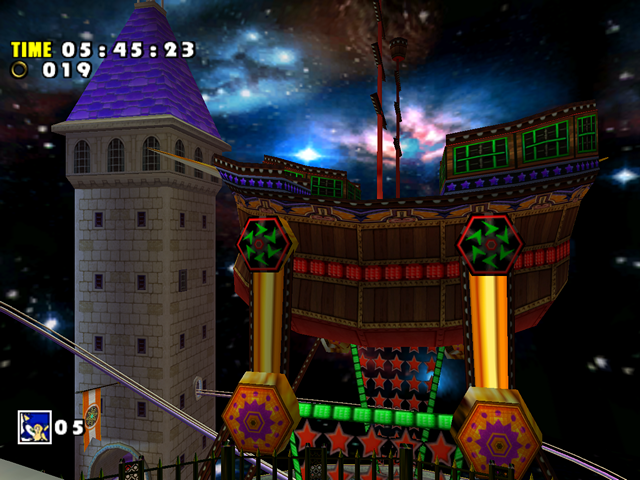 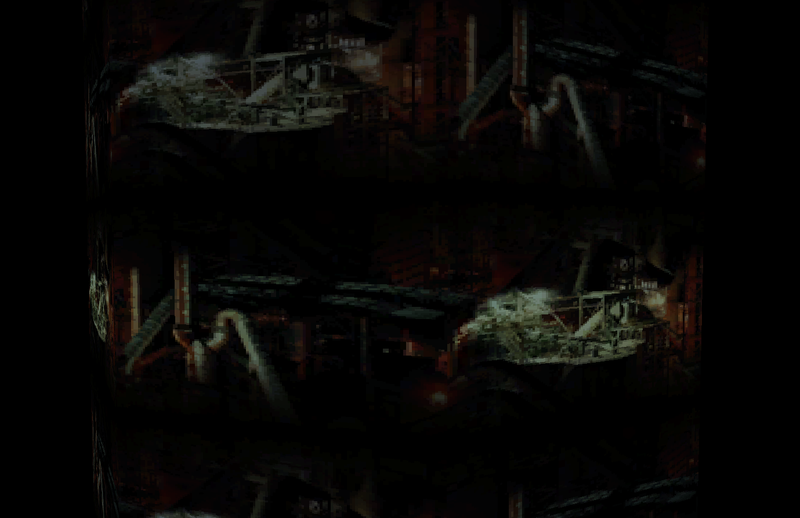 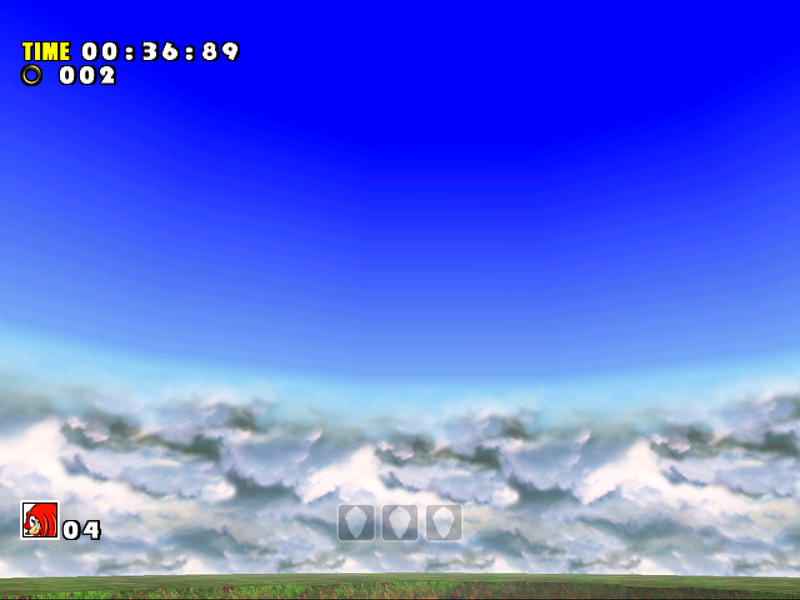 A plethora of special effects is missing, and the sky, which was the highlight of the original level, is mostly static. 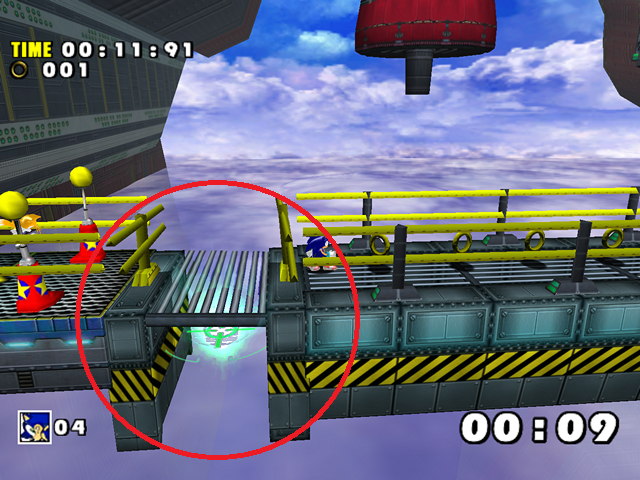 Let’s have a look at some of the most visible problems with this level. 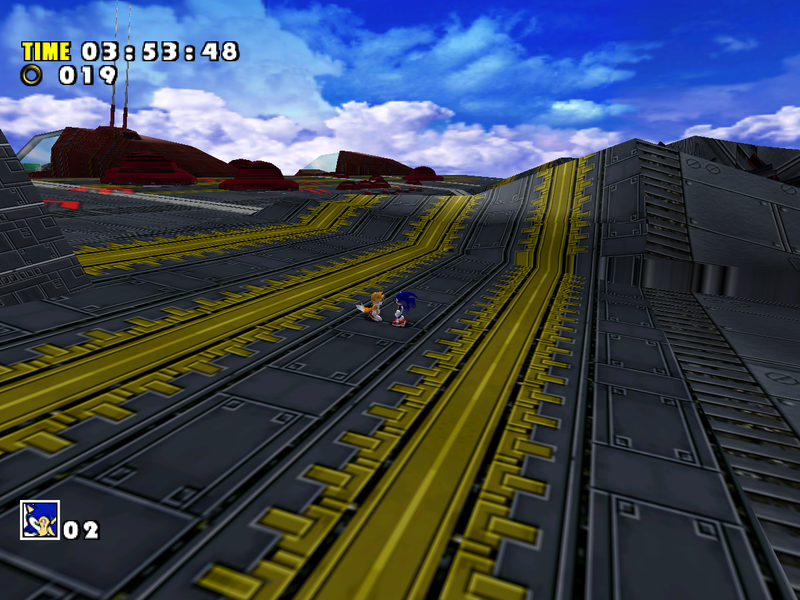 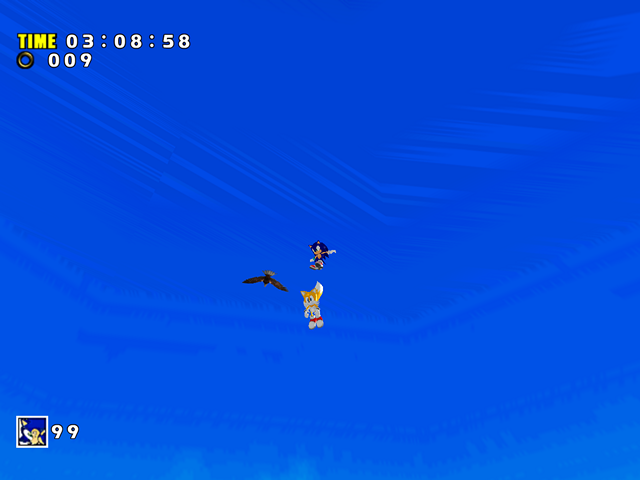 The cloud layers in Sky Deck are completely static in SADX. 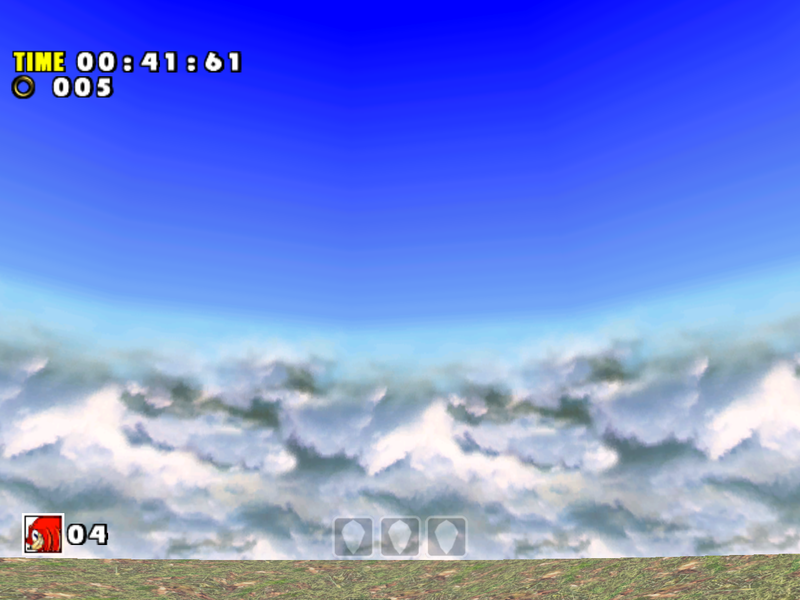 Although making the layers scroll can be achieved with a simple hack, the sky is not moving in the ports. 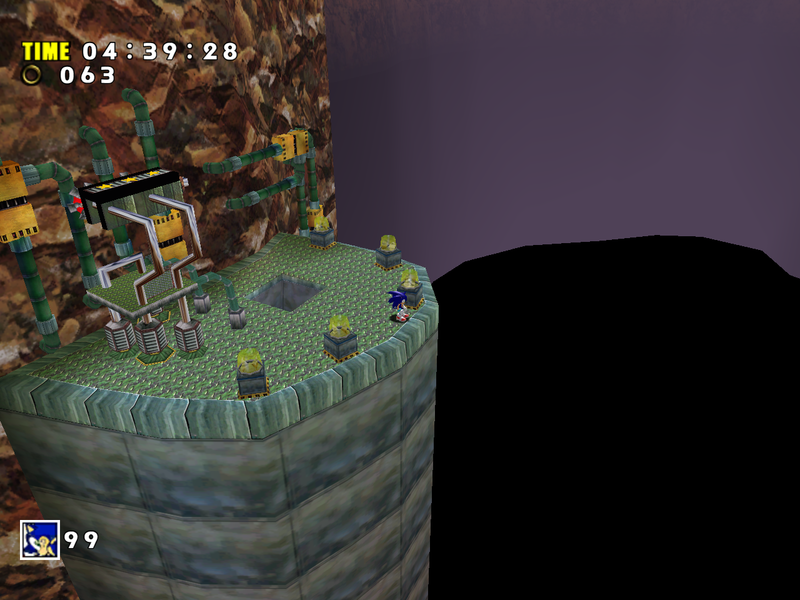 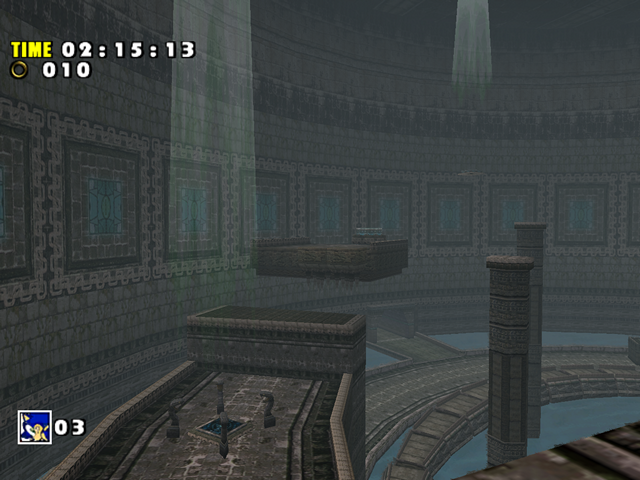 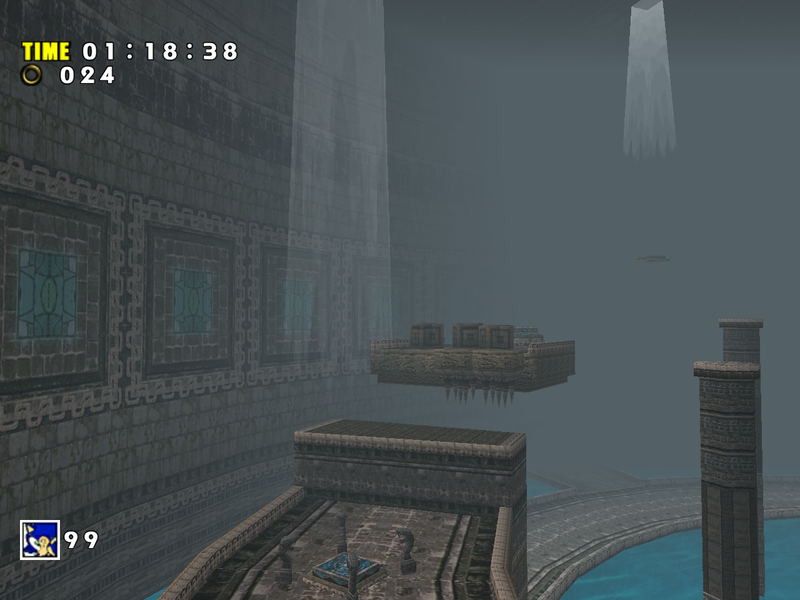 Lack of cloud movement makes the level feel empty and lifeless. 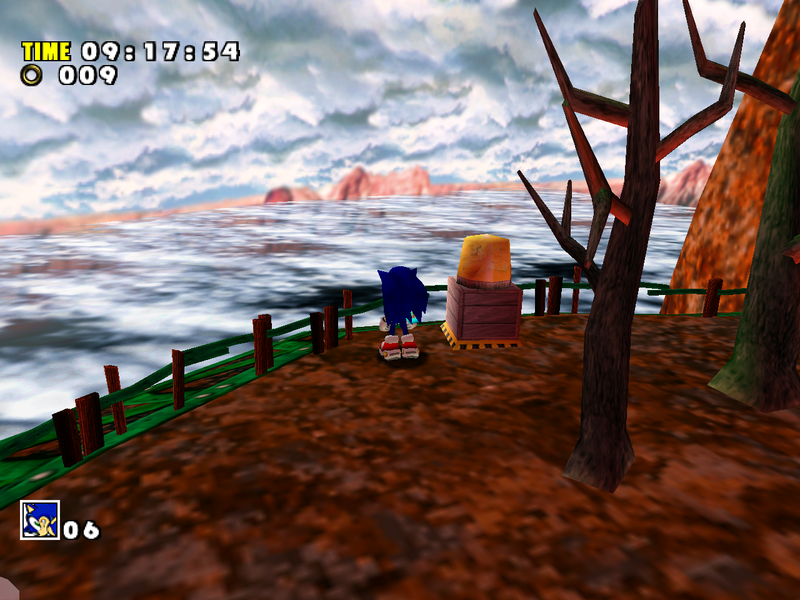 On the Dreamcast, the transition between “normal” and “dark” versions of the sky was smoother: before the sky changed texture, it faded out to white with an additive effect, and then faded back in with the new texture. 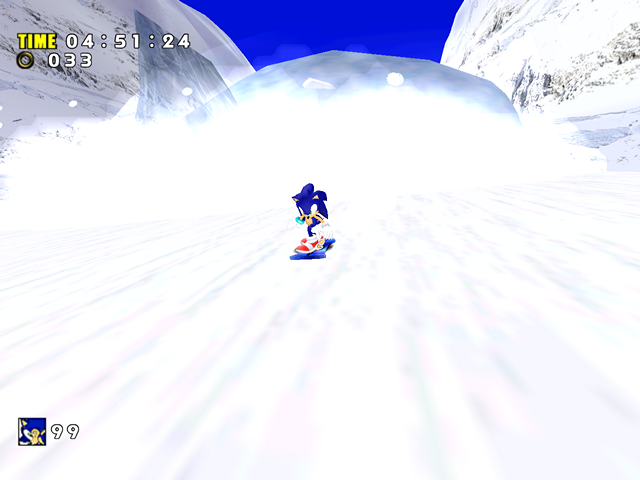 Fog also became brighter and thicker during the transition, then it went back to “normal” mode, which also had a “dark” and a “light” version. 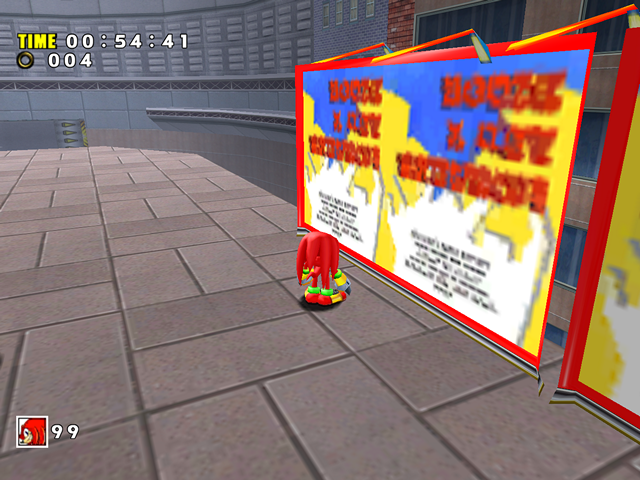 All of the above details are lost in SADX. 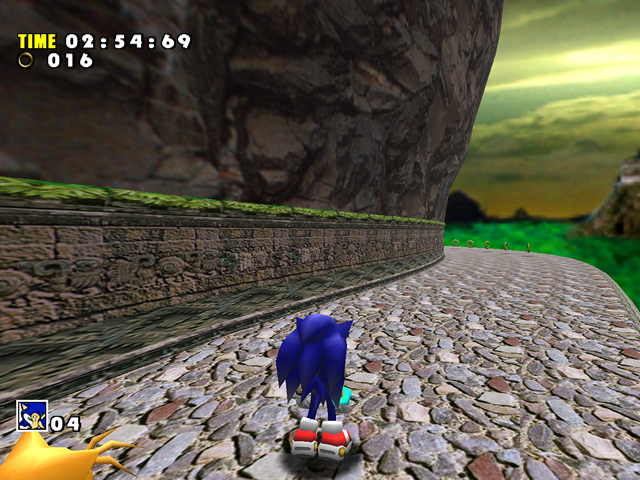 The sky texture changes abruptly, there is no fog adjustment, and the additive blending of the sky is missing. 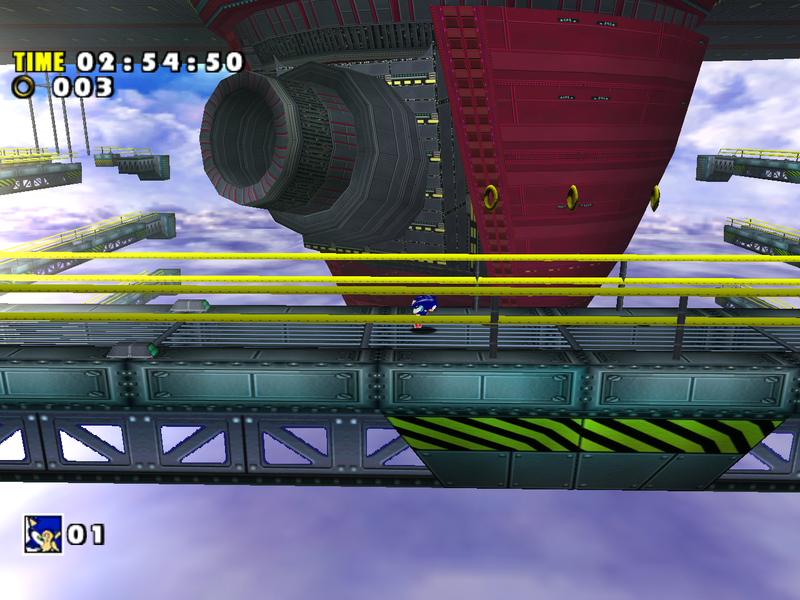 In the original game you can hear Eggman’s announcements “Descending into the clouds, slow the ship down!” and “Go up – full speed ahead!” whenever the ship changed altitude in the first section of Act 2. These announcements are never heard in SADX because they were removed from the level’s soundbanks, even though the game still has the code to play them*. 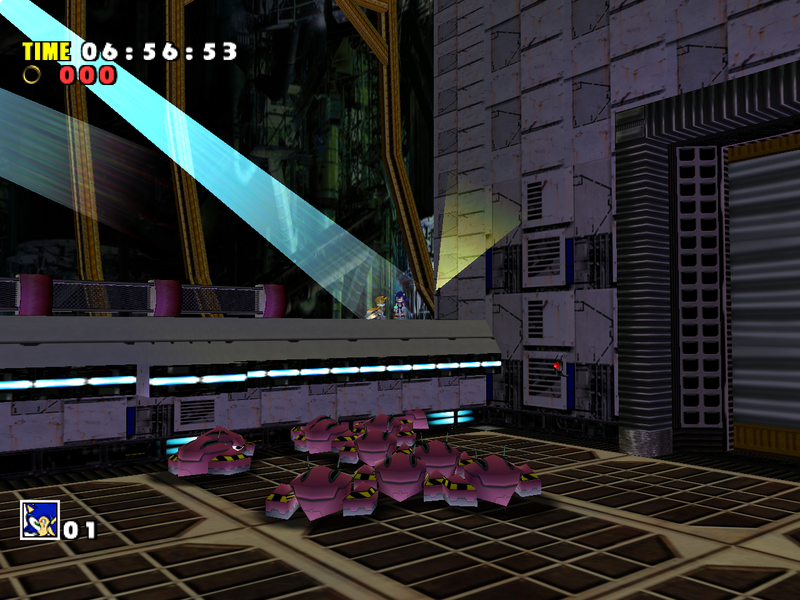 We can only speculate why, but my guess is they were removed after the SADX sound system was retooled to use fewer soundbanks. The Dreamcast version had Japanese and English soundbanks for some levels, while SADX only has Japanese/English versions of character voice soundbanks. 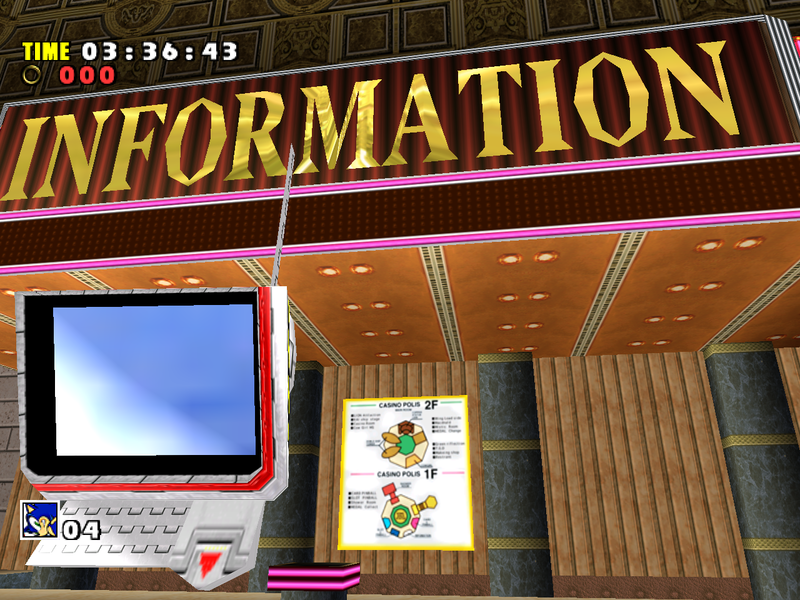 *The code to play the announcements is buggy and cuts them off before they finish playing. 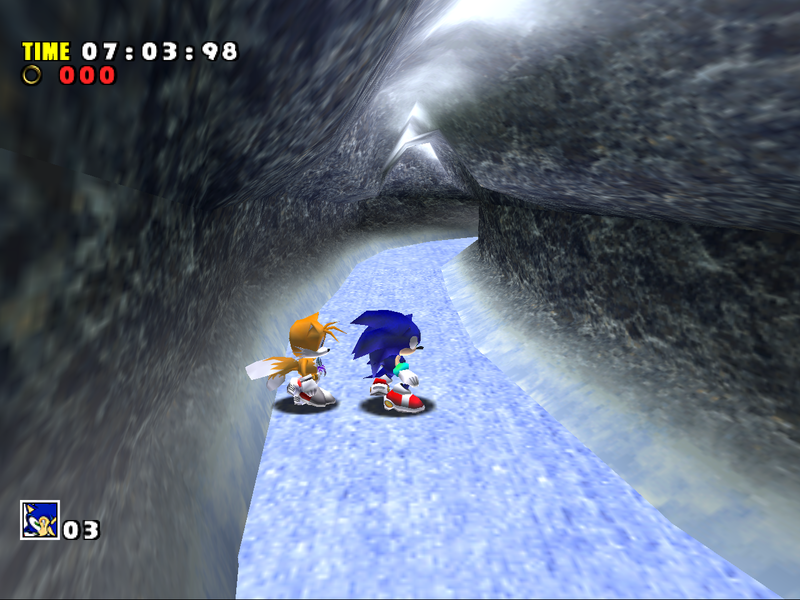 This also happens in the Dreamcast version, but the problem got worse in SADX because the code was not adjusted for 60 FPS. The Sound Overhaul 2 mod fixes both problems, and the announcements play properly at any framerate. 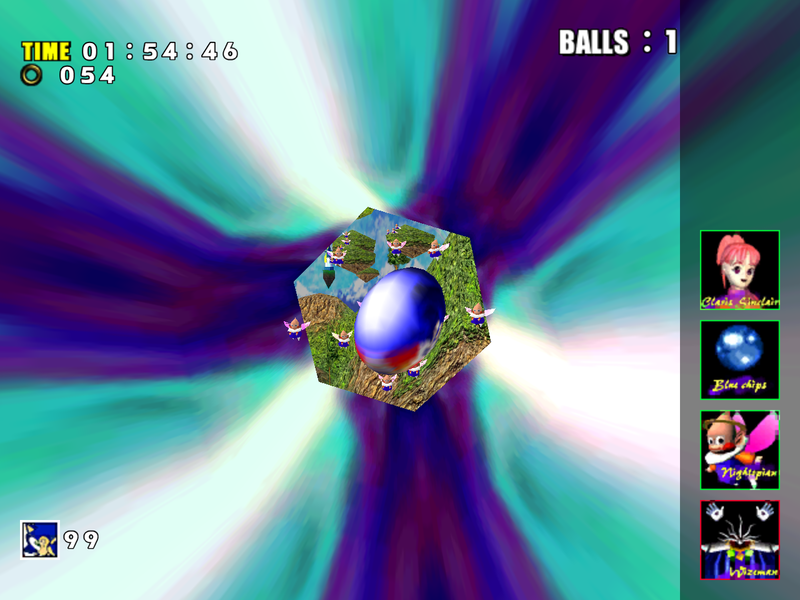 Here’s a video of this effect in motion. 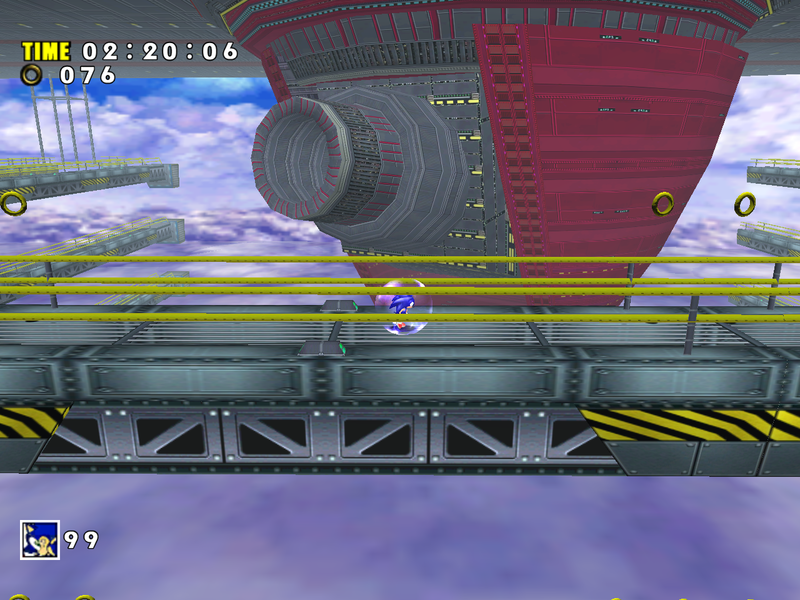 Notice how unnatural and broken the sky looks on the Gamecube. The visible cutoff is caused by reduced skybox draw distance in the ports. 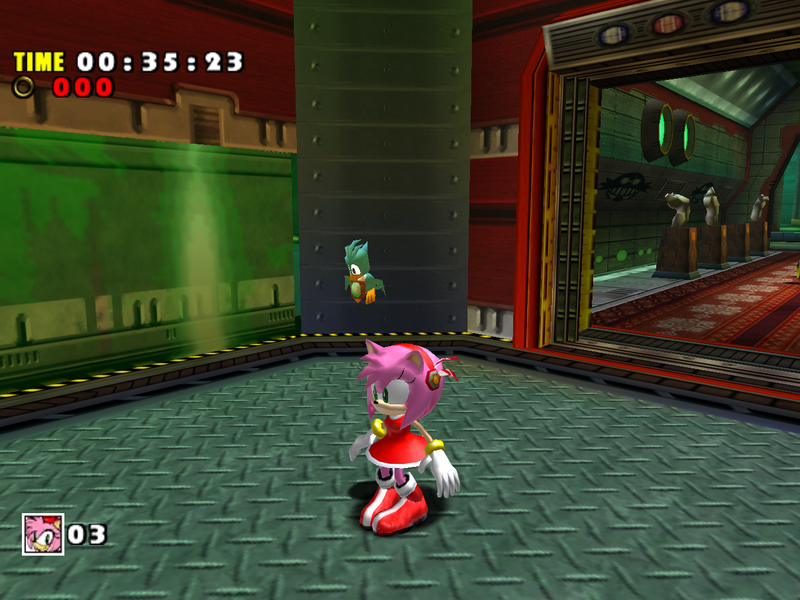 Minor but funny issue: the code for rendering the robot maid cleaning the floor behind the blue glass is broken and disables the glowing piece under her skirt (left – normal, right – disabled). 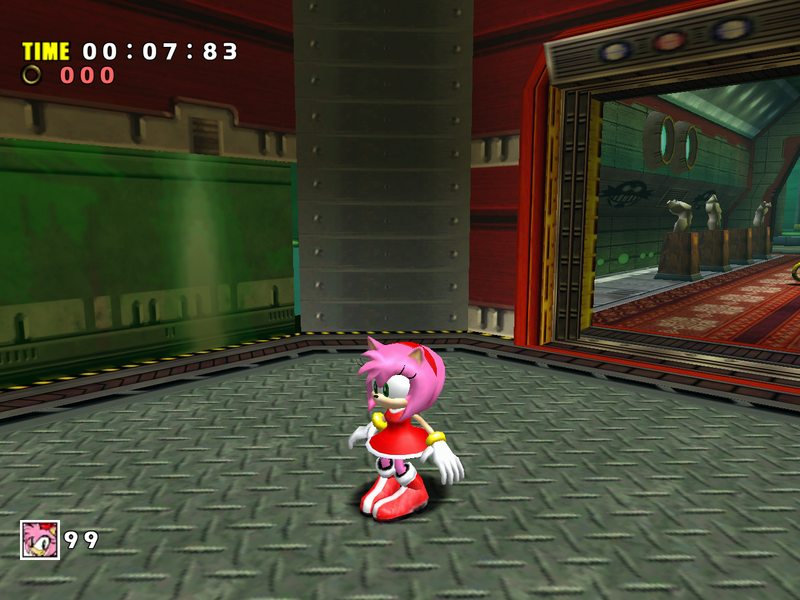 It disappears only in one of her animations, and shows up if you pause the game. 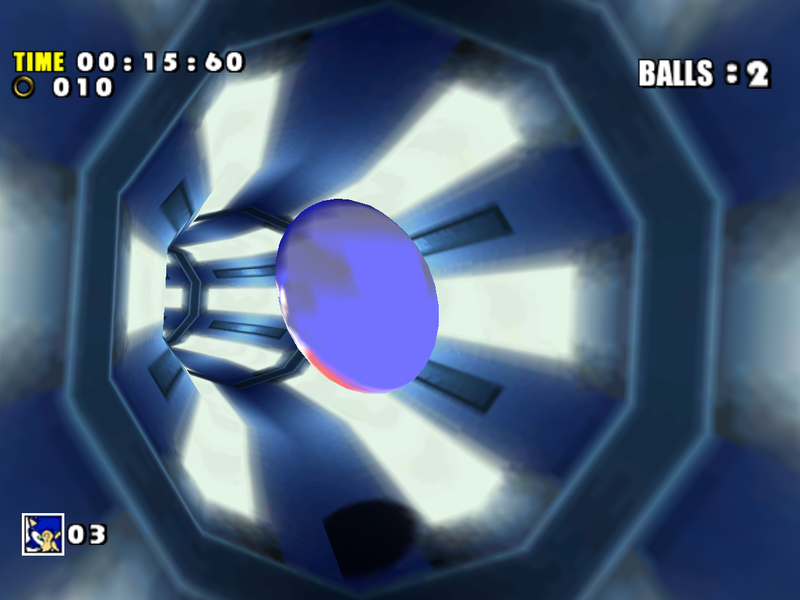 This happens because the variables in the function are in the wrong order. 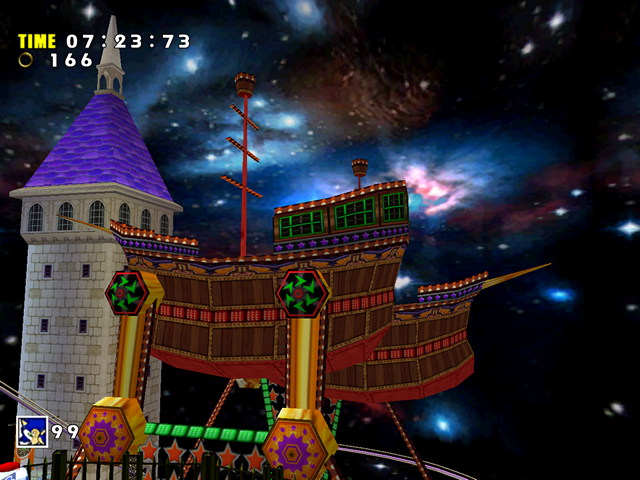 It’s likely a leftover from the byteswapped Gamecube version that wasn’t adjusted for the PC version’s byte order. Sky Deck doesn’t have too many downgrades from SA1 in terms of quantity, but quality-wise those downgrades are certainly some of the worst in the entire game – with lack of lighting, missing cloud movement and a broken skybox in Act 3. 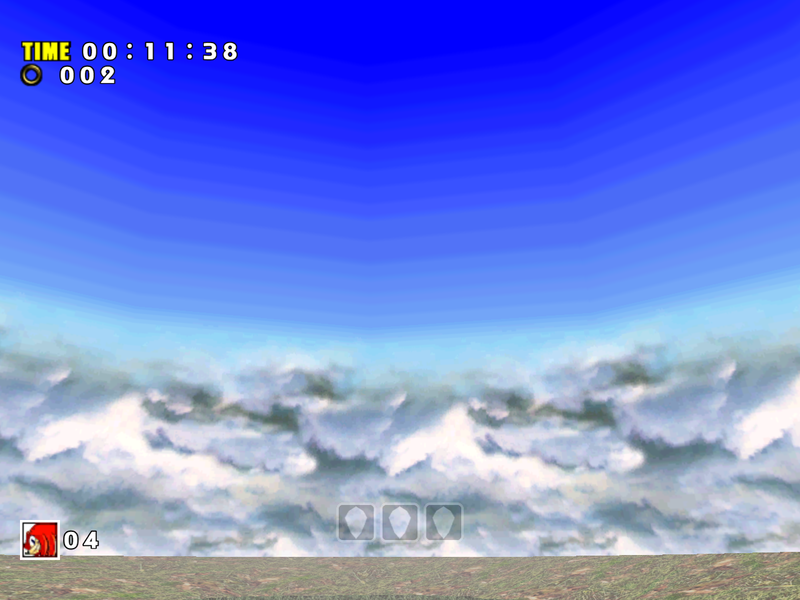 This level can be fixed (for the most part) with Dreamcast Conversion, where I restored cloud movement and implemented various effects, such as additive blending for skybox transitions. The Lantern Engine mod restores the vibrant palette lighting, and the Sound Overhaul 2 mod adds back missing announcements in Act 2. 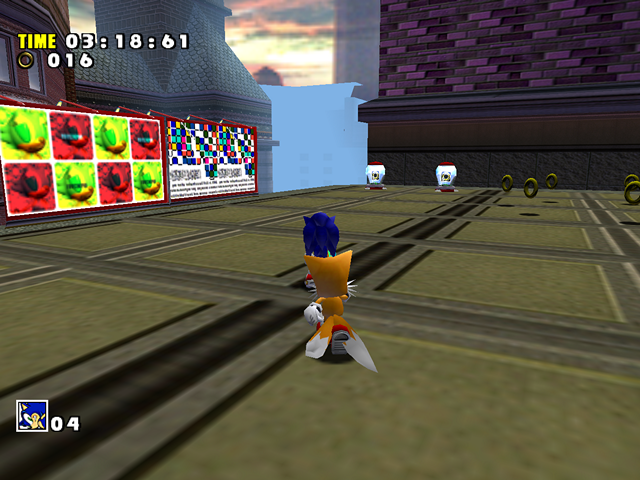 To learn more how to install the mods, head over to the “Fixing the PC version of SADX” section. 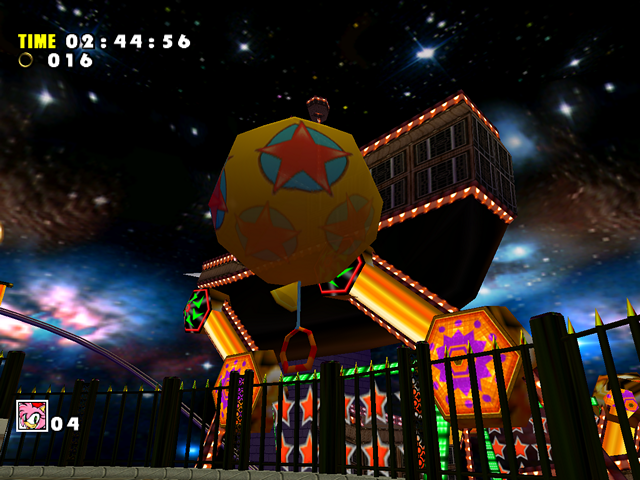 Twinkle Park is one of the areas that received a heavier redesign in SADX. 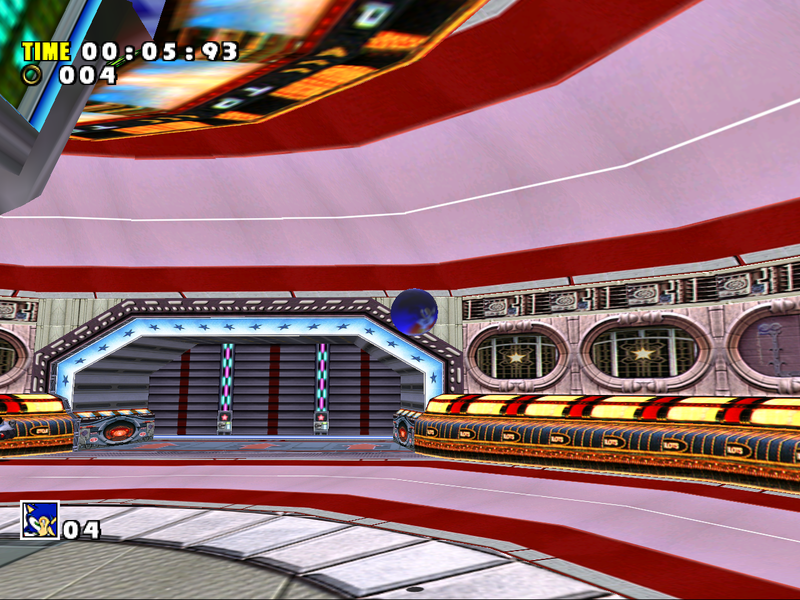 When compared against the Dreamcast original, it almost looks like a different stage. 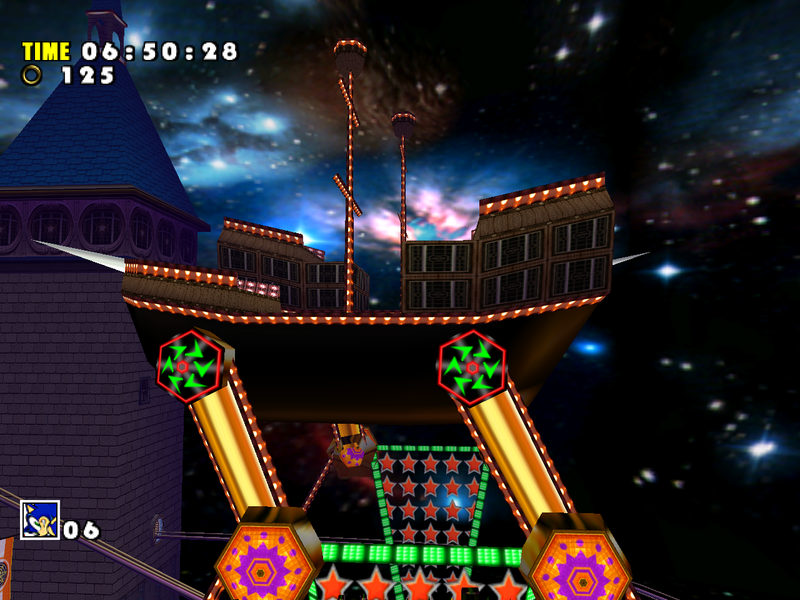 However, there are many areas where this stage falls short of being a decent improvement over its previous version. 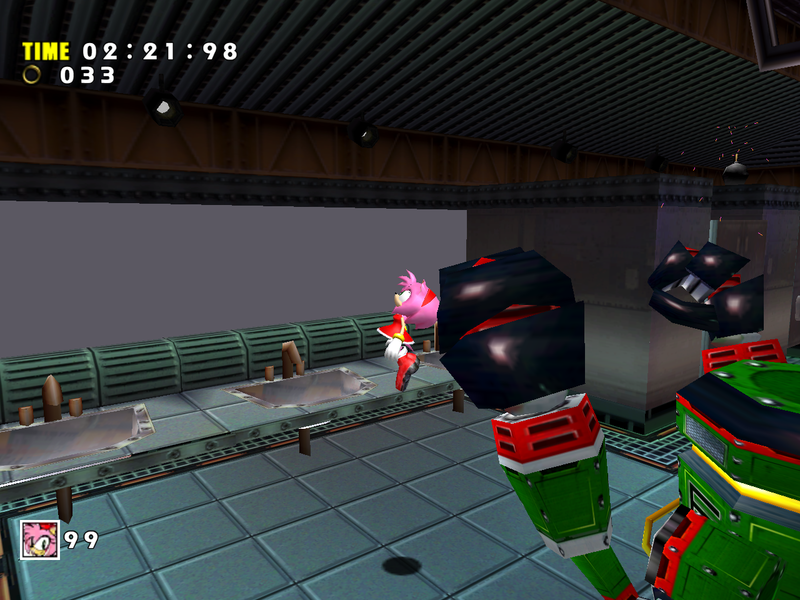 As you can see, texture mirroring affected texture quality negatively because the mirrored texture had to be stretched or squeezed to fit the same model. 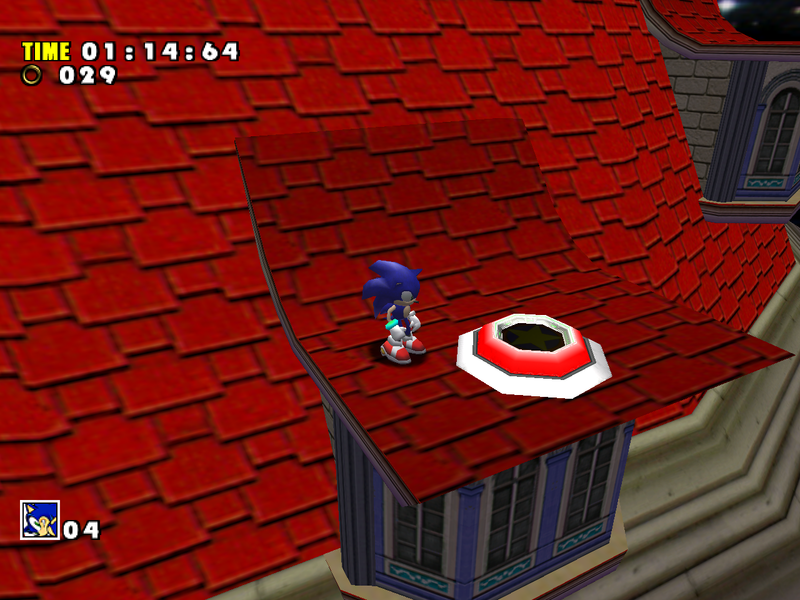 When applied to the model, the trap door texture (bottom) is only quarter of its original size, or half the resolution. However, manual mirroring is unnecessary in the PC port. The PC version’s native mirroring works fine and is still used for a lot of models that weren’t updated. 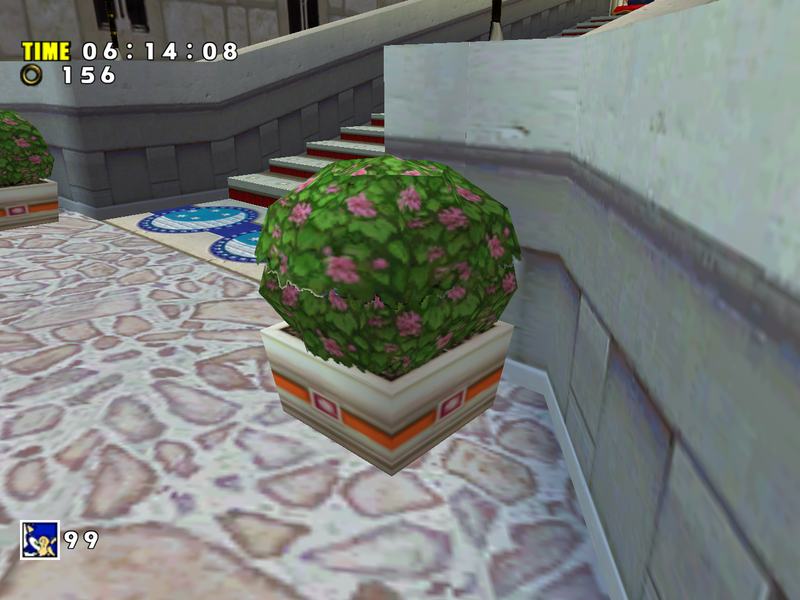 The crown happens to be one of such models – the developers updated the UVs for other models that use the same texture, but didn’t update the crown model. 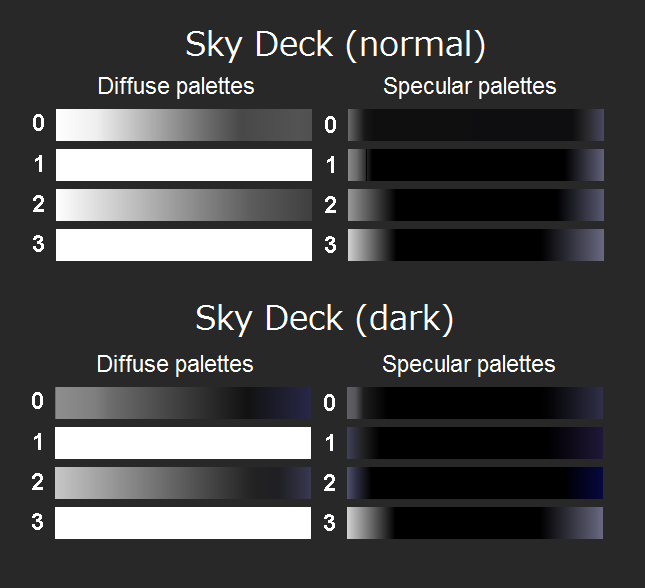 This might seem like nitpicking, but there’s a technical reason behind this issue, and it causes loss of detail in other cases. When rendering a model, console versions of SADX usually ignore the model’s material colors. 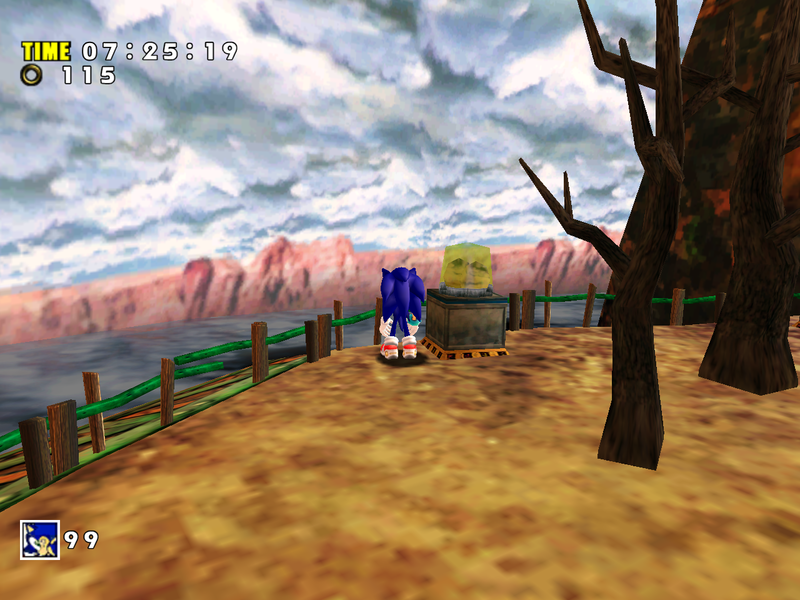 The PC version, however, doesn’t ignore them, and the models end up colored in strange ways. 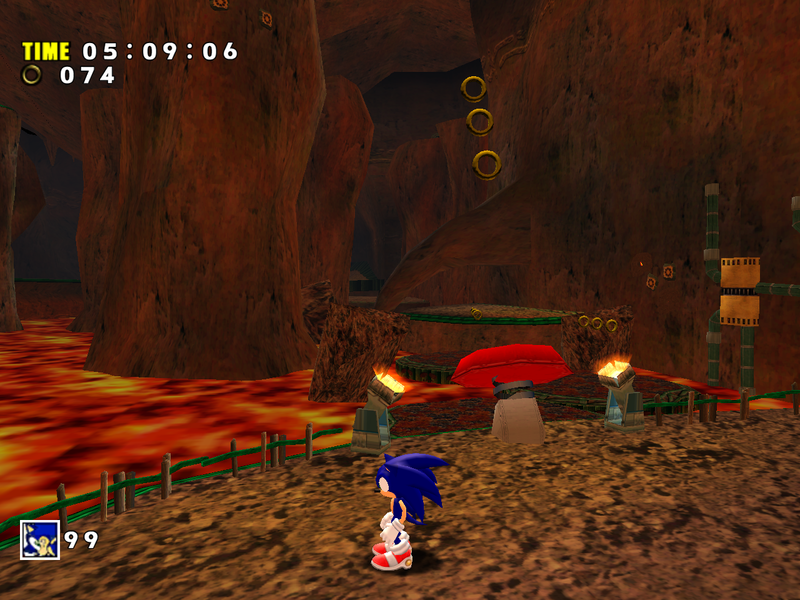 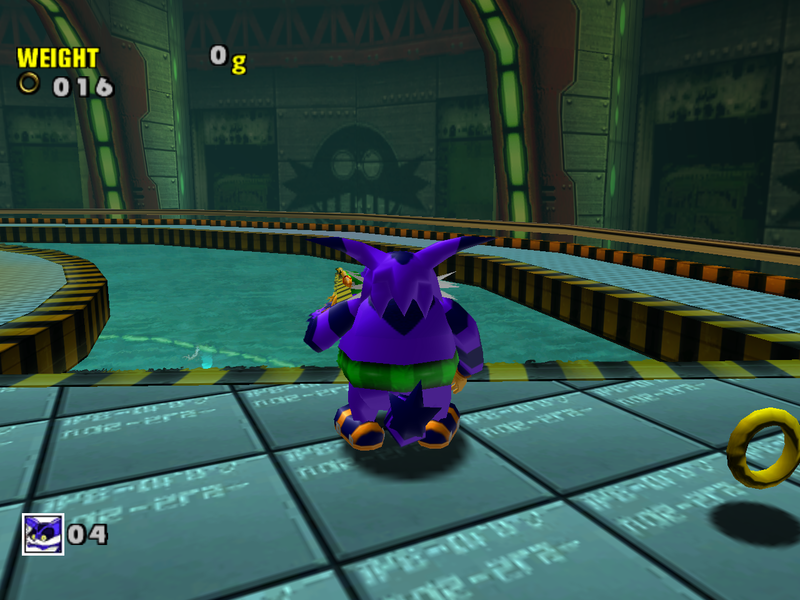 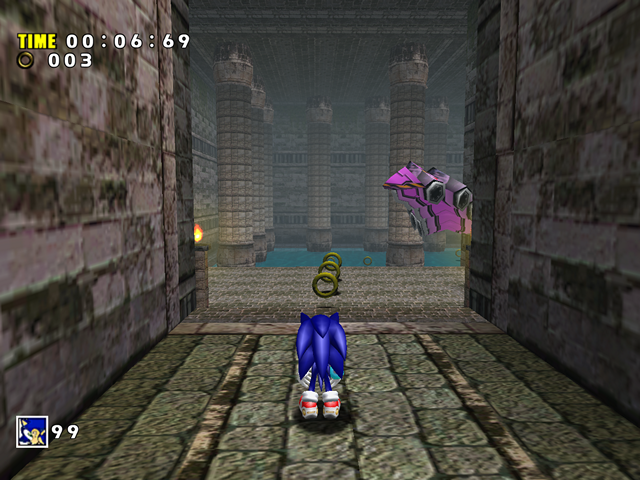 For example, Chaos 0 is blue only in the PC version (even though his textures are still green), and the jungle in the Mystic Ruins looks broken partially because the PC version processes its material colors. 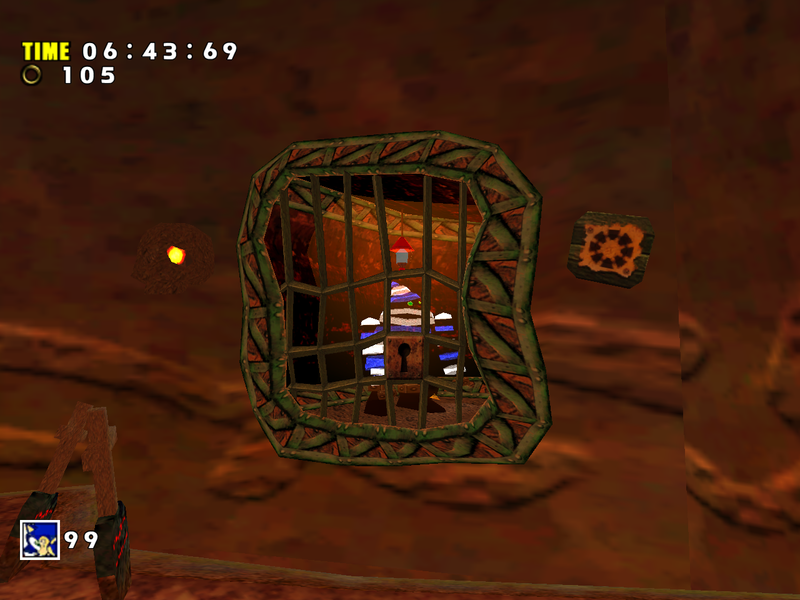 There are many cases like these throughout the game. 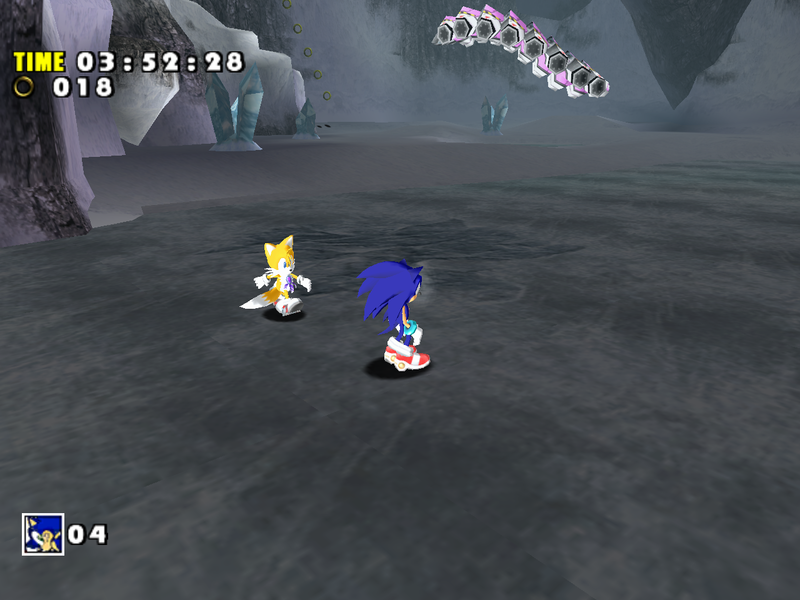 There are supposed to be two Sweep badniks in the second act of Twinkle Park, but only one shows up in SADX despite being included in the game’s SET file. 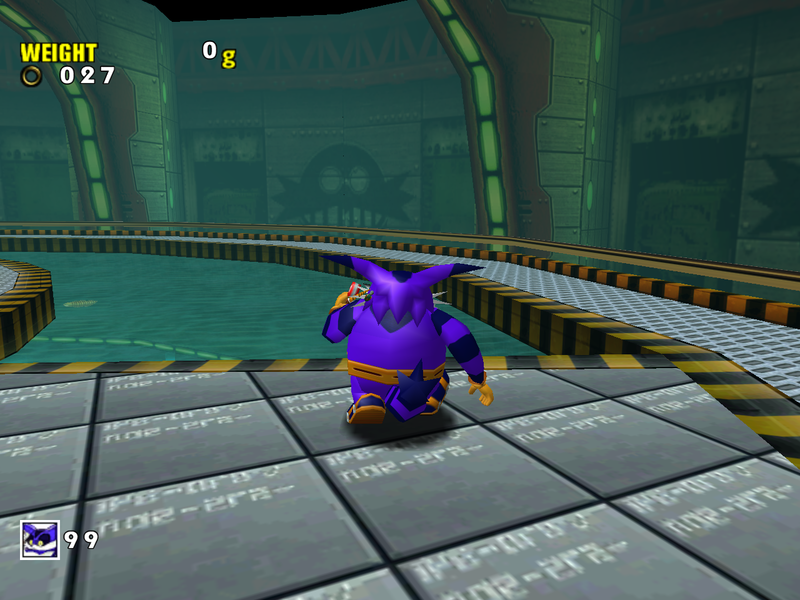 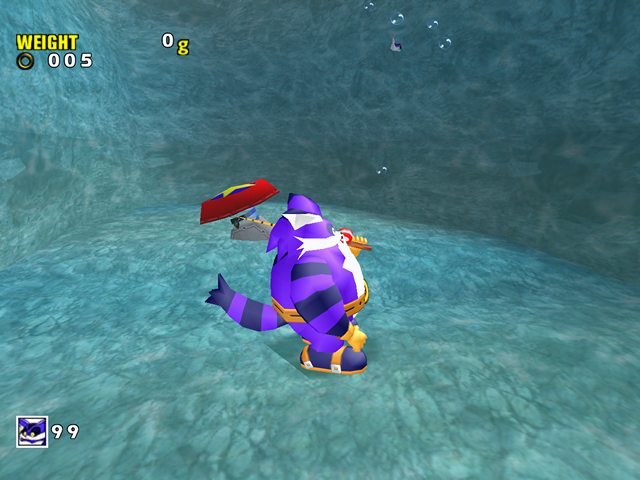 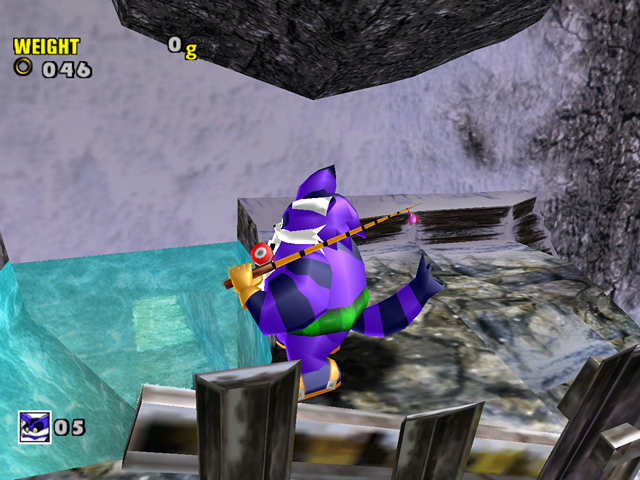 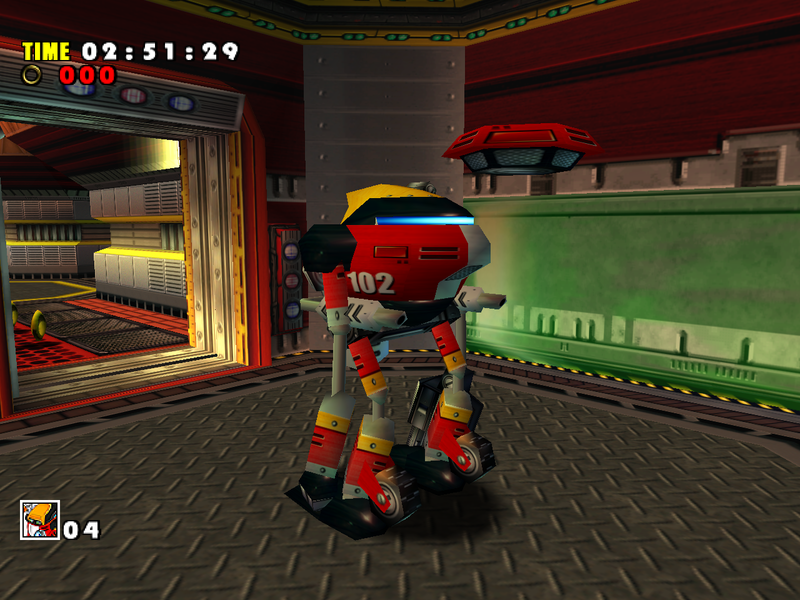 There is a programming error preventing it from spawning properly, which can be avoided by moving the badnik’s position slightly. 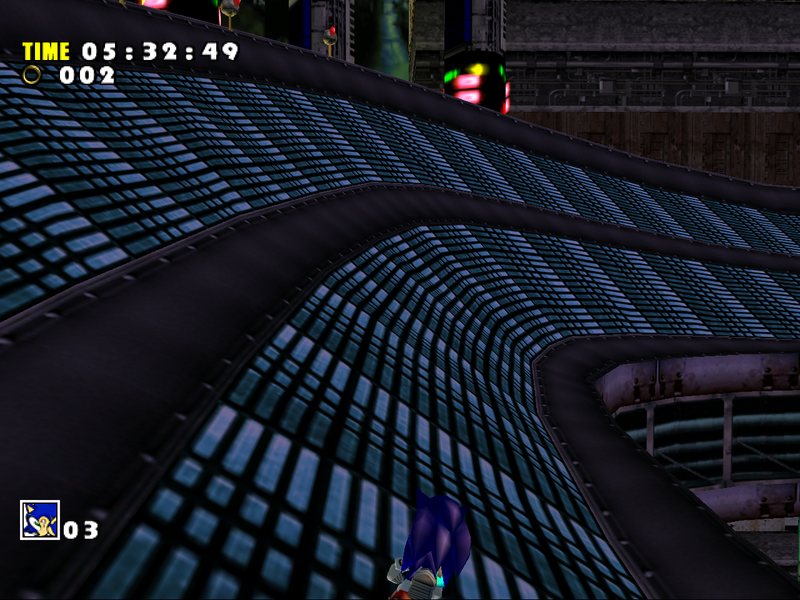 Note how the Dreamcast version also manages to render more reflected paths and doesn’t reveal level geometry from another area. 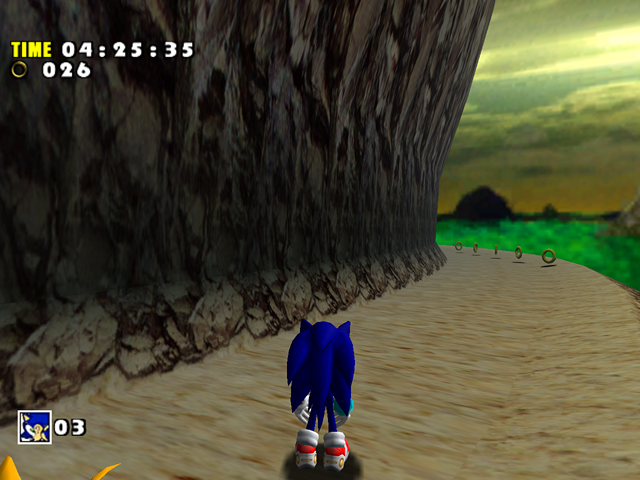 The differences in lighting are also noticeable here. 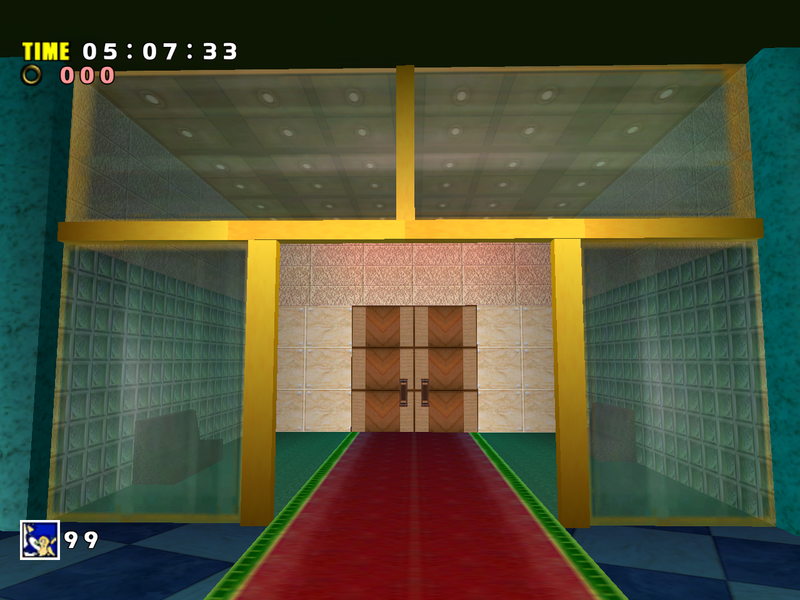 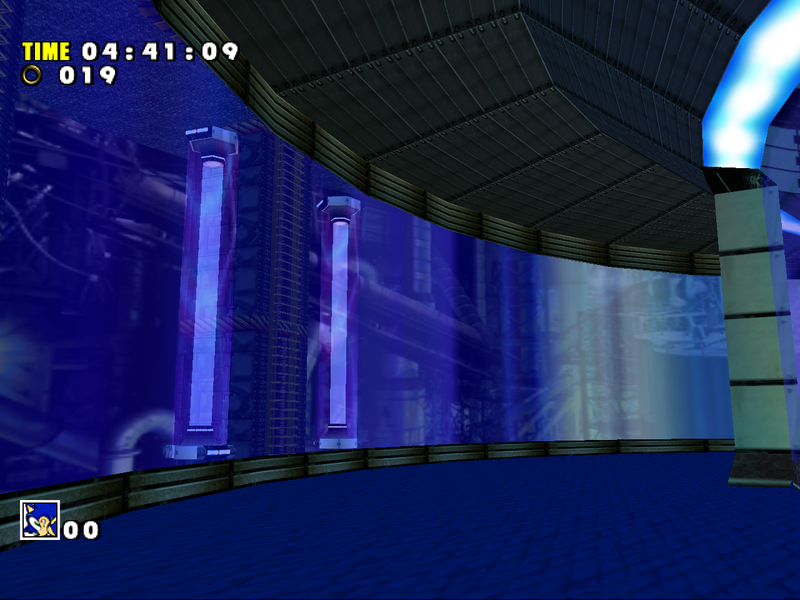 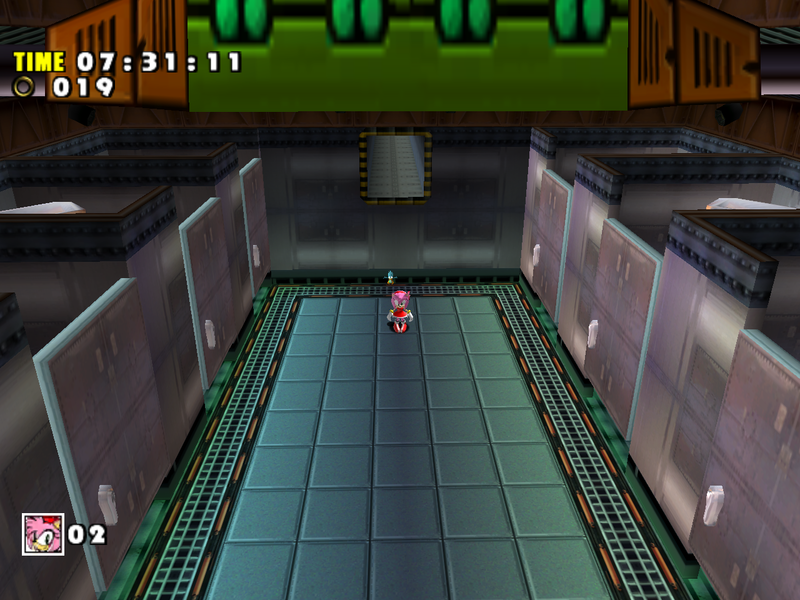 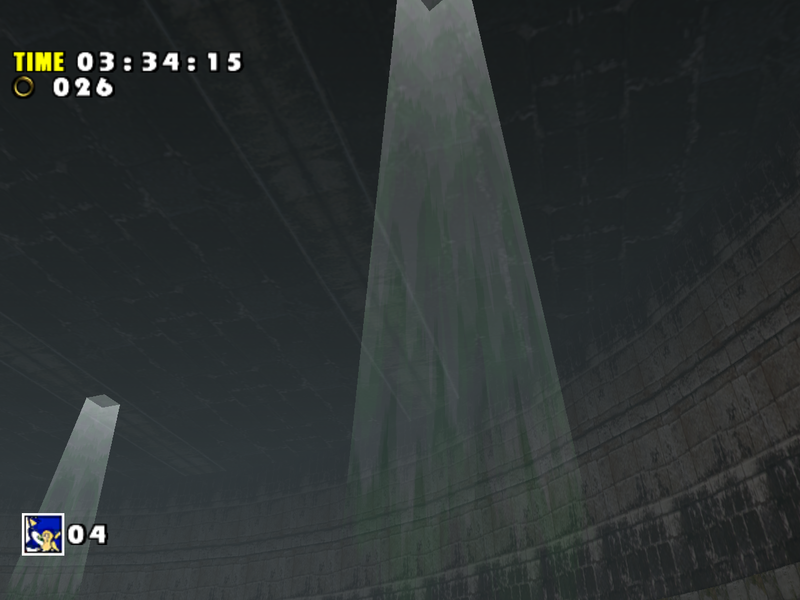 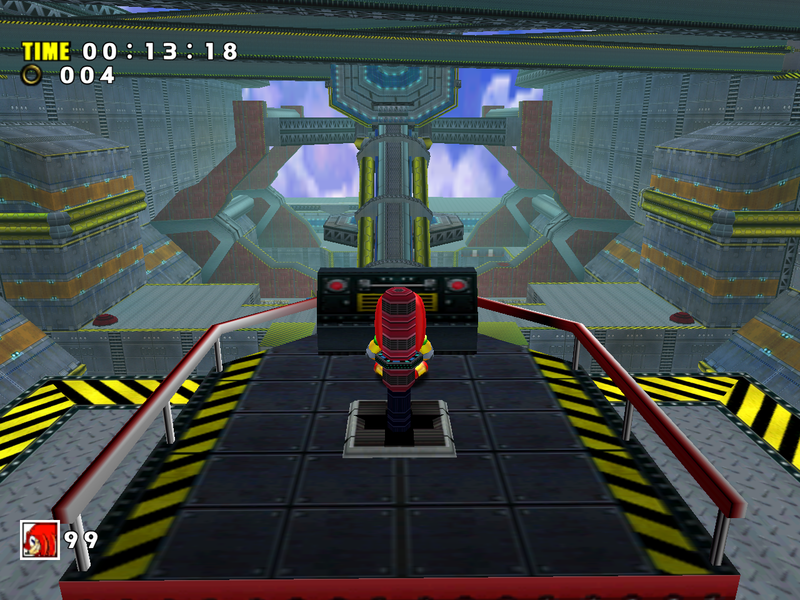 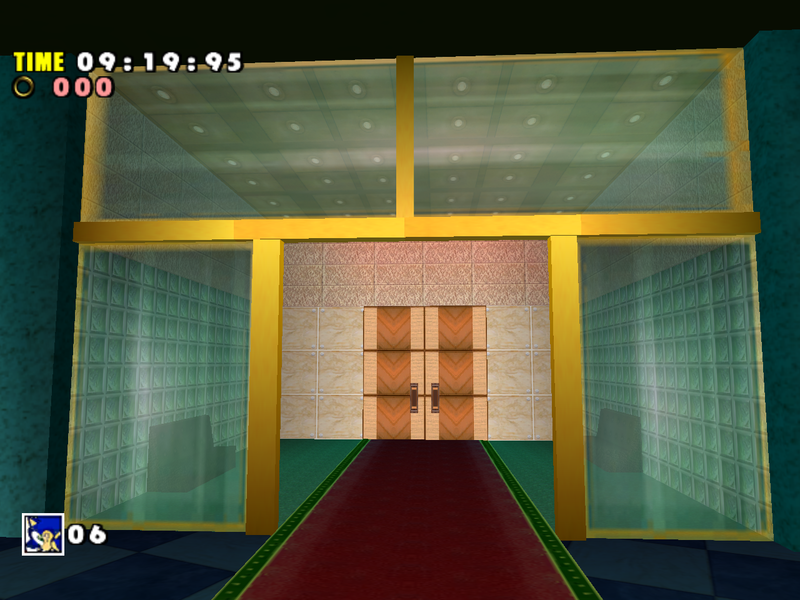 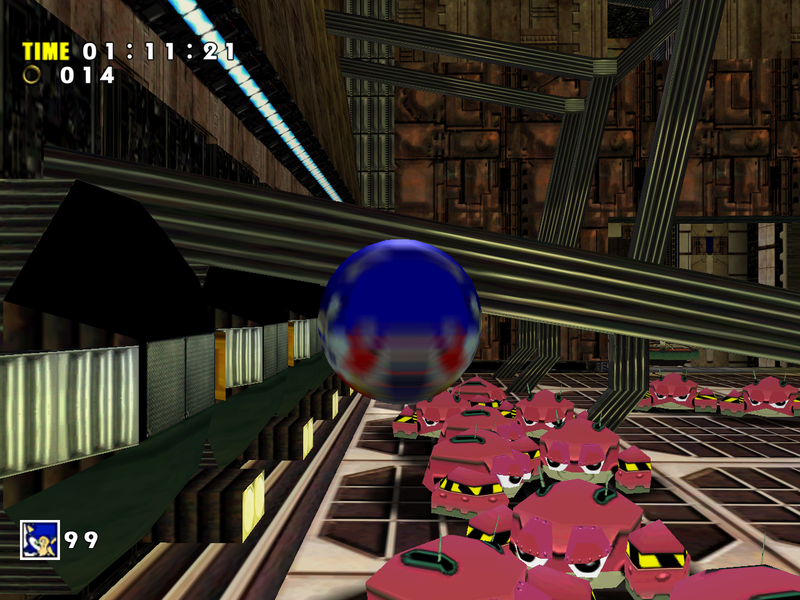 The mirrors in SADX disappear randomly as you progress through the hall, which is noticeable during regular gameplay, but here’s a more clear illustration using first-person camera from the Gamecube version. 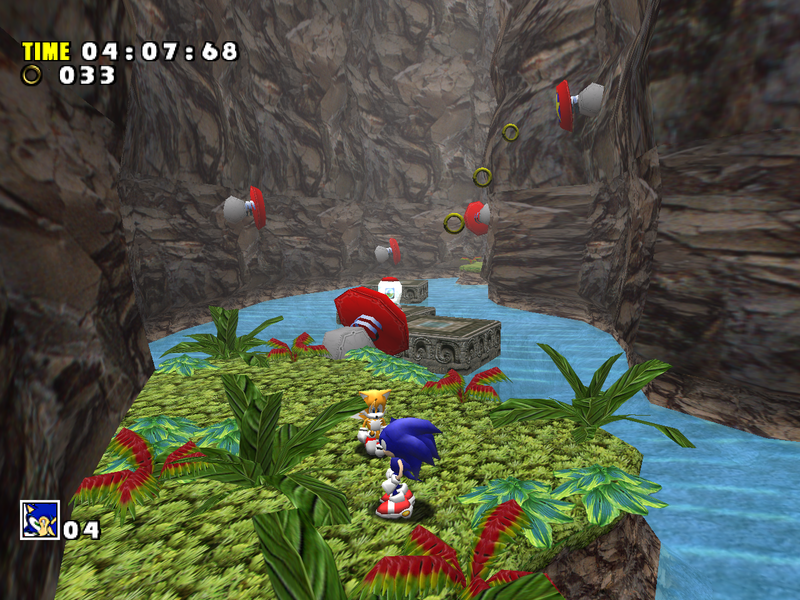 This doesn’t happen in the original game as the Dreamcast doesn’t have to deal with transparency sorting issues. Apart from the above improvements, the SADX version of Twinkle Park suffers from massive downgrades in comparison to the original game. 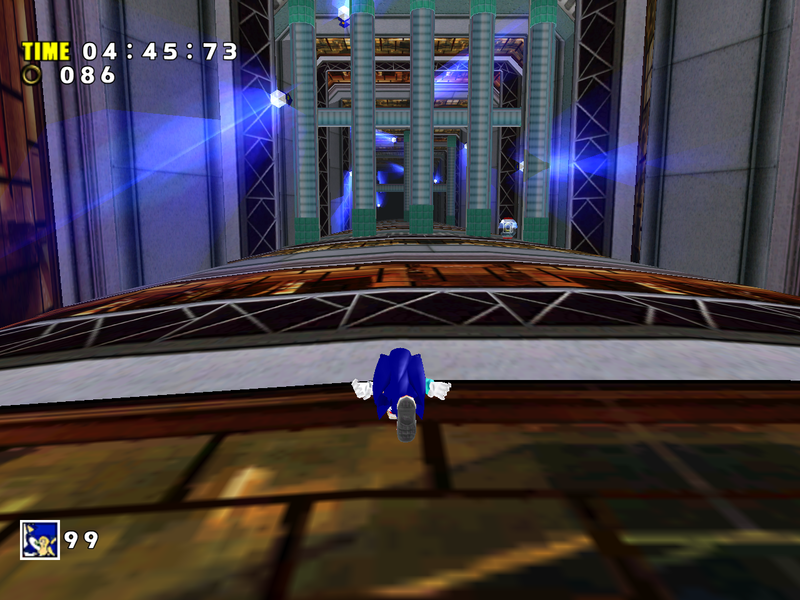 The majority of these downgrades are fixed in the Dreamcast Conversion mod, which reverts the level to its original Dreamcast version while fixing some parts of it to work properly in SADX. 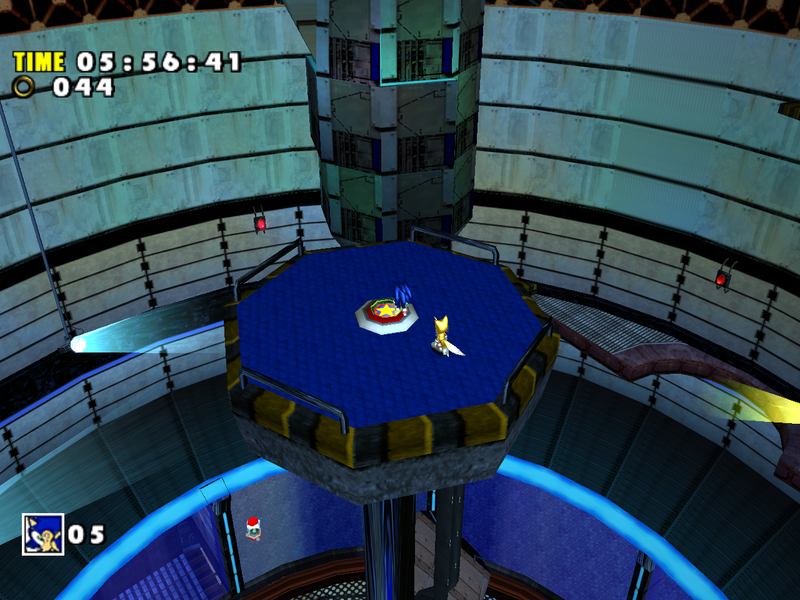 For those who prefer the SADX look of the level, the Lantern Engine mod adds back Dreamcast lighting that blends together with the vertex colors in the SADX level. 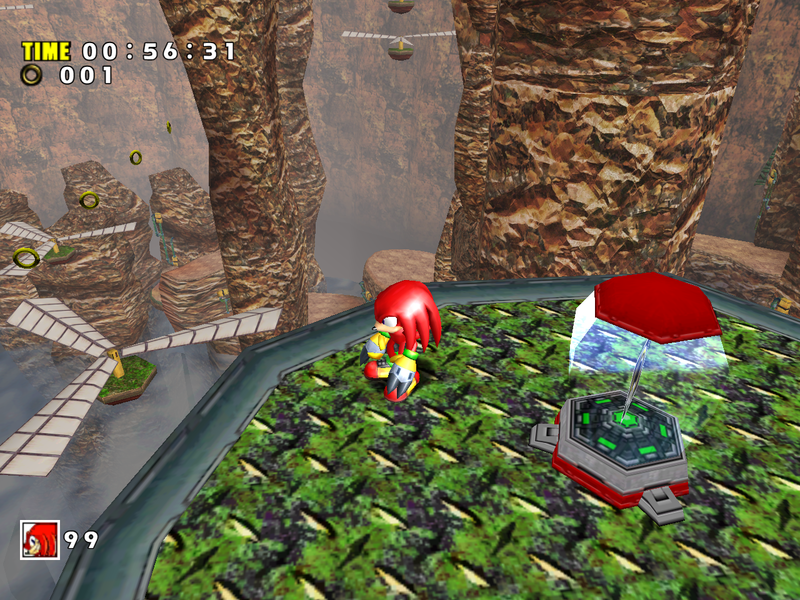 Learn more about the mods in the “Fixing the PC version of SADX” section of this blog.